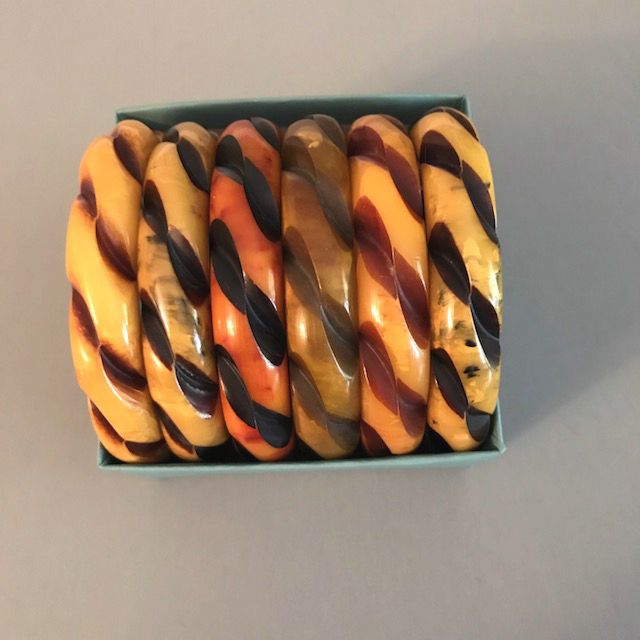 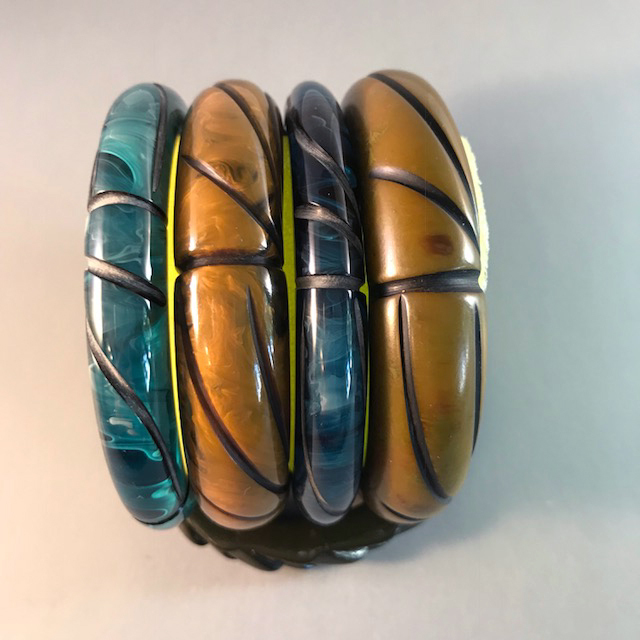 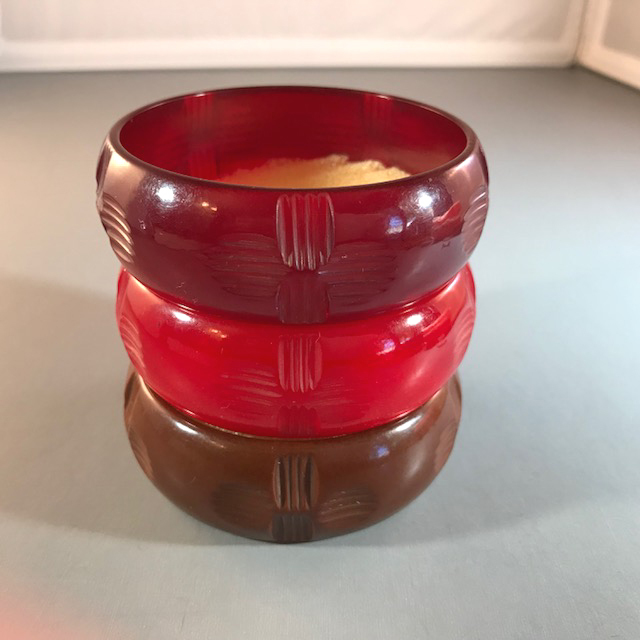 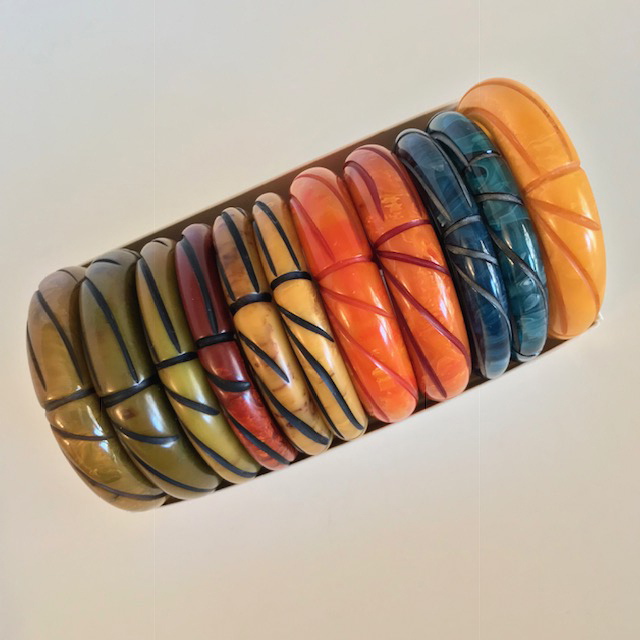 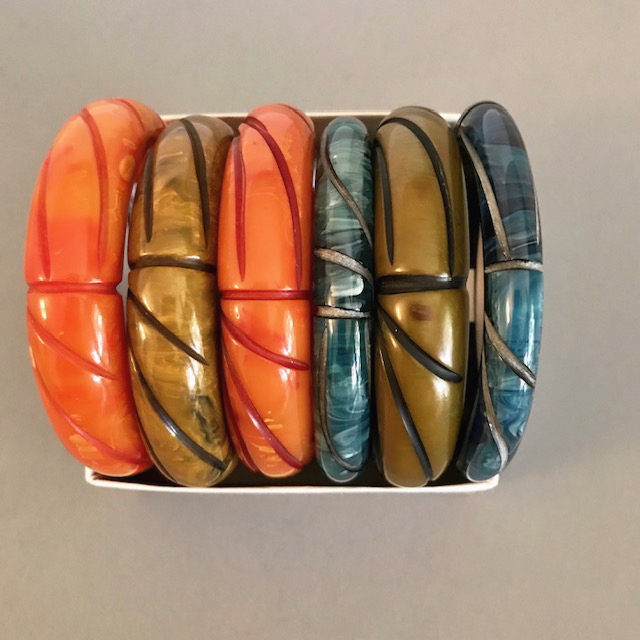 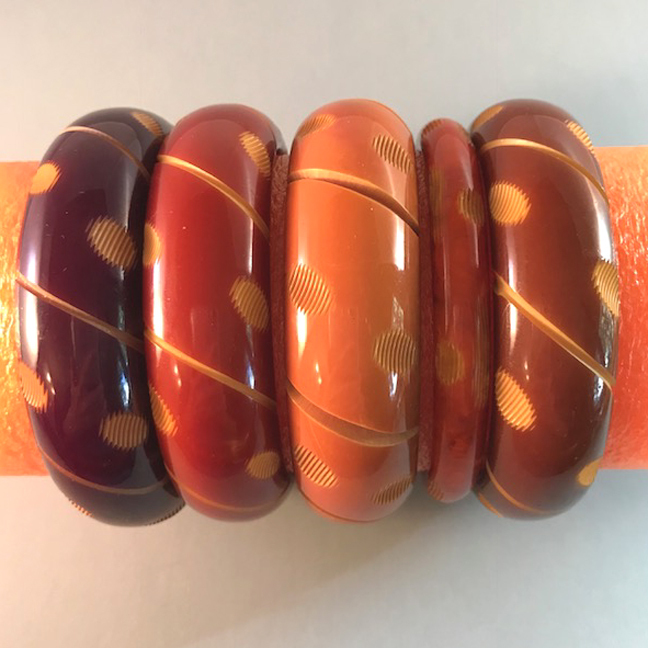 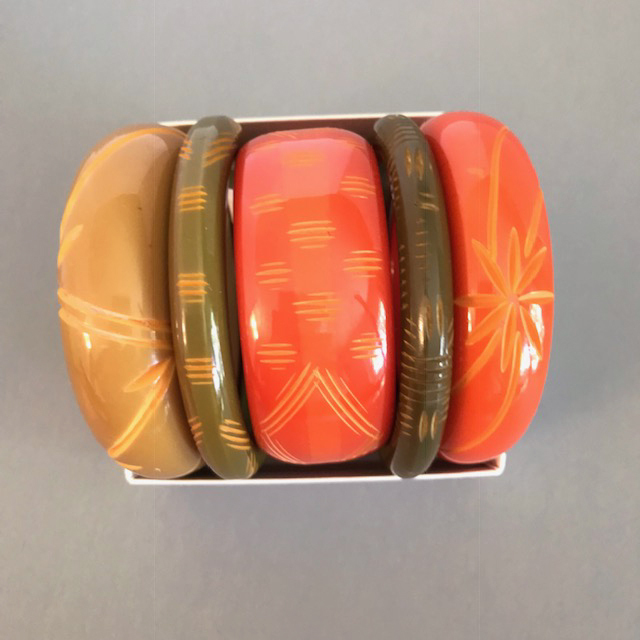 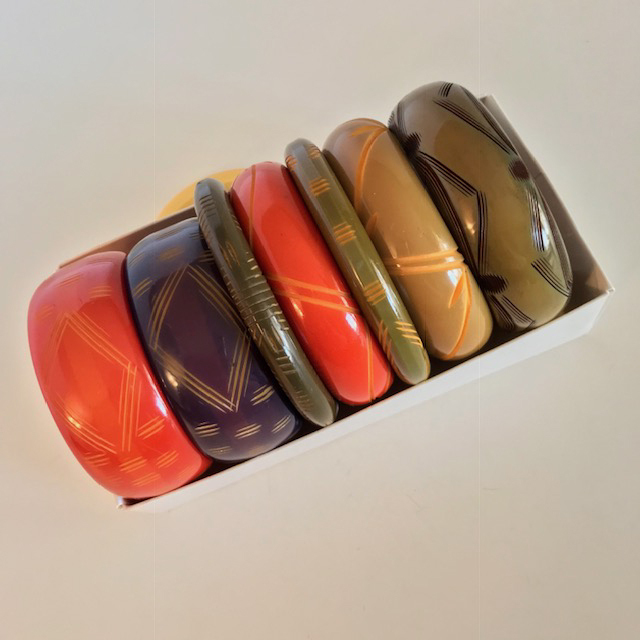 Among the more rare of all the bakelite jewelry, these come in really wonderful colors and a stack of them creates a geometric delight. 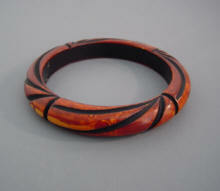 The reverse carving is hard enough, but to then delicately paint designs into the carving is even more difficult. 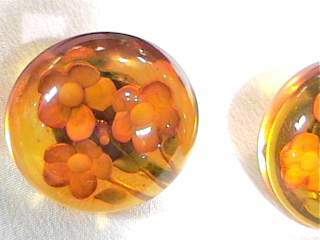 These look a bit like paperweights in person, really fun. 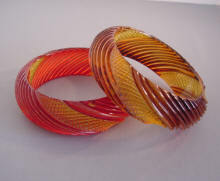 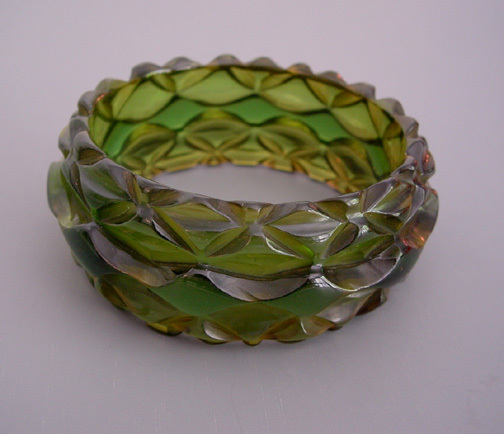 "Stretchy" bracelets are bracelets with segments strung on elastic, and they are often a bit smaller around the wrist than hard bangles are. 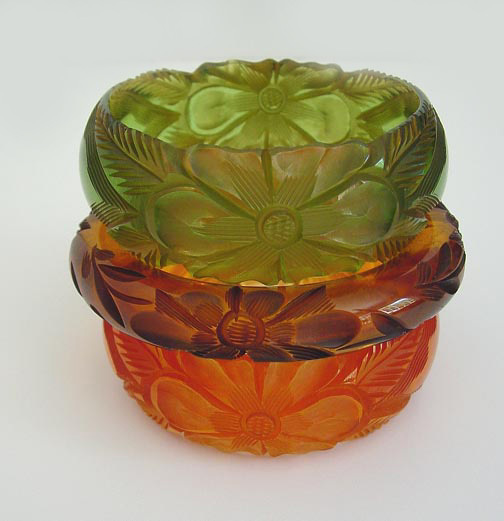 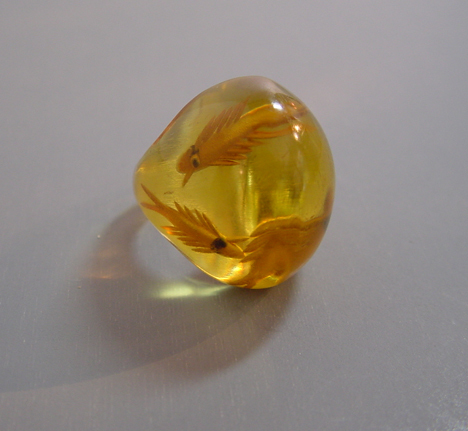 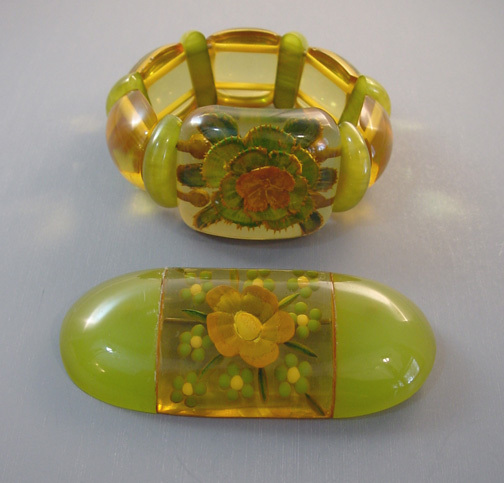 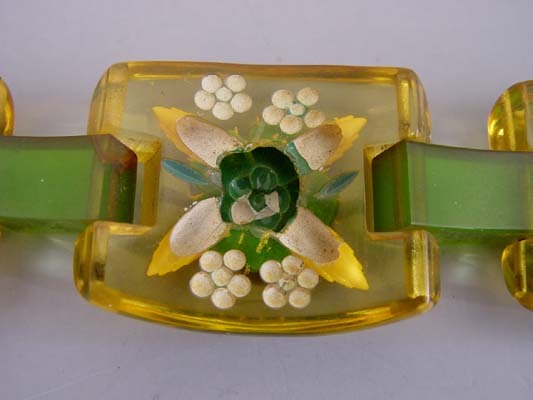 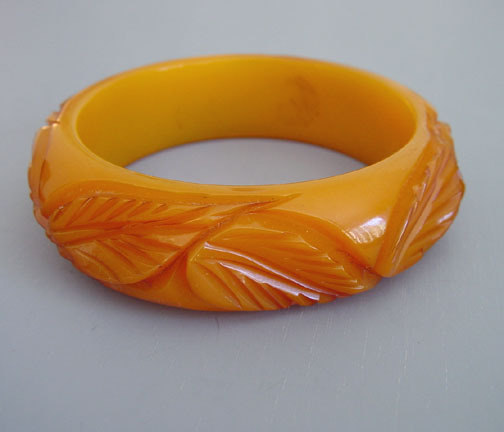 Prystal was specifically not a "Bakelite Corporation" innovation. 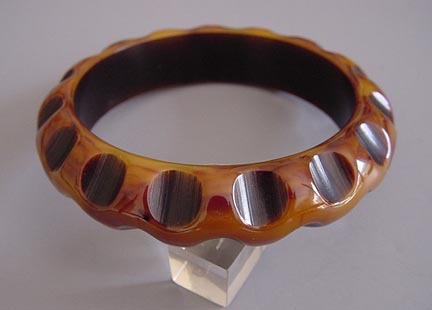 It actually occurred after the patent lapsed in 1914 and was released to compete with the phenolic jewelry market. 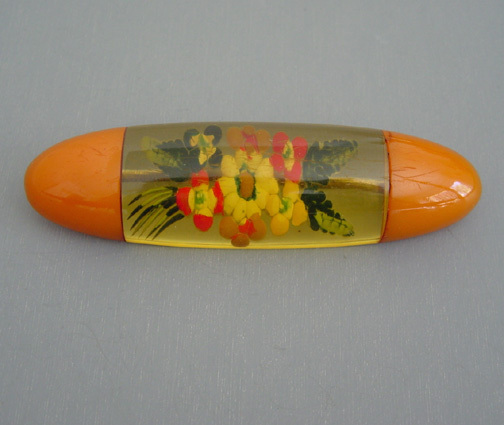 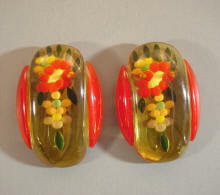 Bakelite Corporation eventually would follow suit and create a formula and release translucent phenolics of their own. 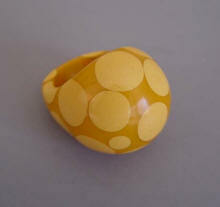 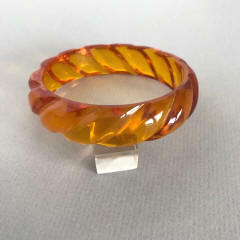 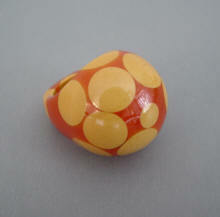 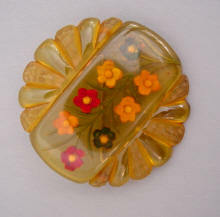 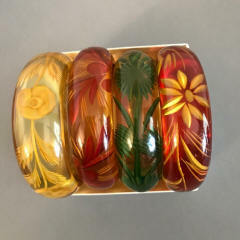 The early Bakelite formula did not have the clarity that the material known as Prystal would come to be associated with. 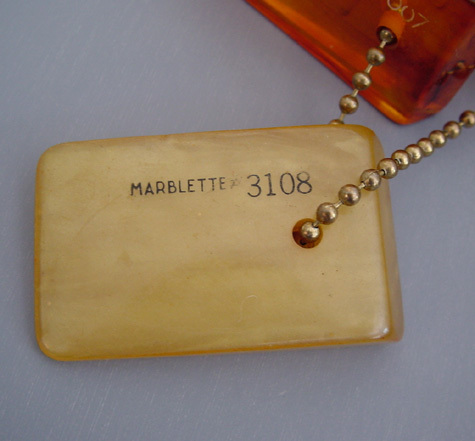 It was either "Marblette" or "Catalin" who created the super pure formula that allowed true translucent to be made. 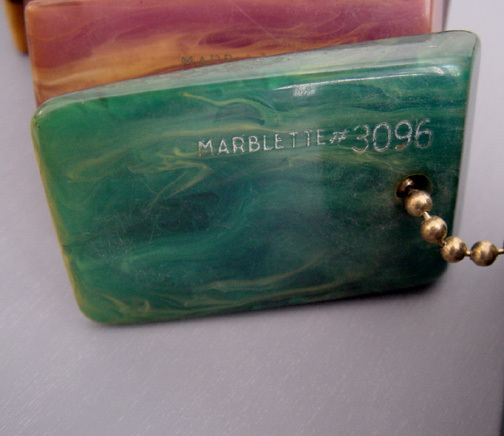 I think it was Marblette who coined the term. 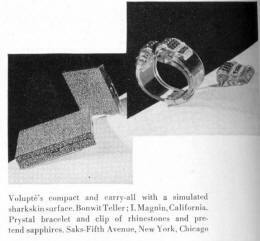 I believe Catalina played into this notion with their new "Gem of Plastics" ad campaign. 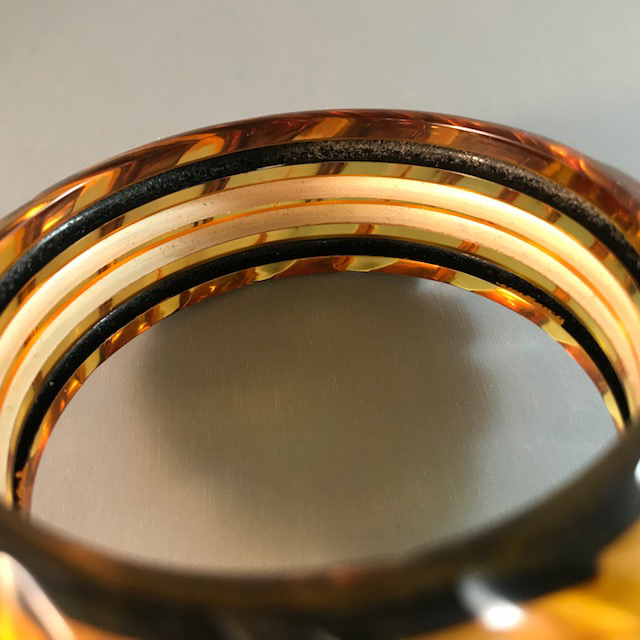 Ranging from water clear to all the colors of the rainbow, Prystals have an almost optical clarity to them, no marbling, no fogginess and especially no inclusions or little bits of dust or debris trapped inside. 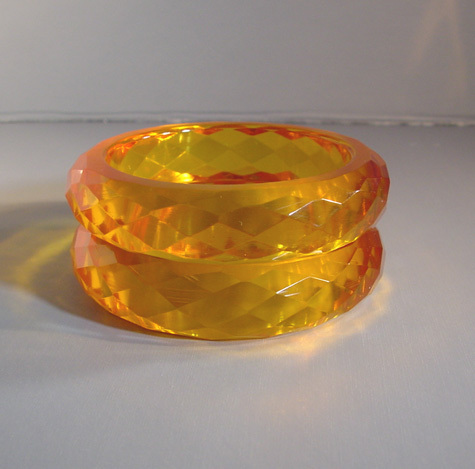 I would say that Prystals are phenolics with the visual quality of colored glass. 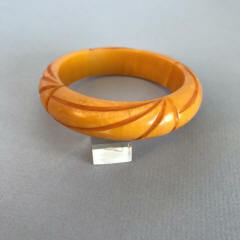 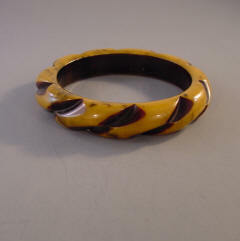 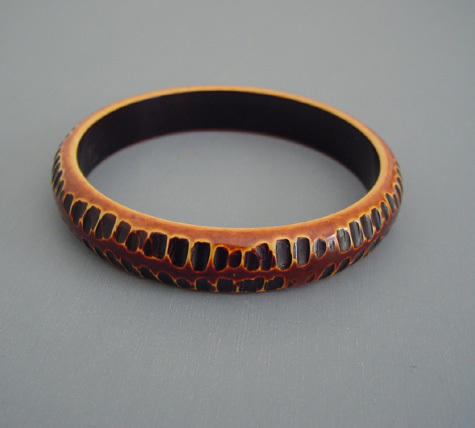 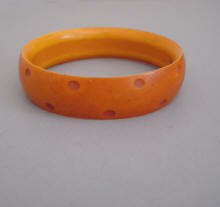 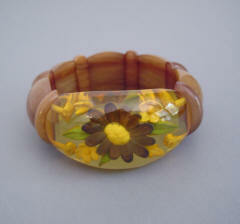 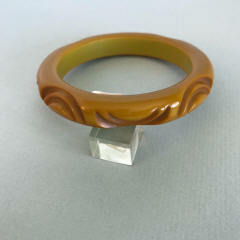 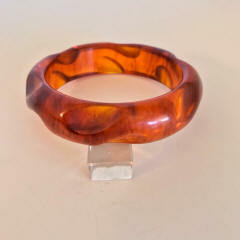 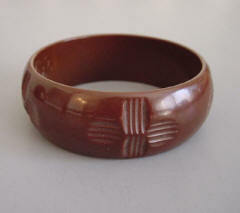 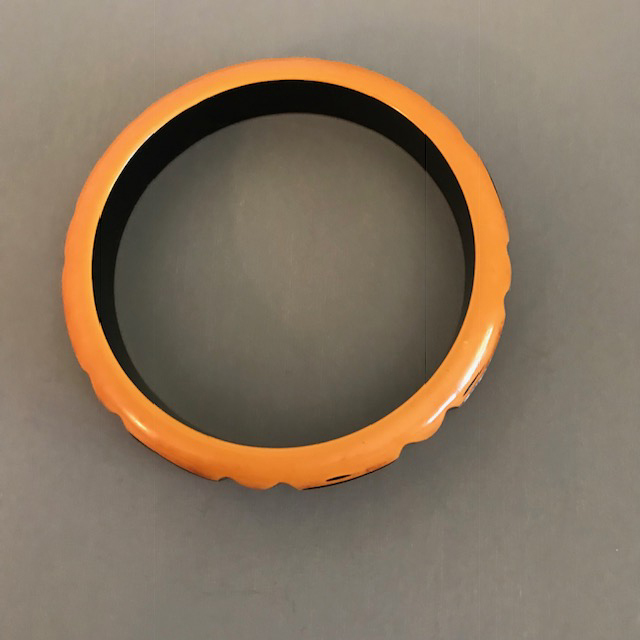 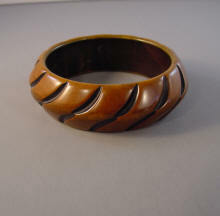 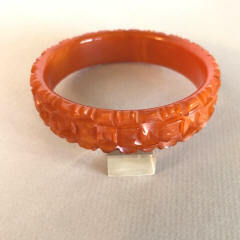 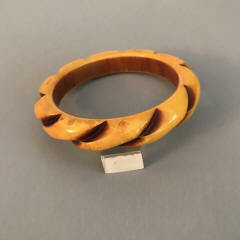 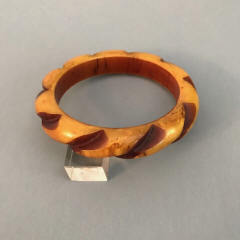 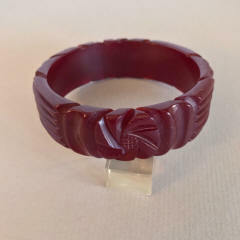 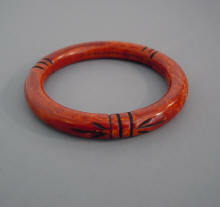 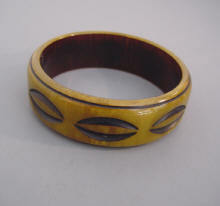 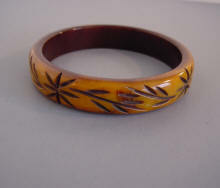 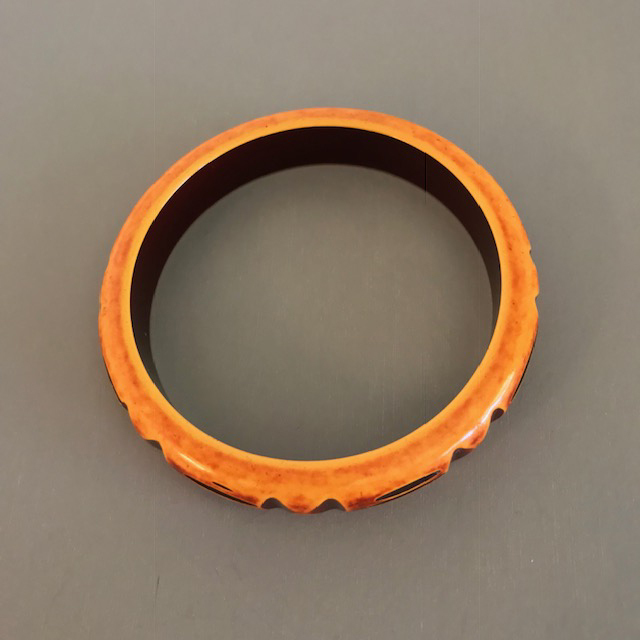 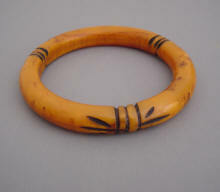 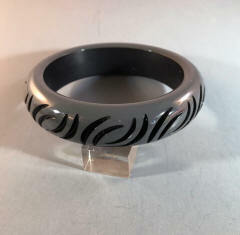 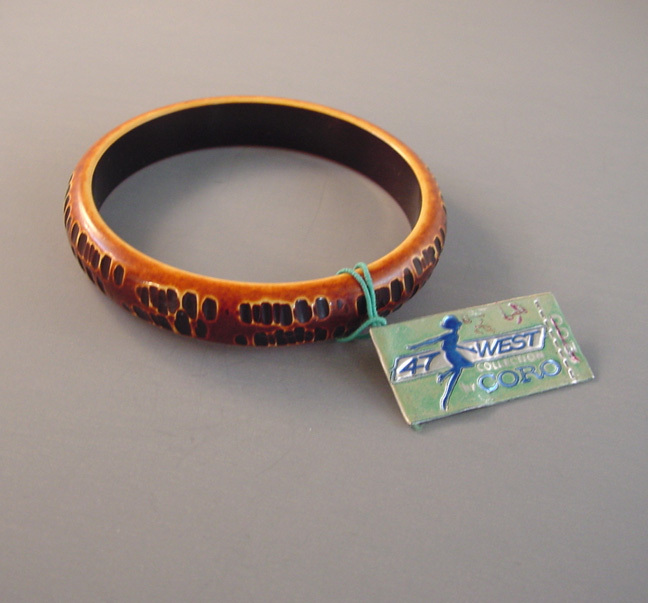 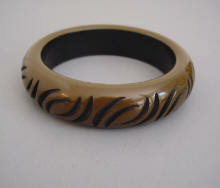 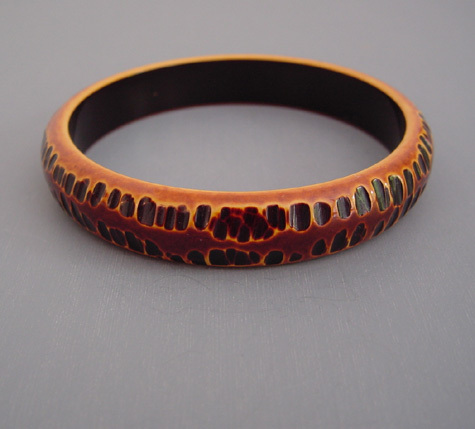 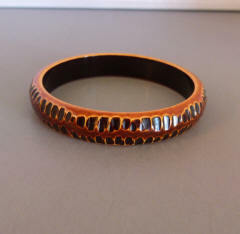 BAKELITE heavily carved root beer bangle, 2-1/4" by 7/8" by 1/3". 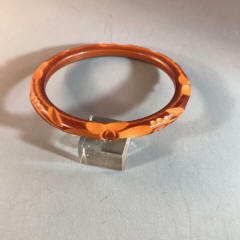 #B16034. 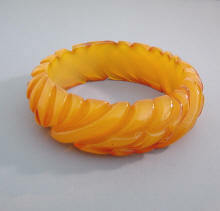 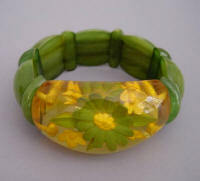 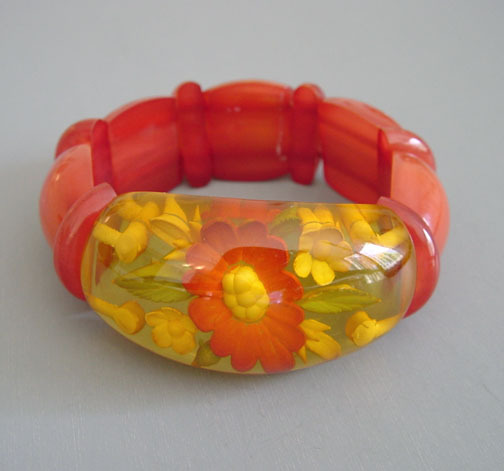 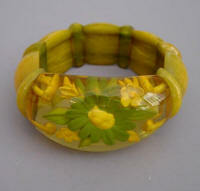 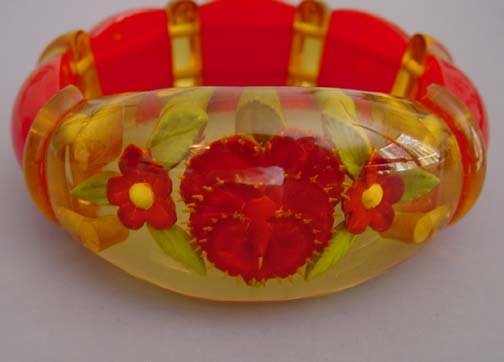 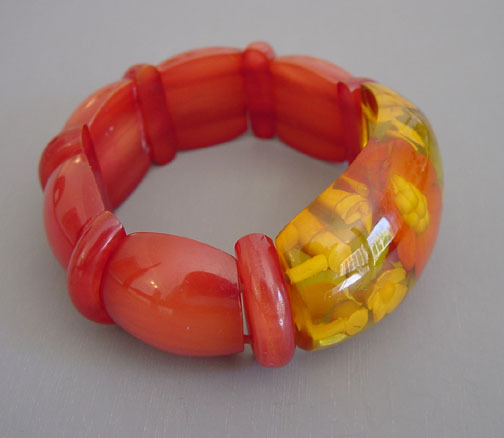 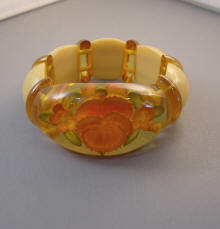 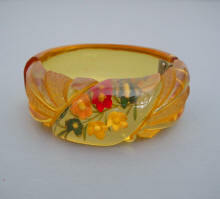 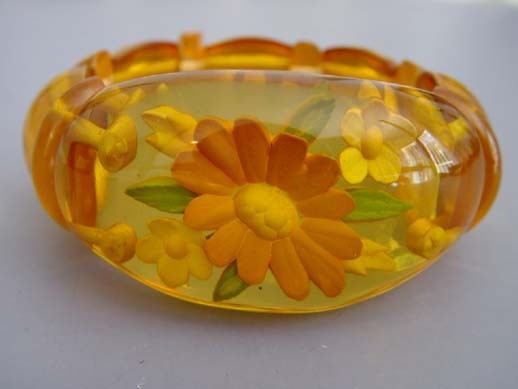 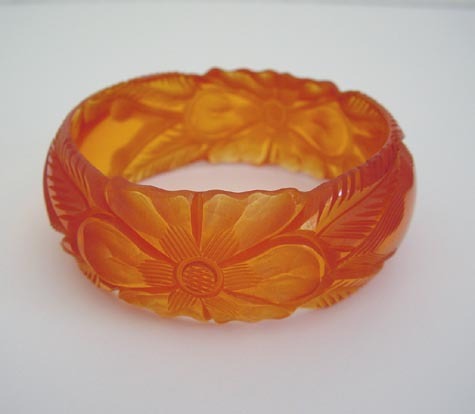 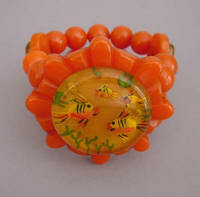 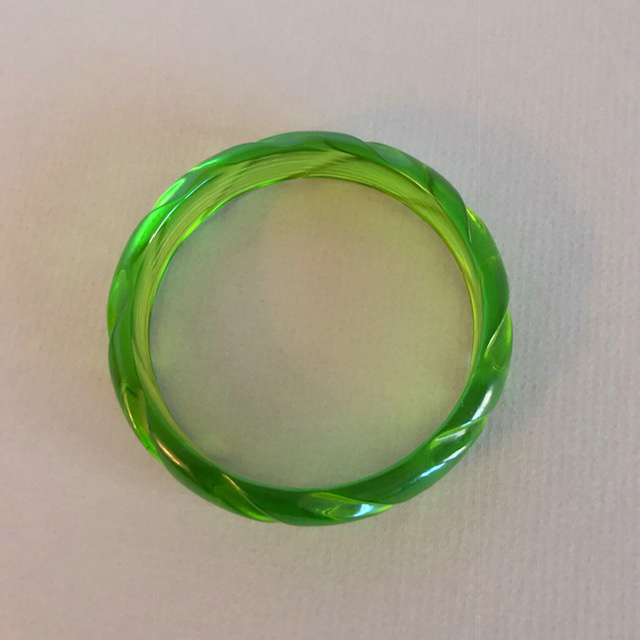 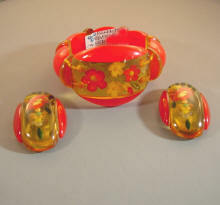 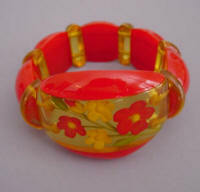 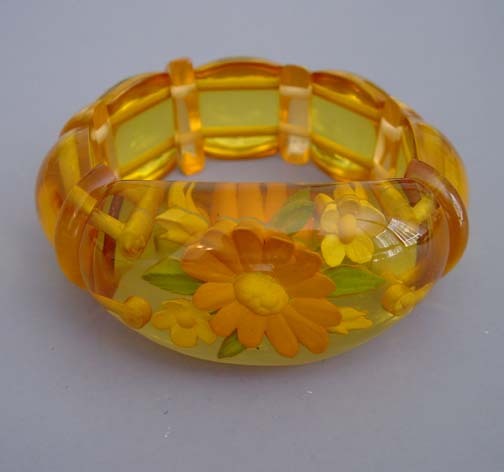 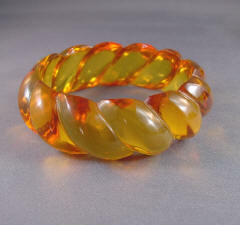 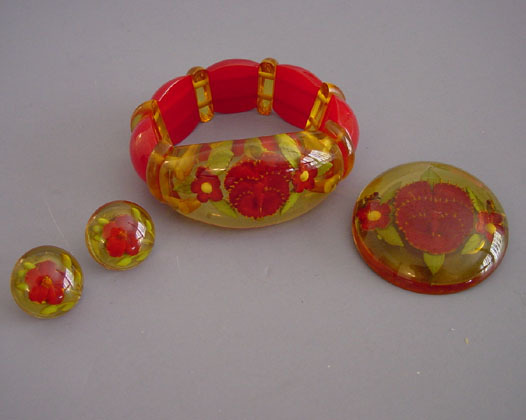 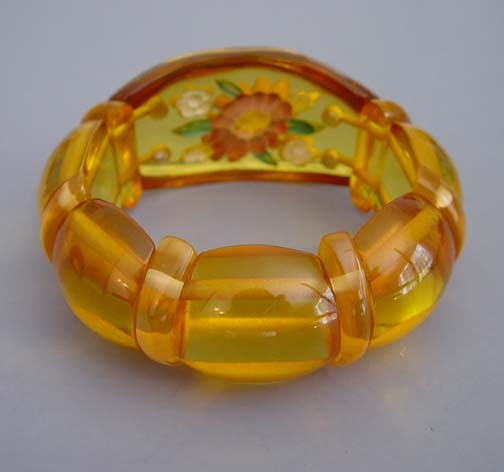 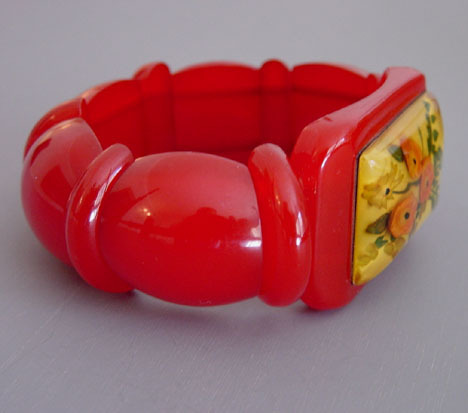 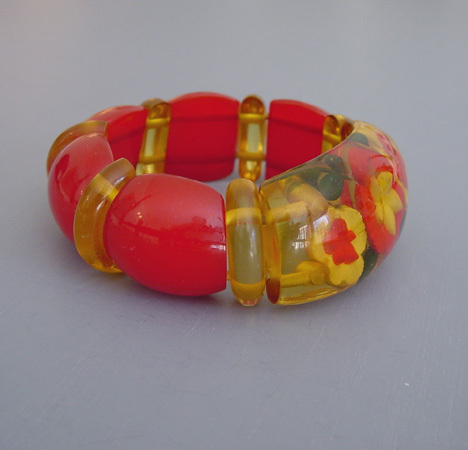 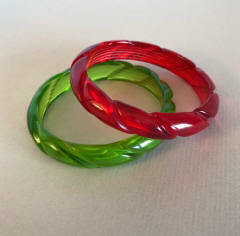 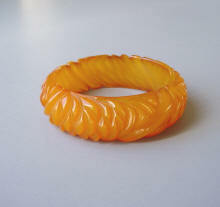 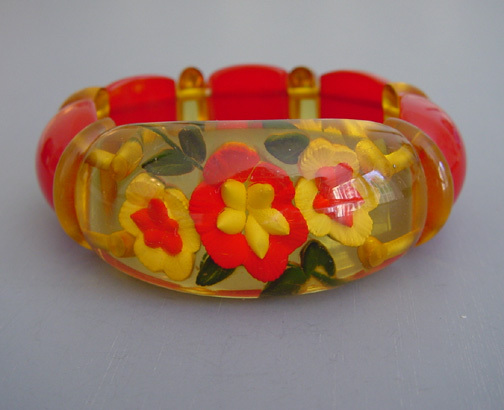 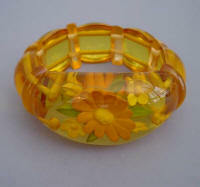 BAKELITE apple juice and red transparent carved bangle, 2-1/2" by 1" by 1/3", one small nick at an edge. 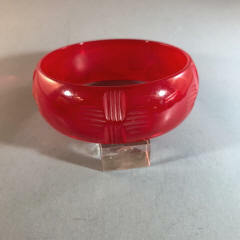 View View View #B35438 BAKELITE apple juice and red transparent carved bangle, 2-1/2" by 1" by 1/3", one small nick at an edge. View View View #B35438. 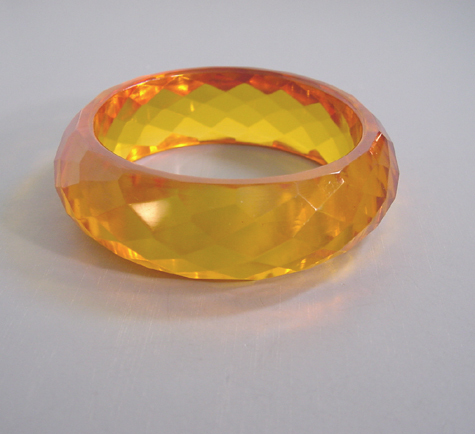 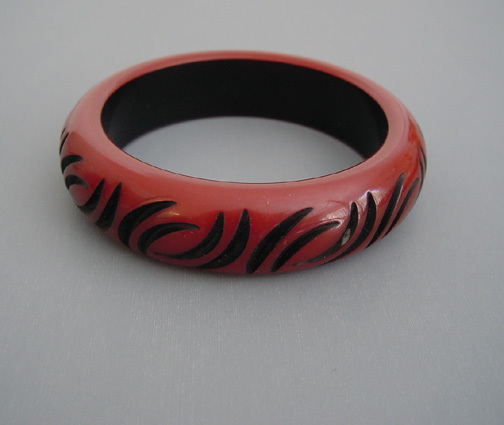 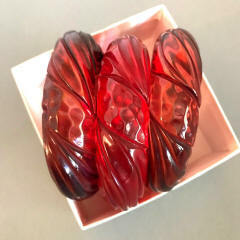 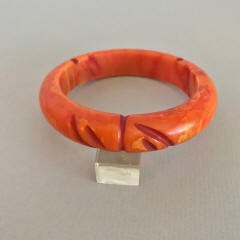 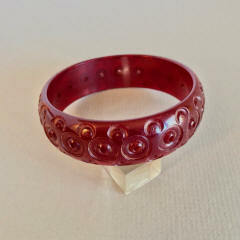 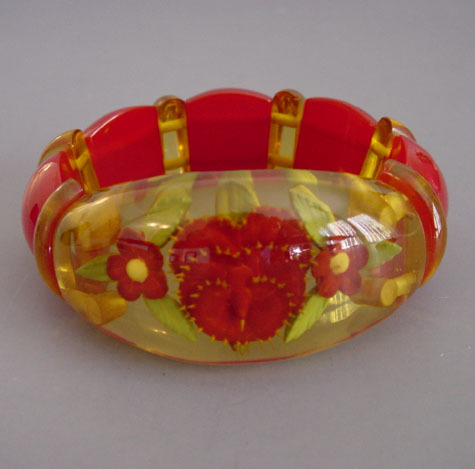 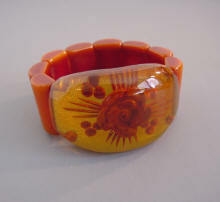 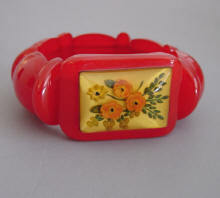 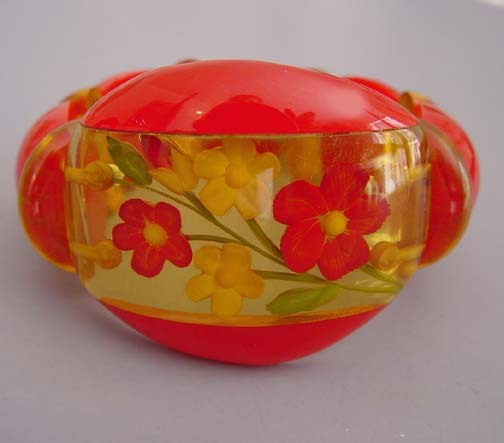 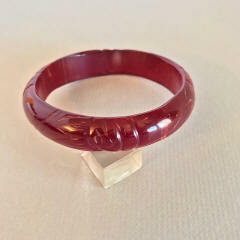 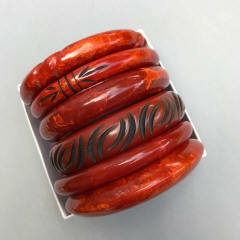 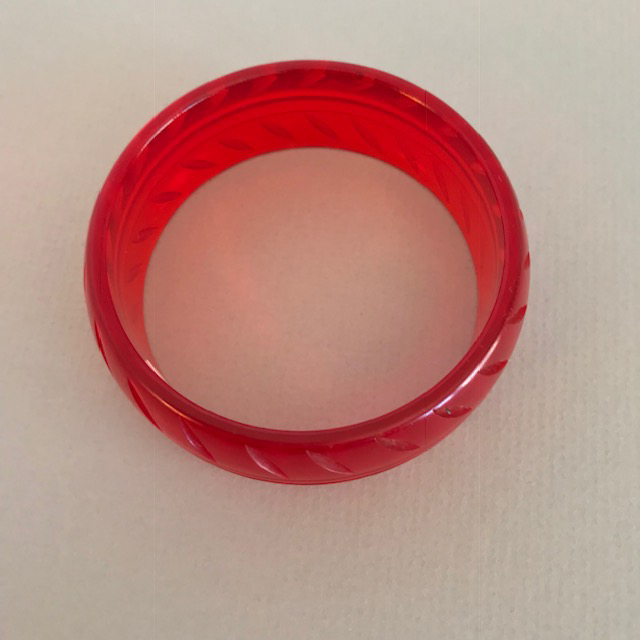 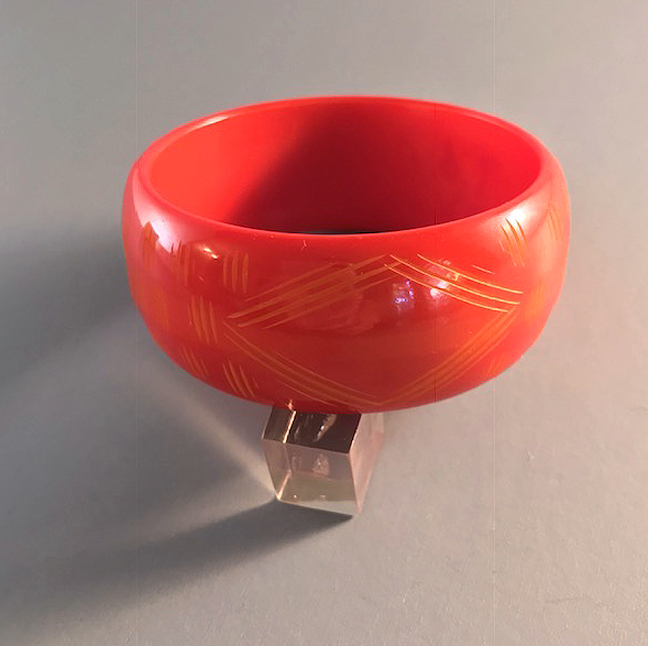 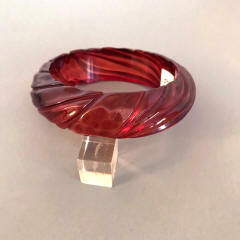 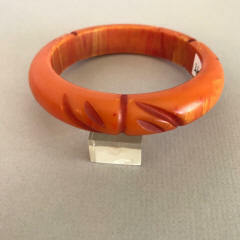 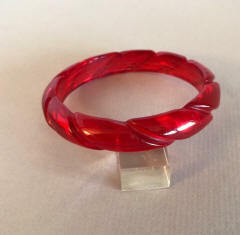 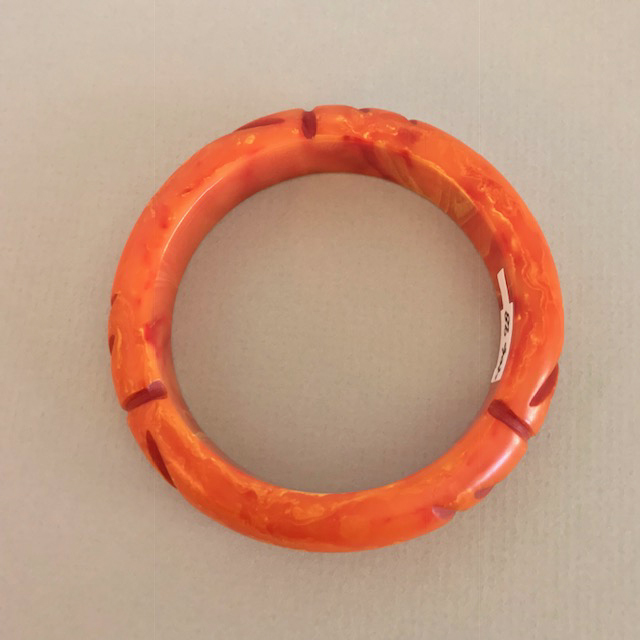 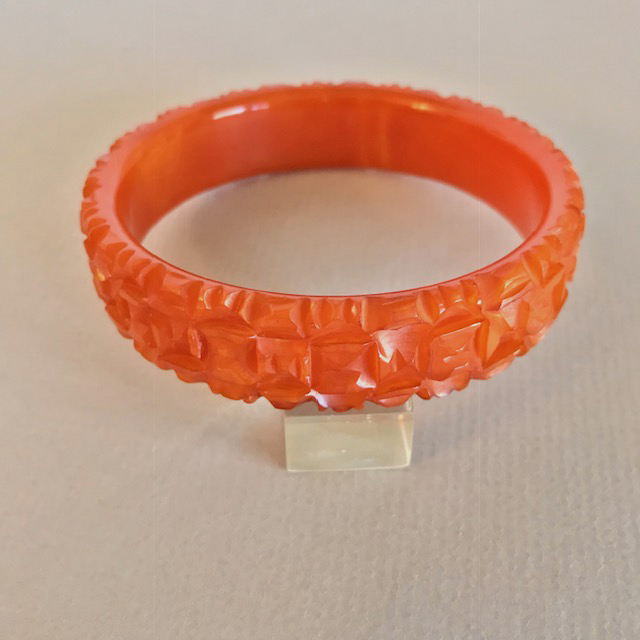 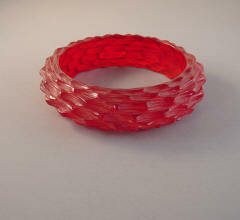 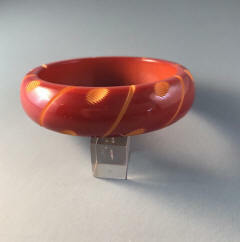 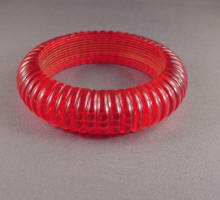 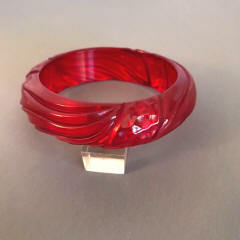 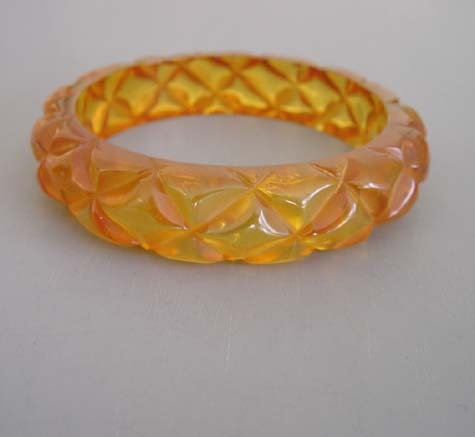 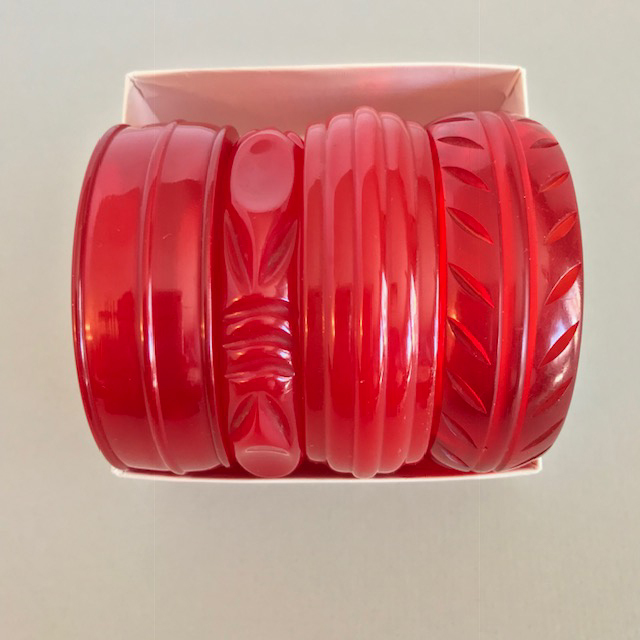 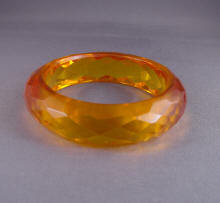 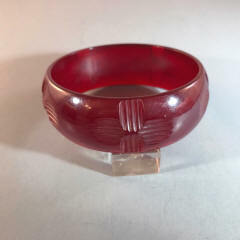 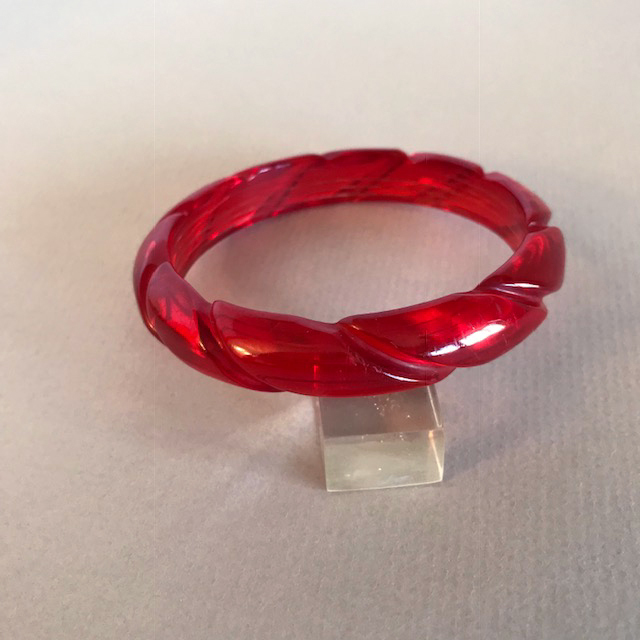 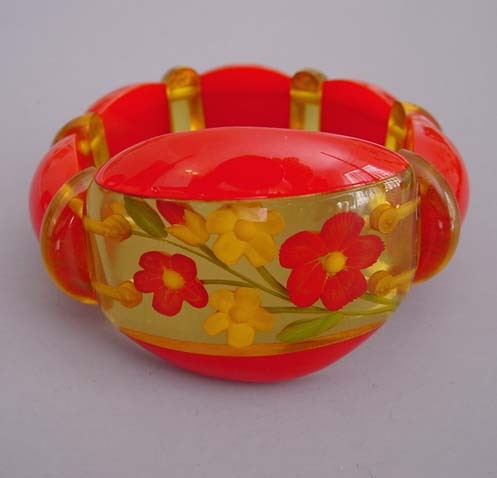 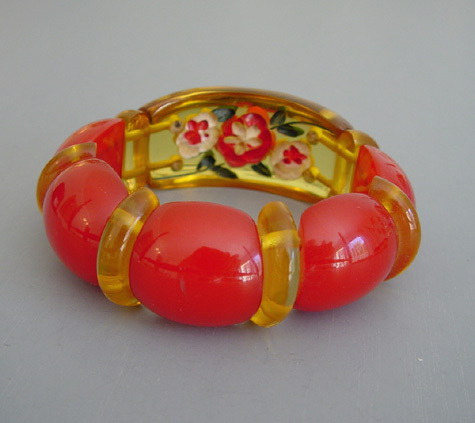 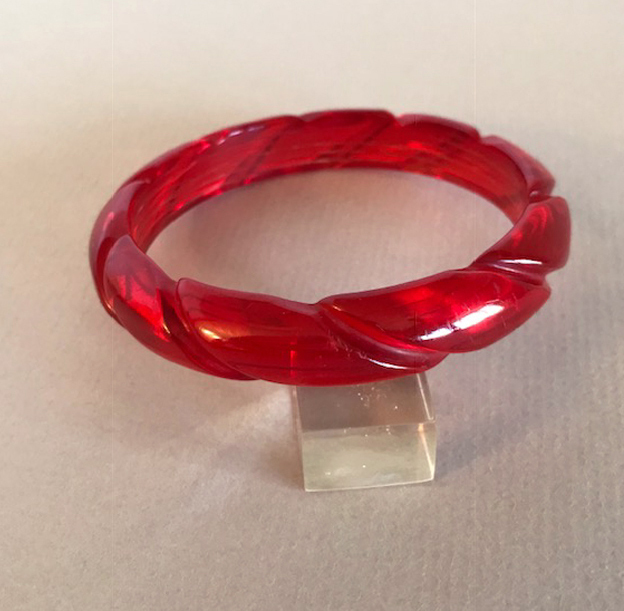 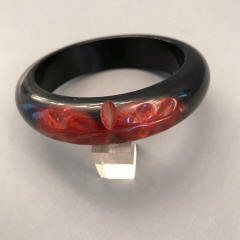 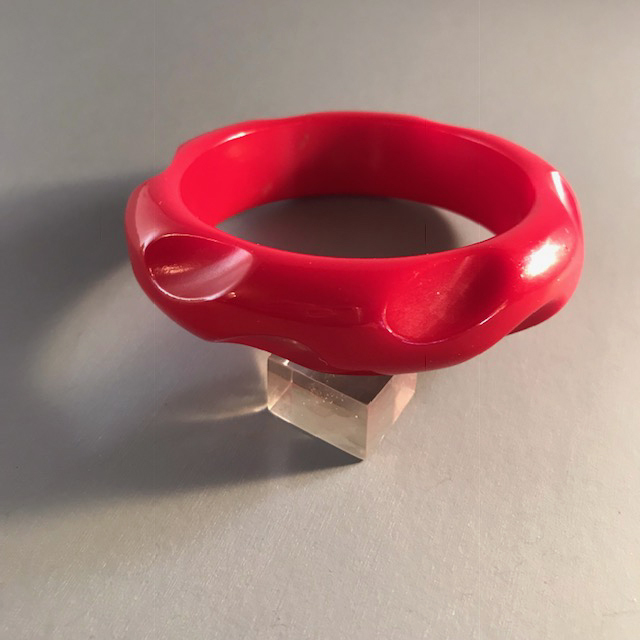 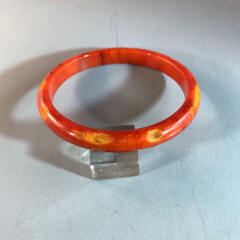 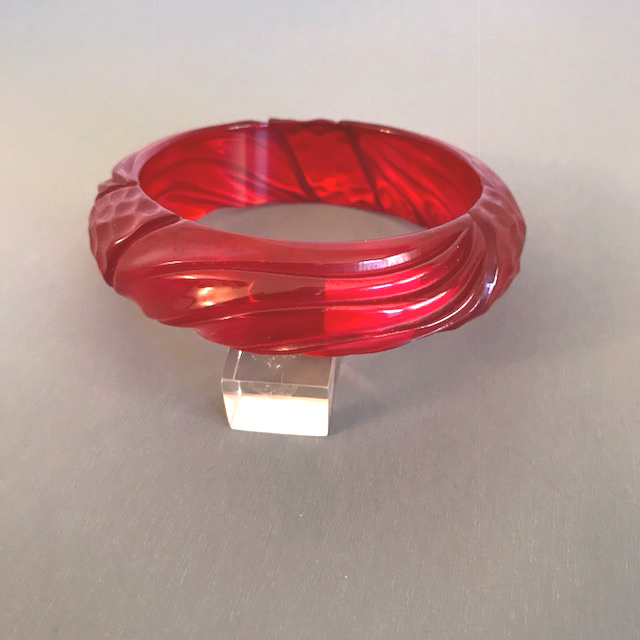 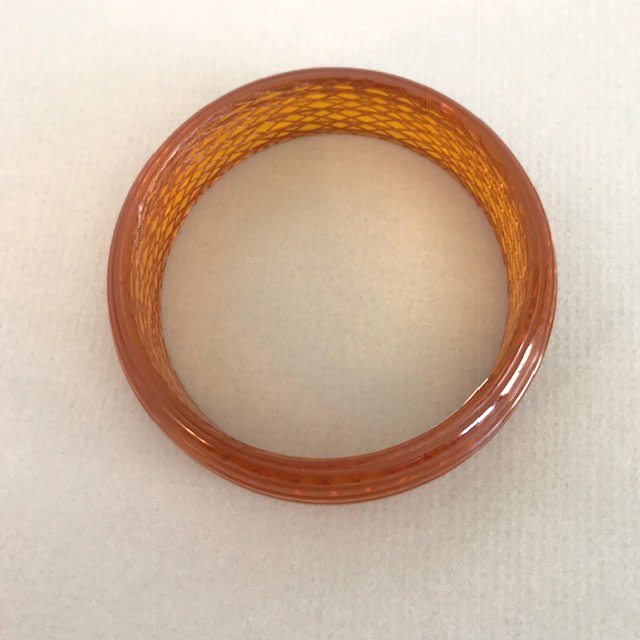 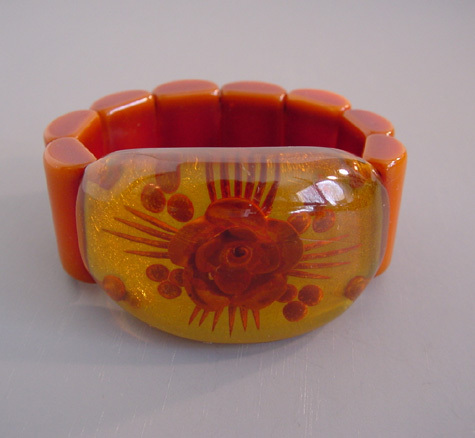 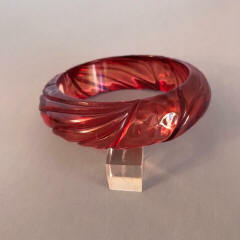 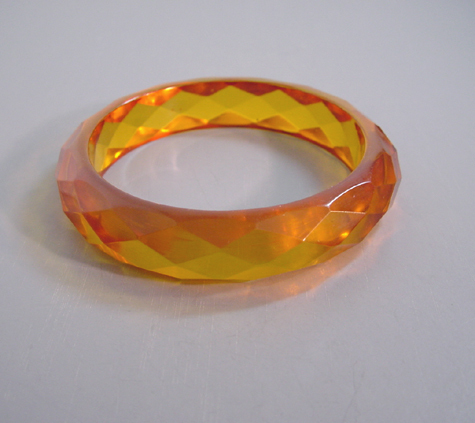 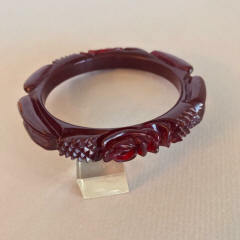 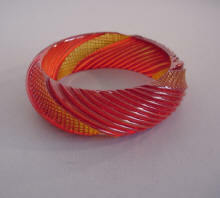 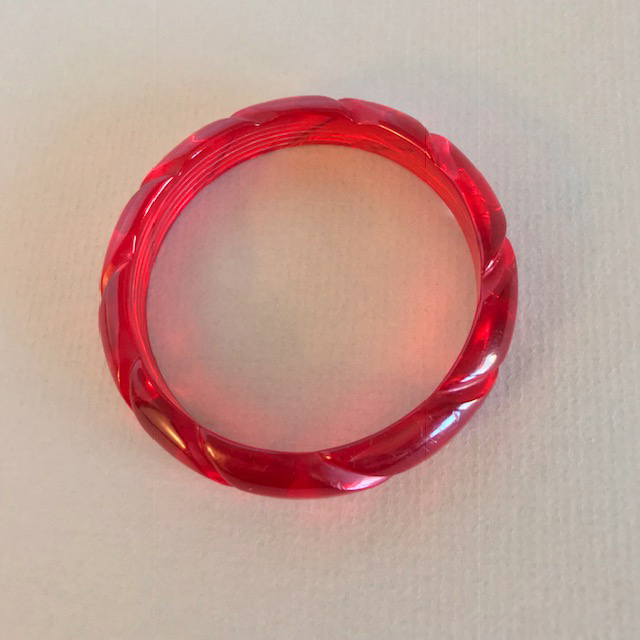 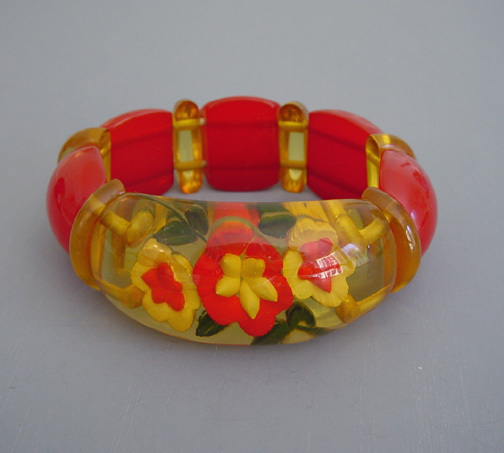 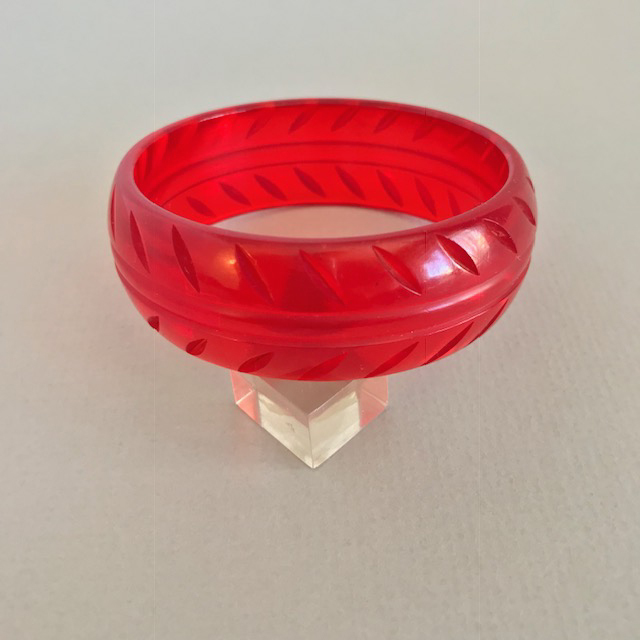 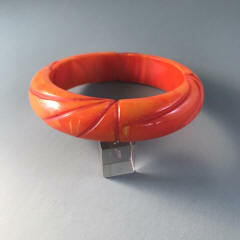 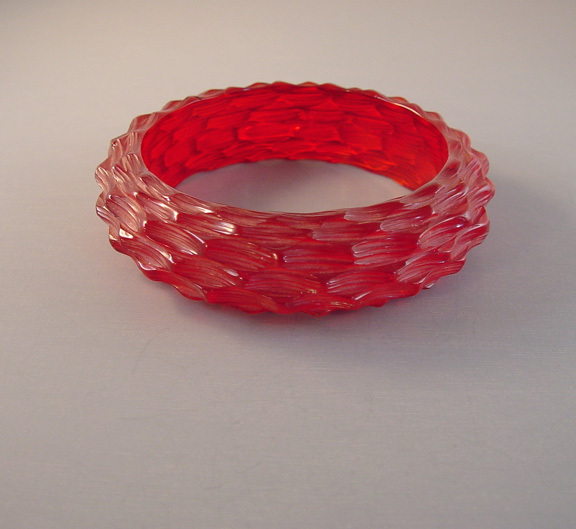 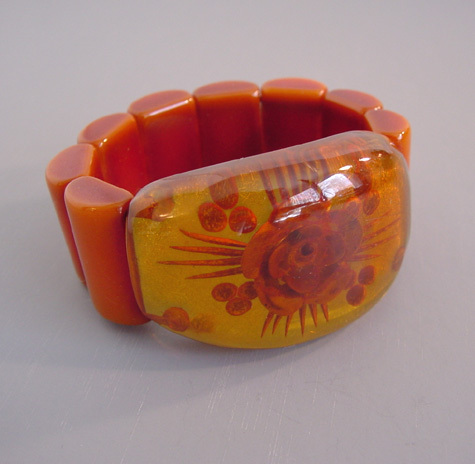 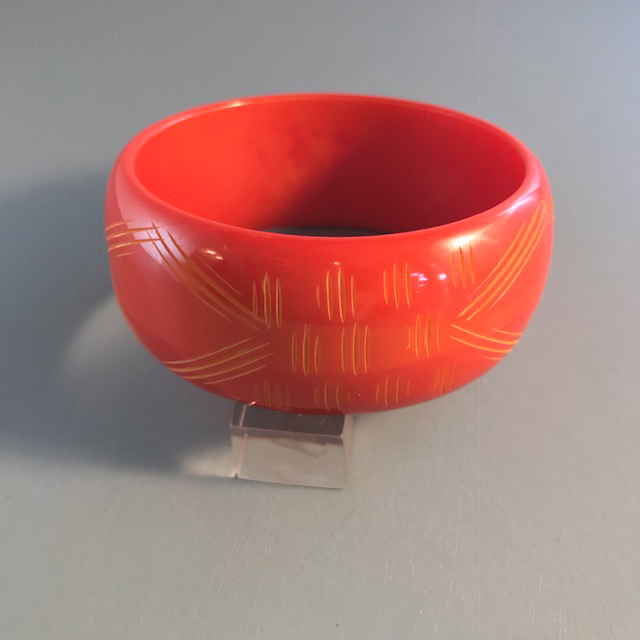 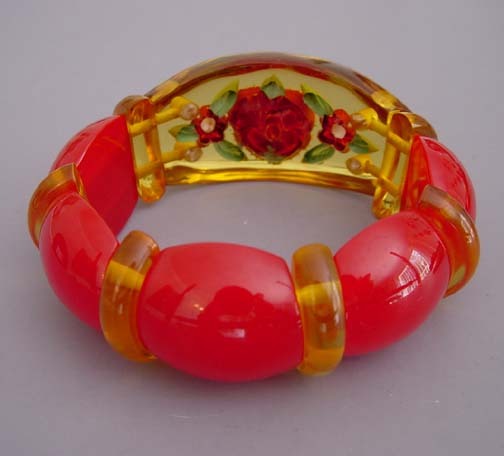 BAKELITE Prystal transparent red carved and tumbled bangle, 2-1/2" by 3/4" by 1/3". 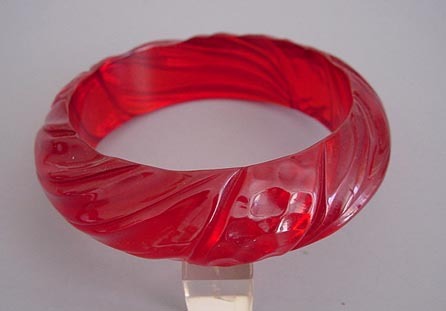 This one always reminds me of cherry Jello! 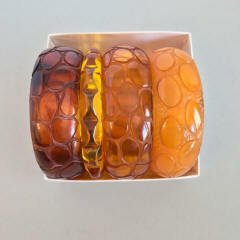 View #B16033. 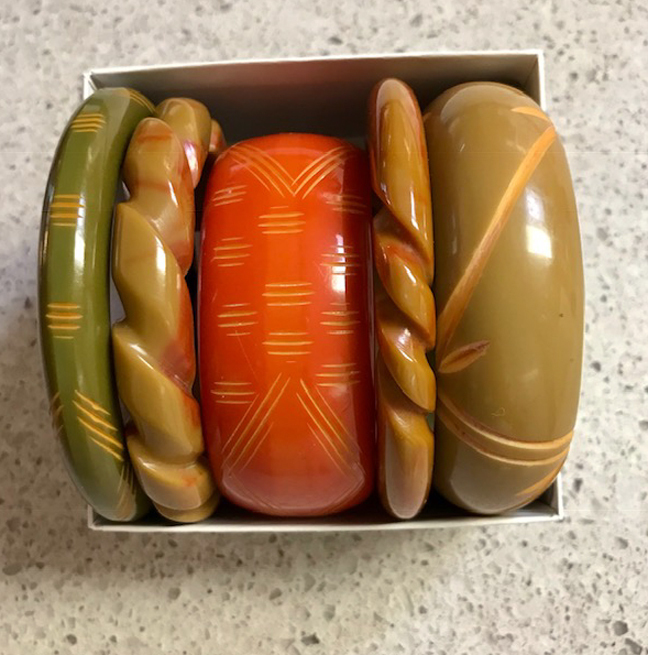 One type of bakelite is called "Prystal", and people seem to have differing ideas of what the definition of "Prystal" really is. 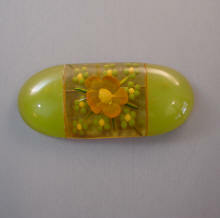 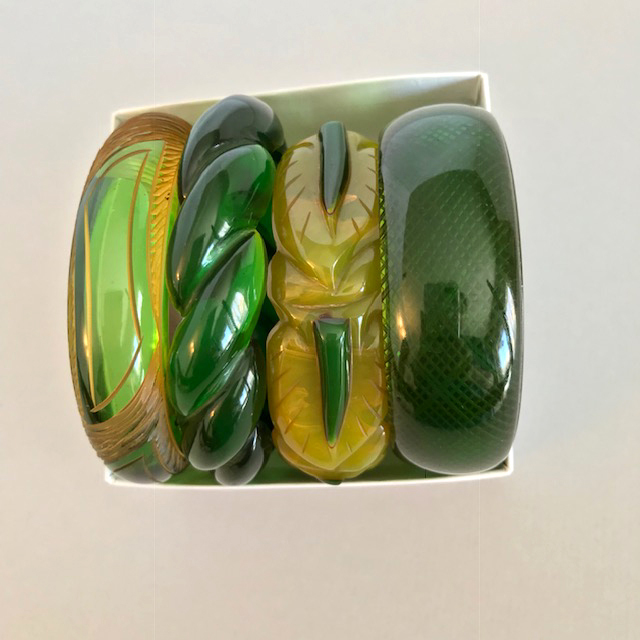 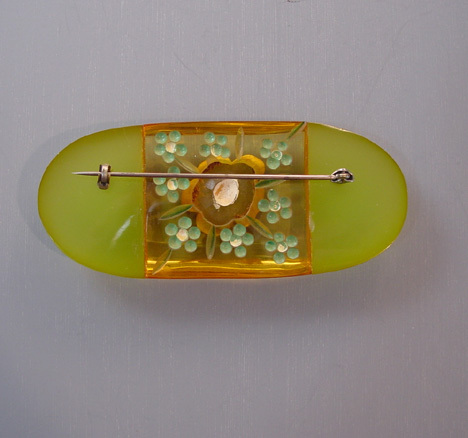 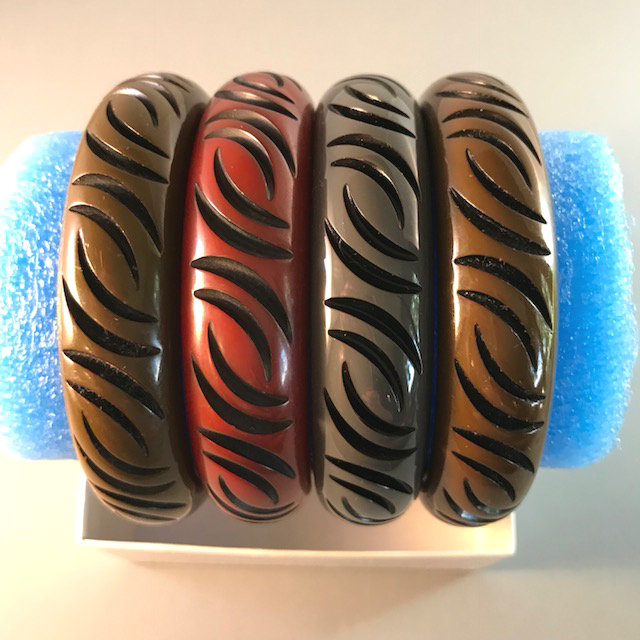 Wonderful contemporary bakelite jewelry artisan Kent Mundy of Butterfly Workshop shares his definition here. 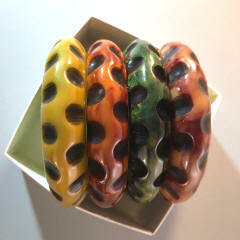 We thank him for his information, as well as for the wonderful bakelite treasures he makes! ~~~~~1. 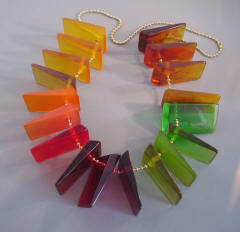 Colors you can see through unaided, or without backlighting. Over 50 distinct color variants are known in US production, with many more possible. 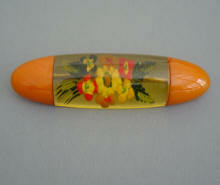 Also, many dozens more from the very sophisticated French production. 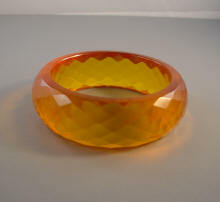 ~~~~~2. Colors that are very deep, saturated colors. 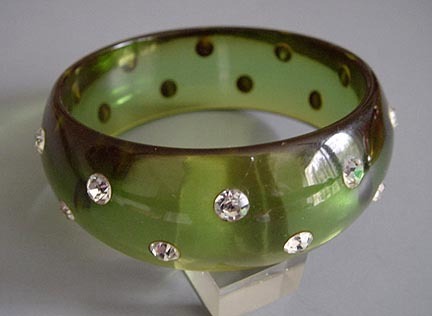 These were early US production, 1930s, and meant to mimic the finest saturated / deep color gemstones. These are found in ruby, sapphire blue, cobalt blue, emerald, amethyst and others. 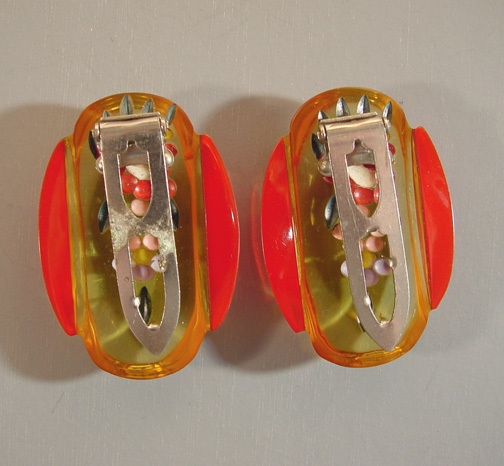 These have been mistakenly misattributed and incorrectly described as "CHANGERS" but THEY ARE NOT. 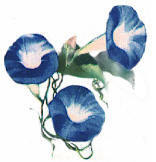 These are simply the sumptuous family of dark prystals, which had only a few years production, as the oxidation proved to turn them into a disappointment in a few short years. ~~~~~3. 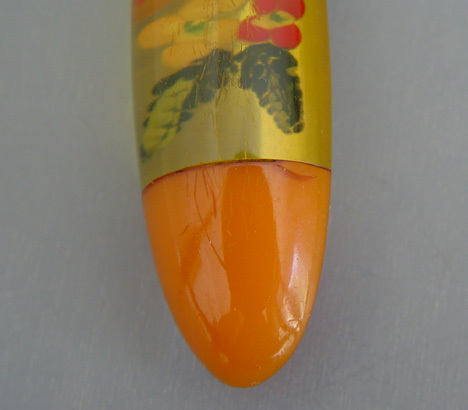 Colors with foil inclusions, the "Stardust / Confetti" prystals. 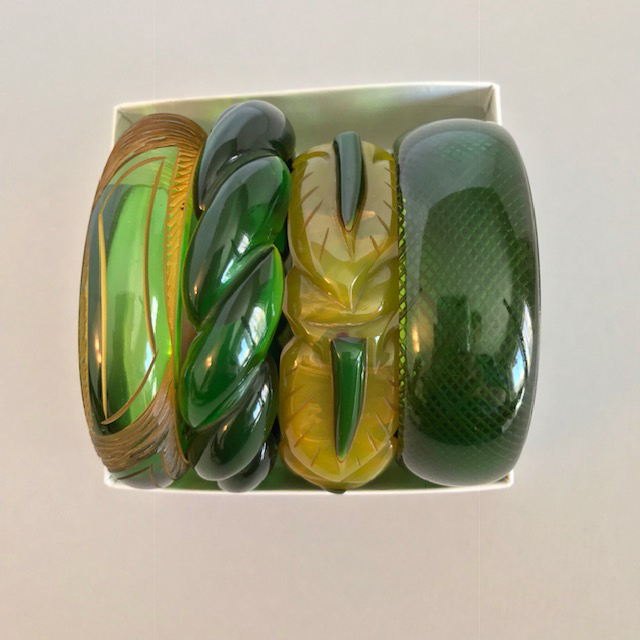 By definition, also purely transparent, but with addition of a variety of types and sizes saturation of metallic foils and pastilles. 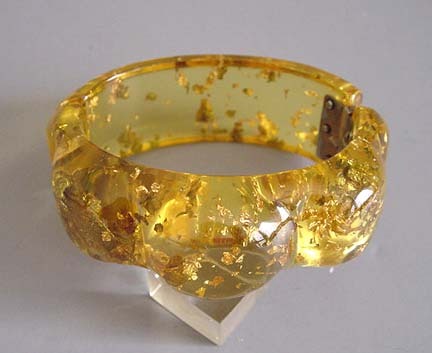 No, real gold was never used. 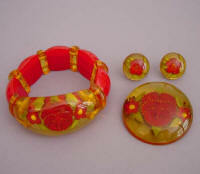 It is myth these pieces can be dated to a of couple short years. 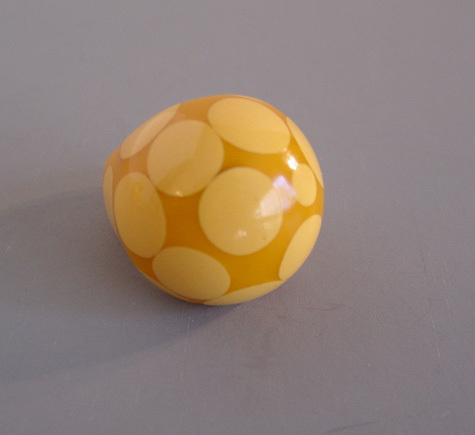 We venture next into the inks spots and remaining "transparent marbles". 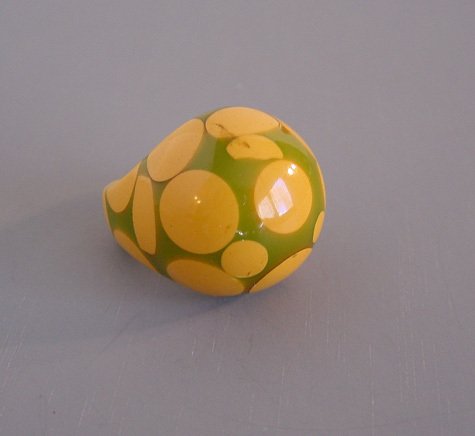 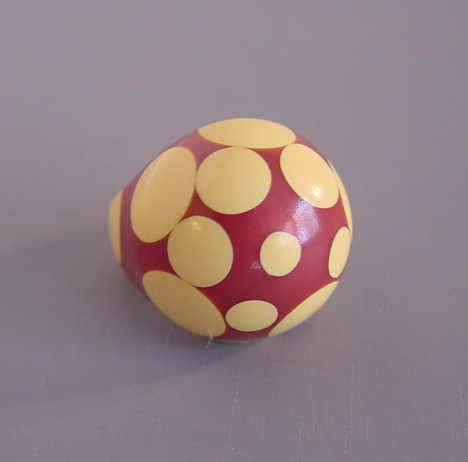 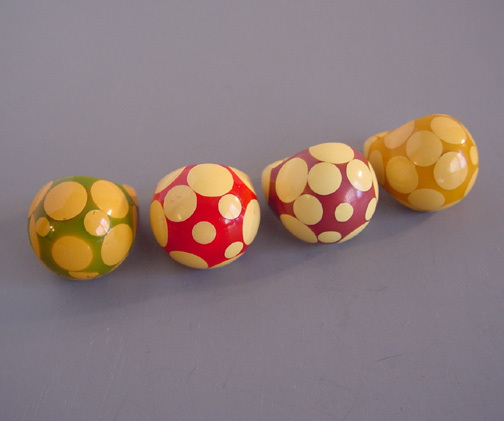 Then "translucent marbles" and "opaque marbles and "solid color translucents". Then "true, solid color opaques". Both tone and hue are also relevant to any scrutiny of color. 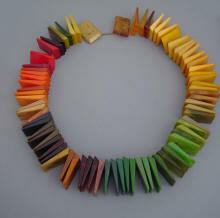 Most people avoid this depth of technical analysis of color. 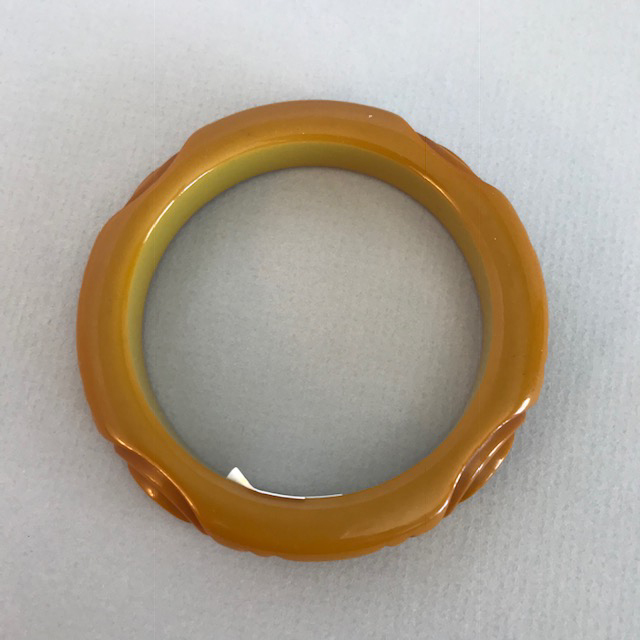 All these factors are complicated by "original color" (that color as originally cast, or restored to via abrasion and polish) versus "mature state" colors. 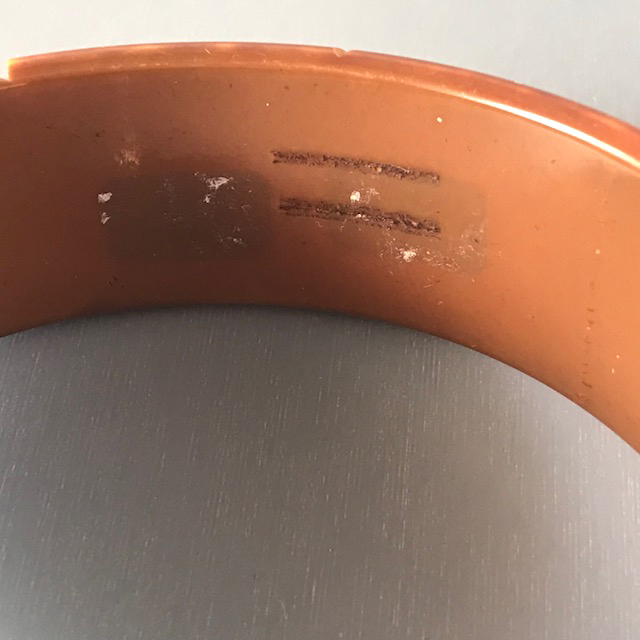 Only original color can be accurately quantified as the many factors affecting surface oxidation color alteration are incalculable. 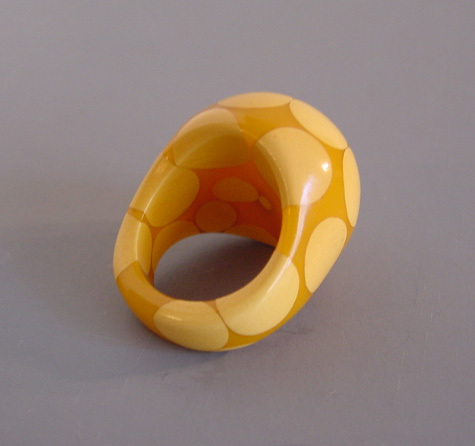 One single formula of white, for example, can result in dozens of variant depth tones from the various oxidation factors. 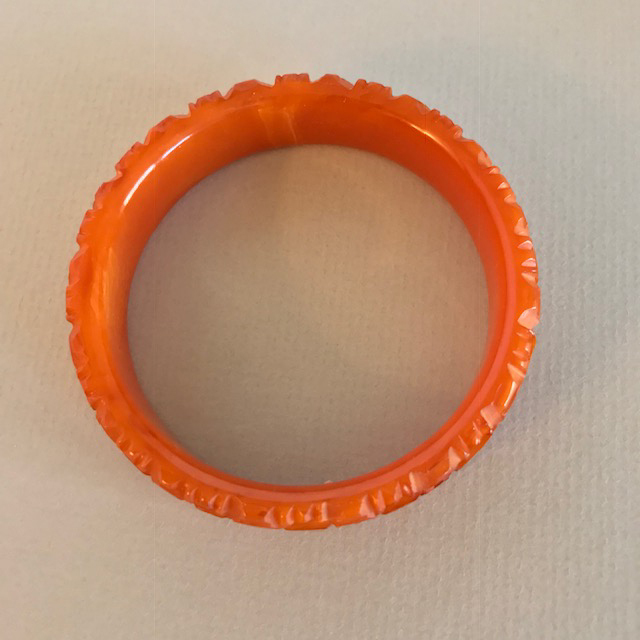 Apply this concept to the literally thousands of known formulations and you have endless color variety potential from this gem, like no other. 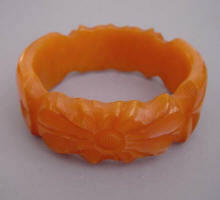 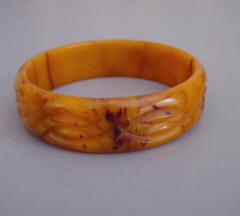 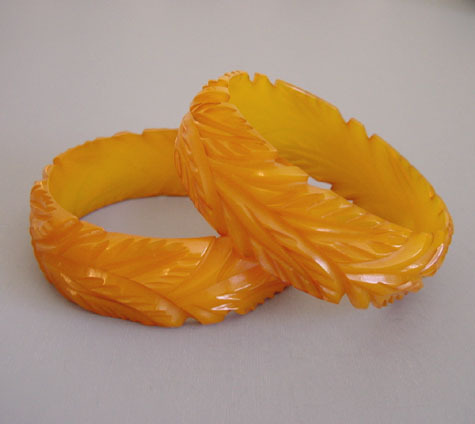 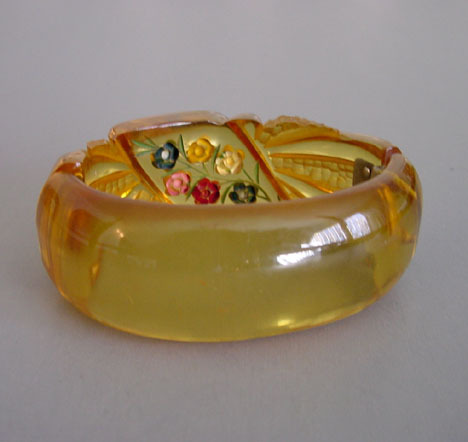 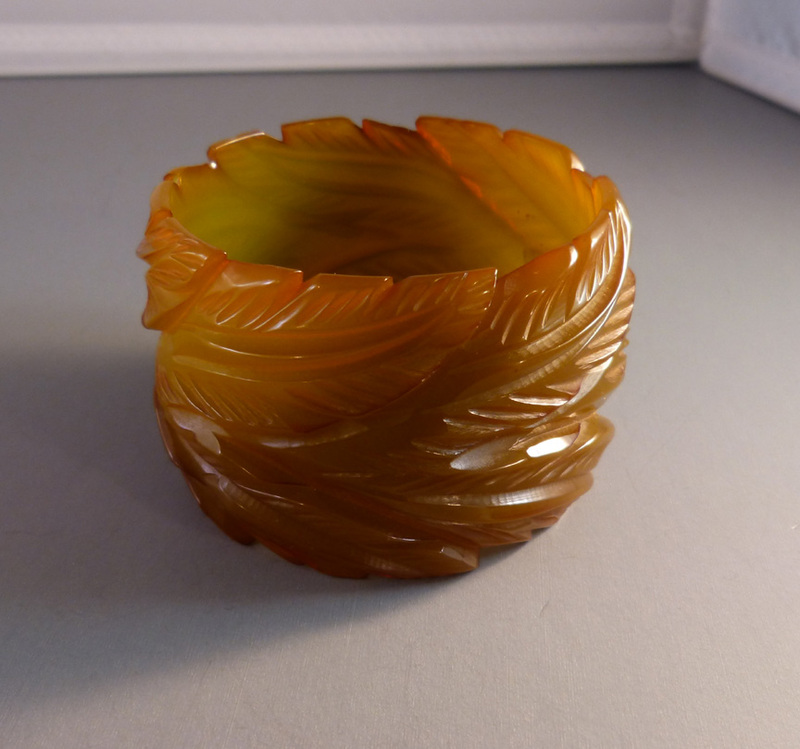 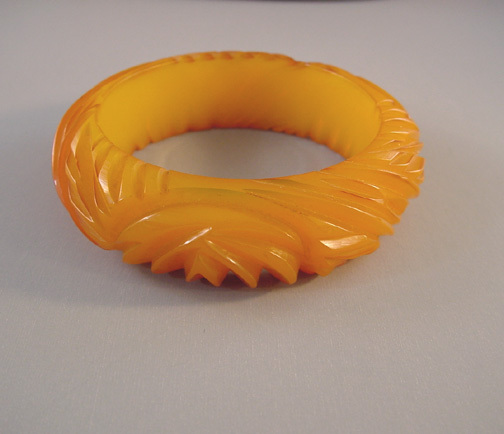 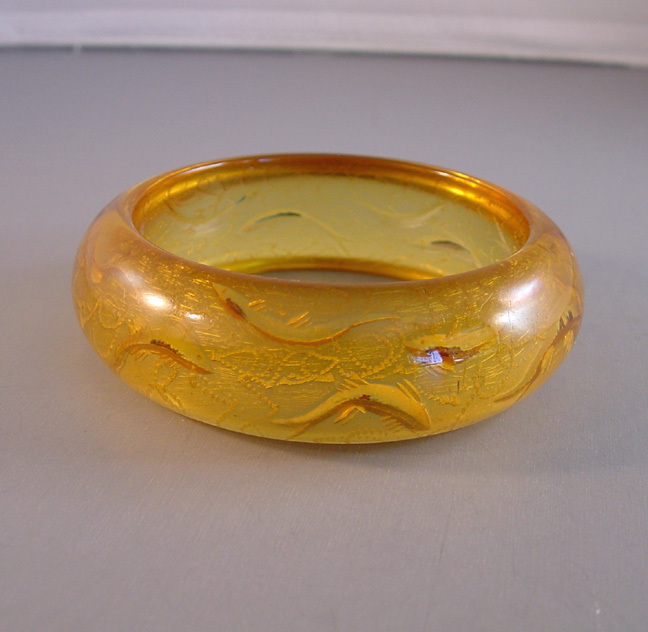 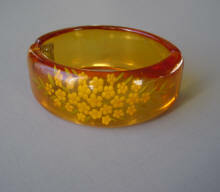 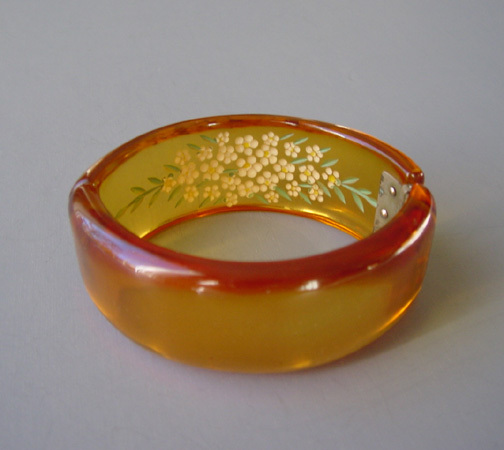 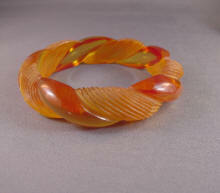 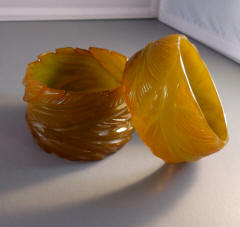 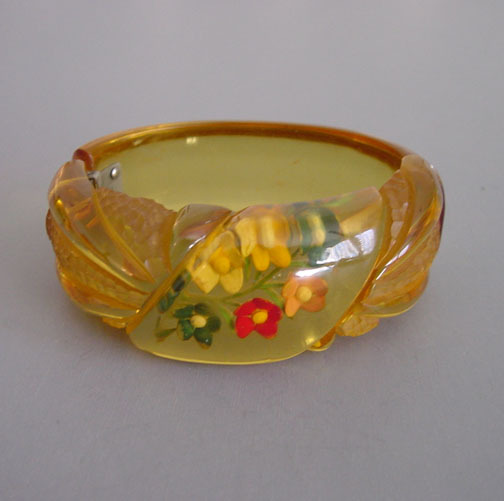 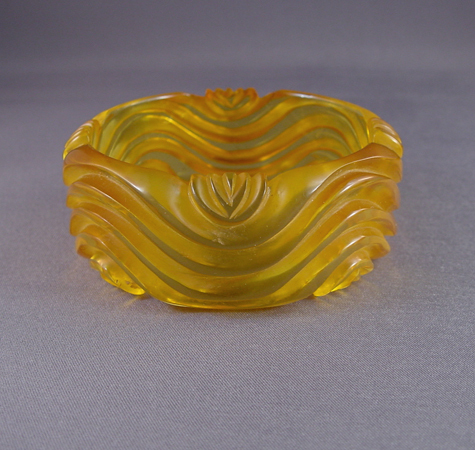 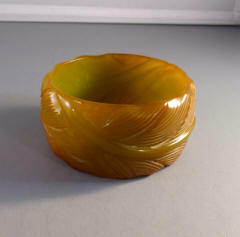 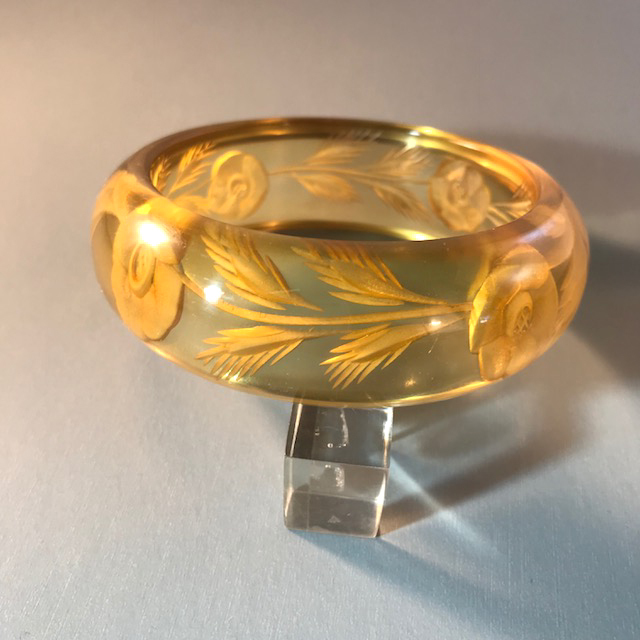 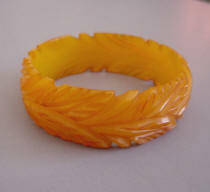 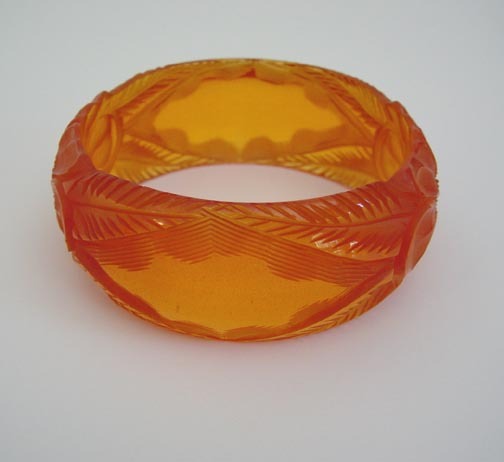 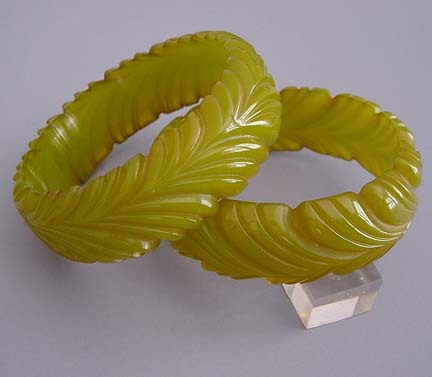 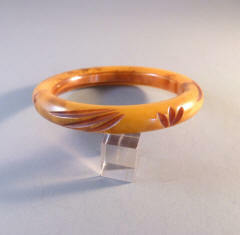 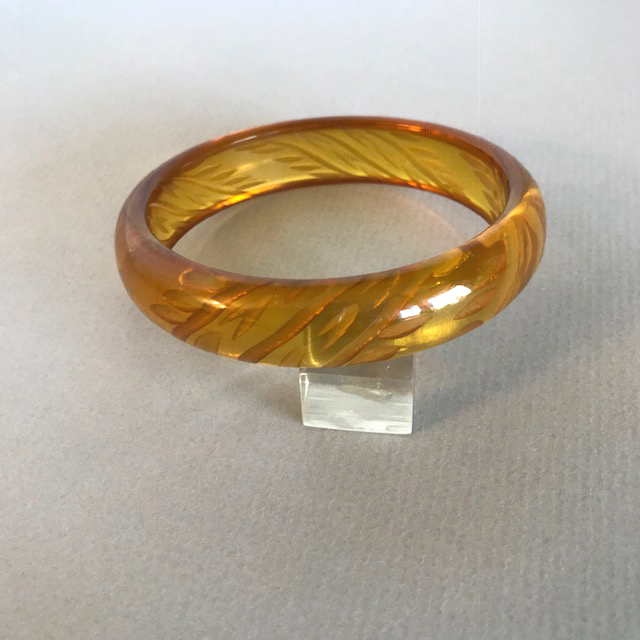 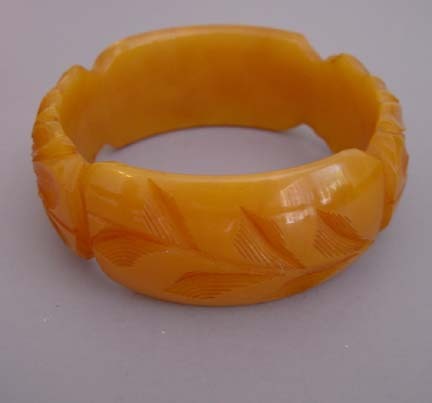 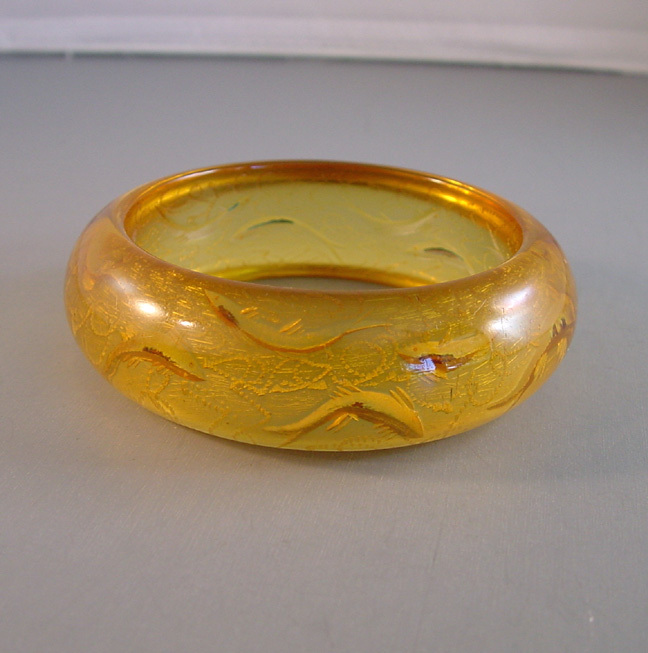 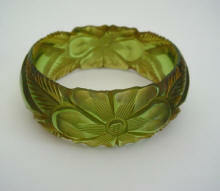 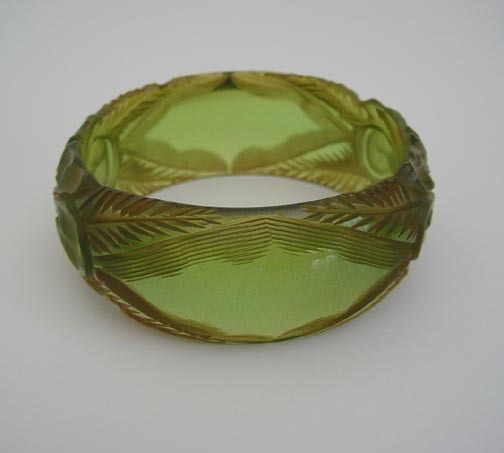 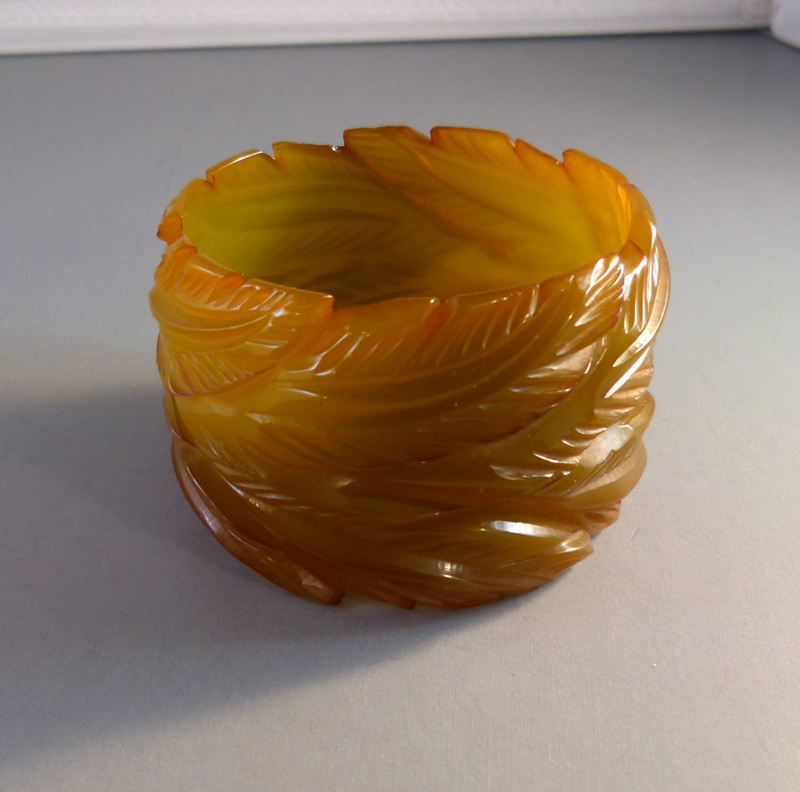 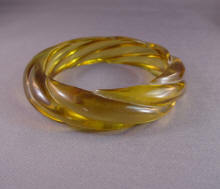 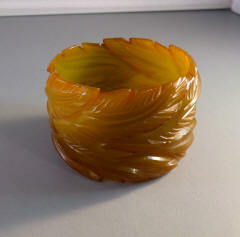 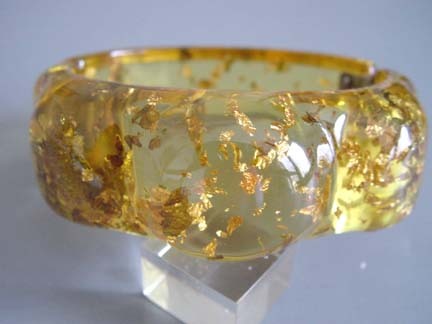 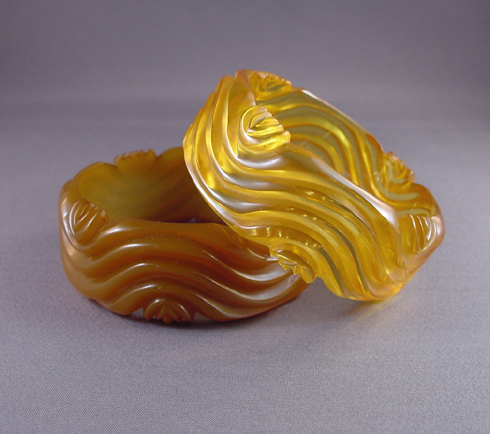 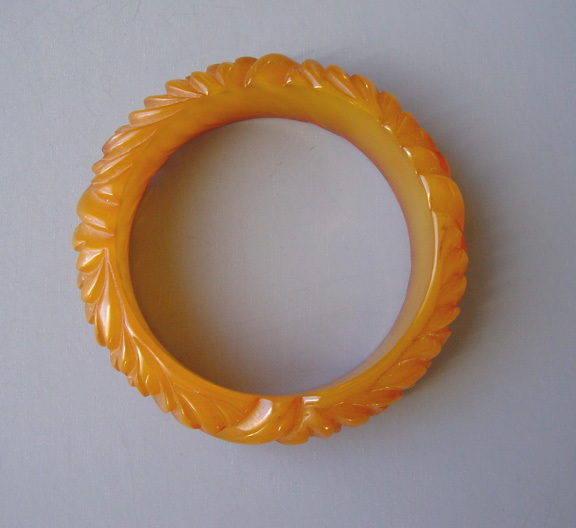 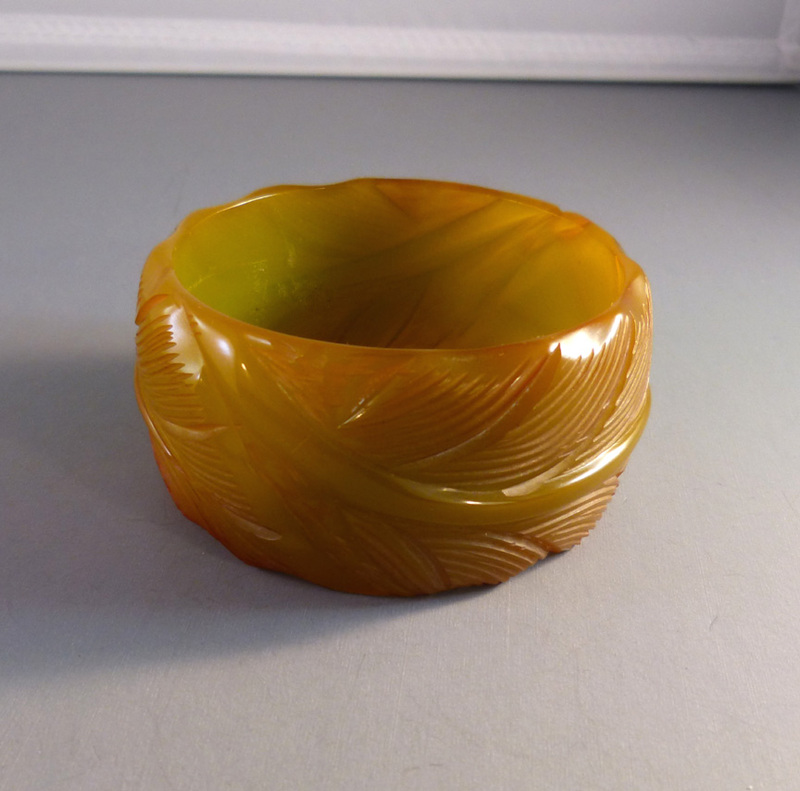 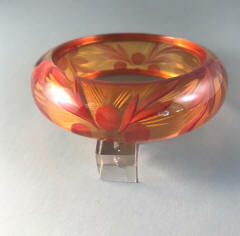 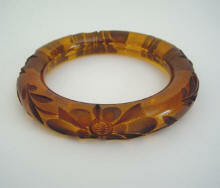 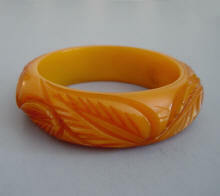 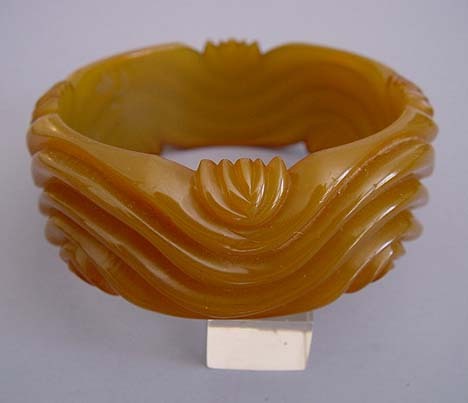 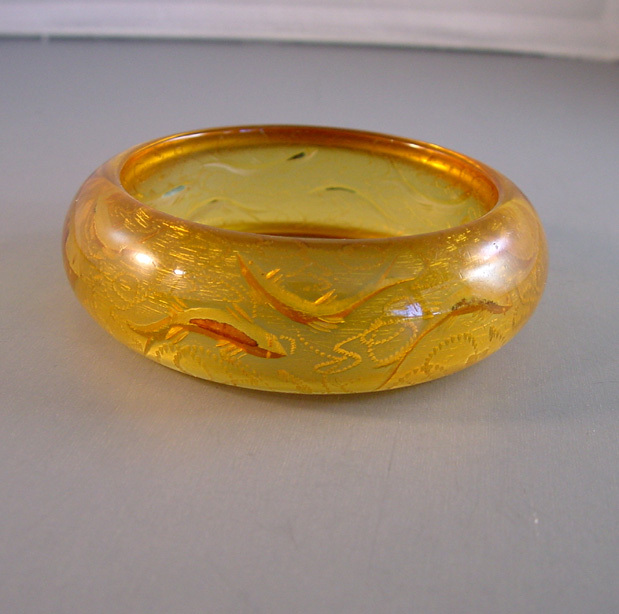 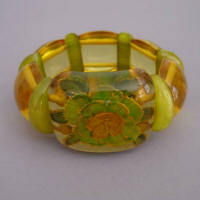 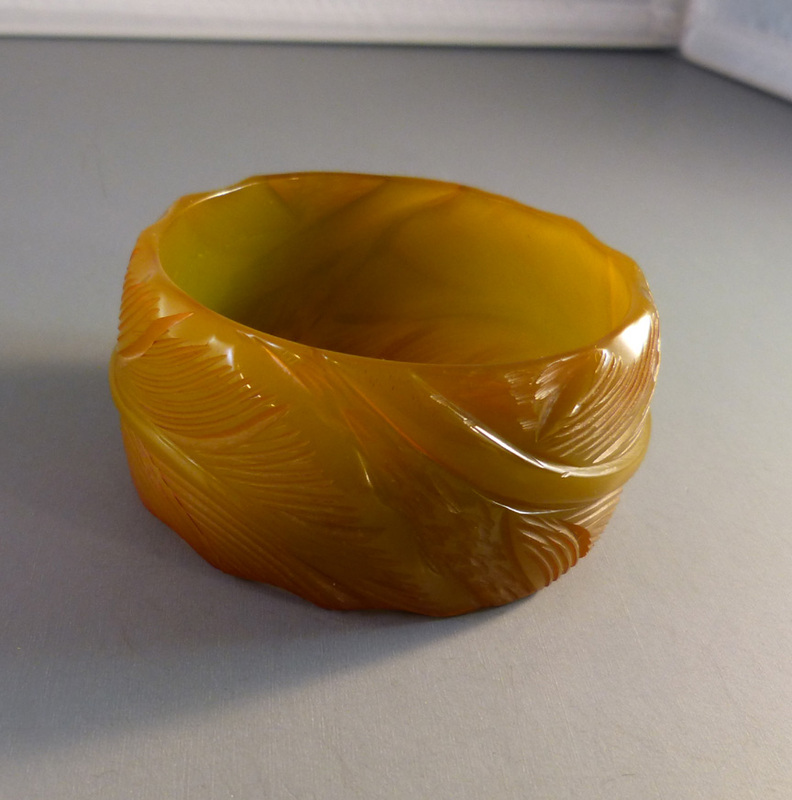 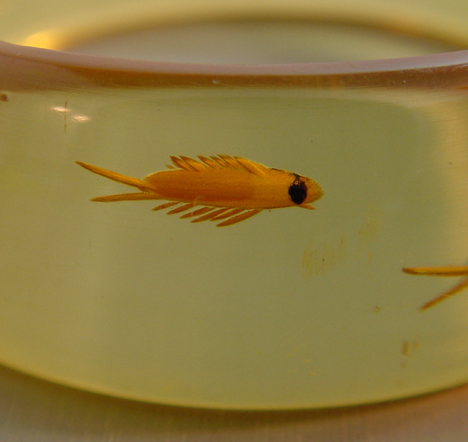 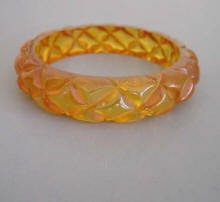 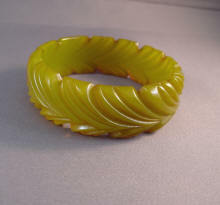 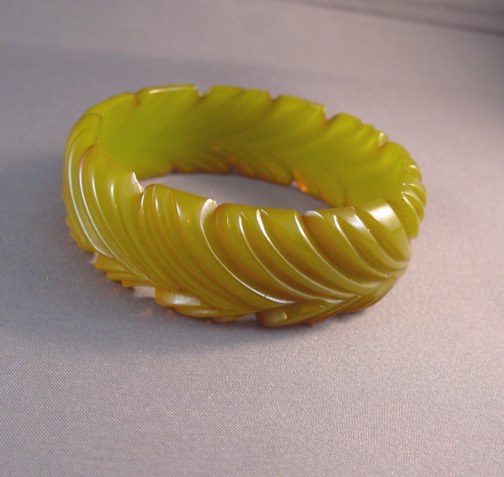 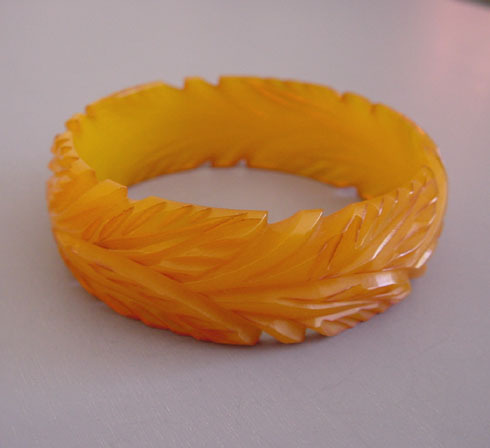 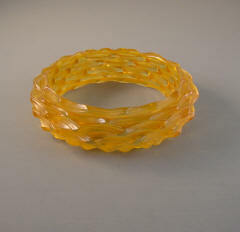 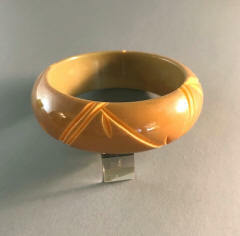 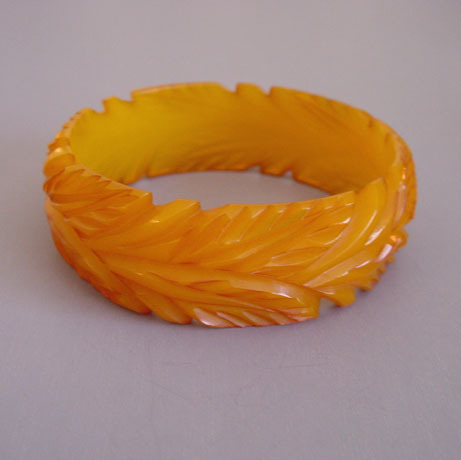 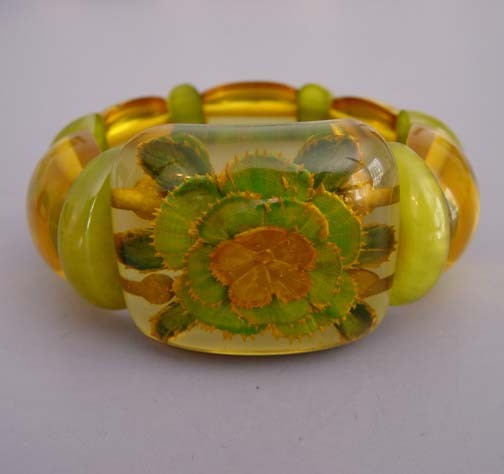 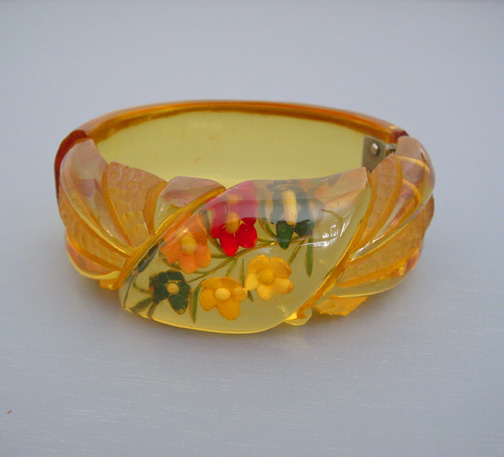 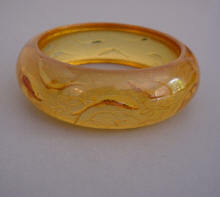 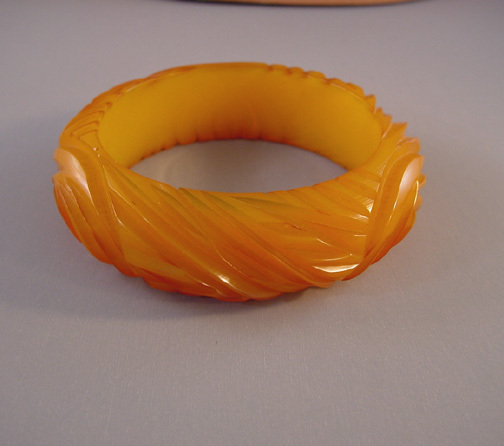 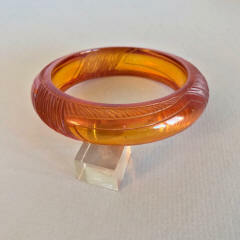 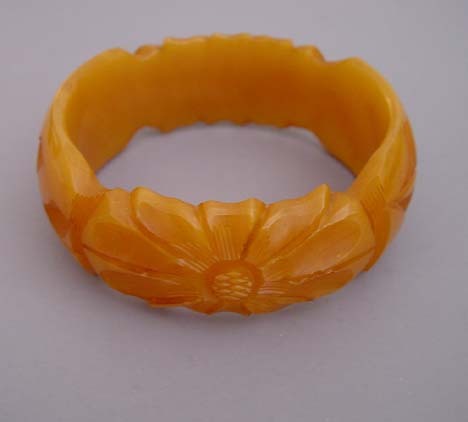 BAKELITE golden translucent leaf carved bangle, 2-1/2" by 1" by 1/4". 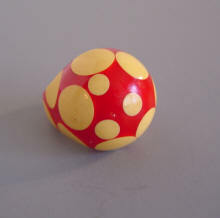 #B33391. 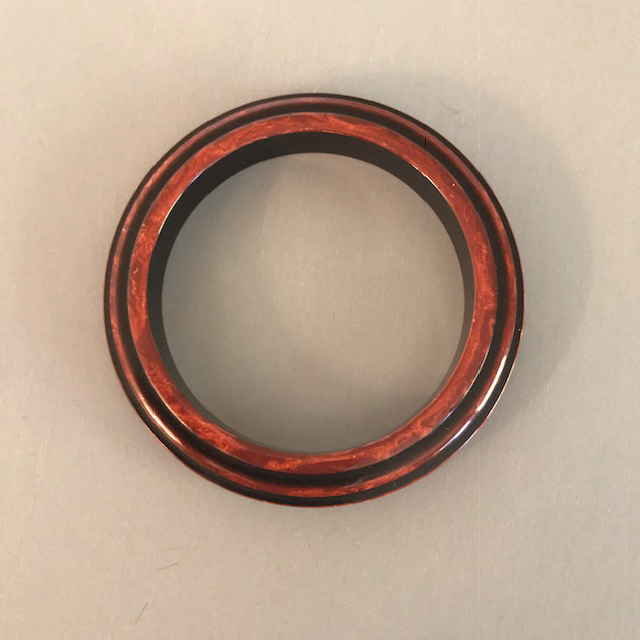 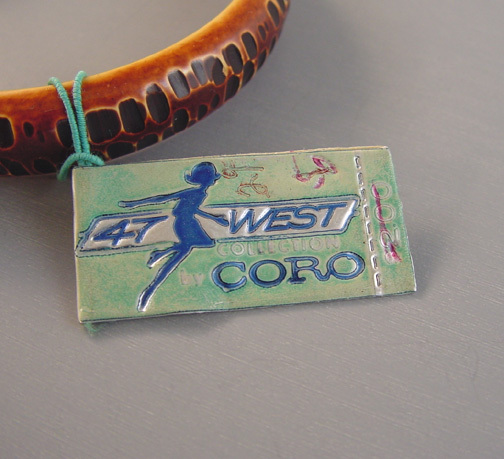 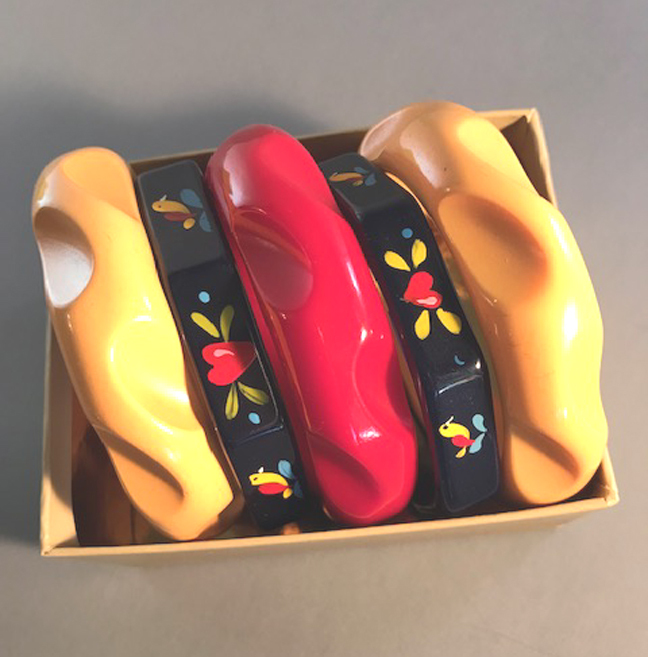 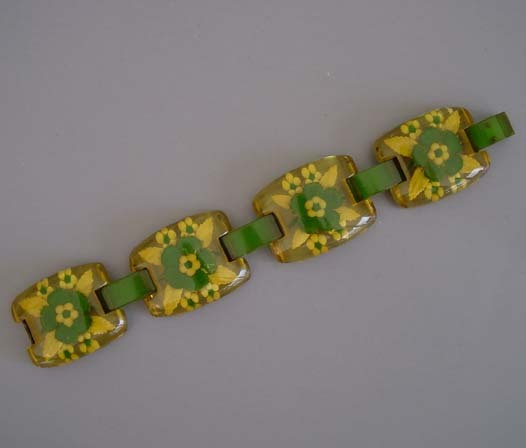 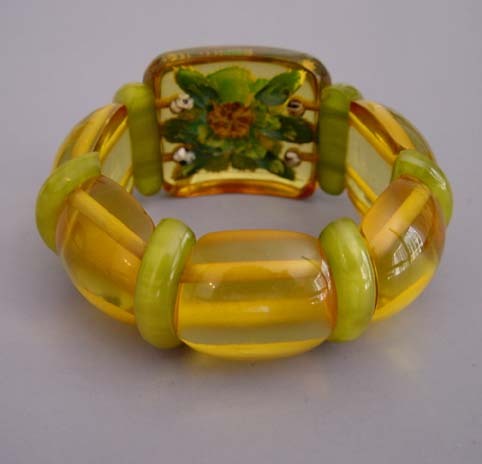 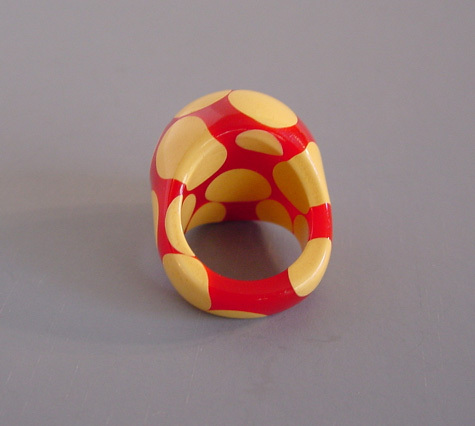 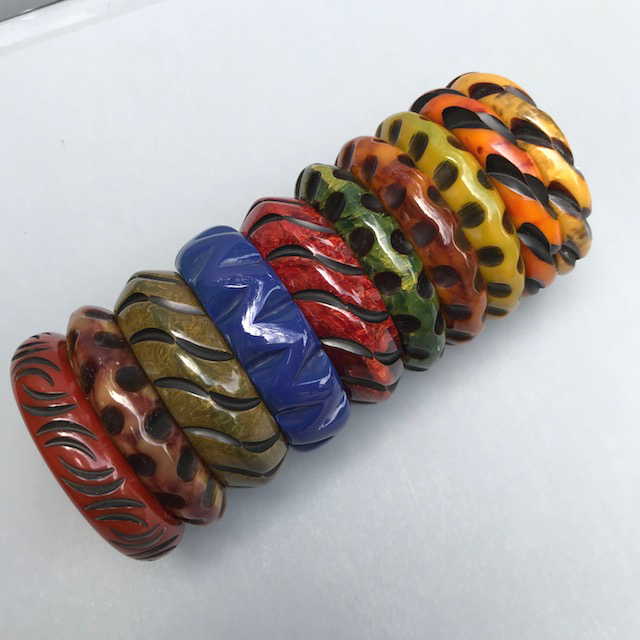 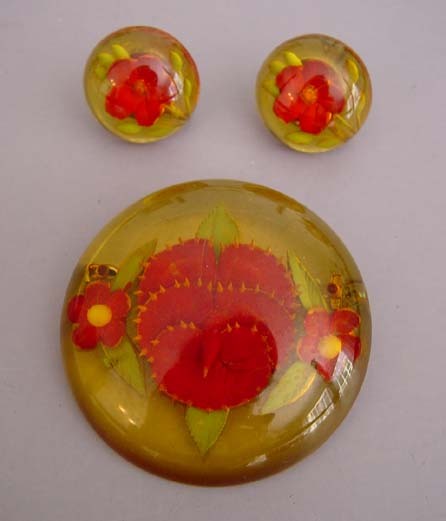 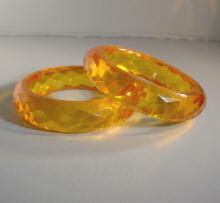 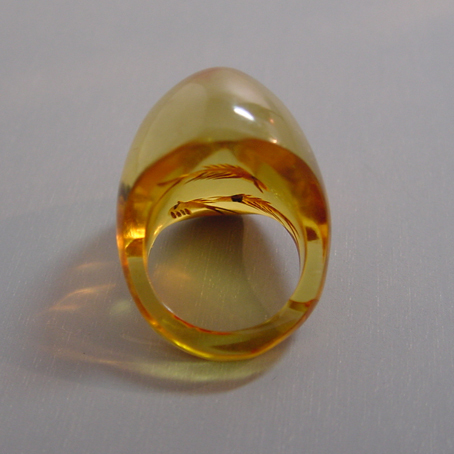 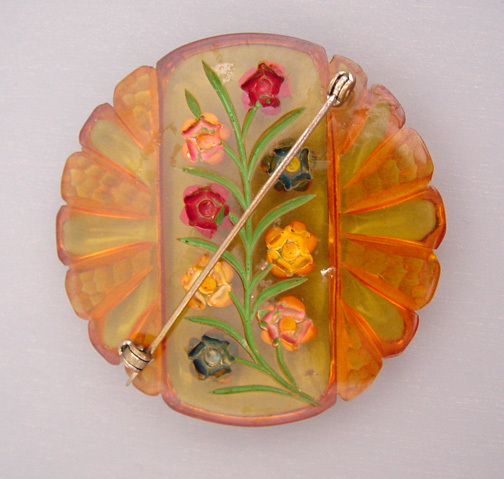 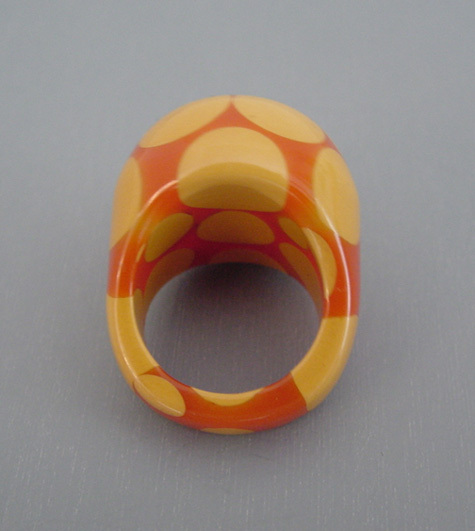 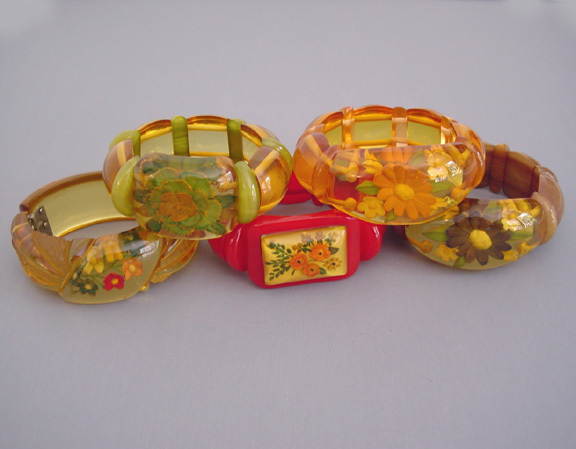 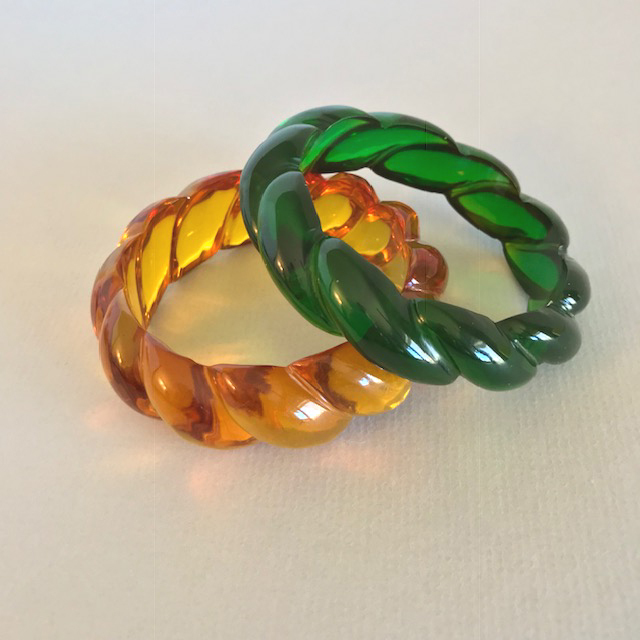 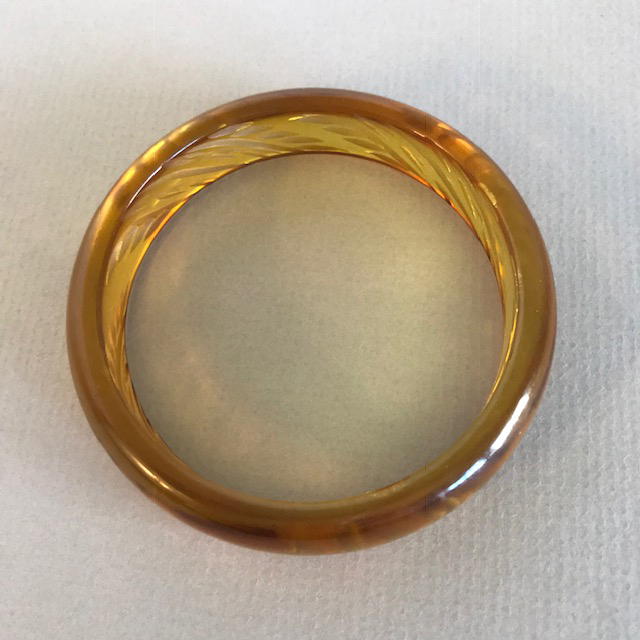 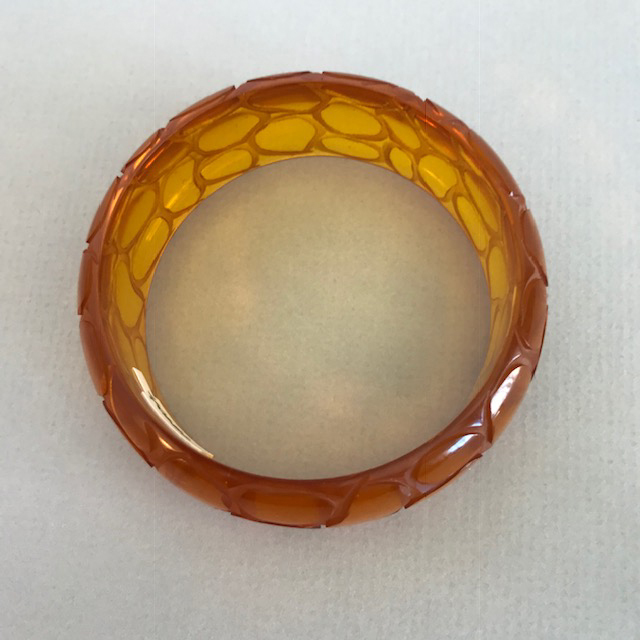 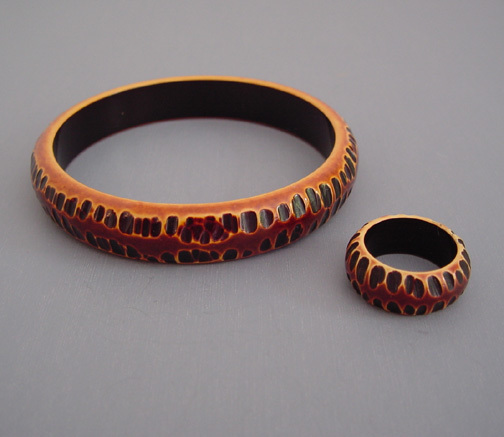 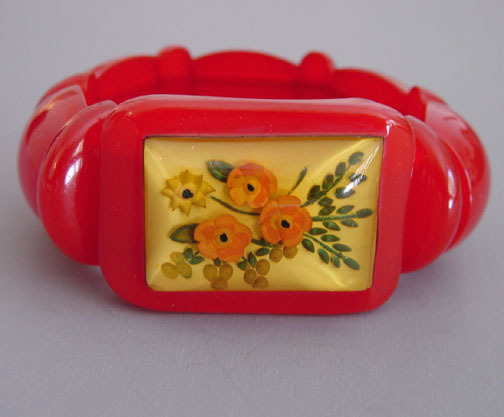 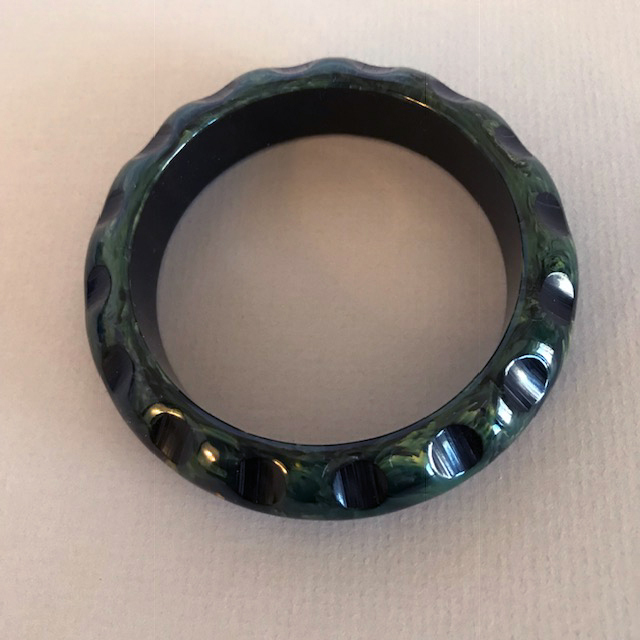 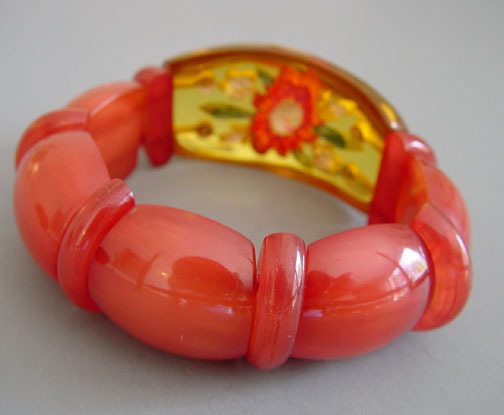 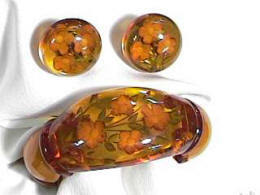 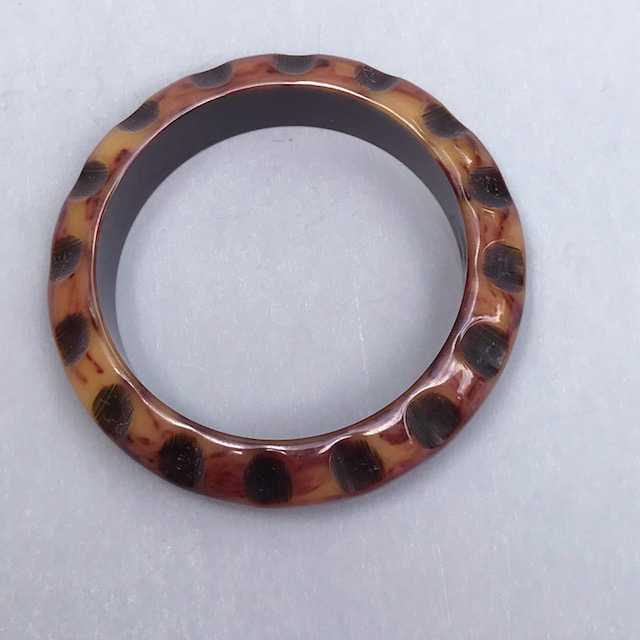 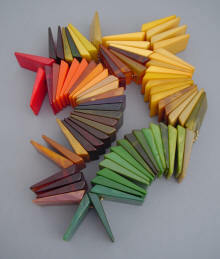 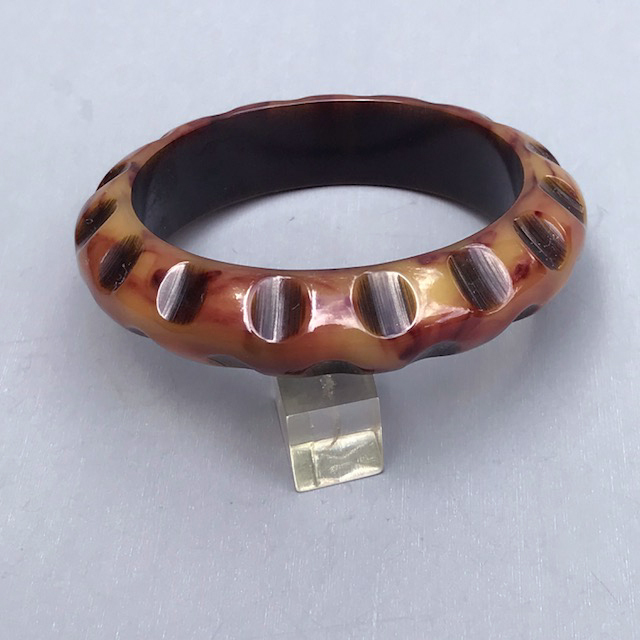 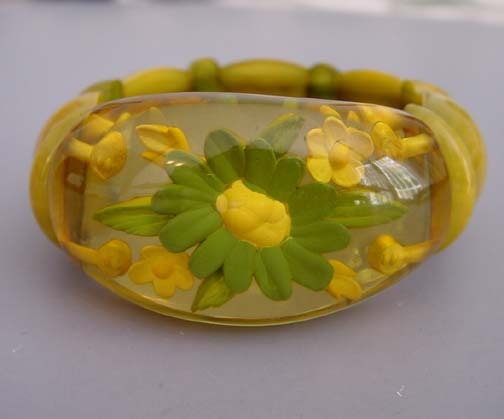 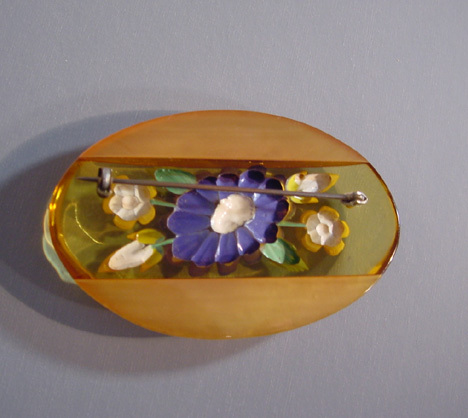 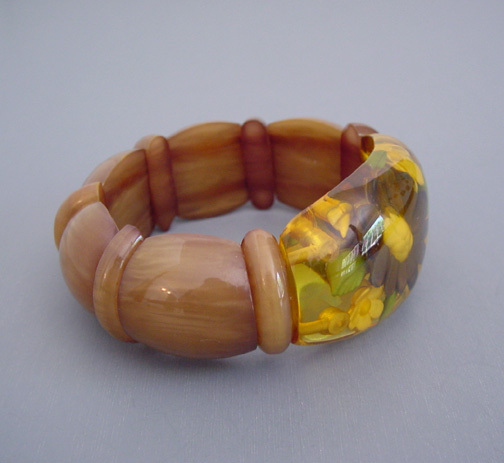 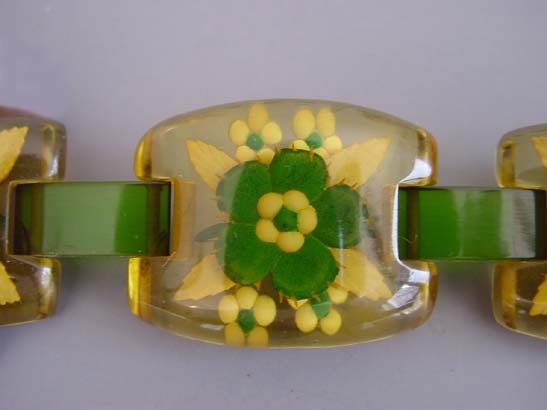 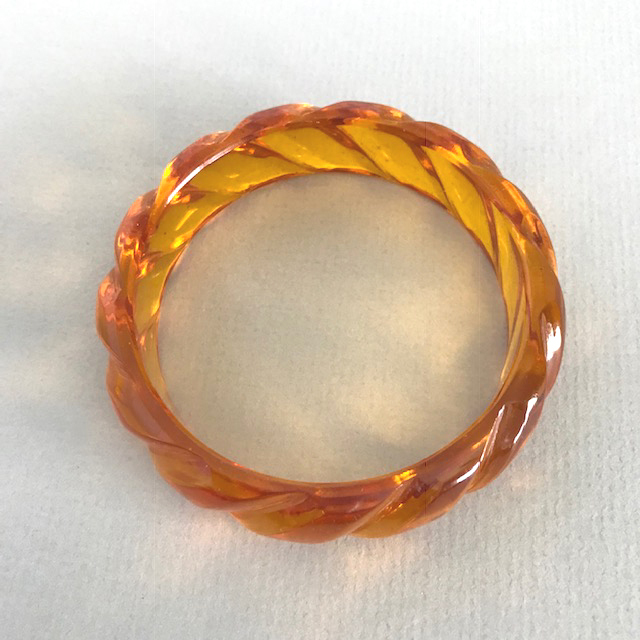 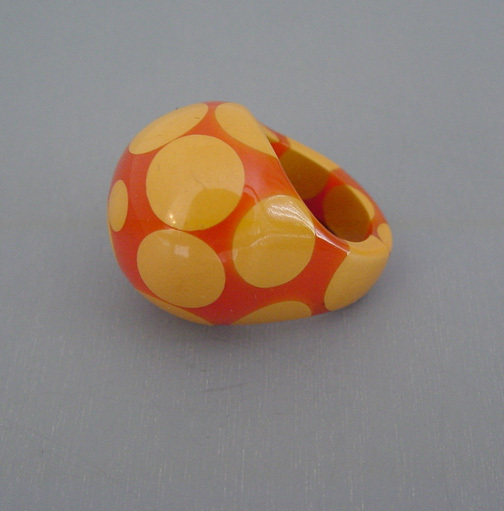 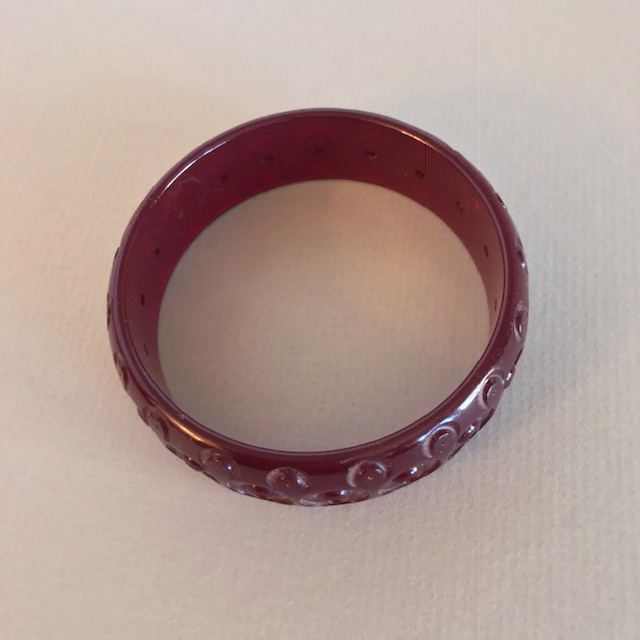 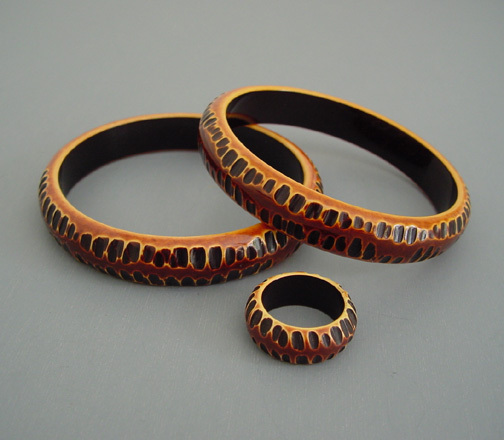 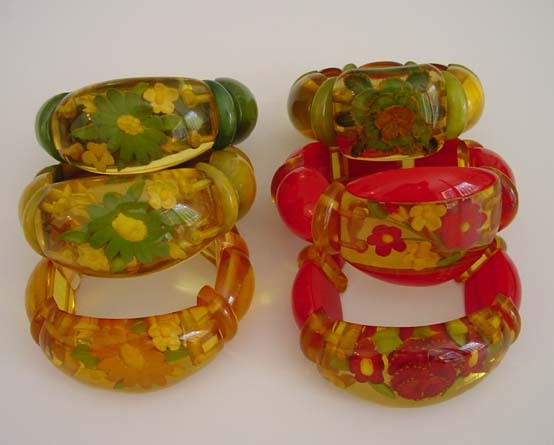 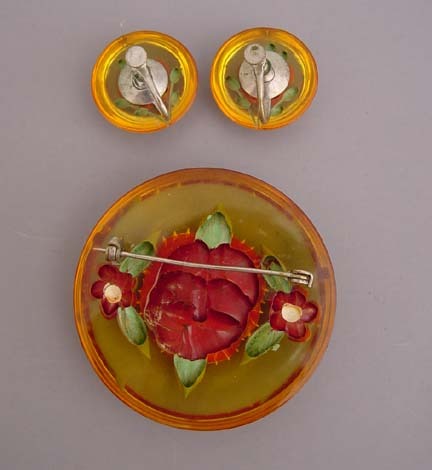 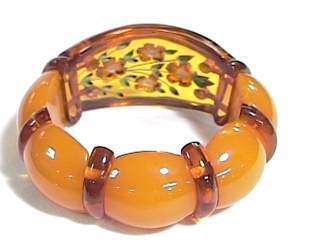 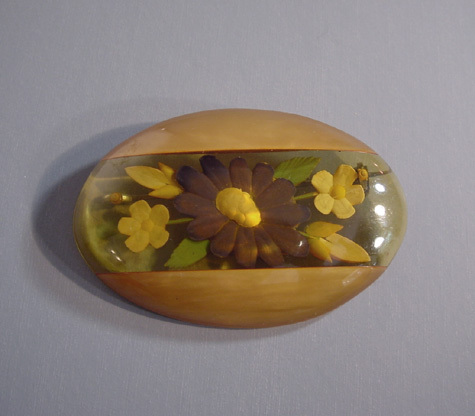 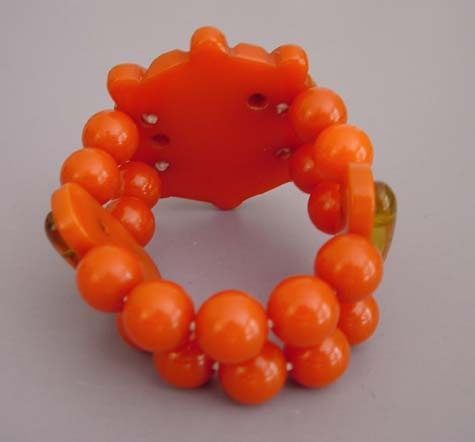 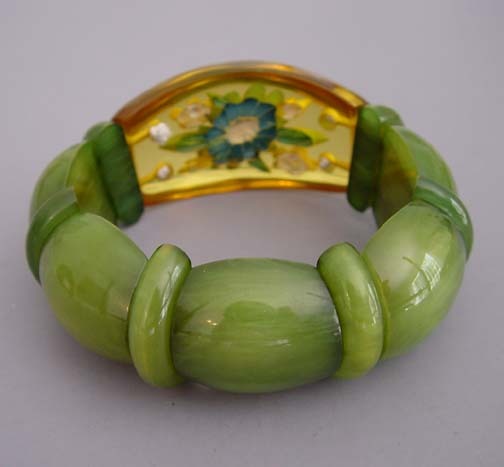 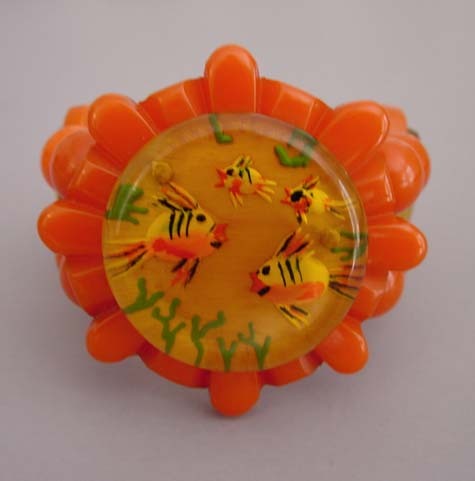 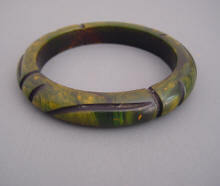 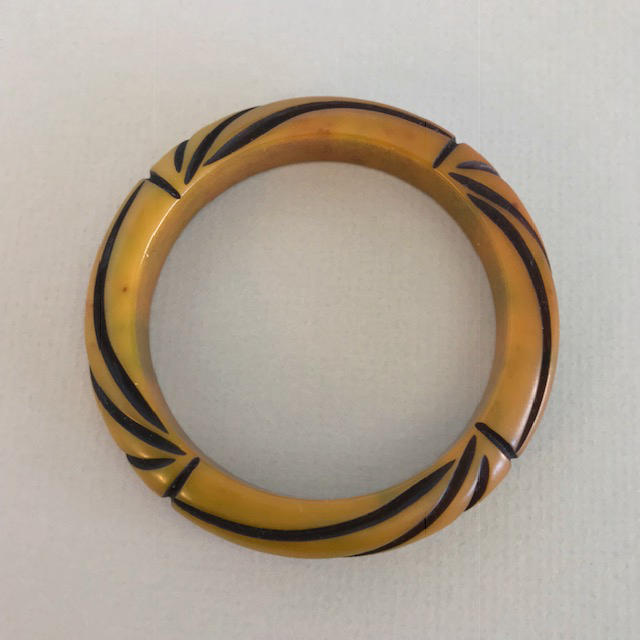 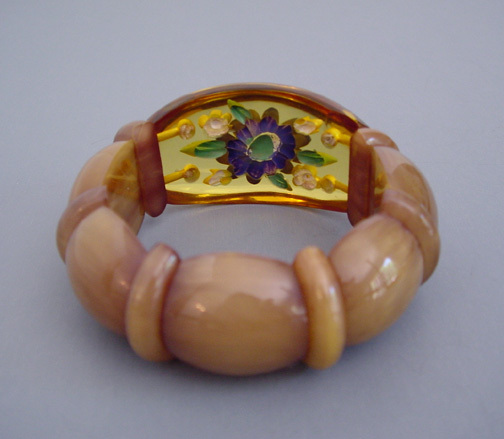 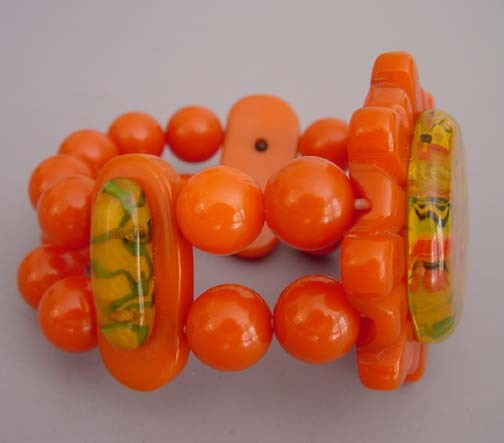 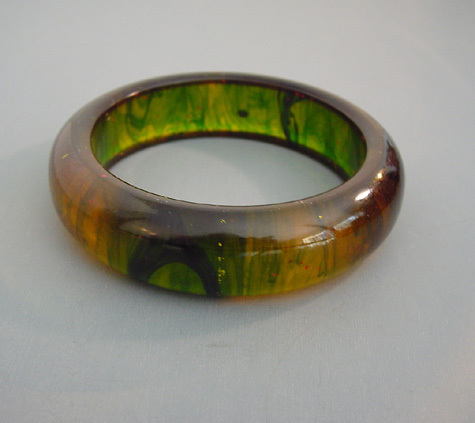 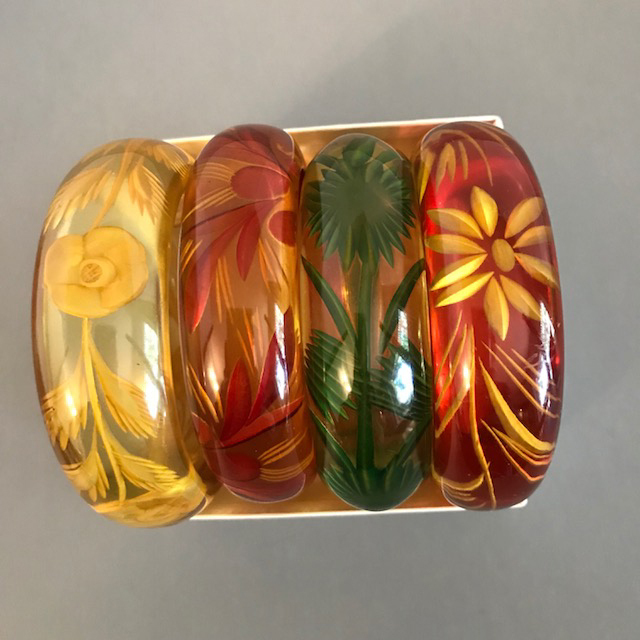 Some Bakelite jewelry was finished with a layer of a darker or different colored wash, creating what is called "resin washed" or "overdyed" bakelite. These pieces are some of my personal favorites. But testing resin washed pieces can be difficult as the wash tends to stop any oxidation at all. 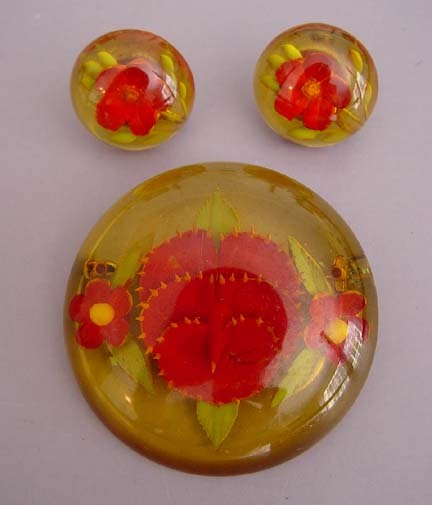 These are genuine bakelite though. 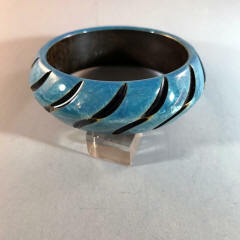 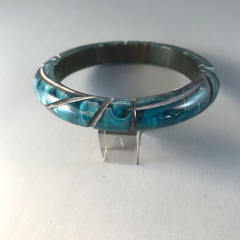 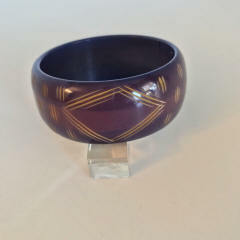 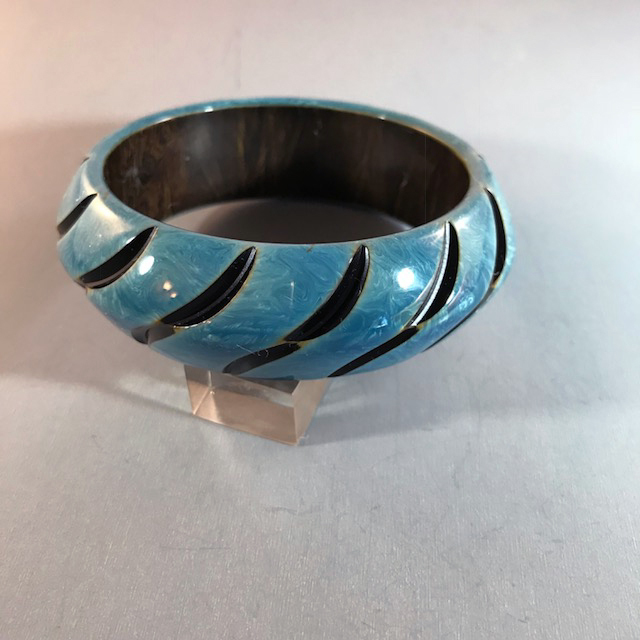 BAKELITE denim blue carved and overdyed saucer bangle, 2-1/2" by 1" by 1/3". 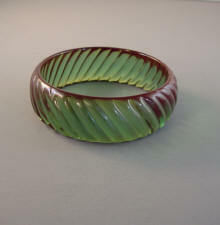 It has been recently polished again to reveal the color it was when it was new, circa 1940. 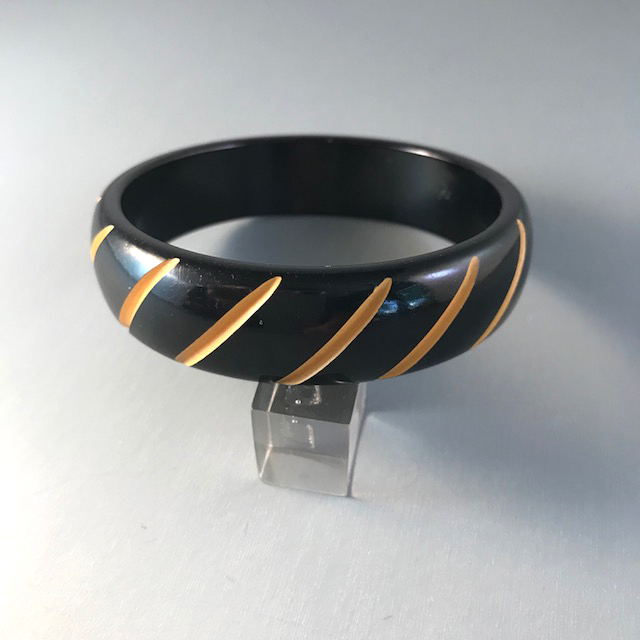 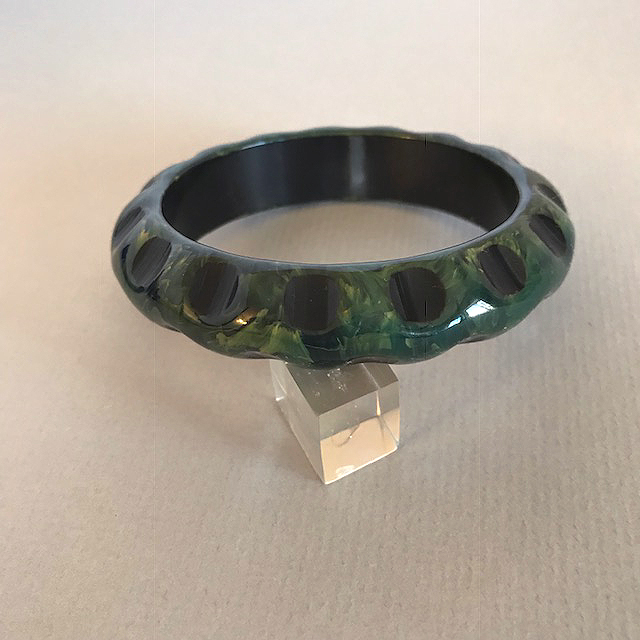 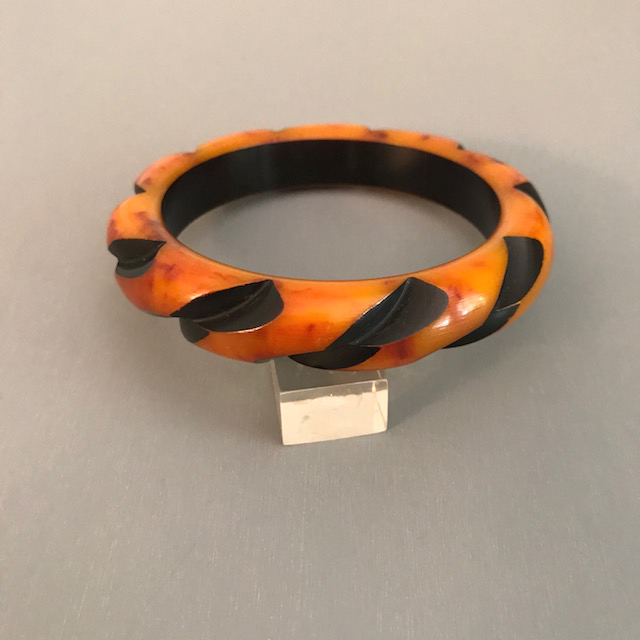 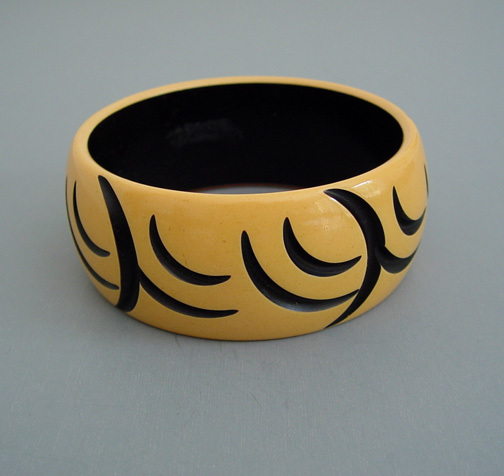 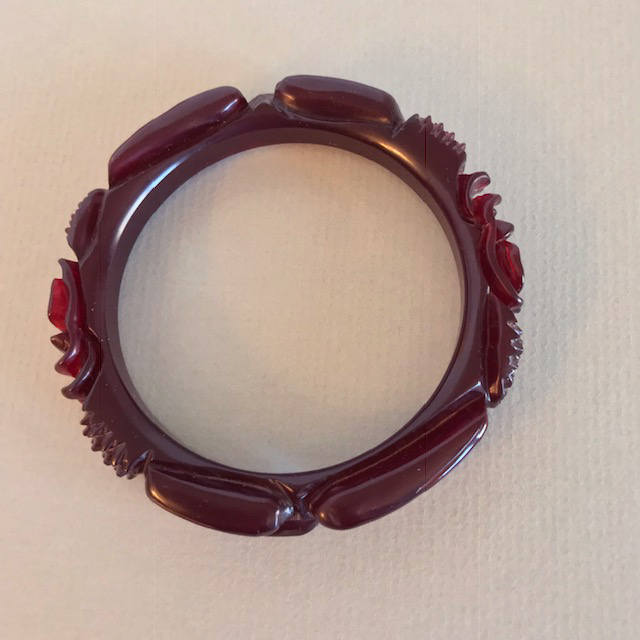 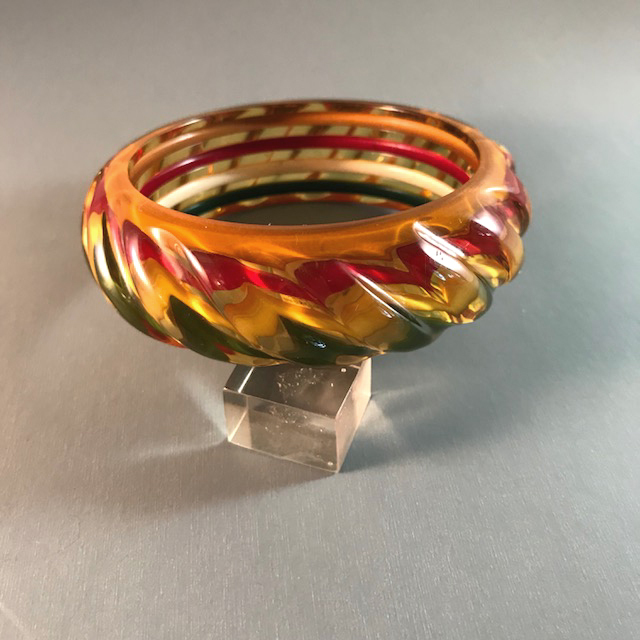 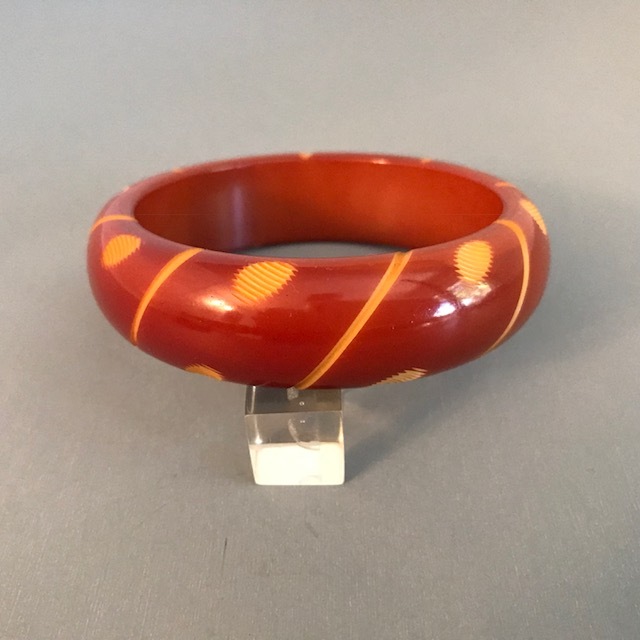 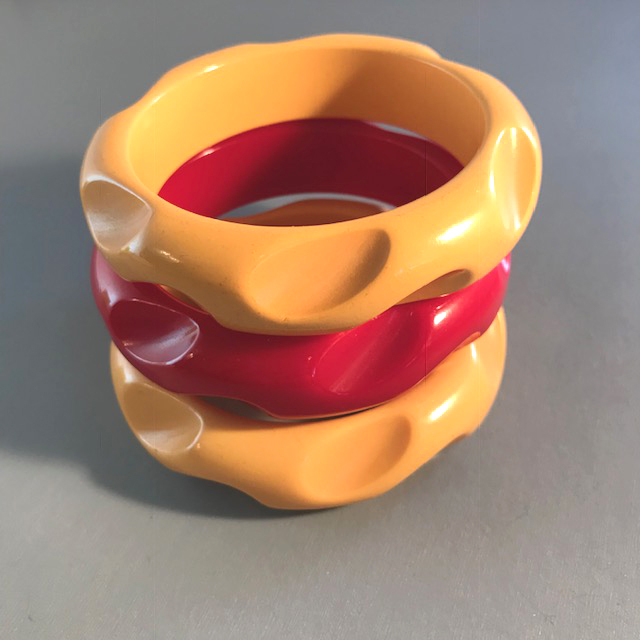 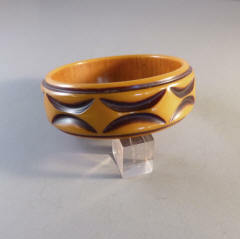 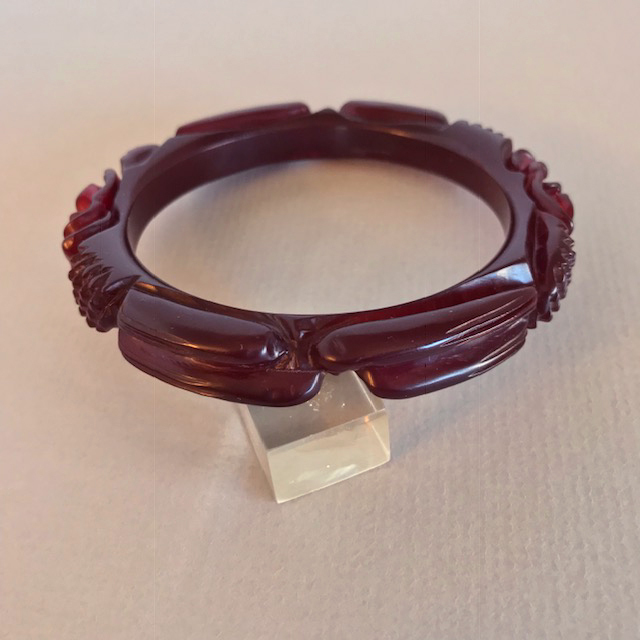 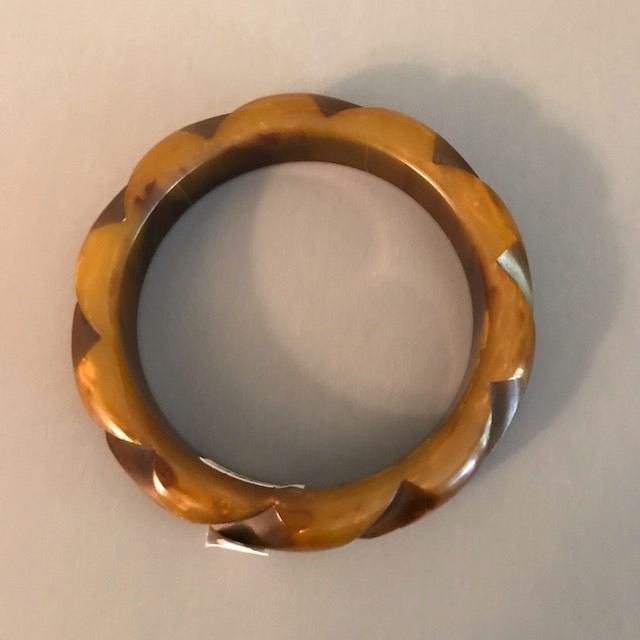 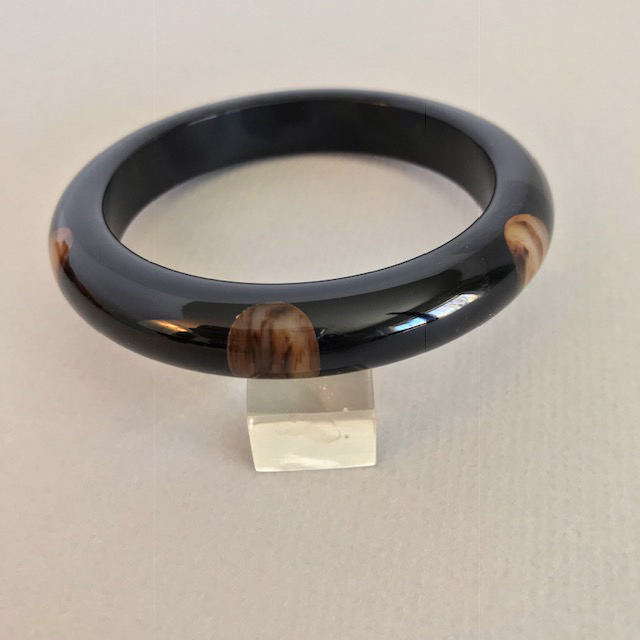 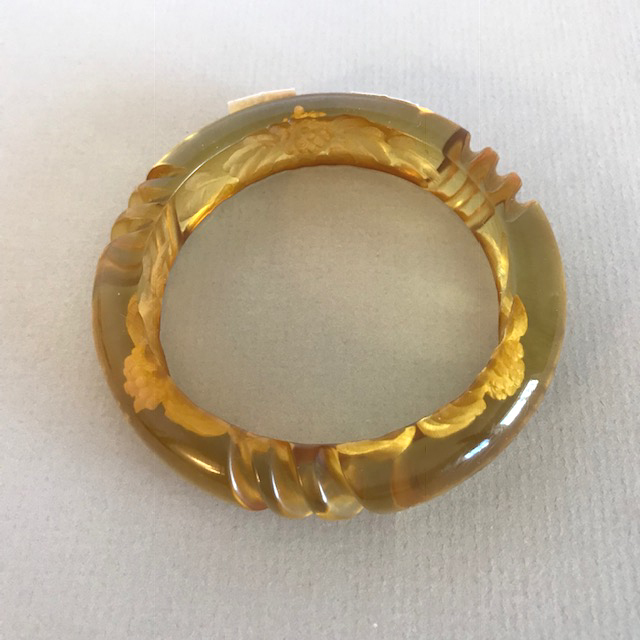 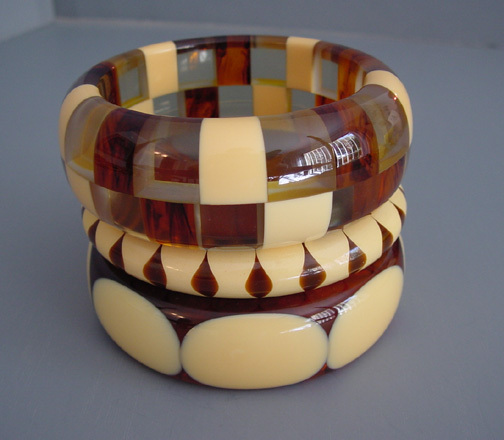 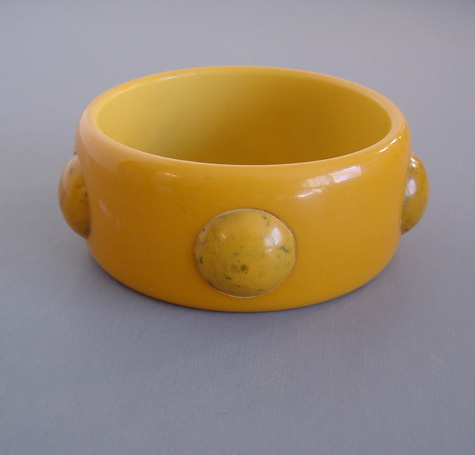 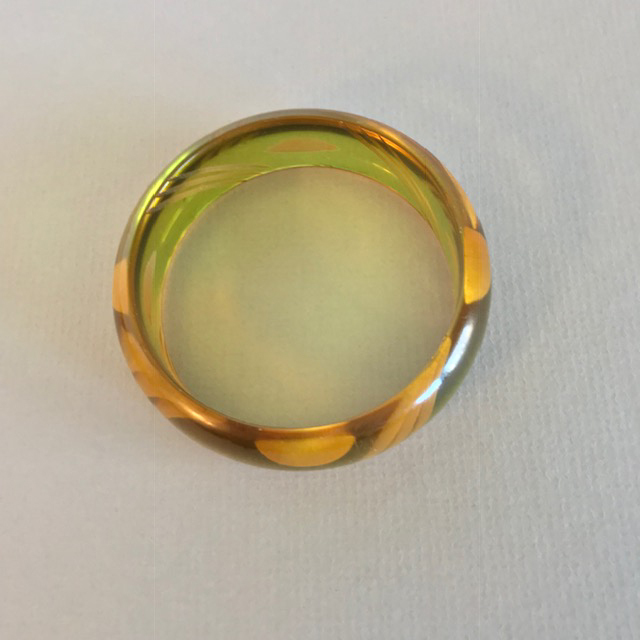 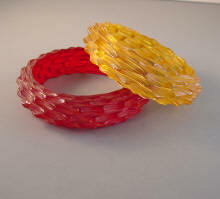 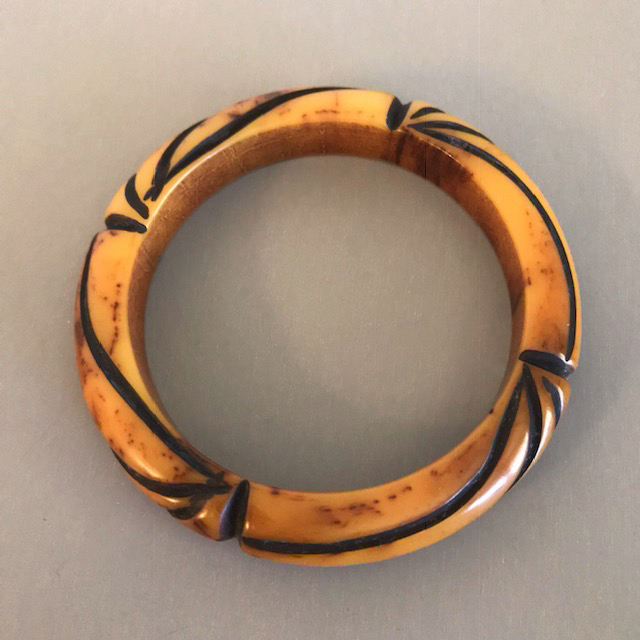 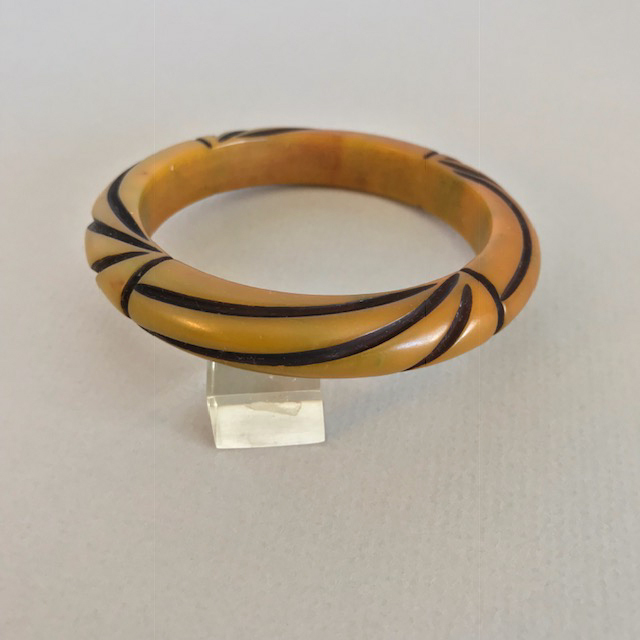 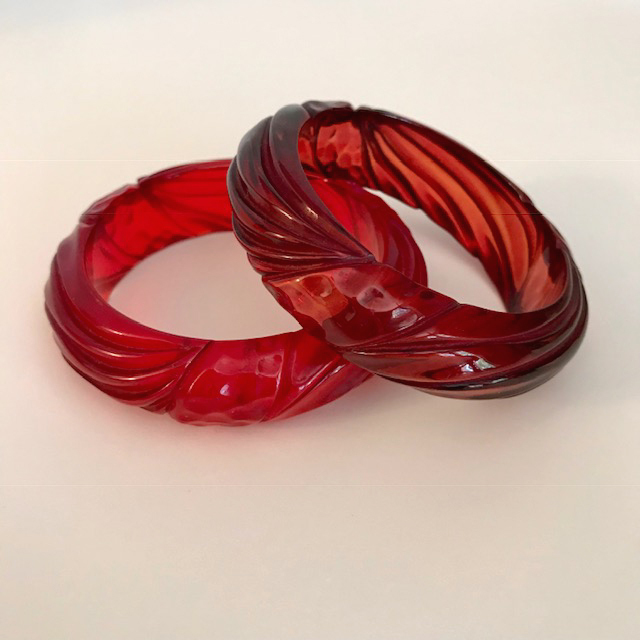 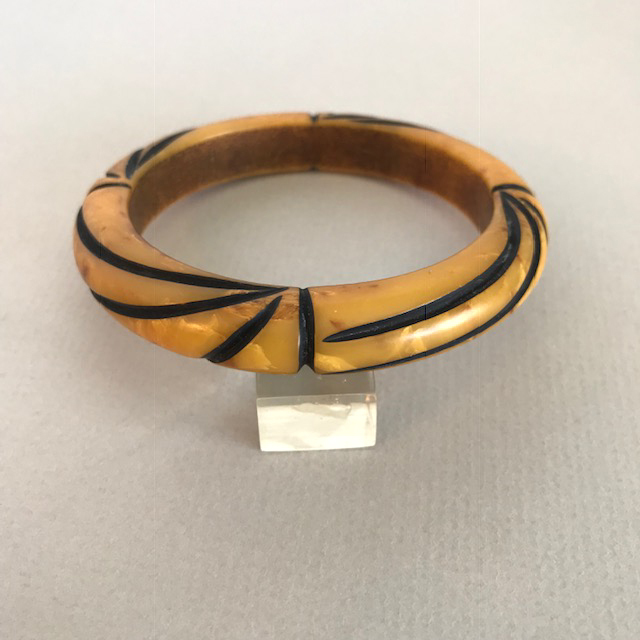 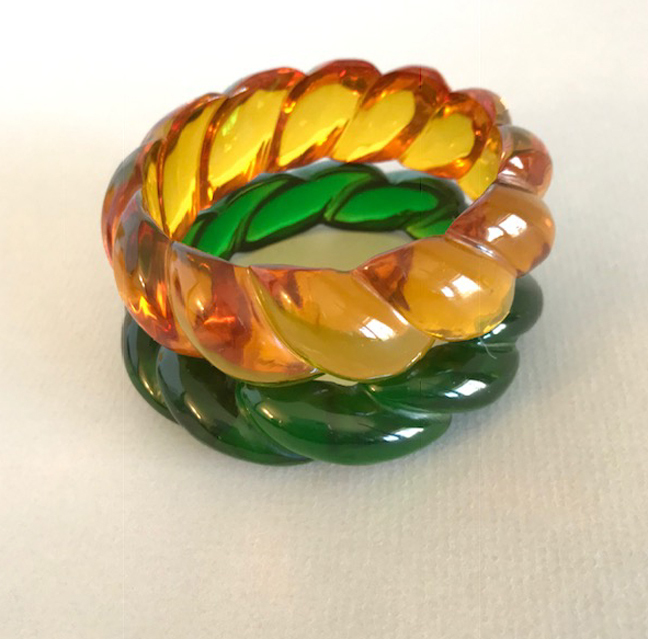 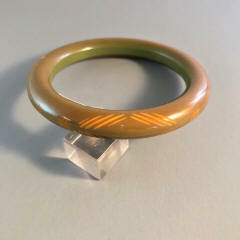 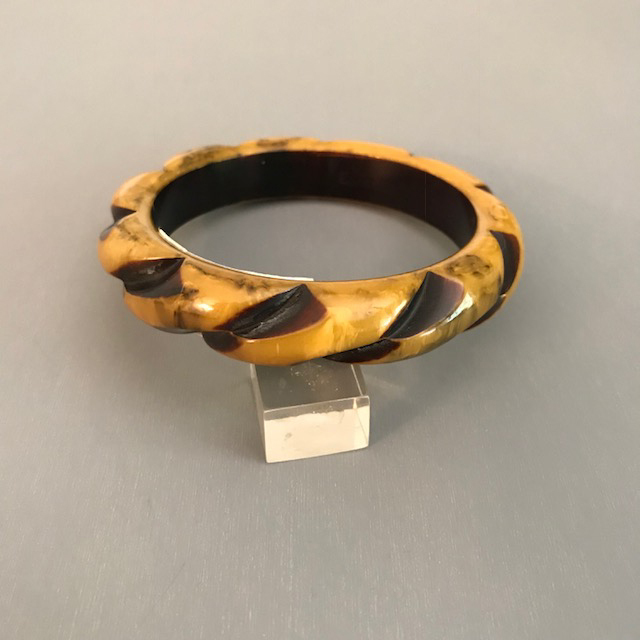 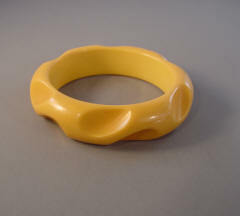 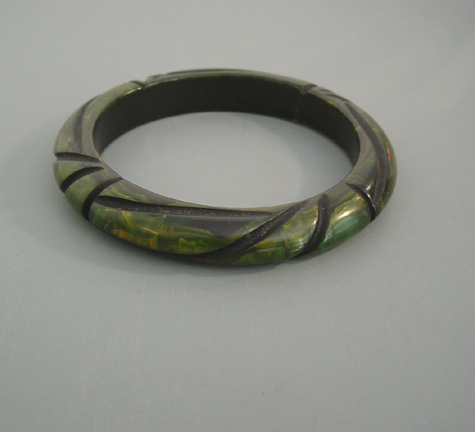 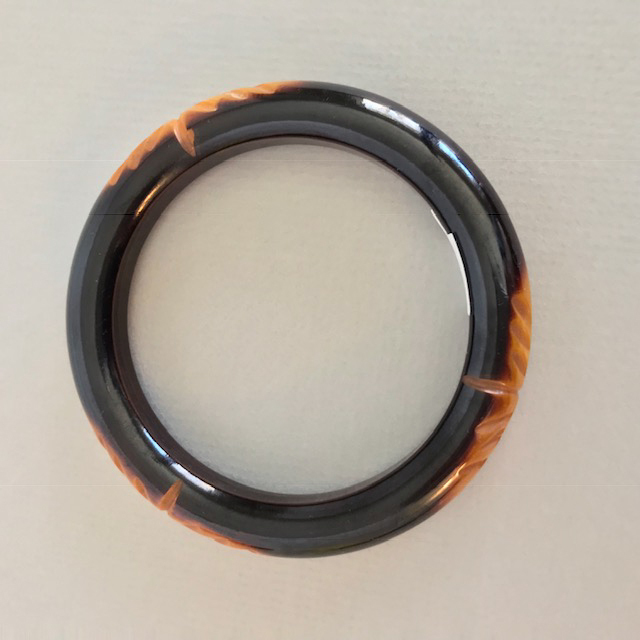 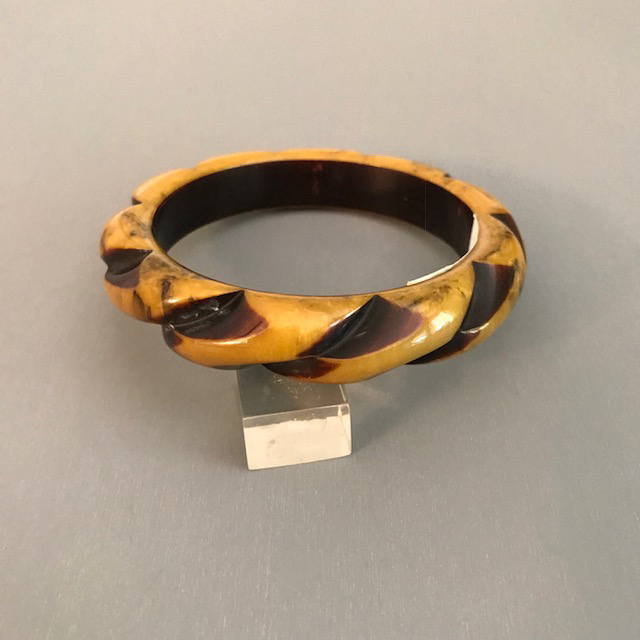 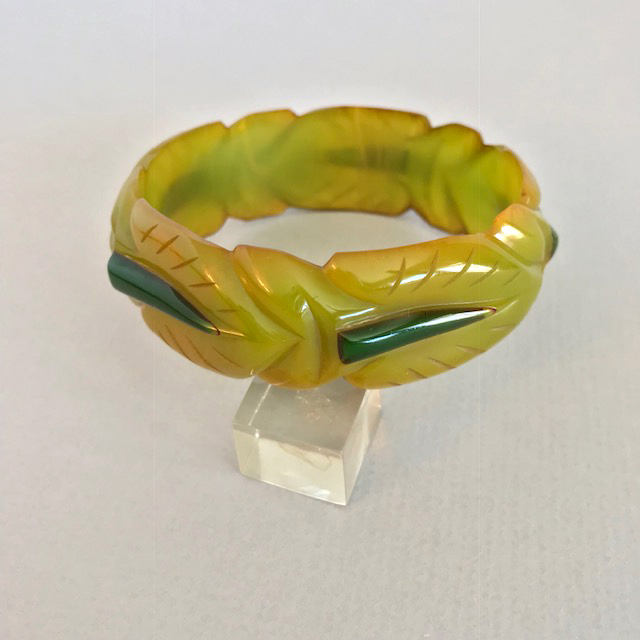 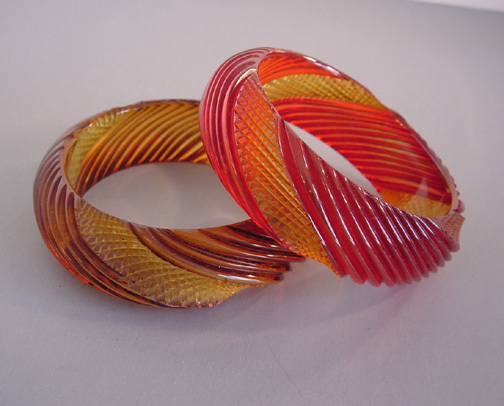 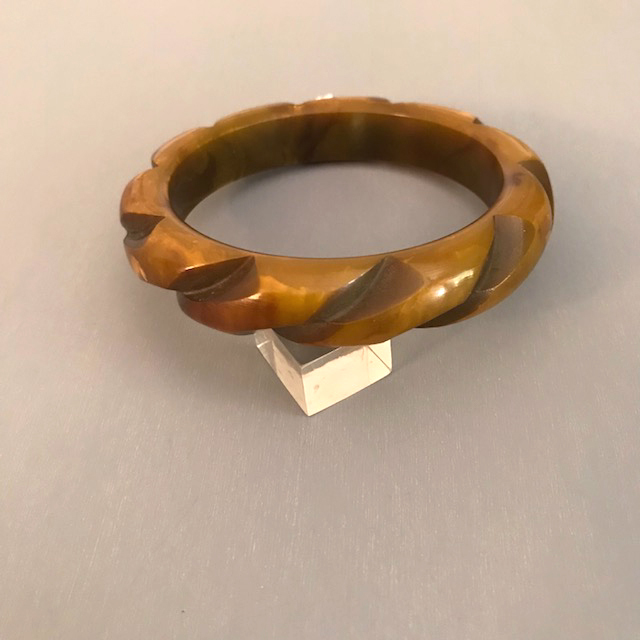 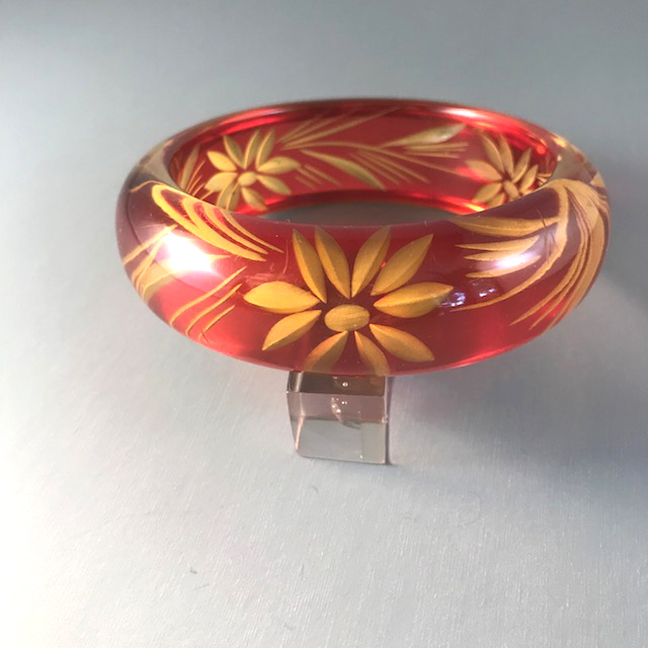 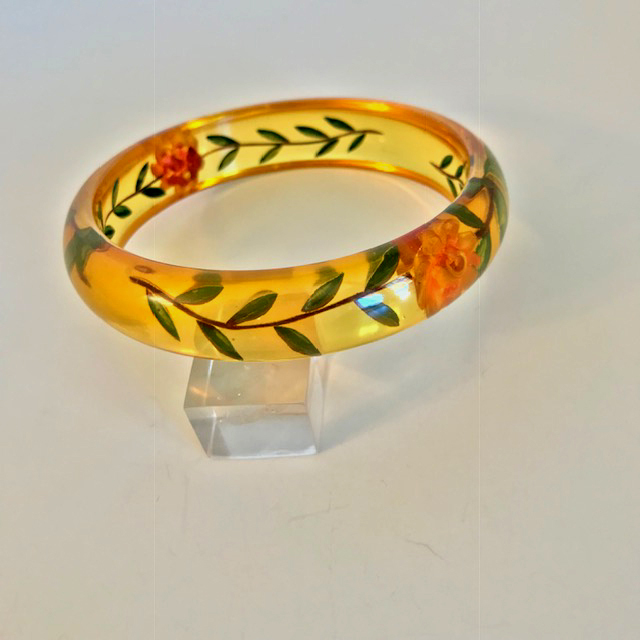 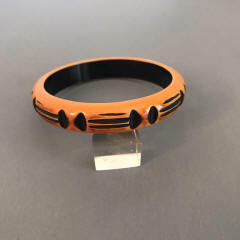 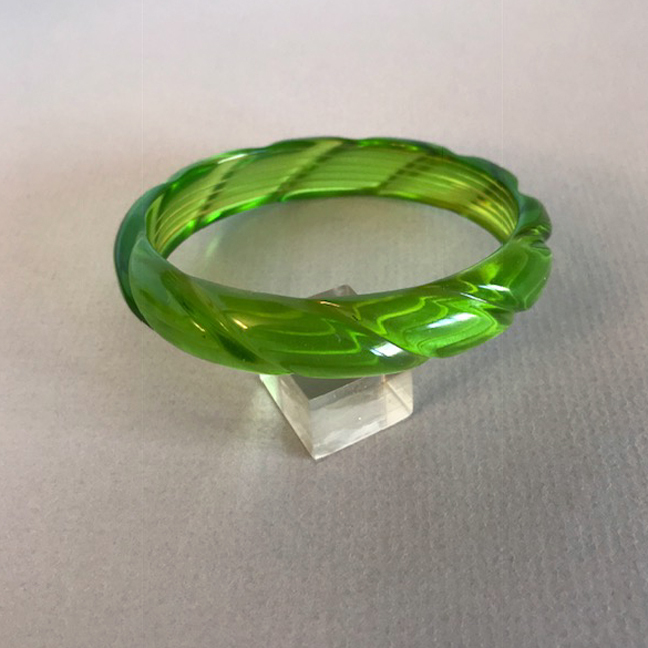 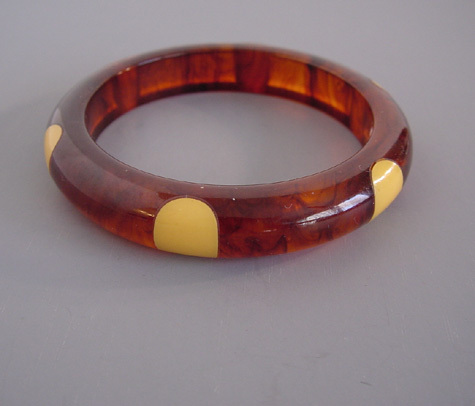 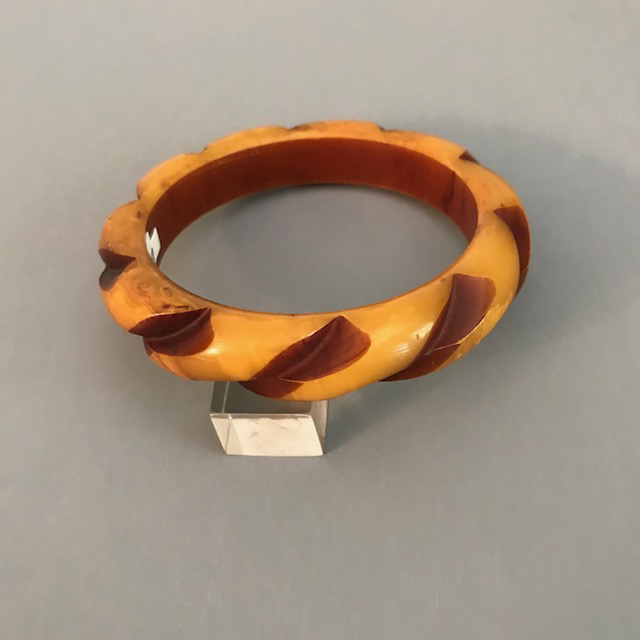 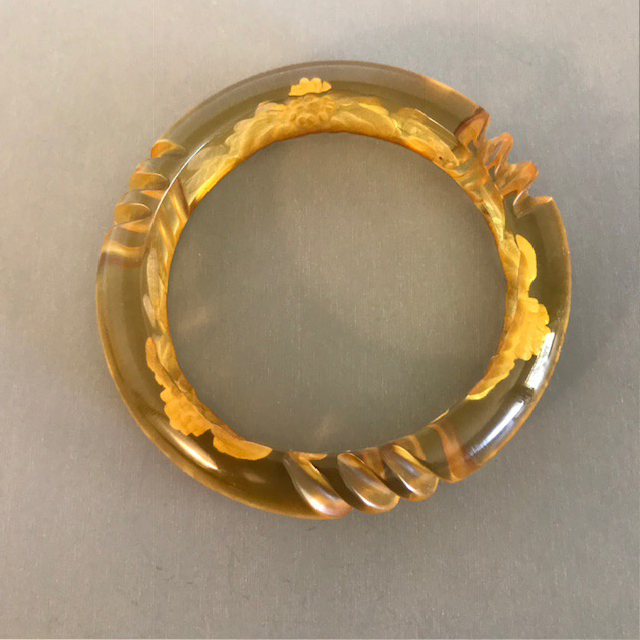 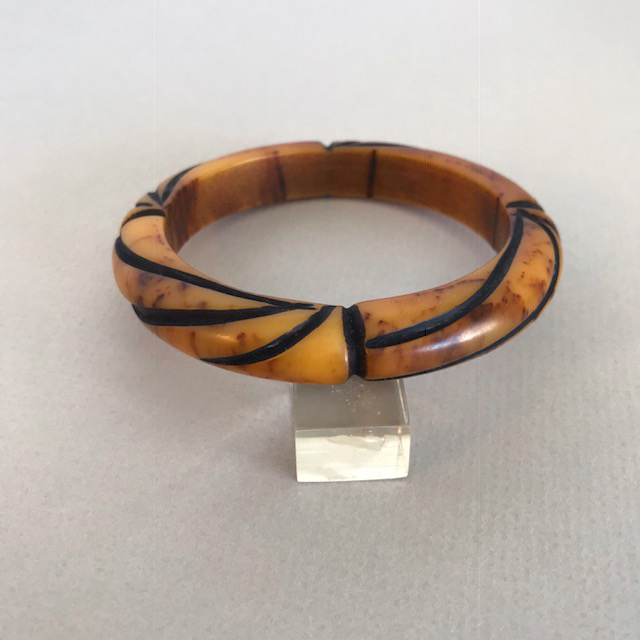 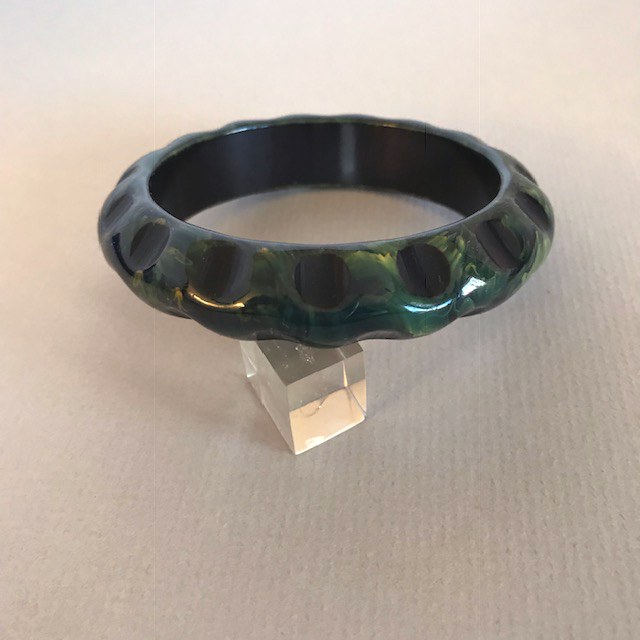 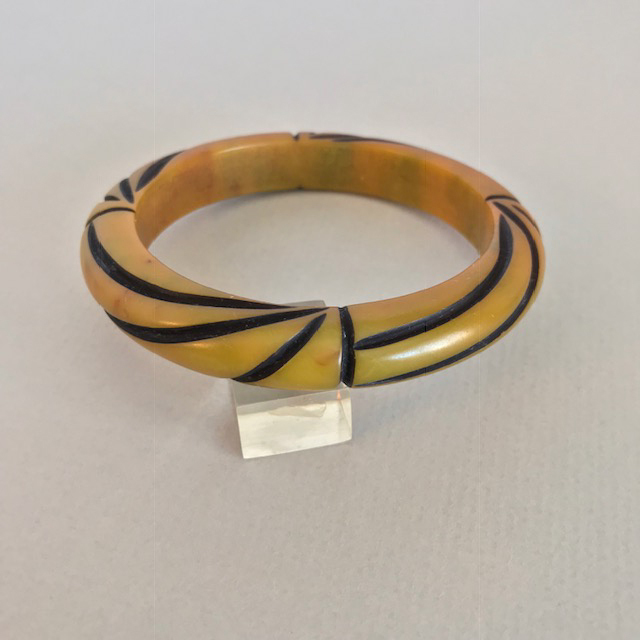 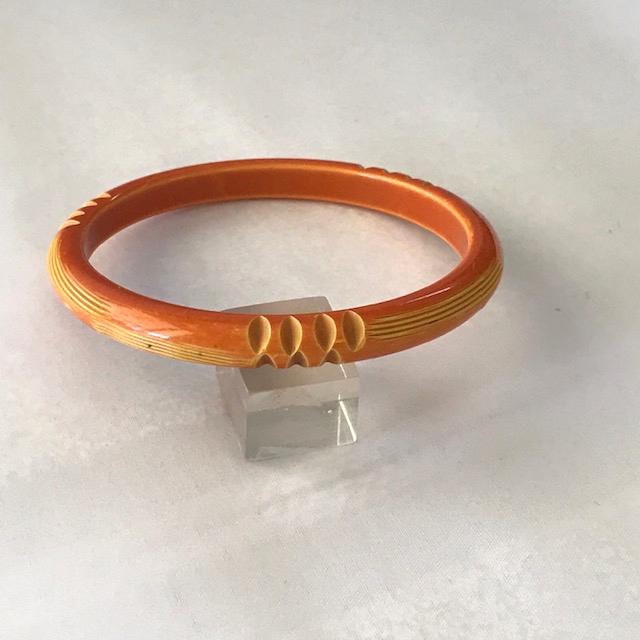 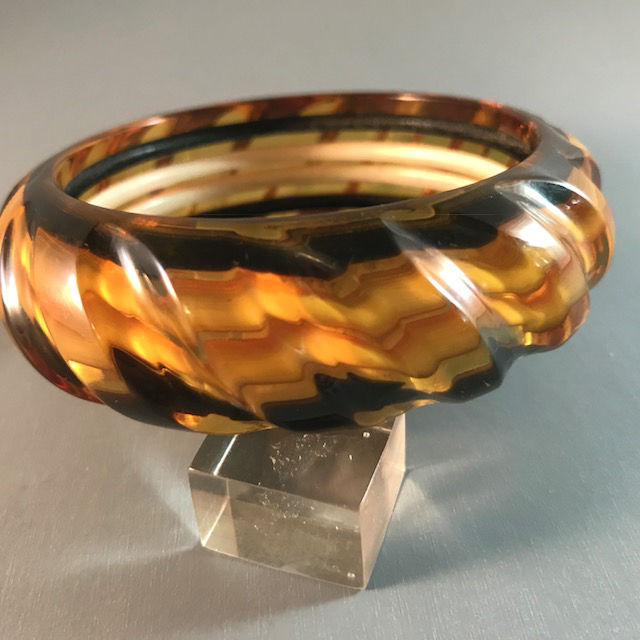 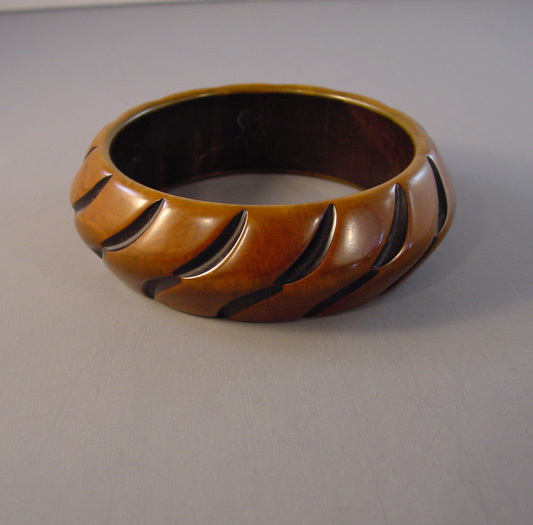 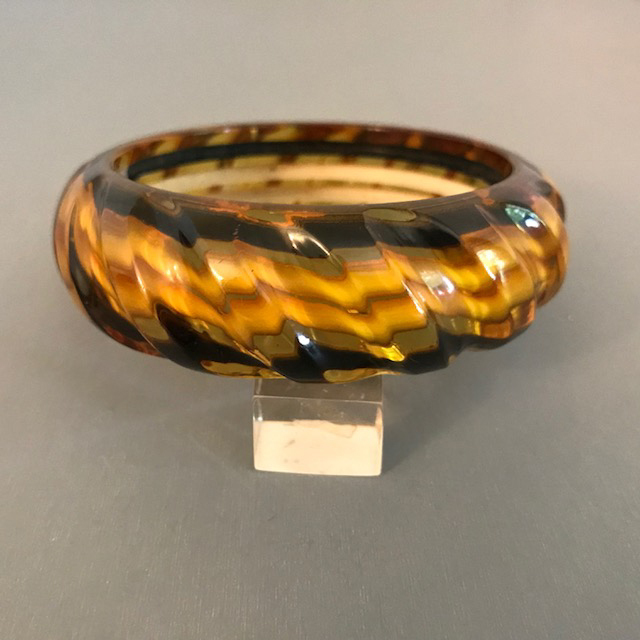 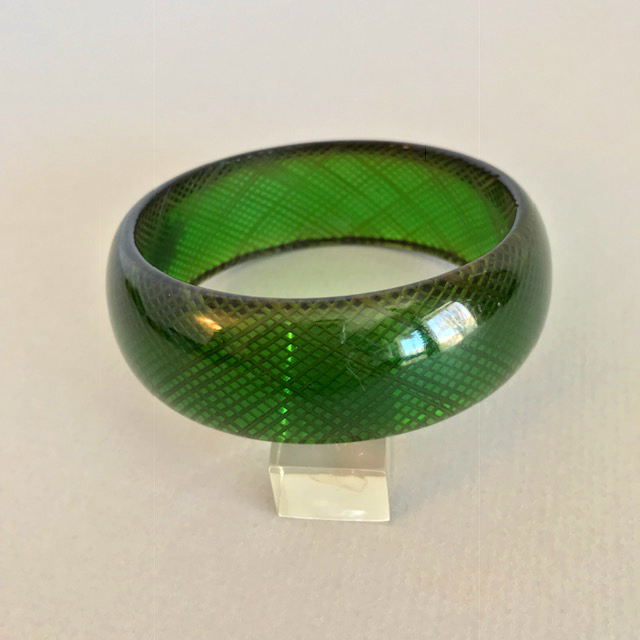 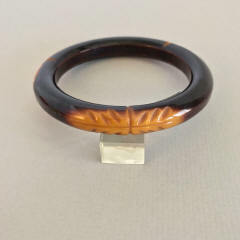 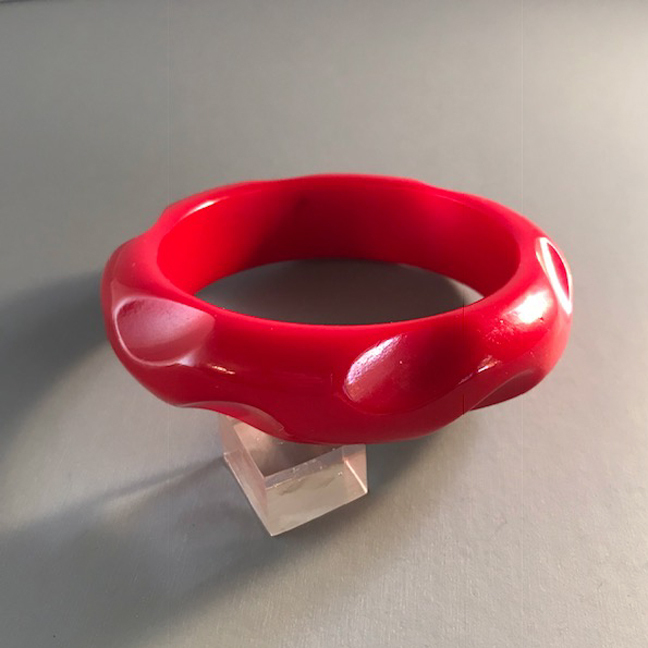 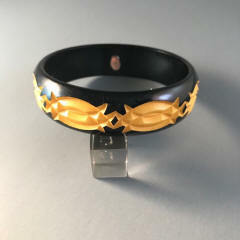 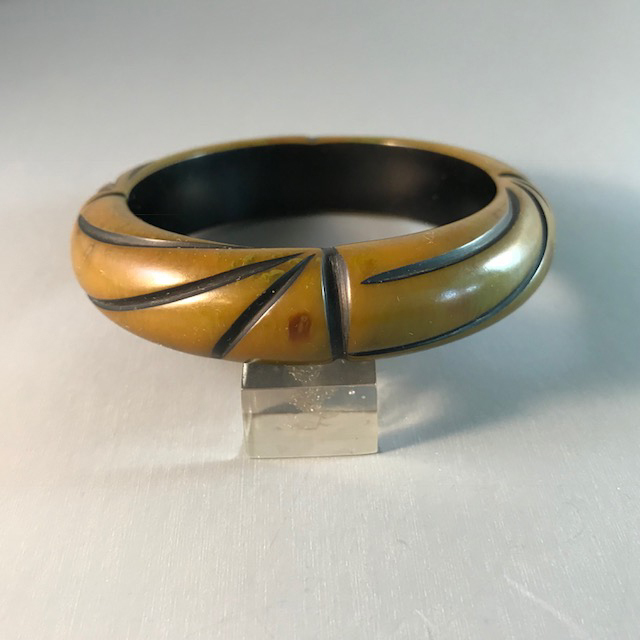 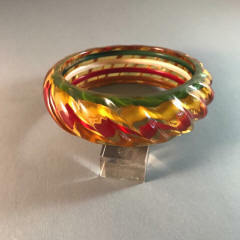 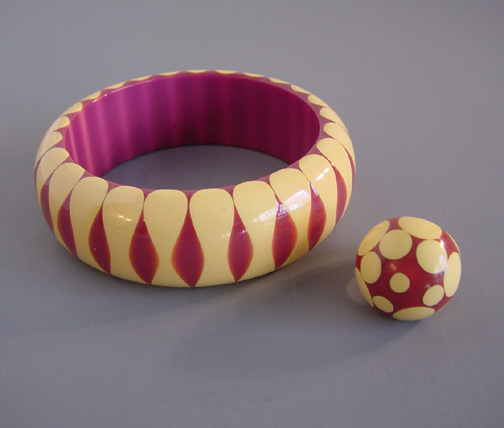 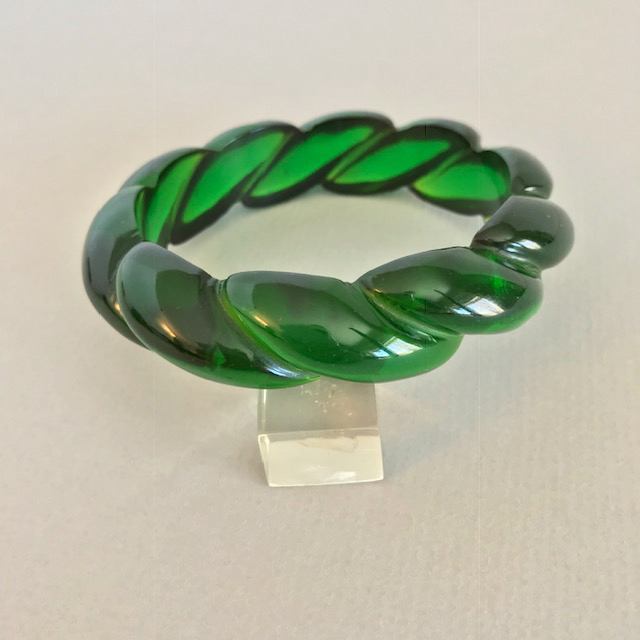 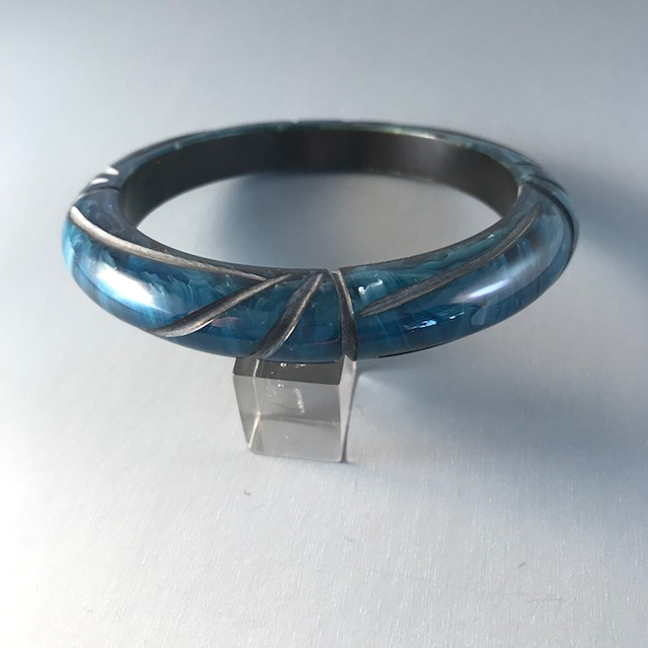 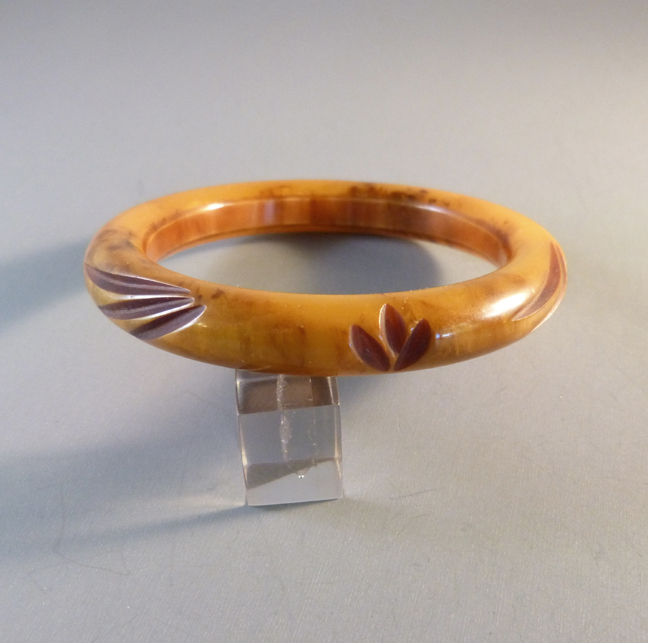 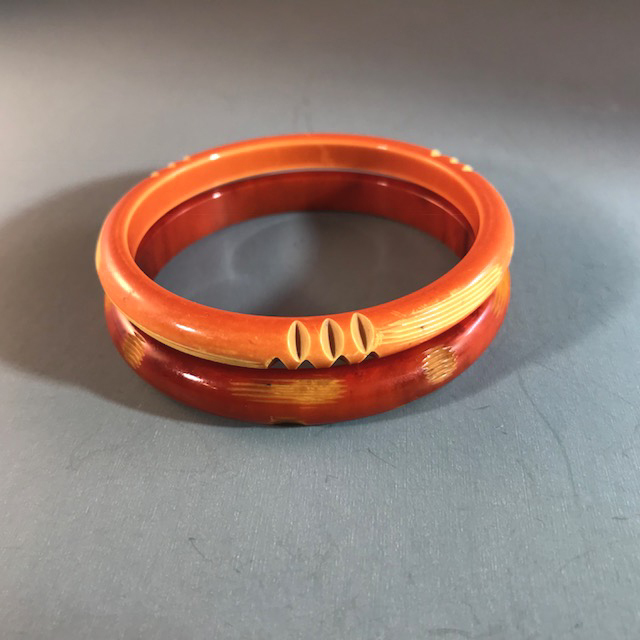 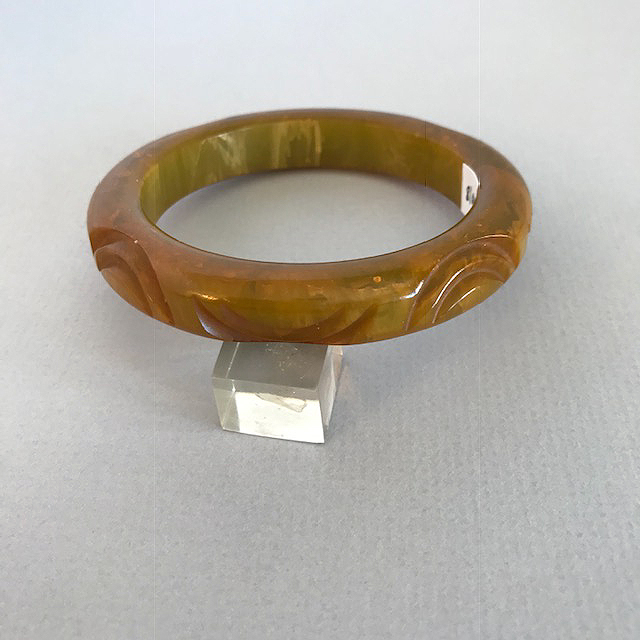 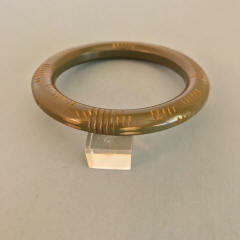 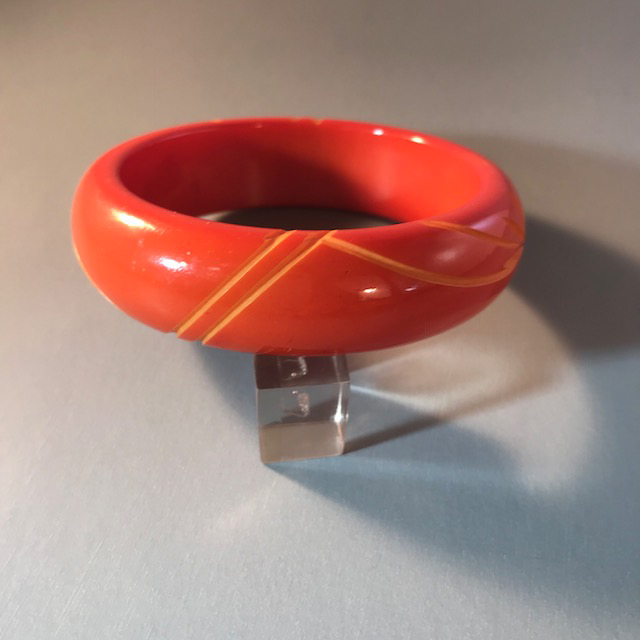 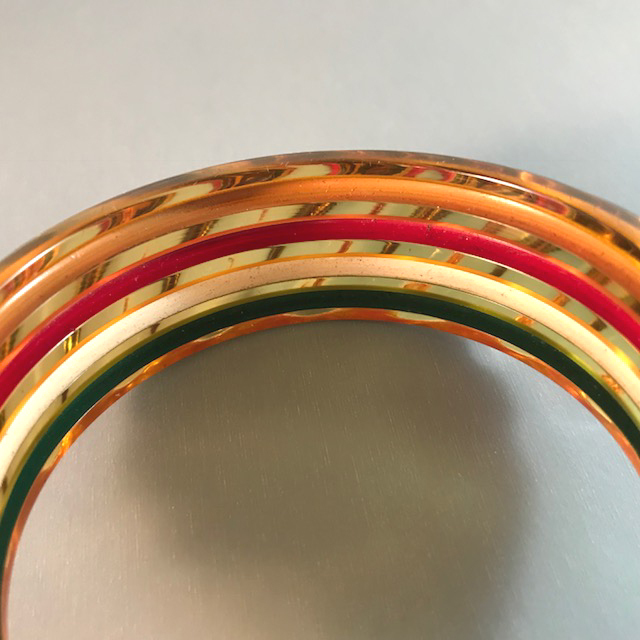 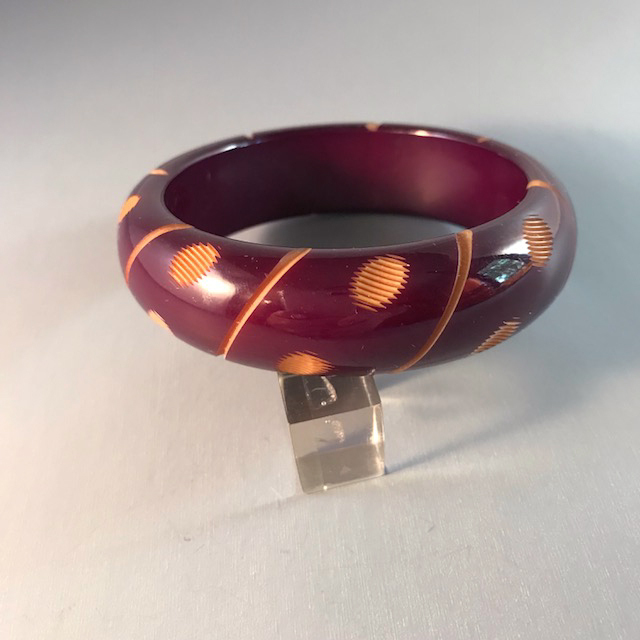 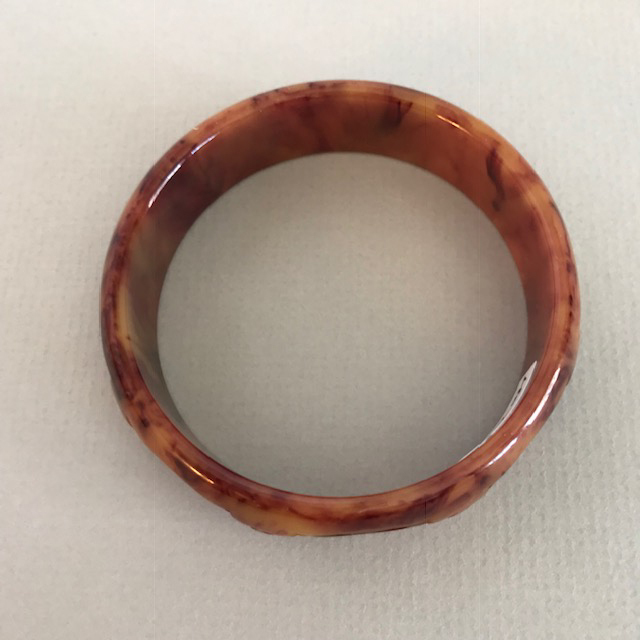 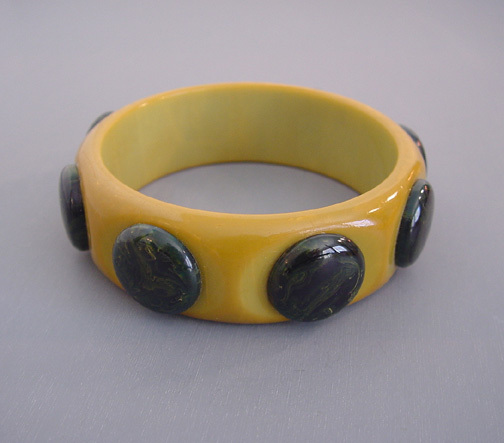 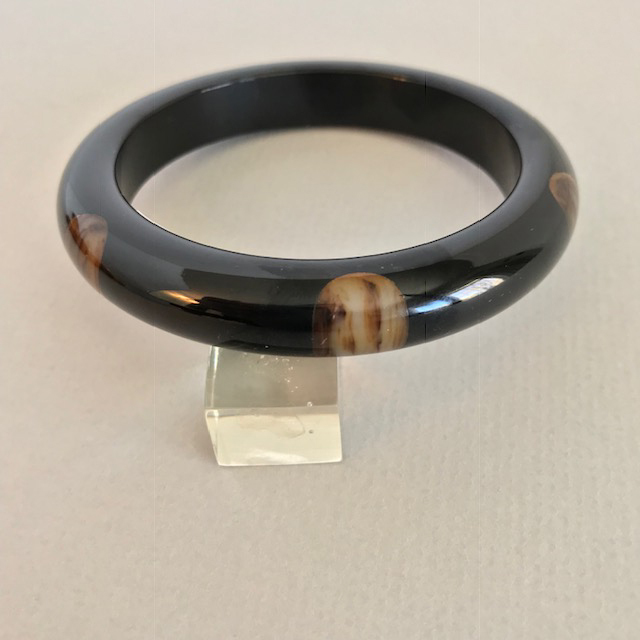 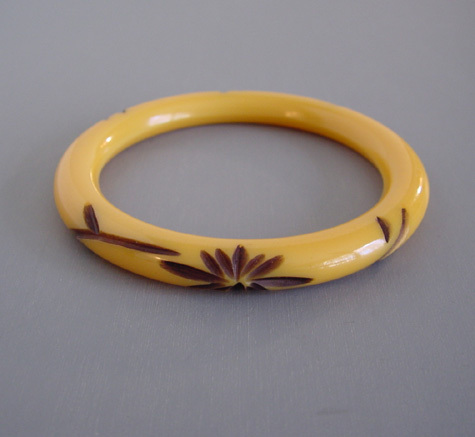 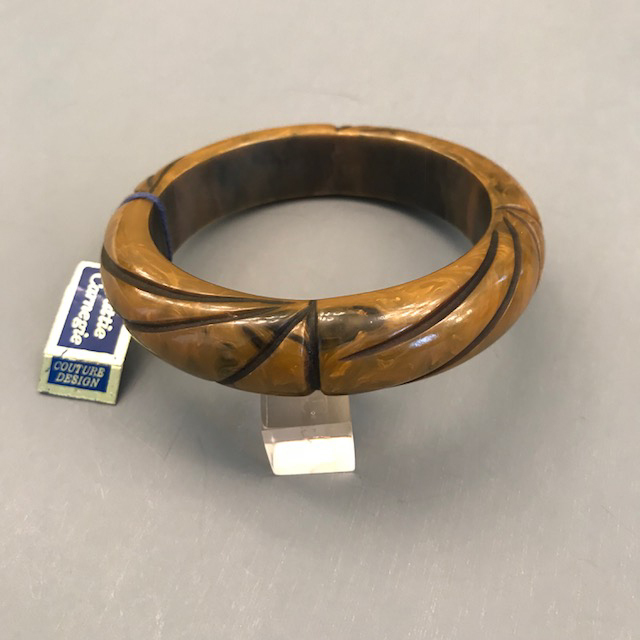 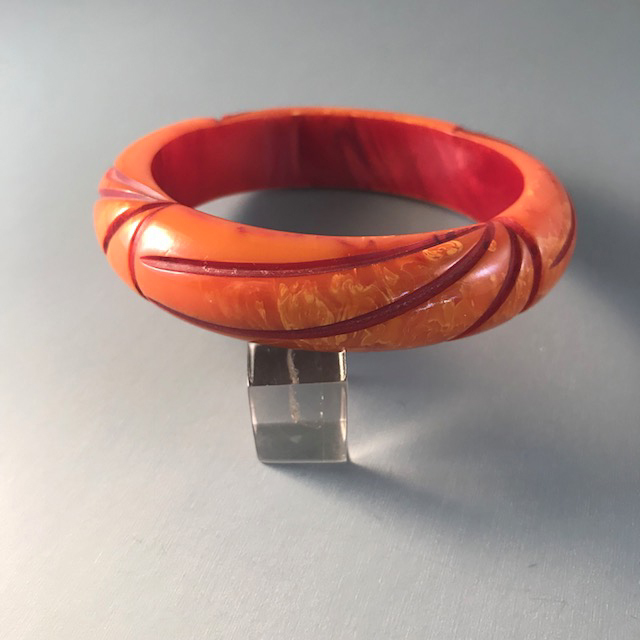 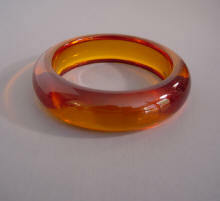 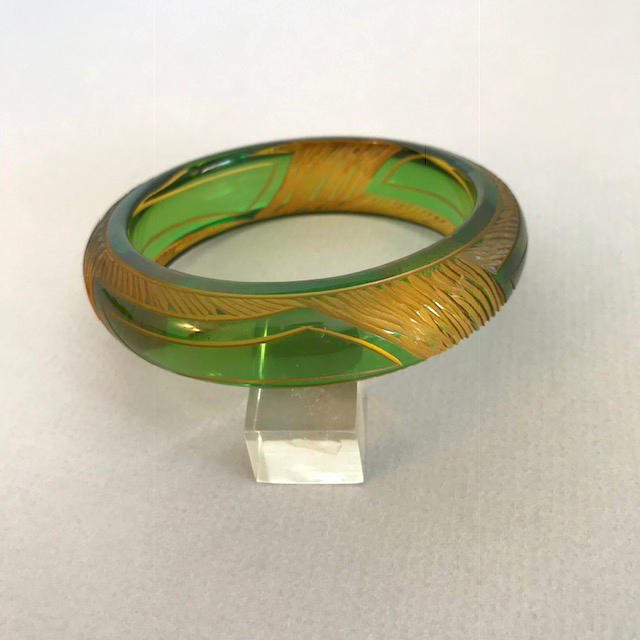 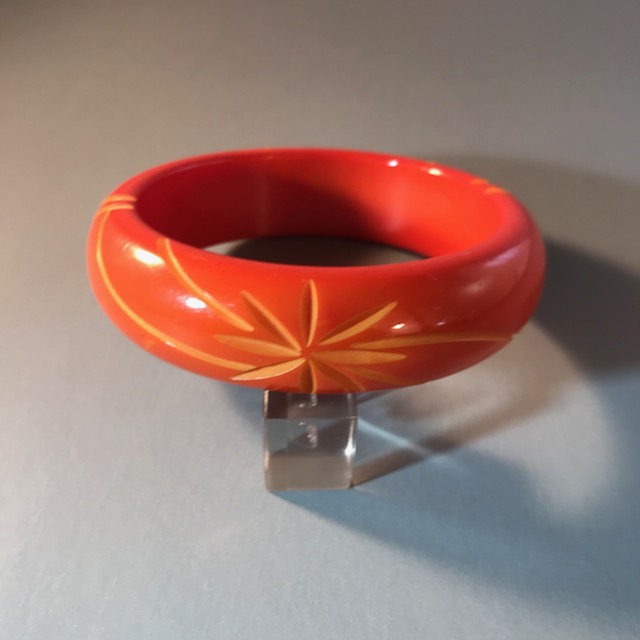 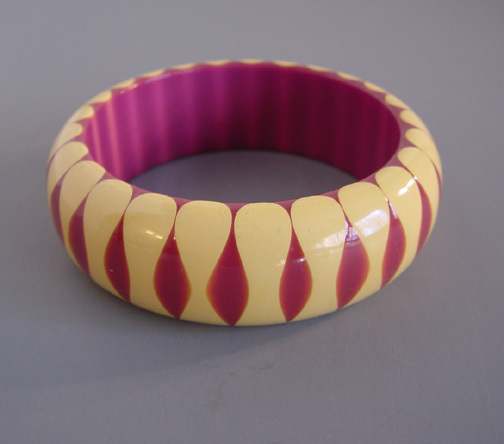 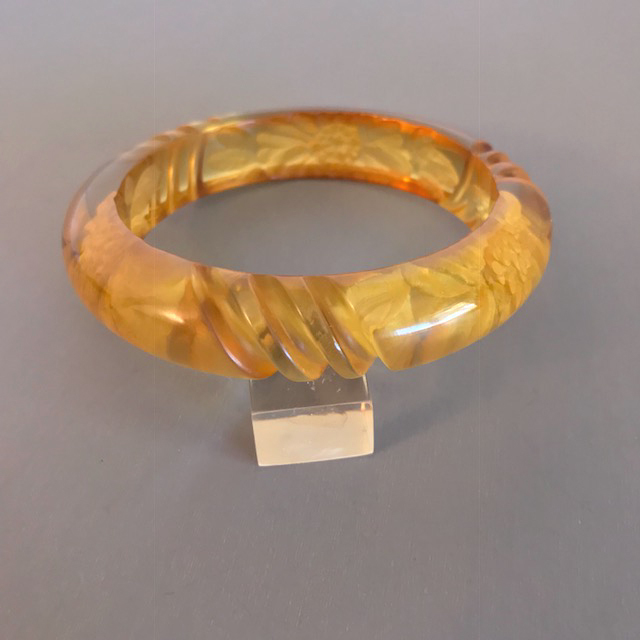 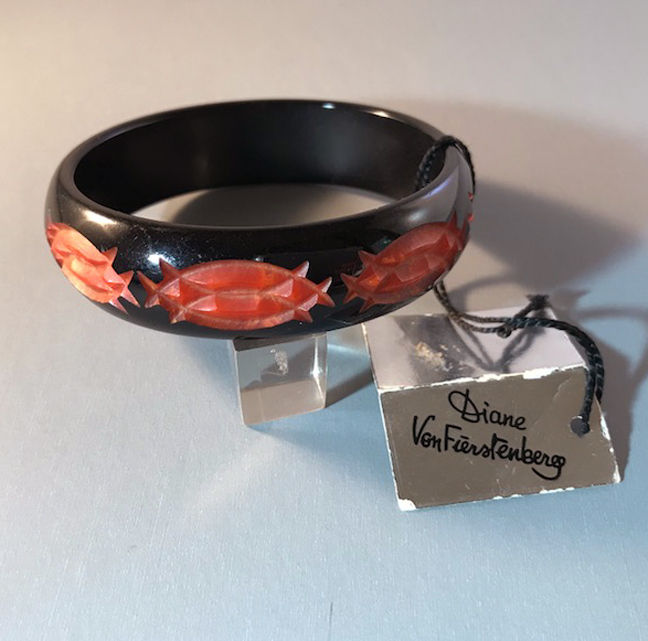 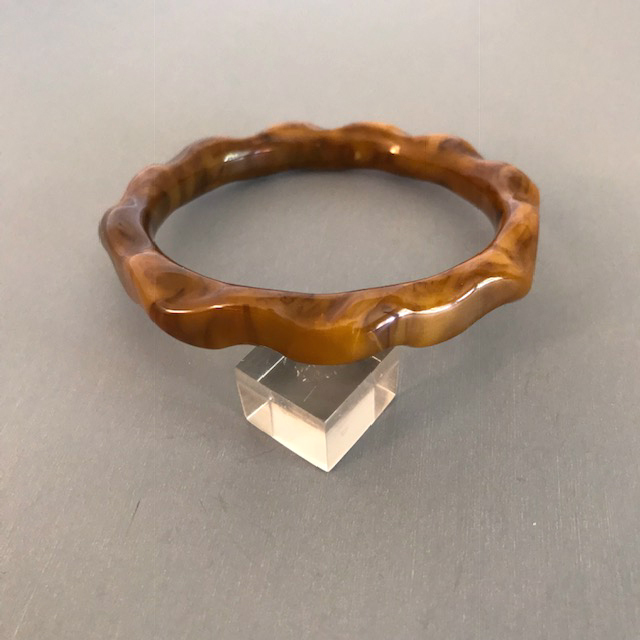 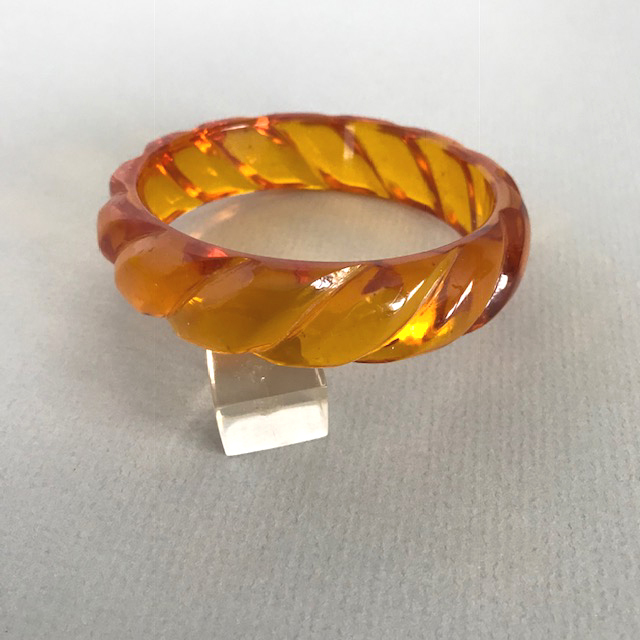 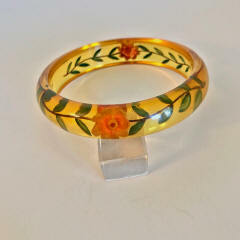 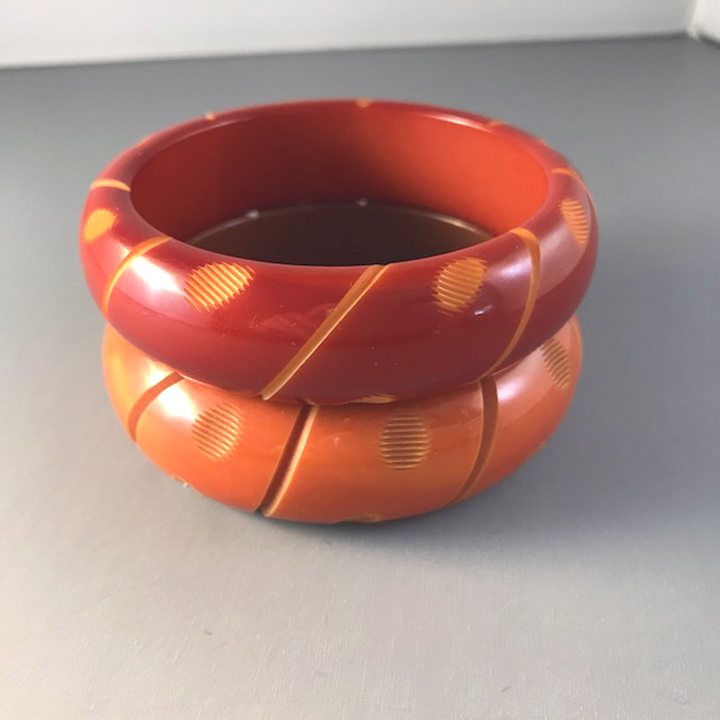 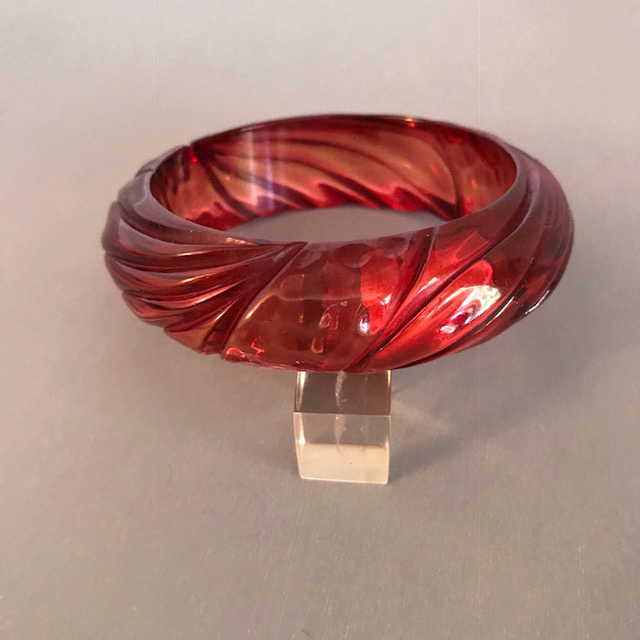 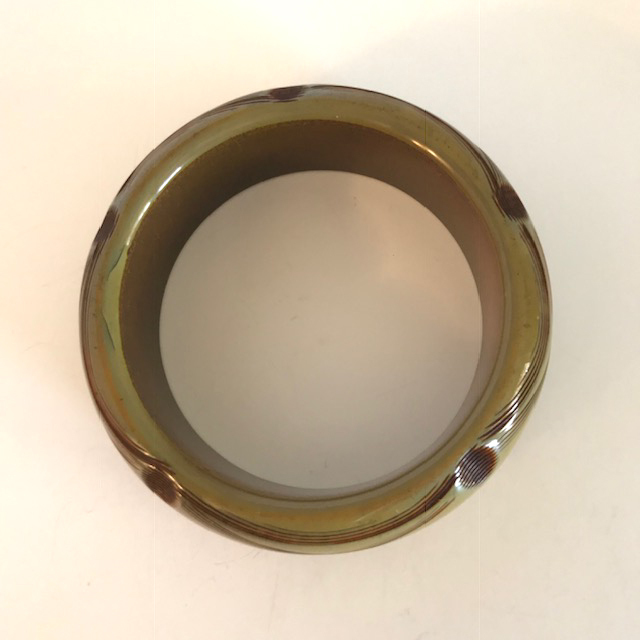 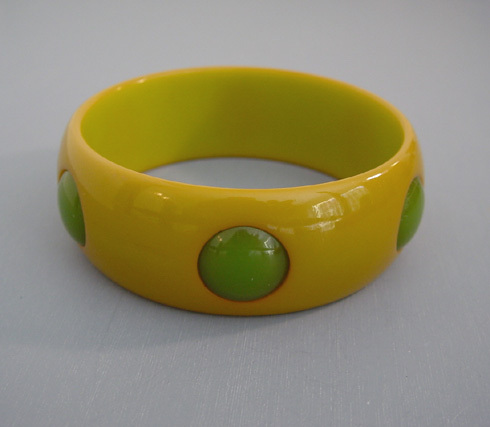 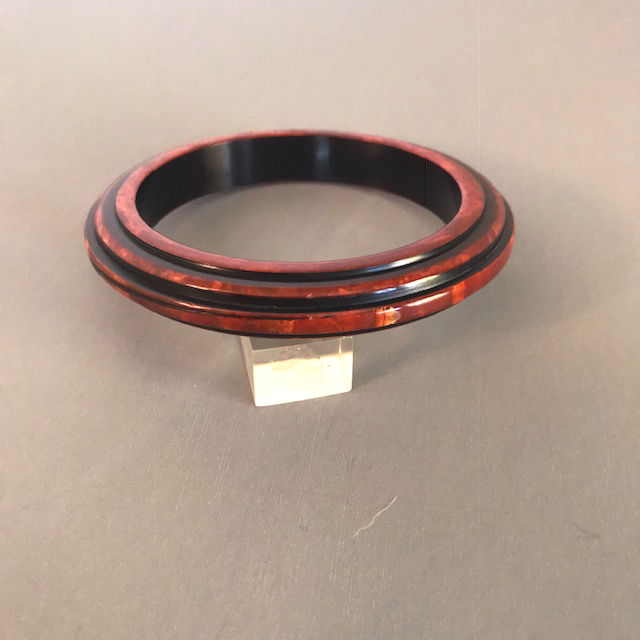 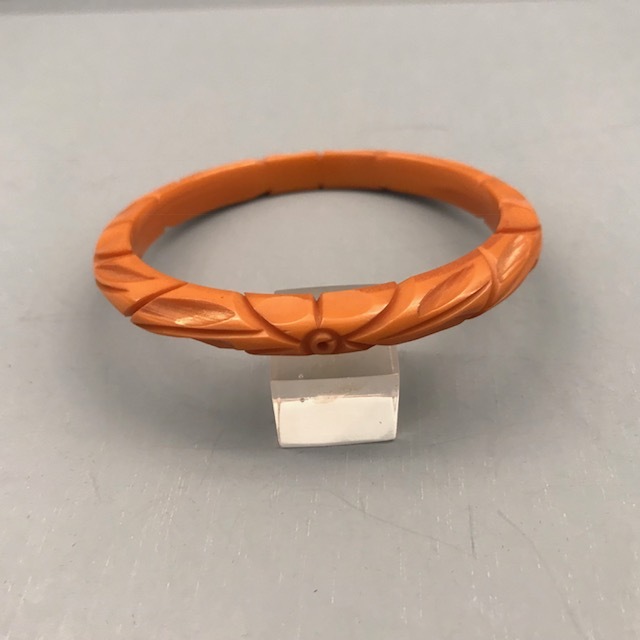 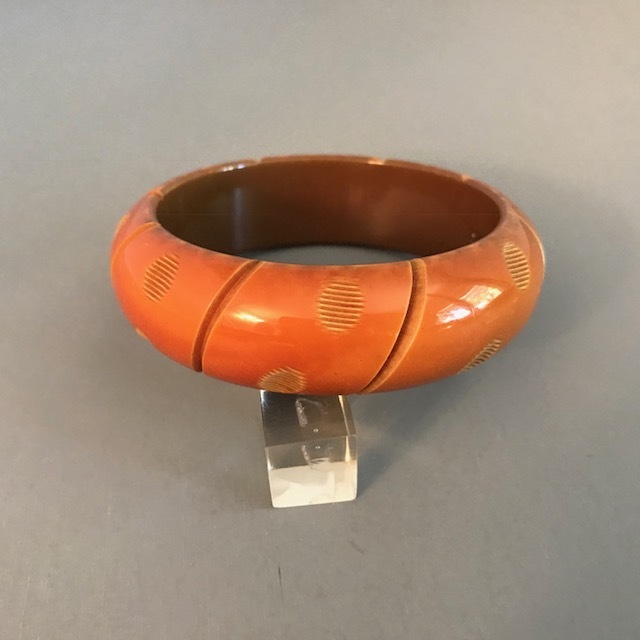 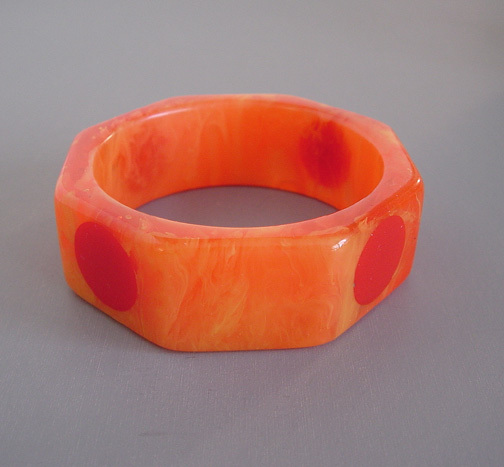 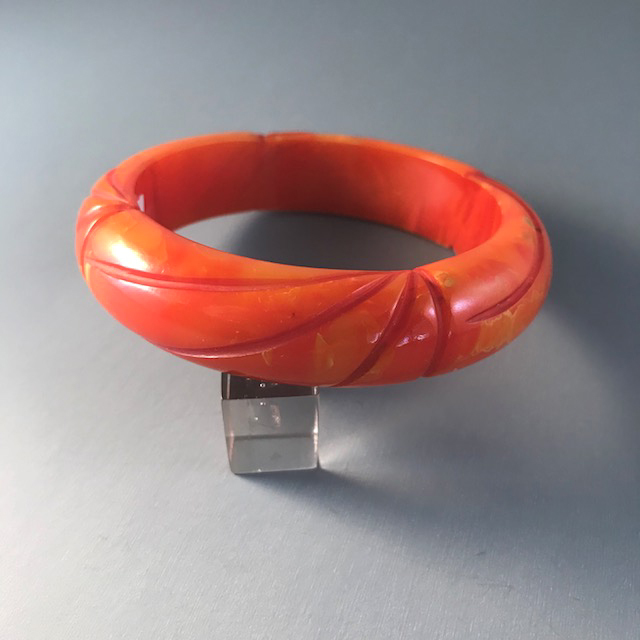 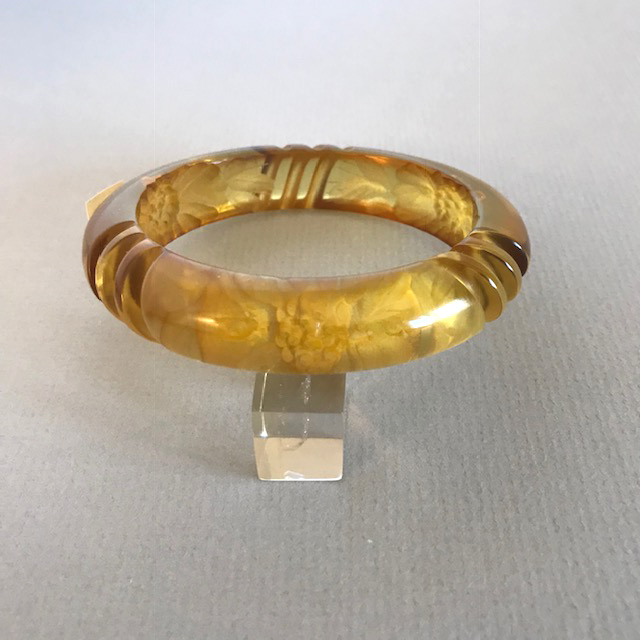 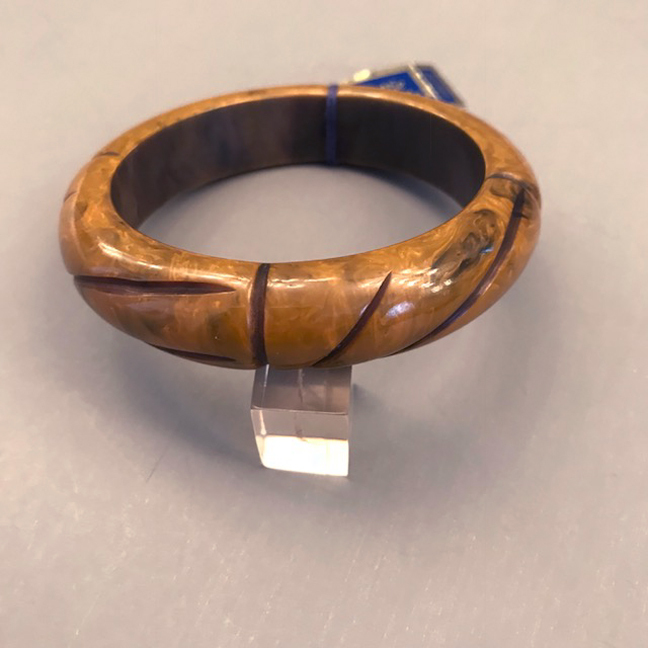 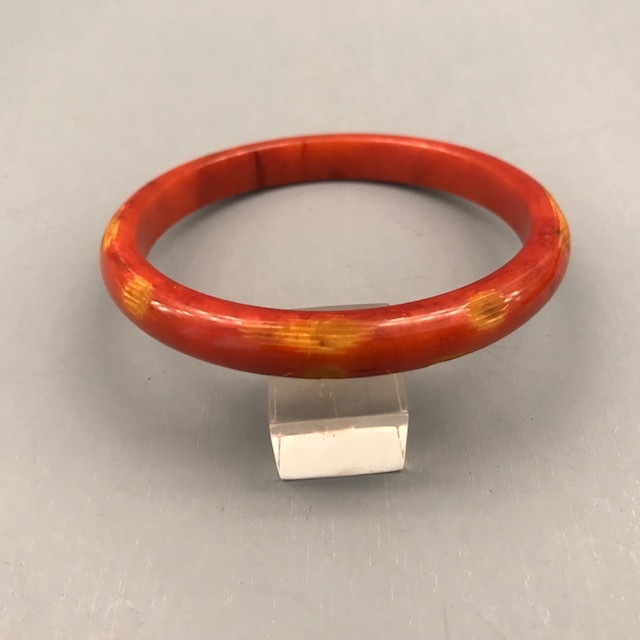 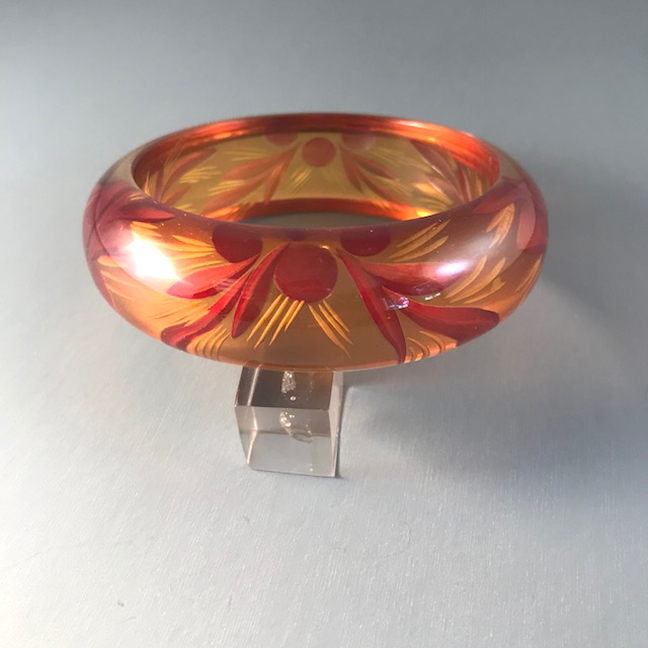 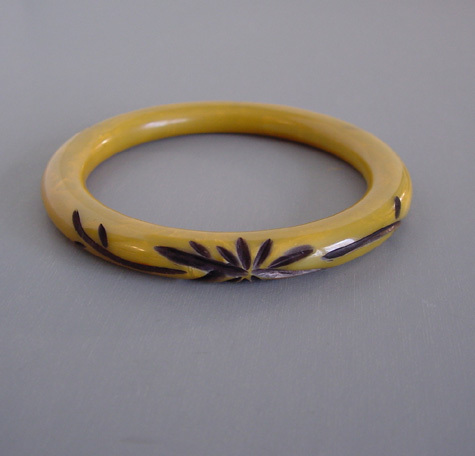 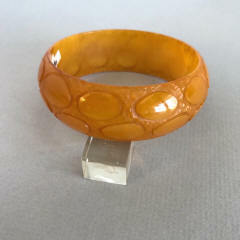 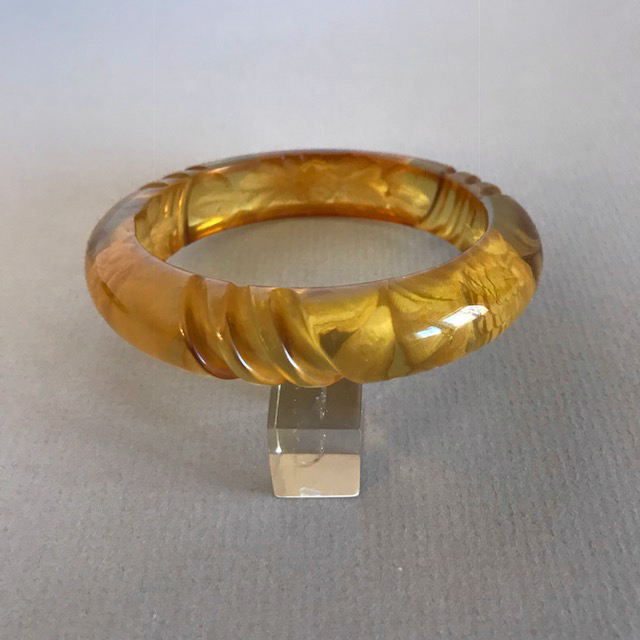 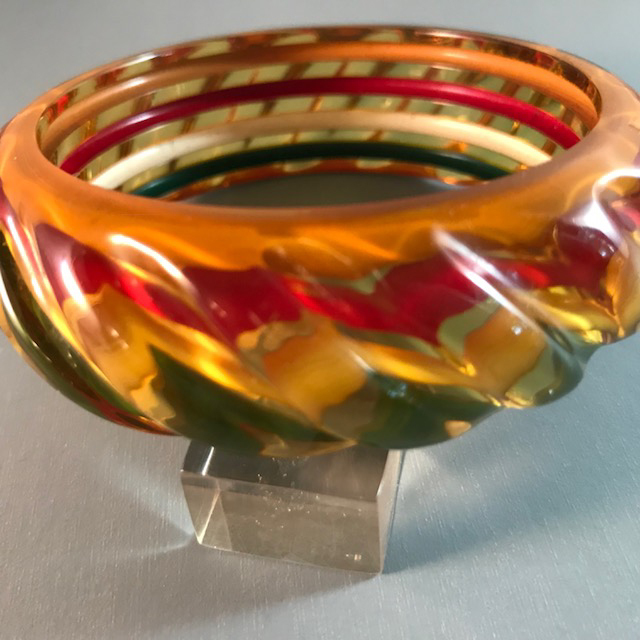 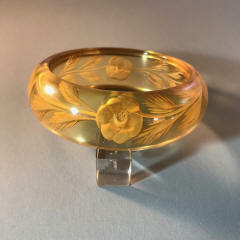 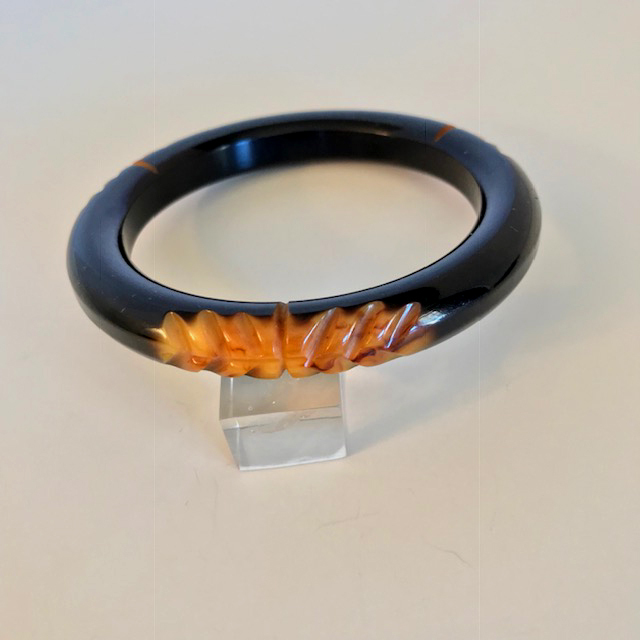 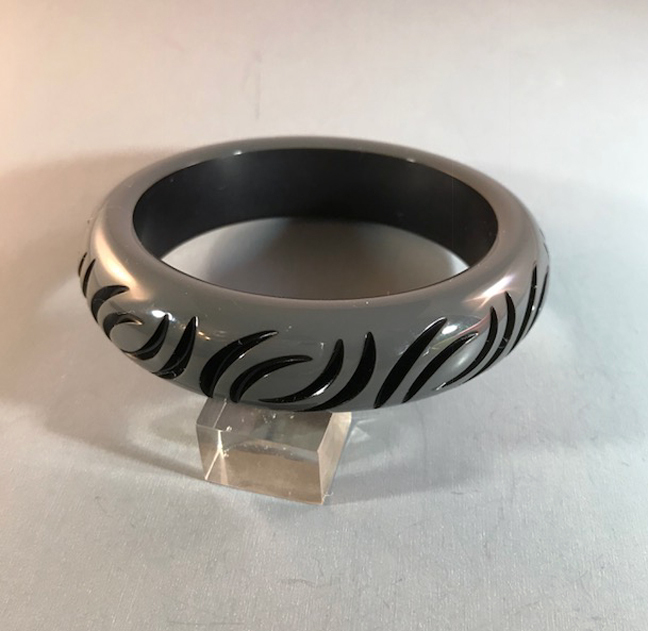 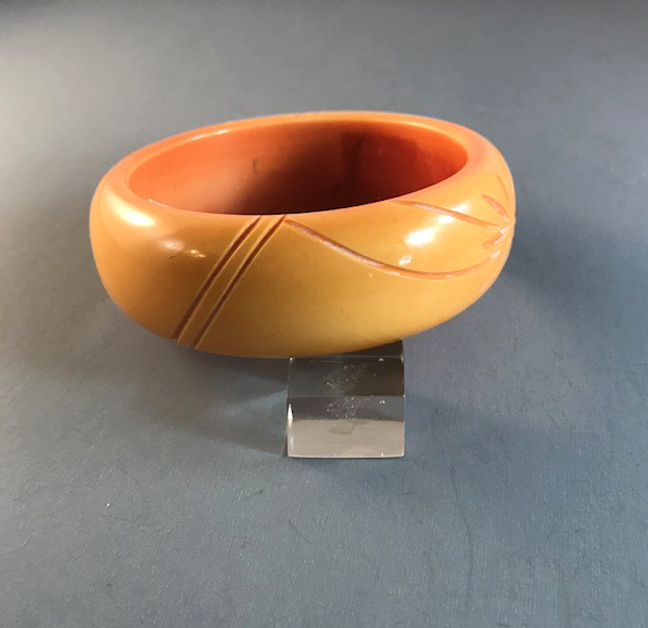 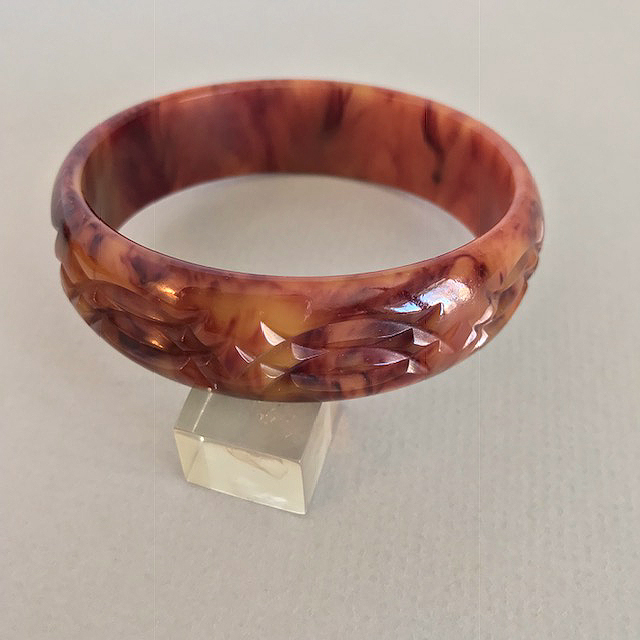 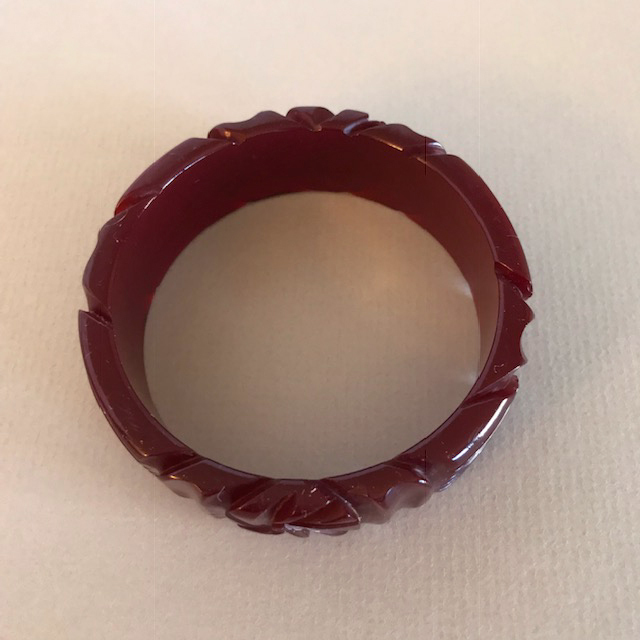 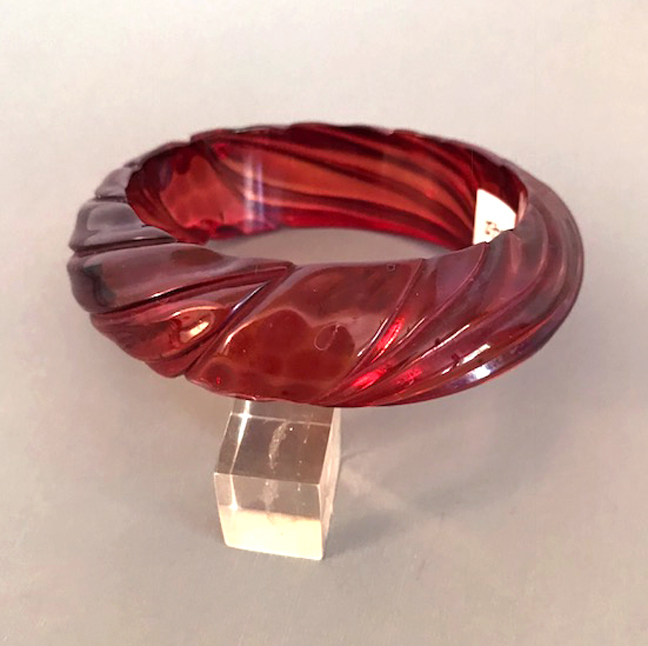 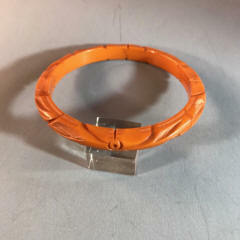 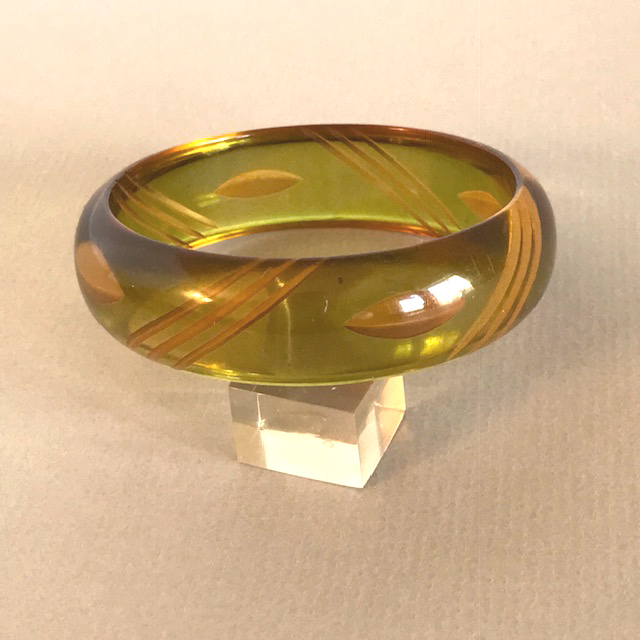 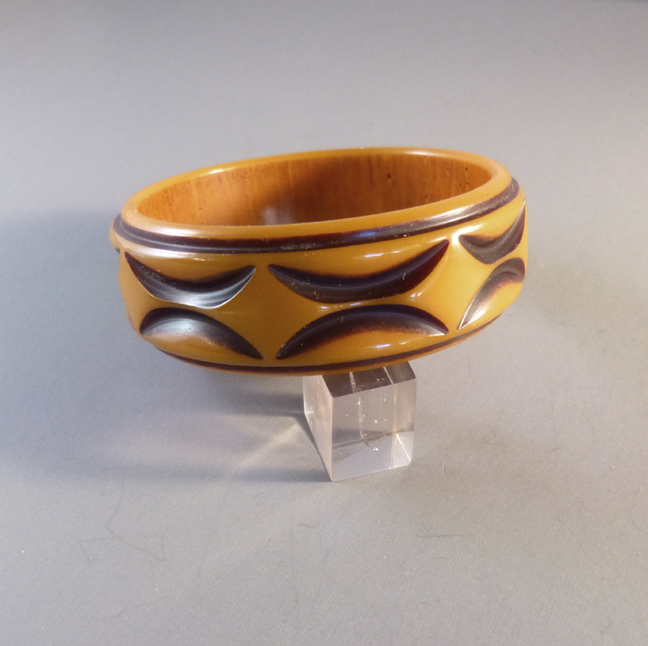 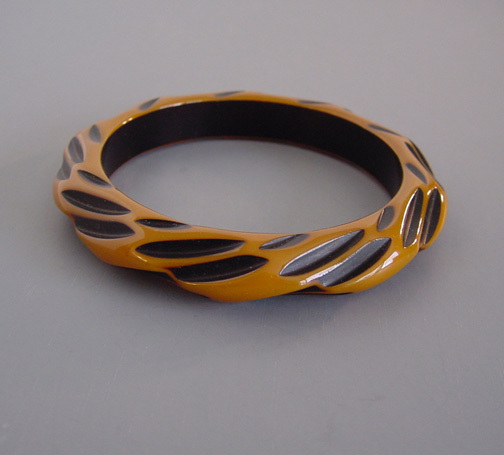 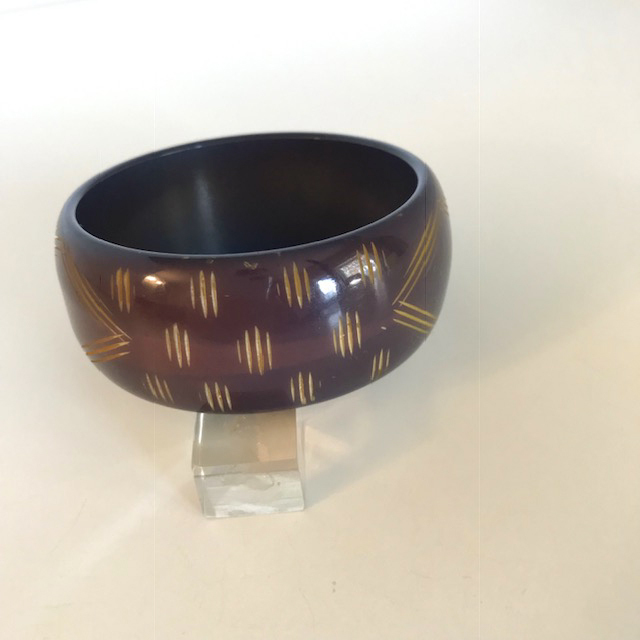 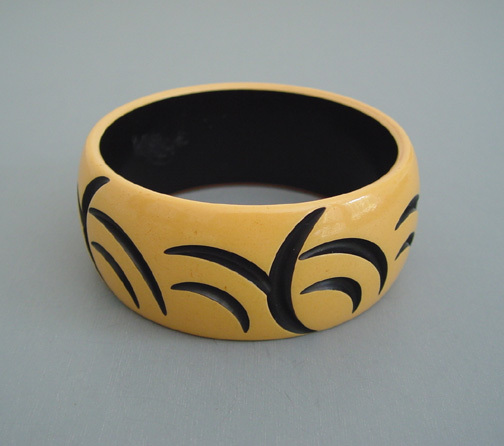 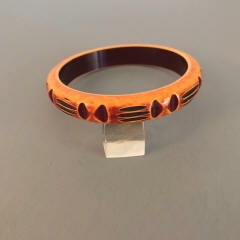 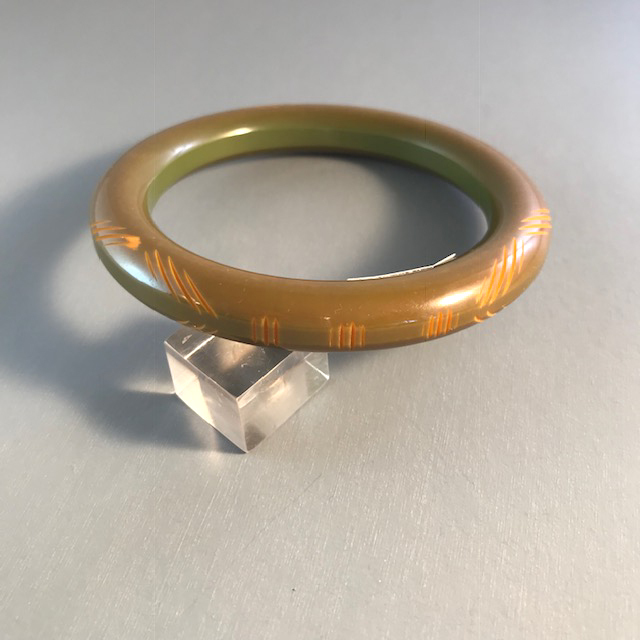 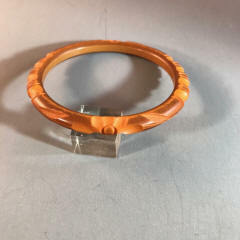 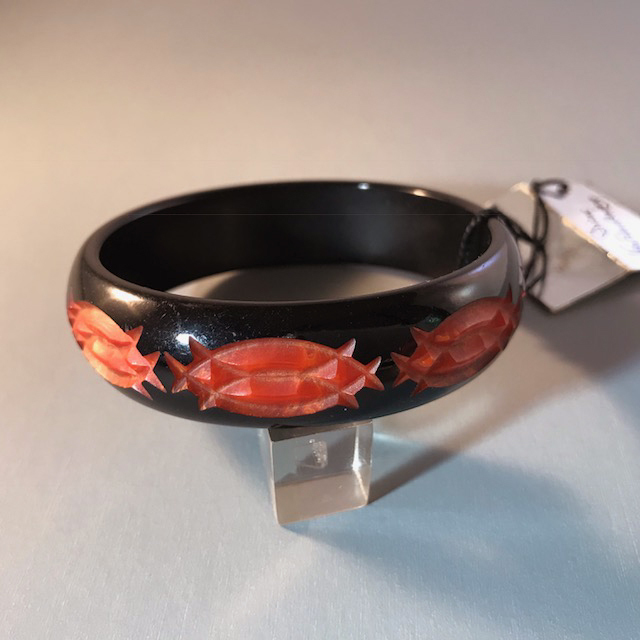 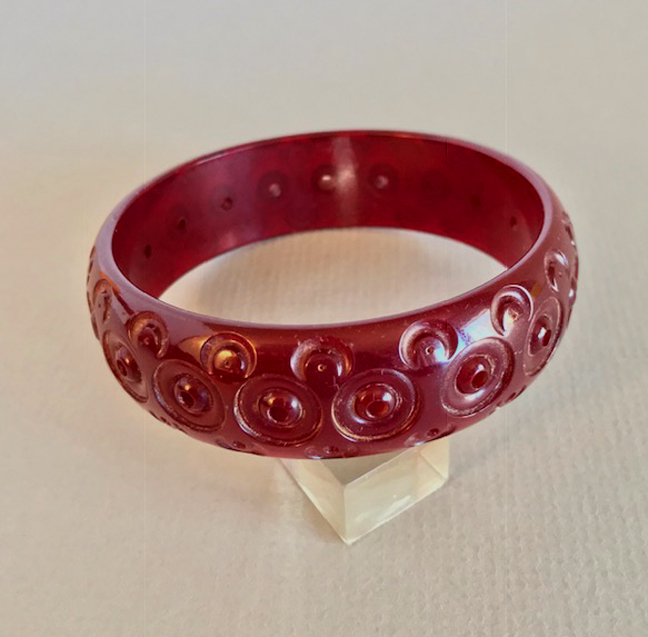 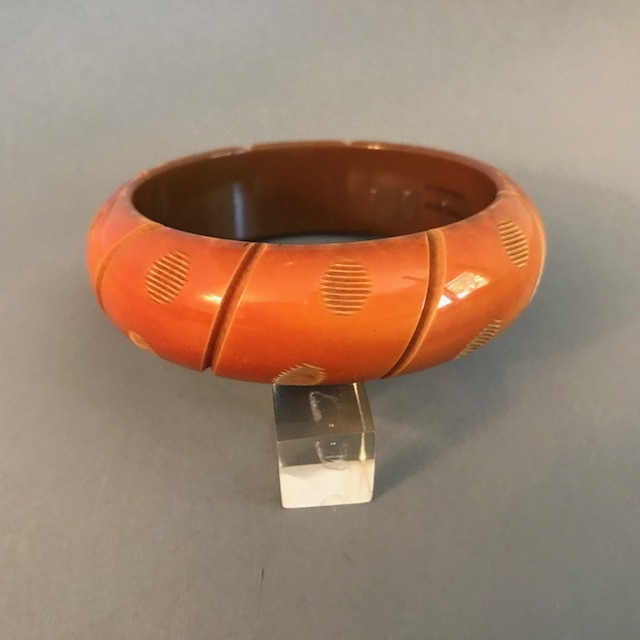 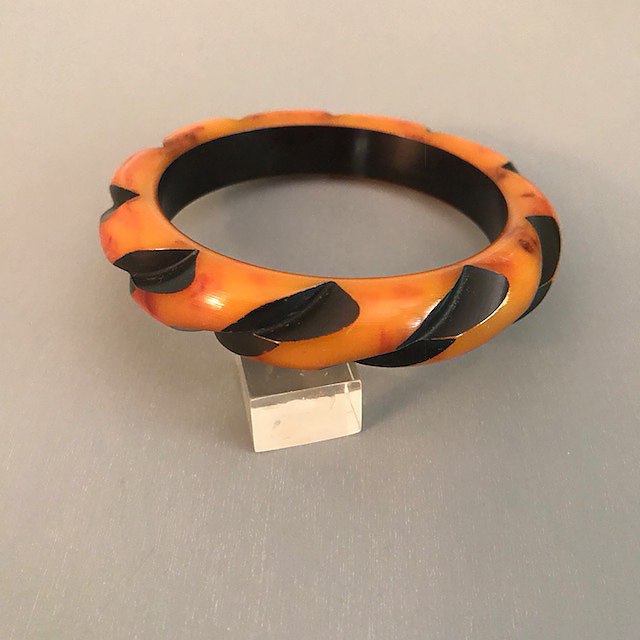 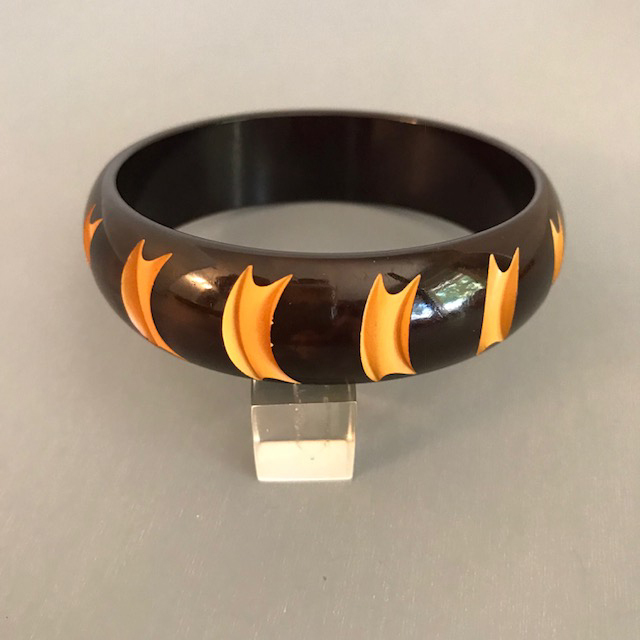 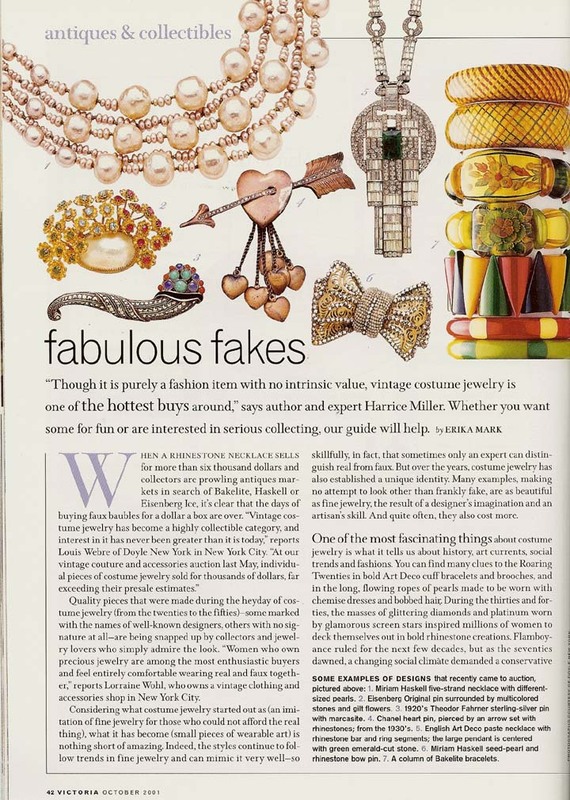 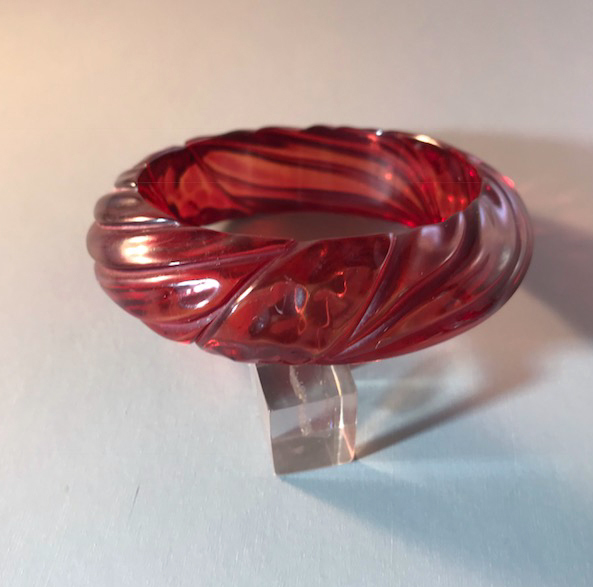 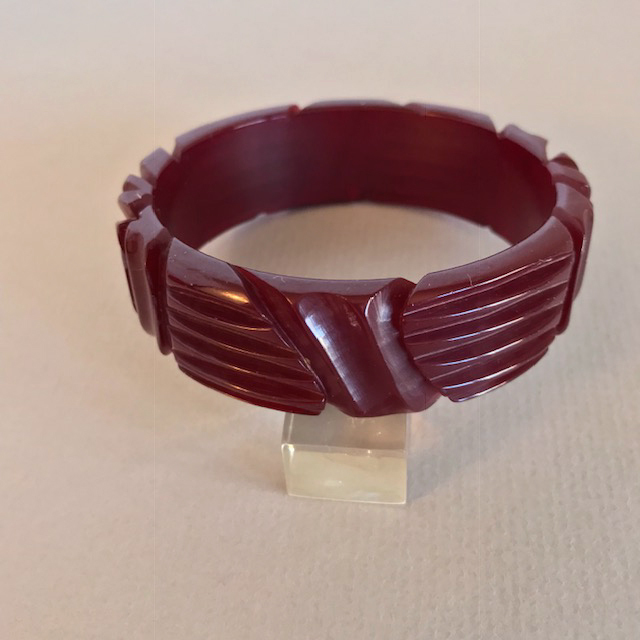 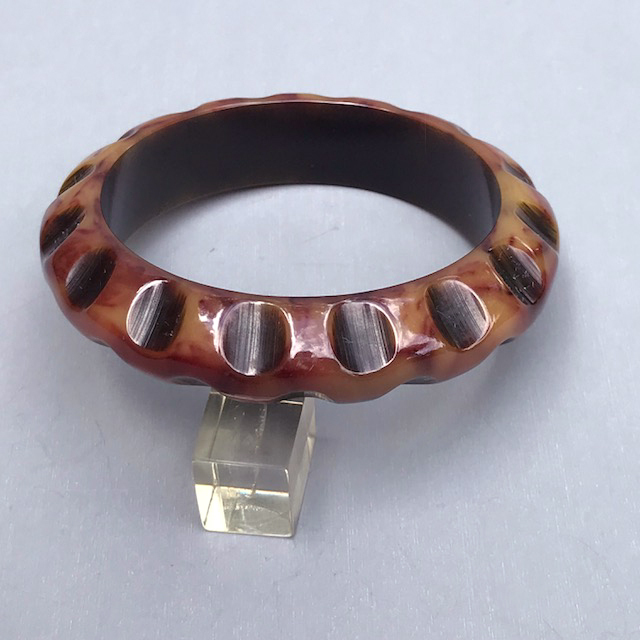 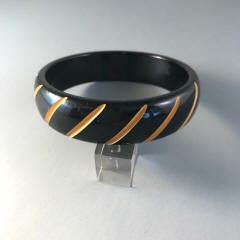 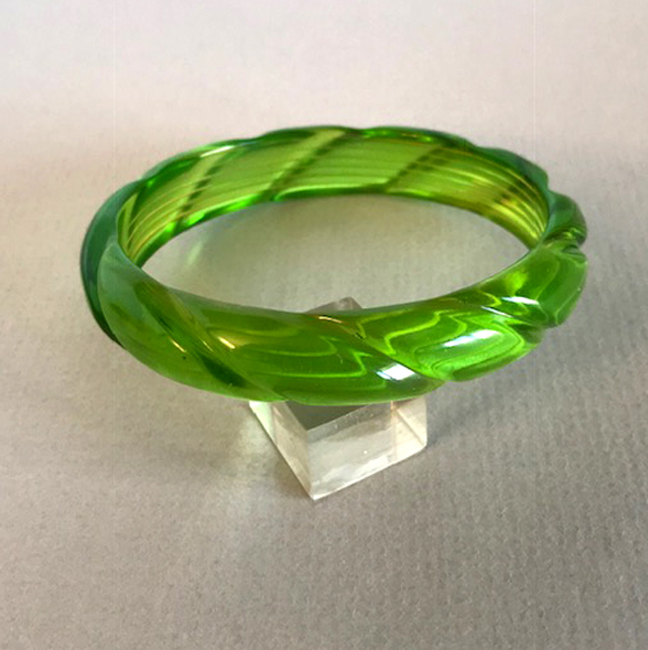 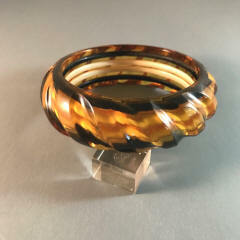 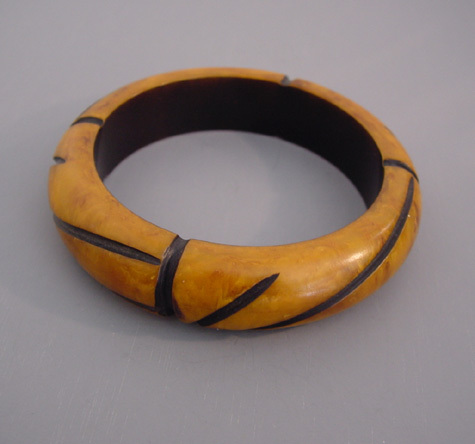 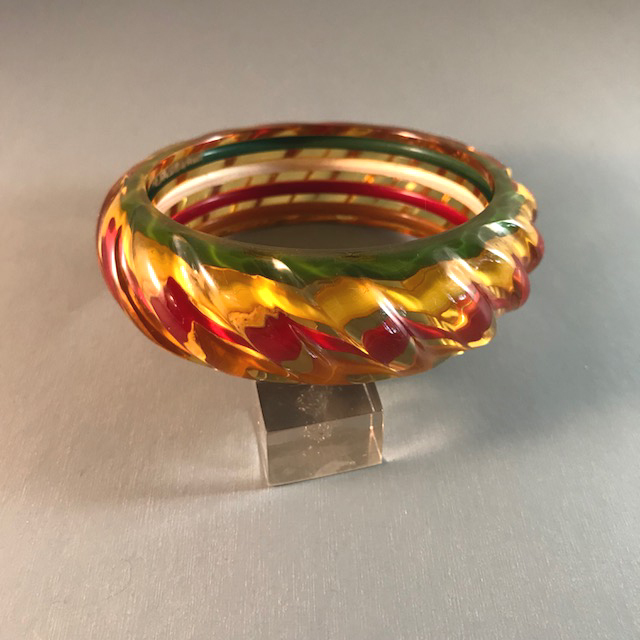 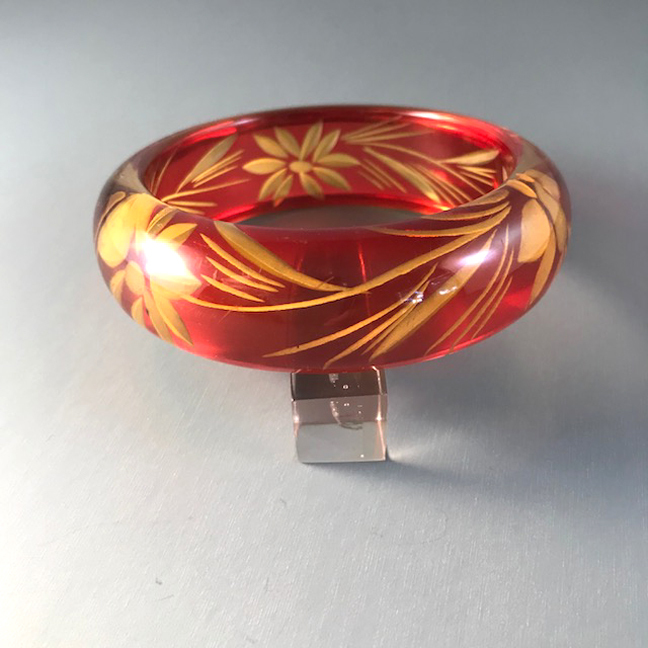 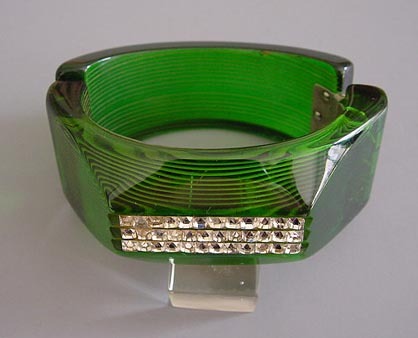 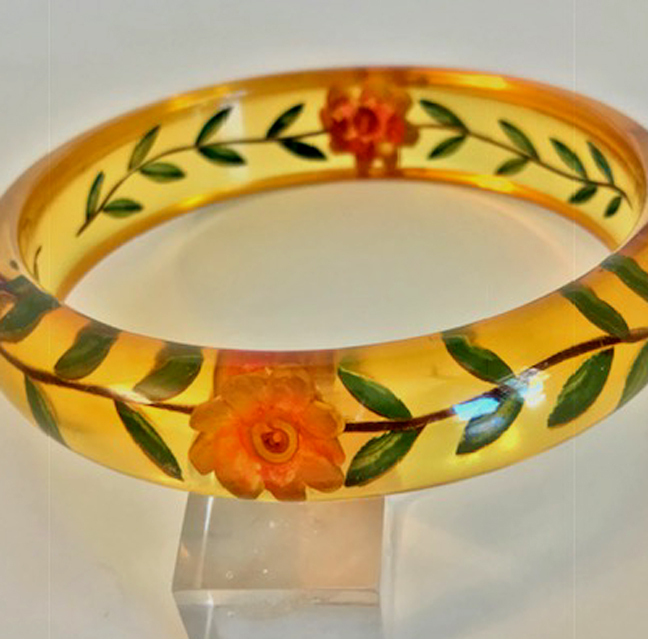 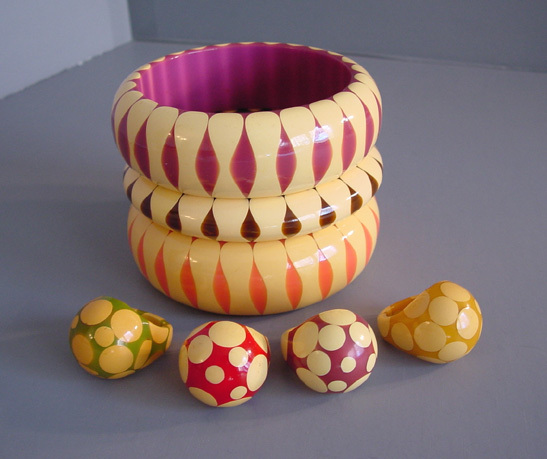 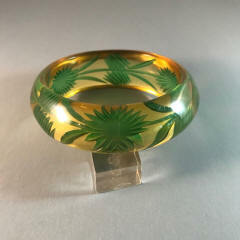 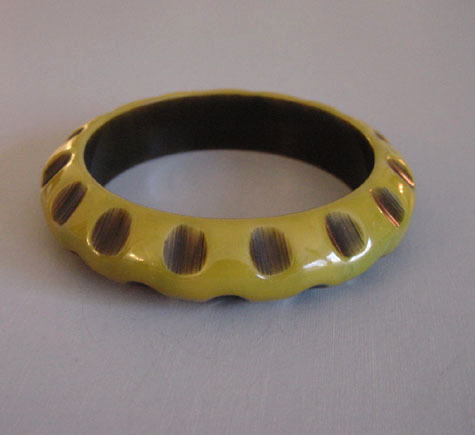 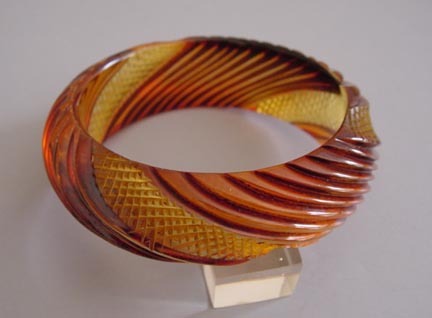 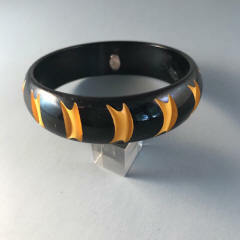 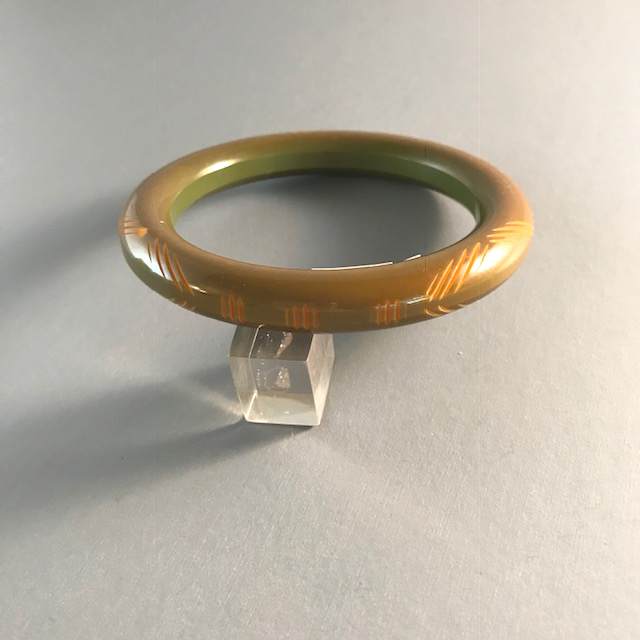 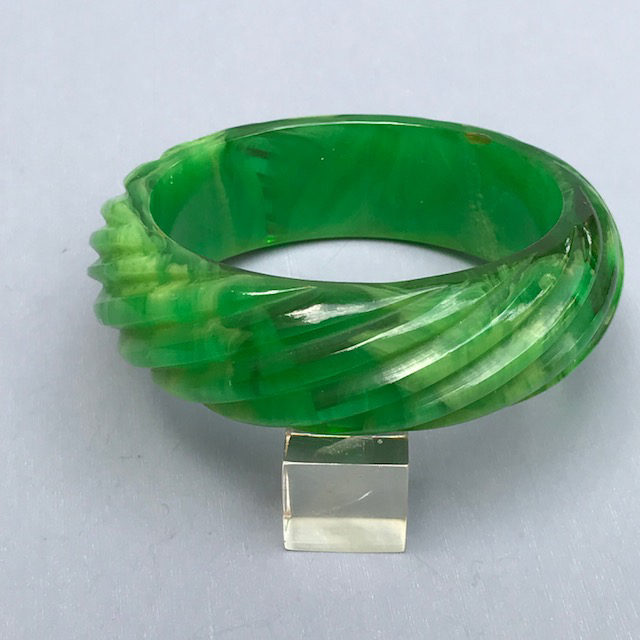 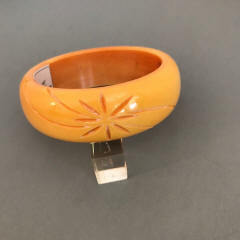 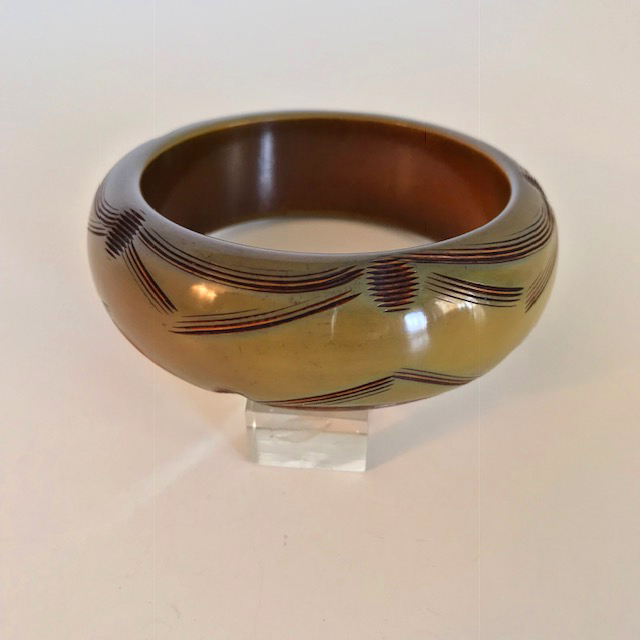 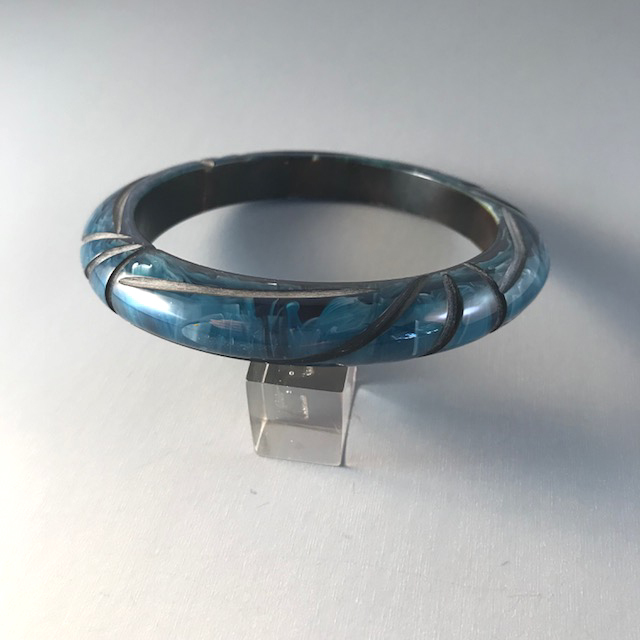 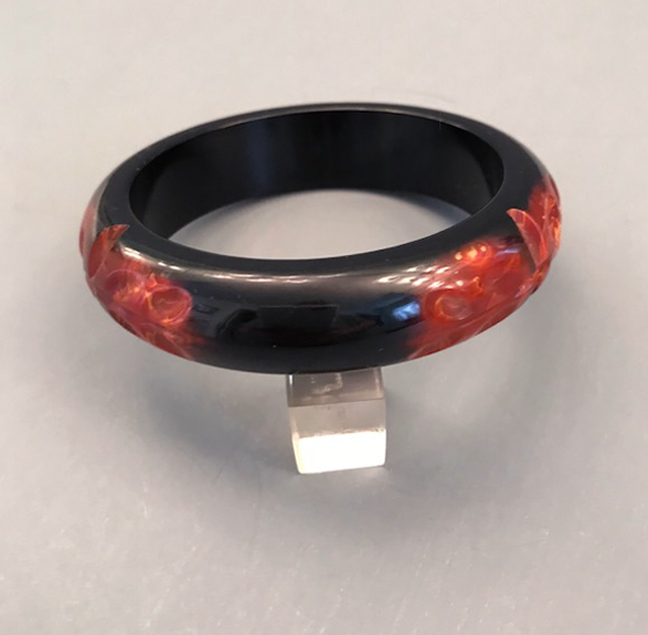 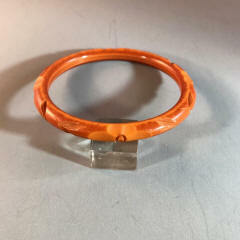 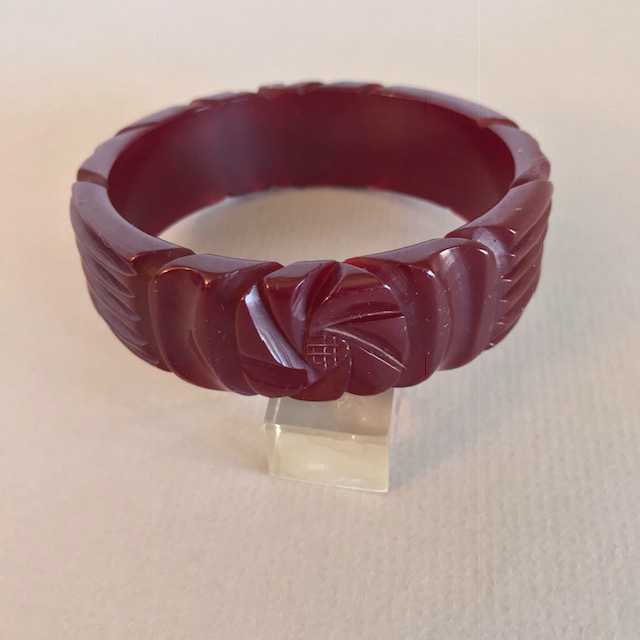 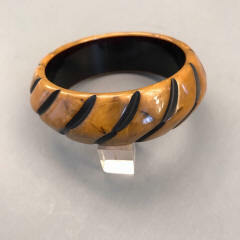 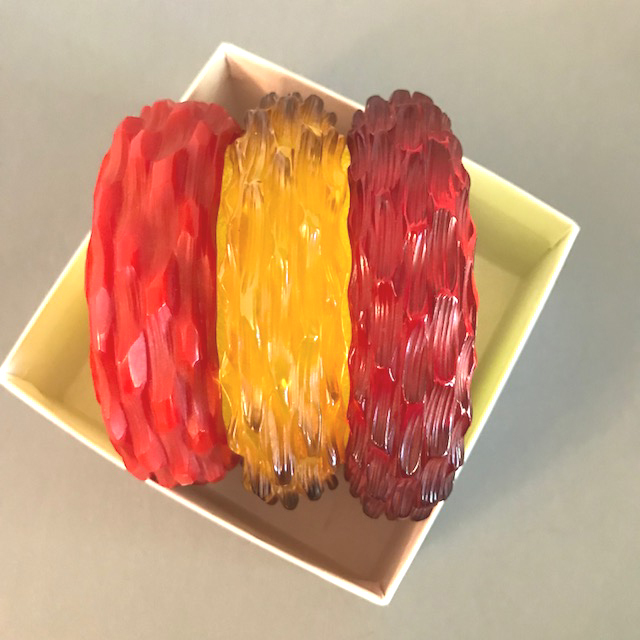 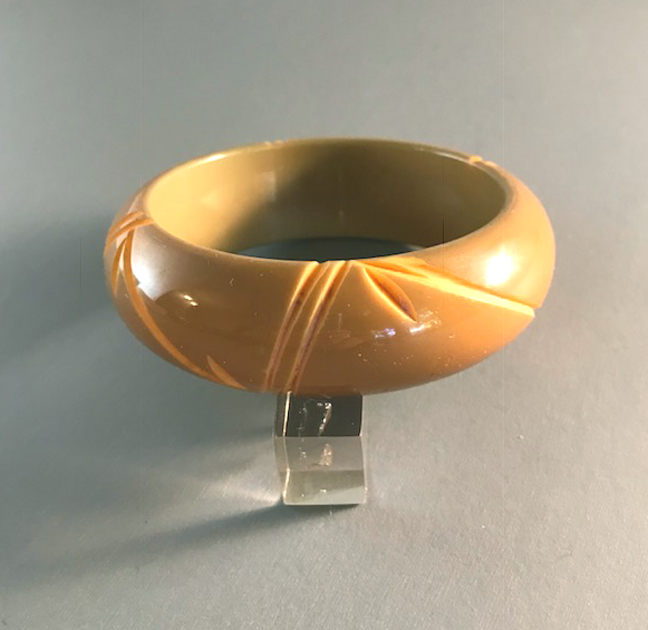 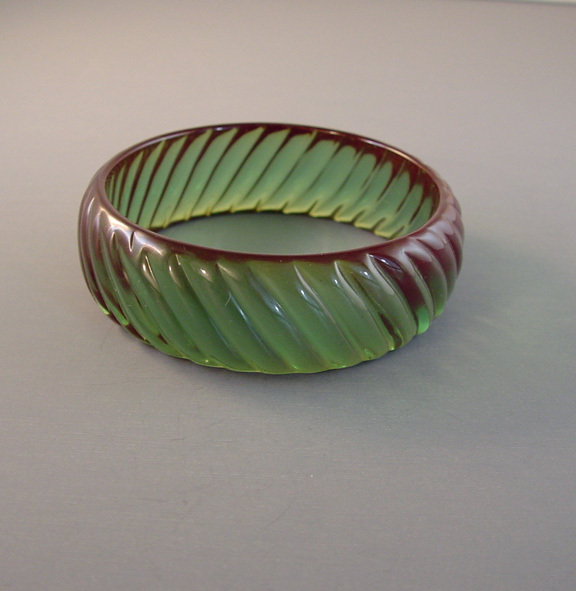 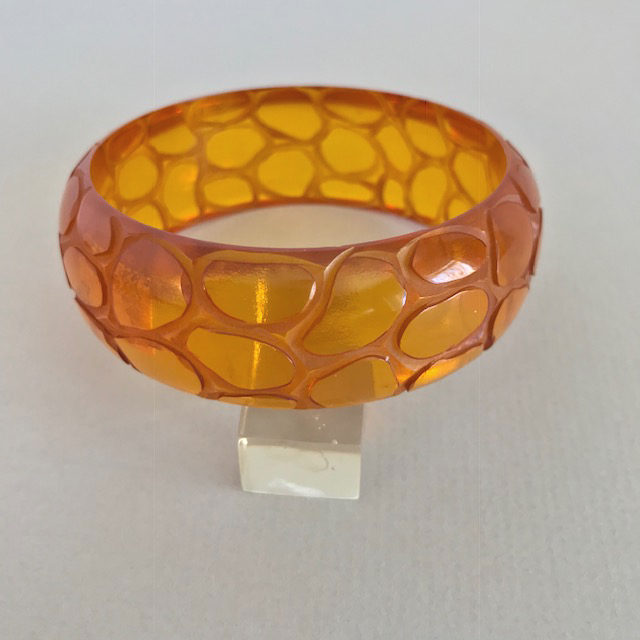 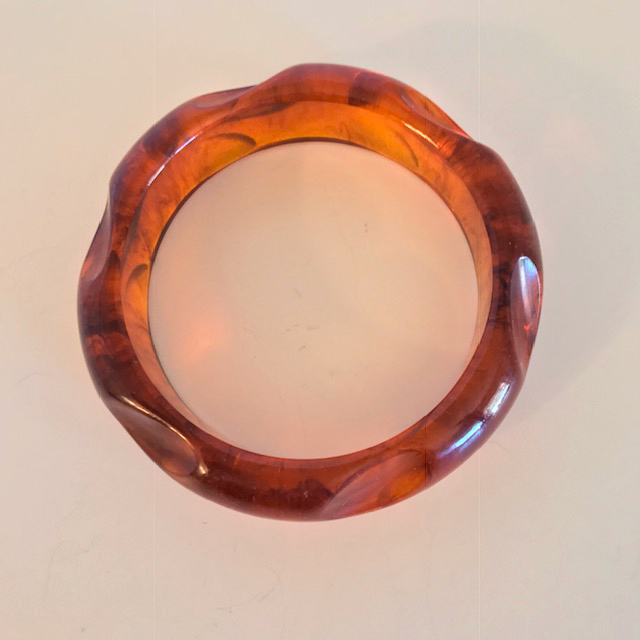 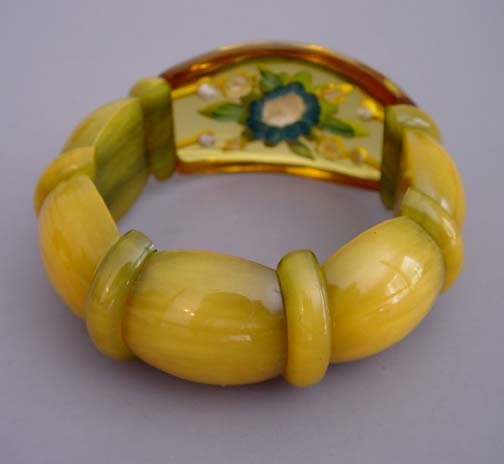 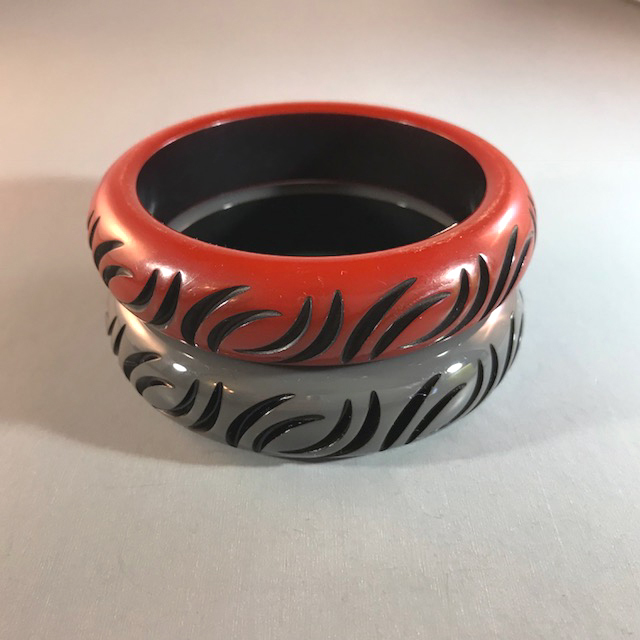 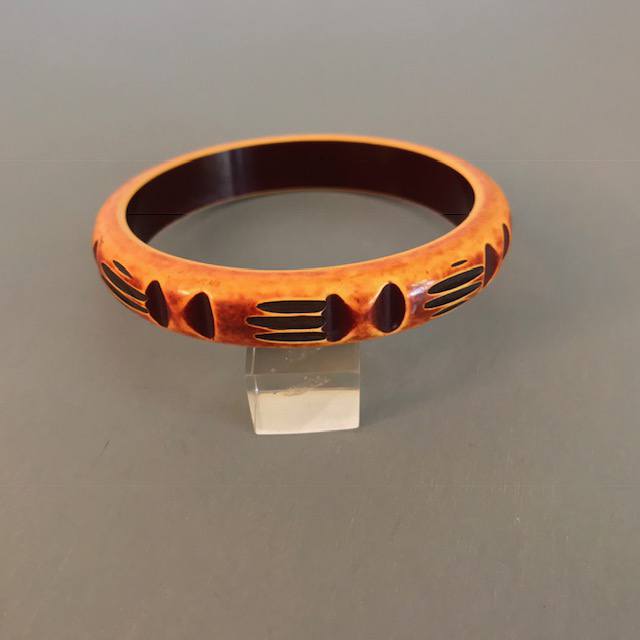 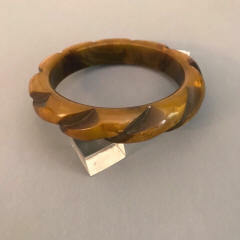 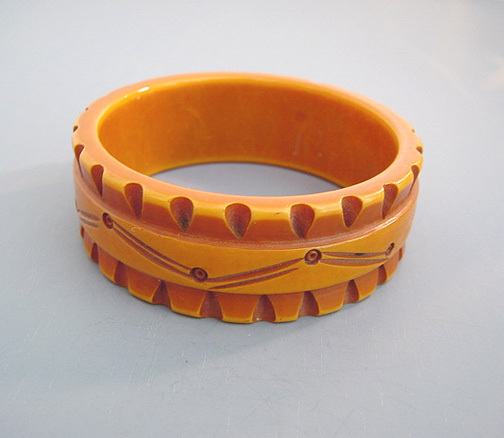 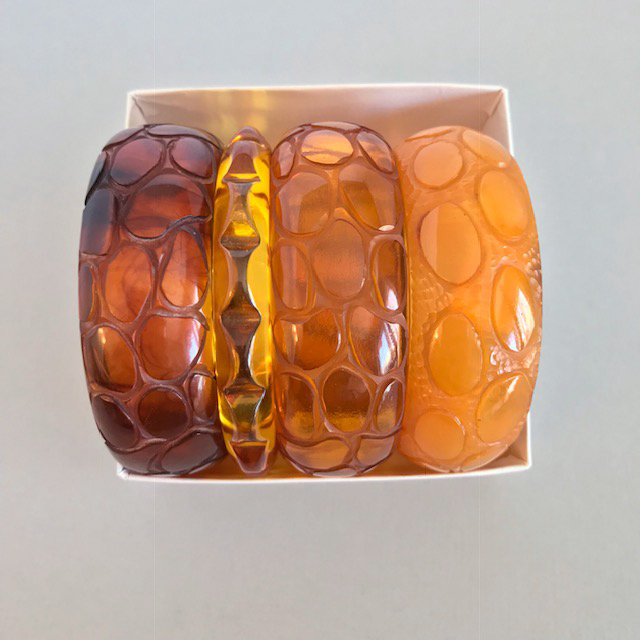 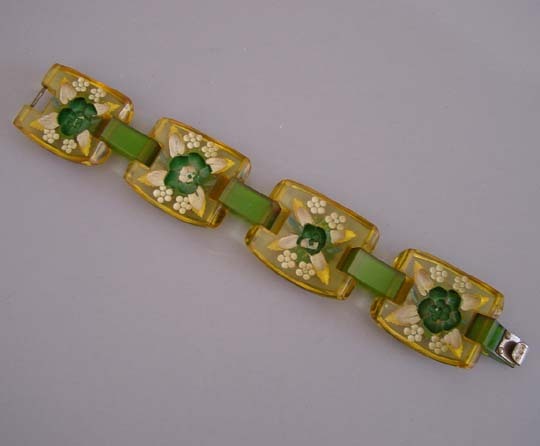 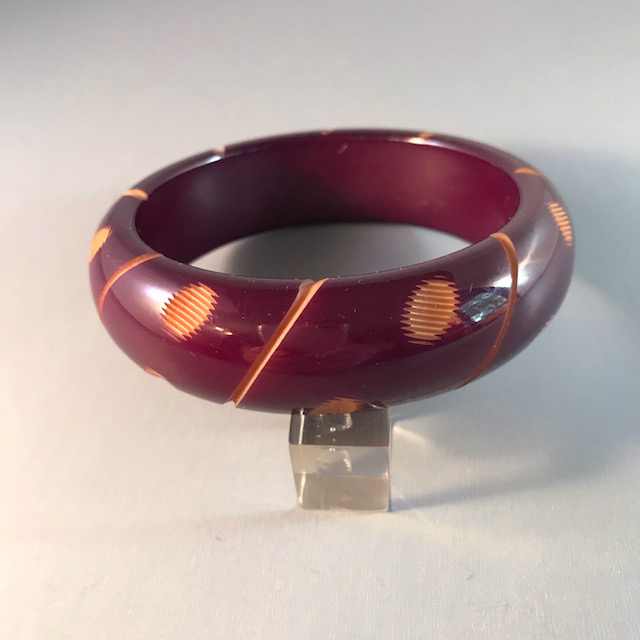 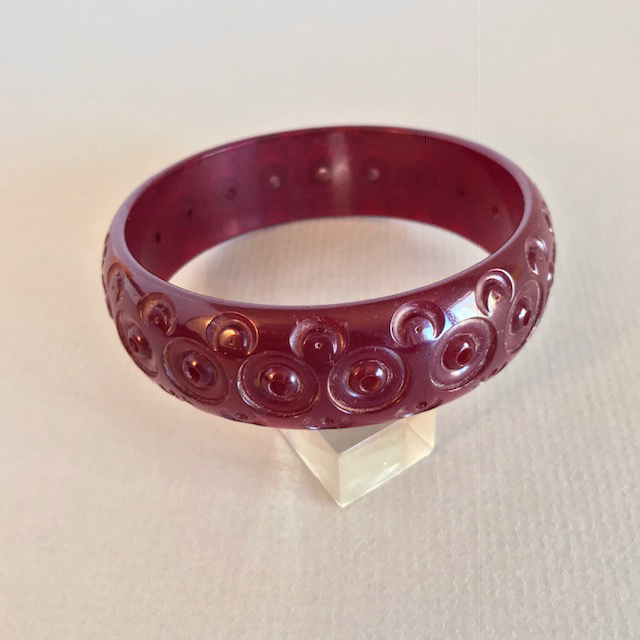 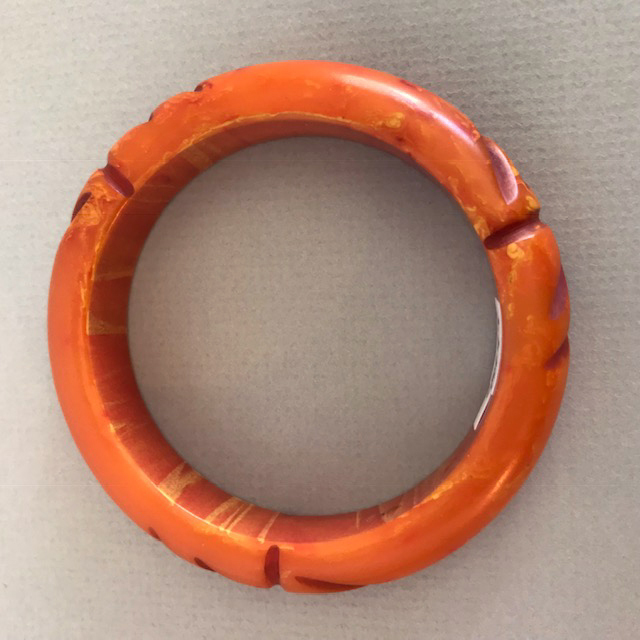 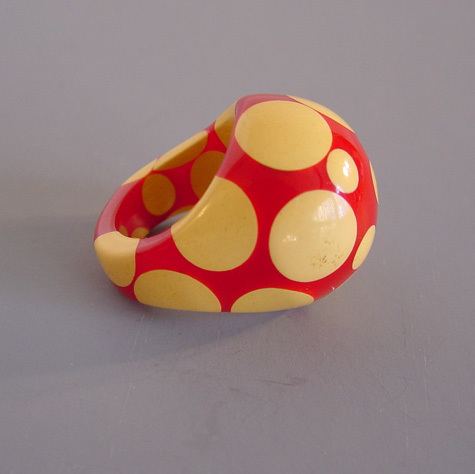 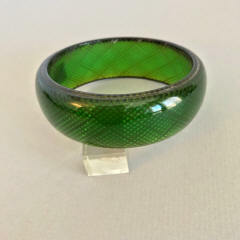 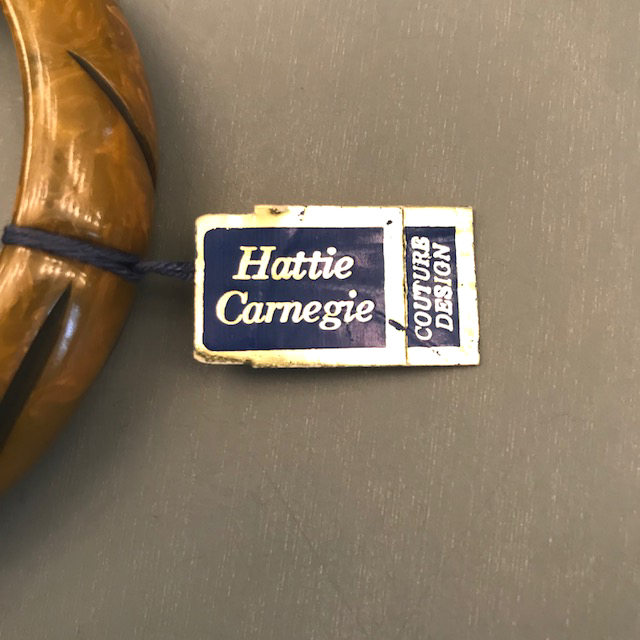 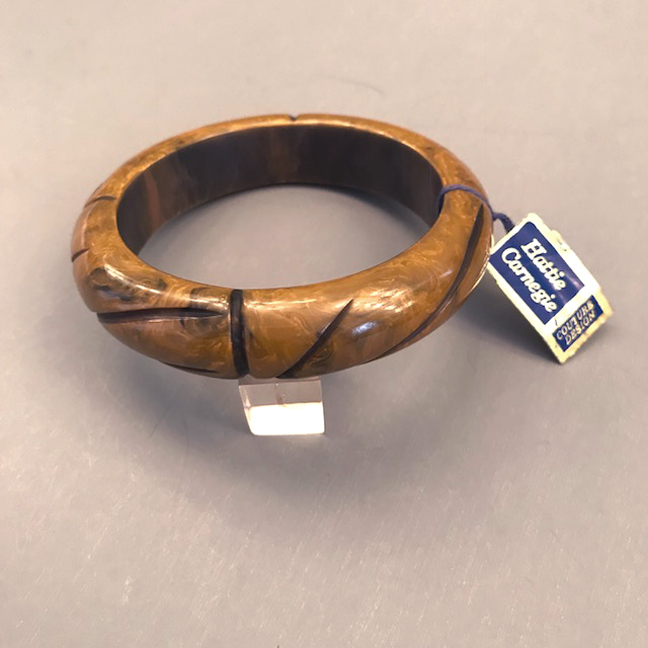 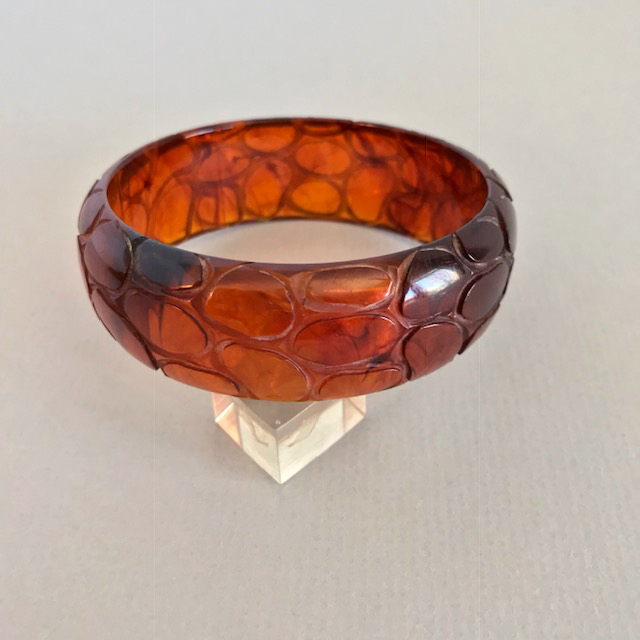 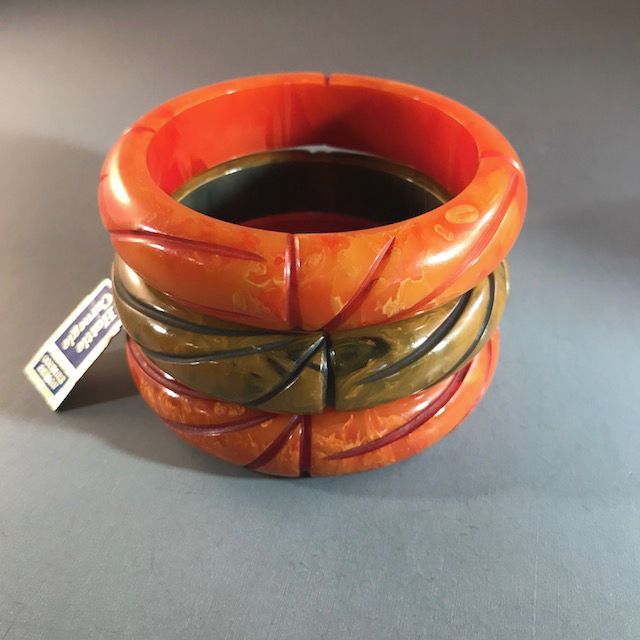 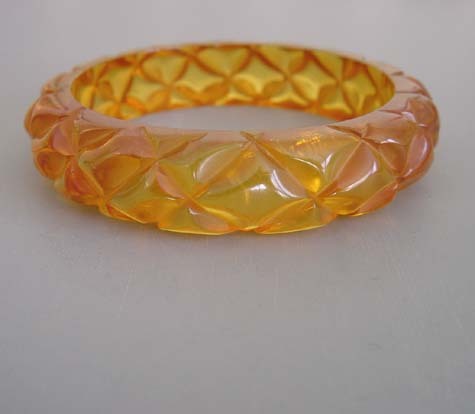 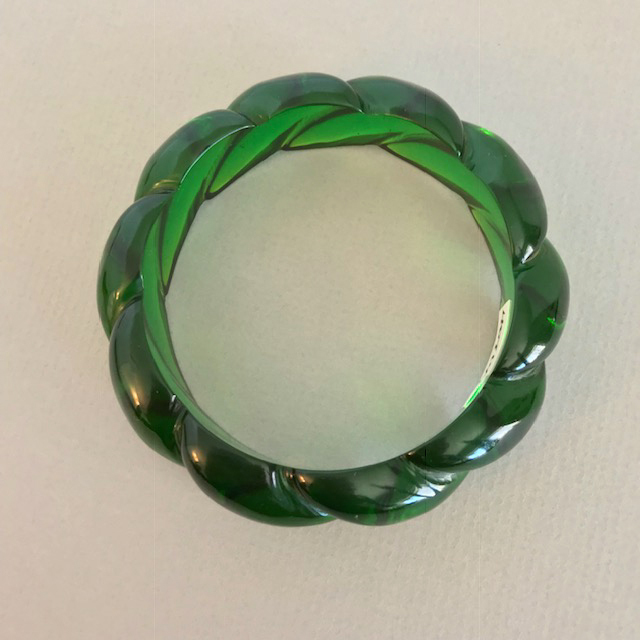 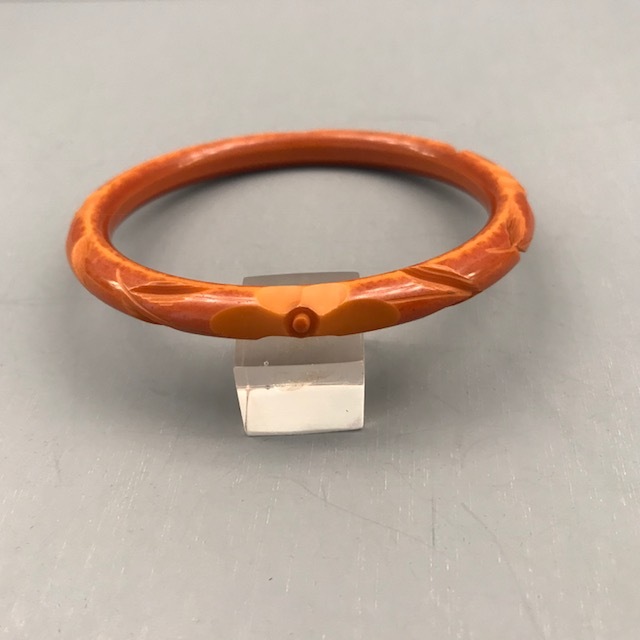 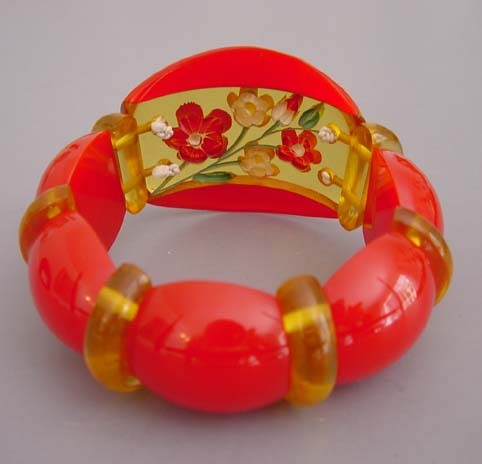 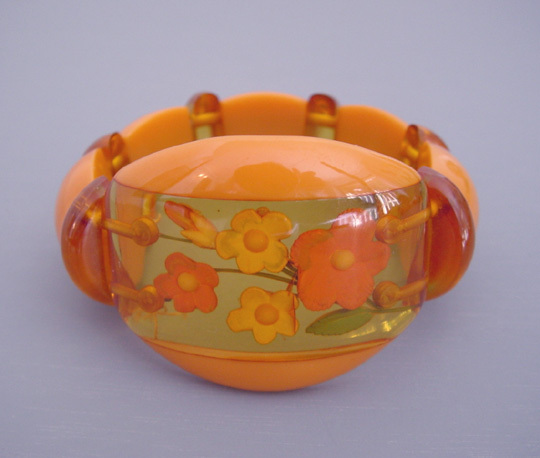 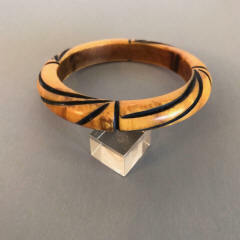 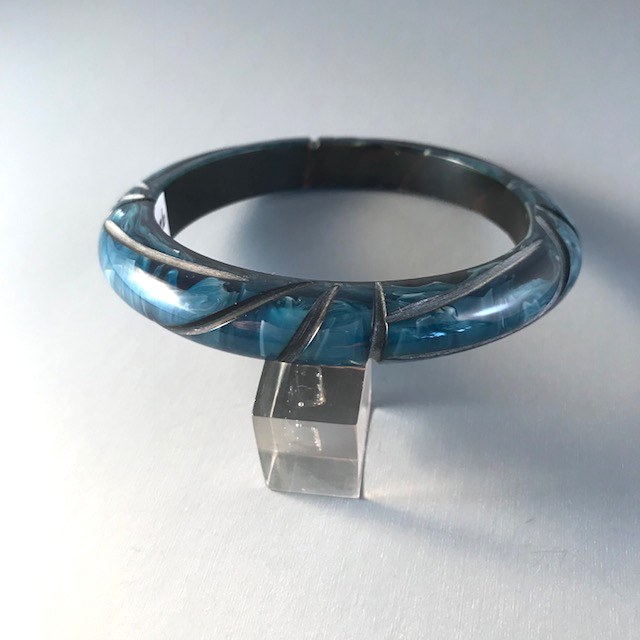 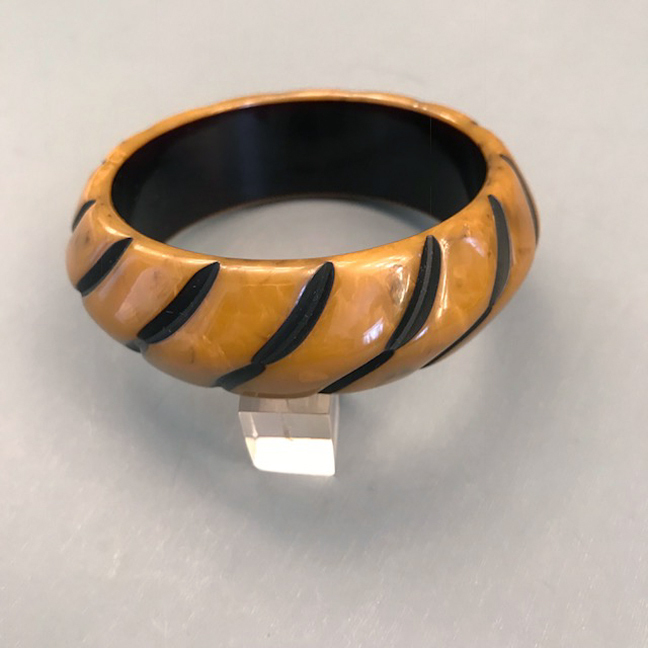 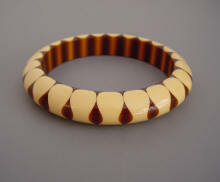 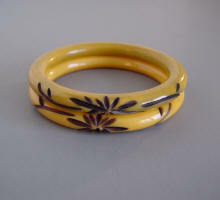 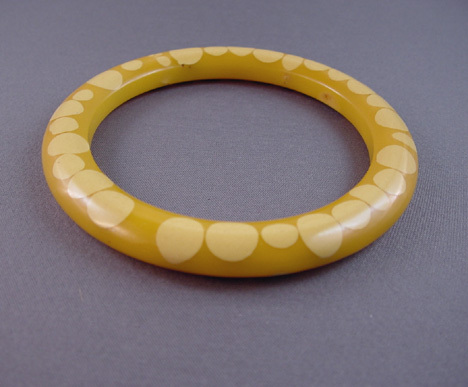 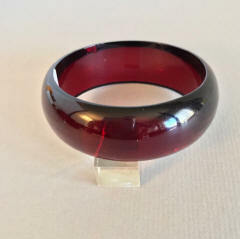 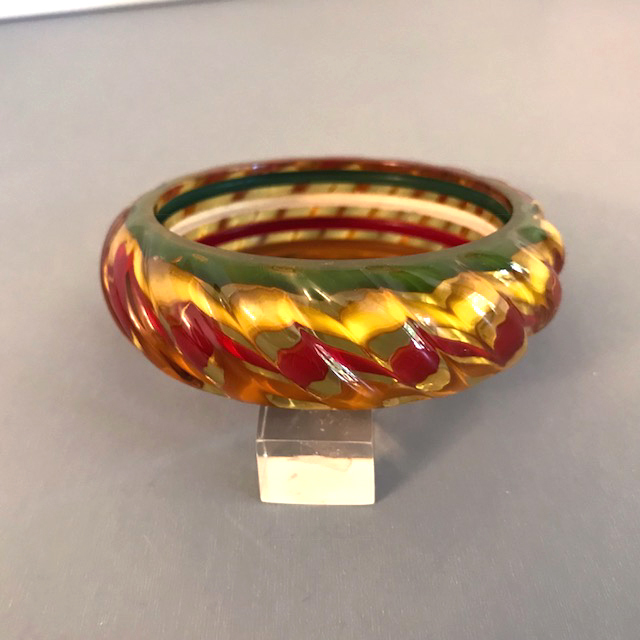 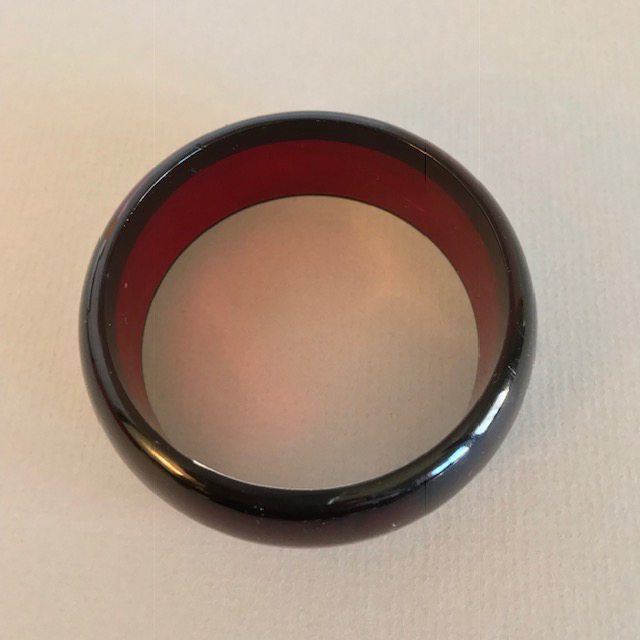 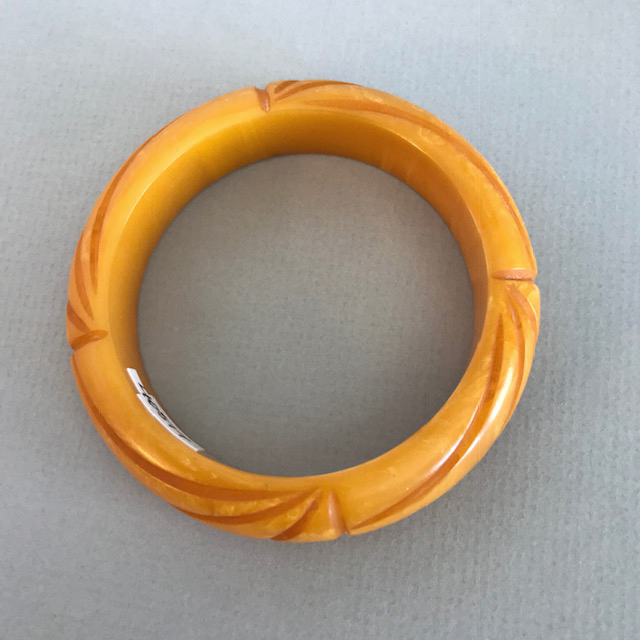 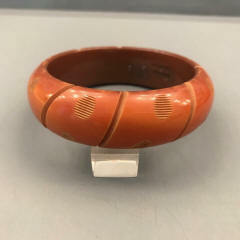 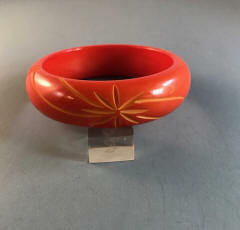 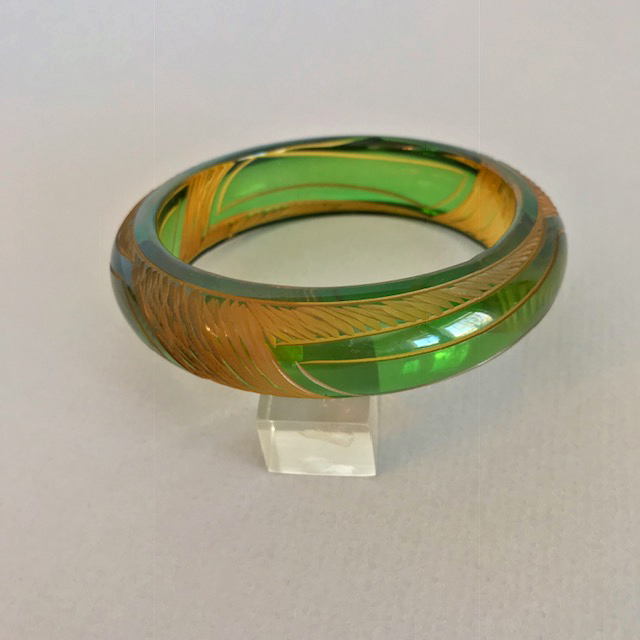 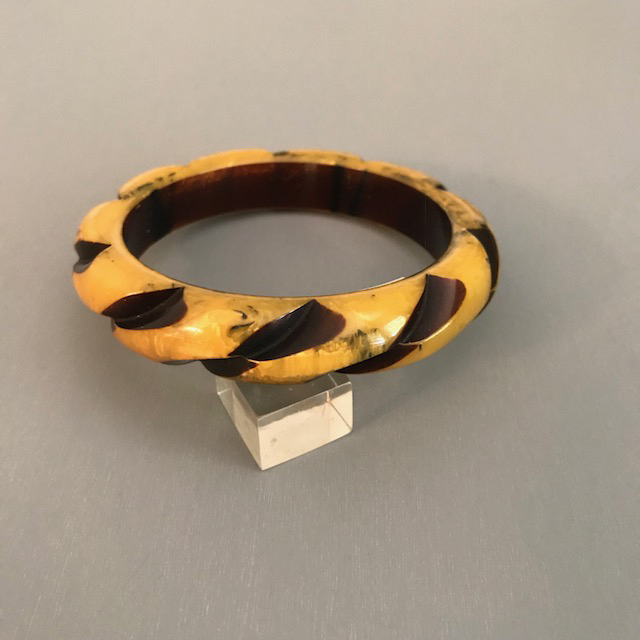 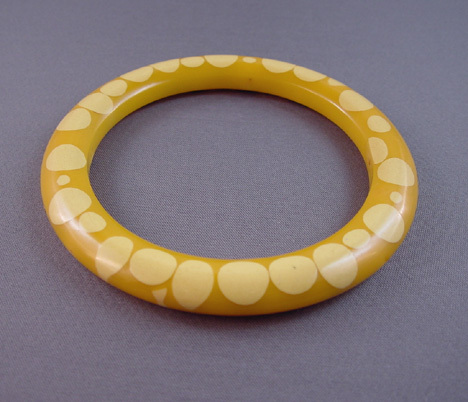 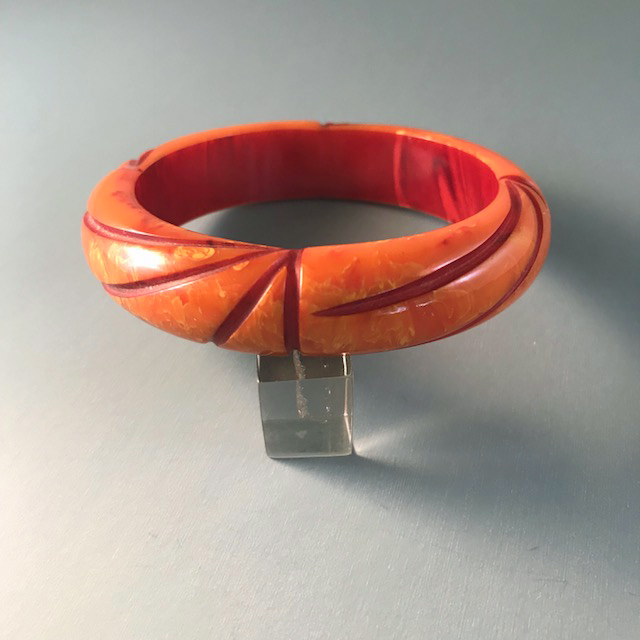 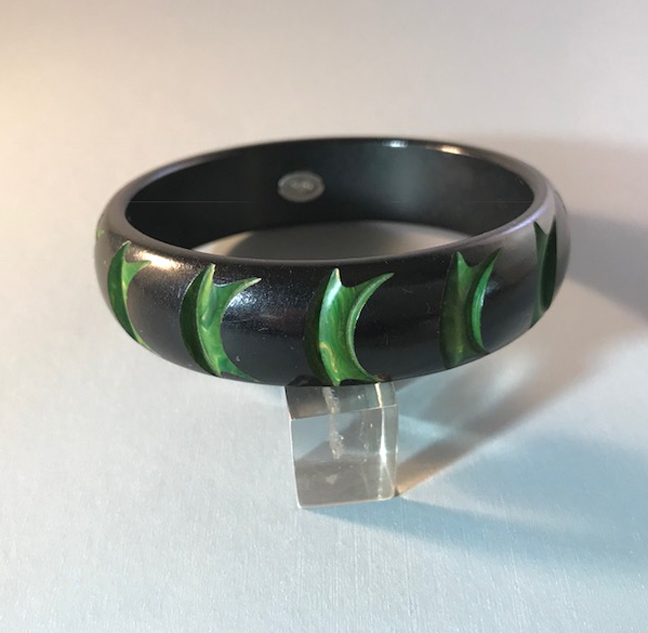 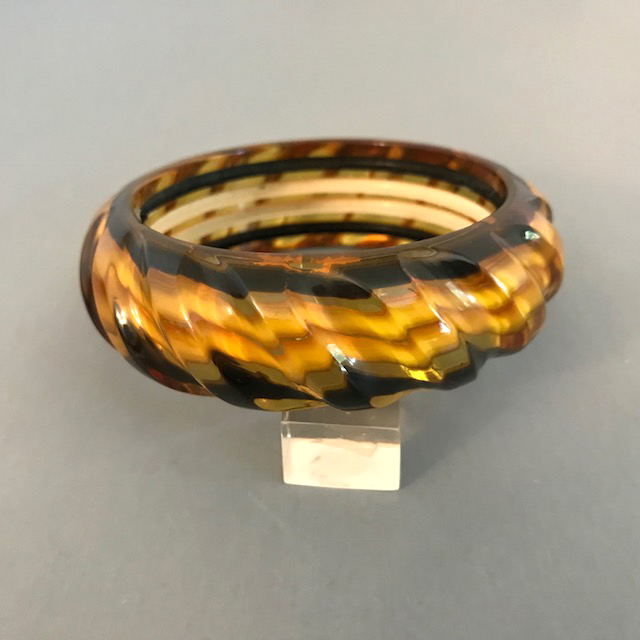 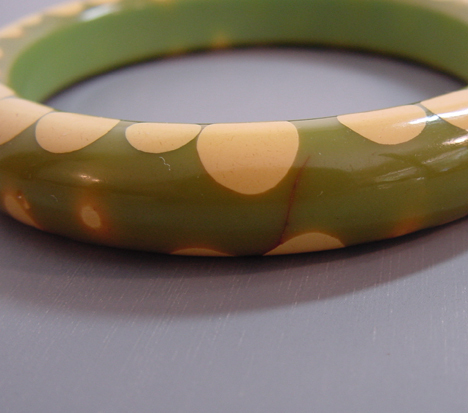 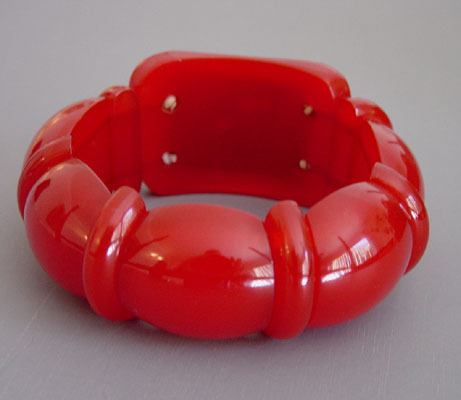 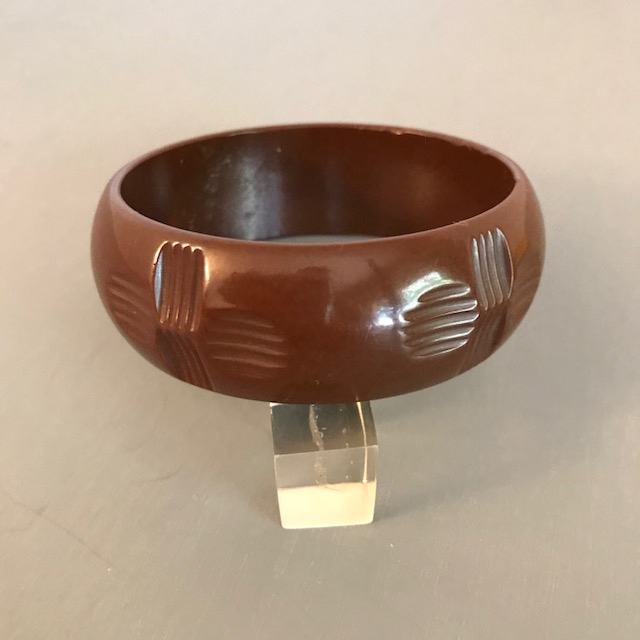 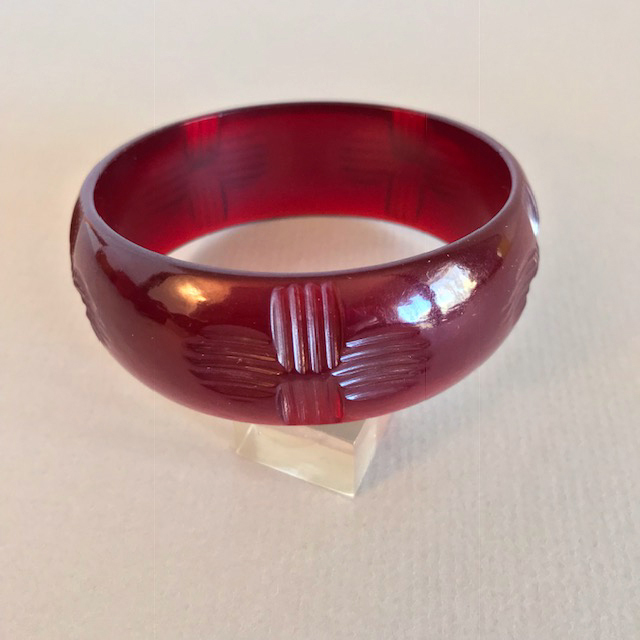 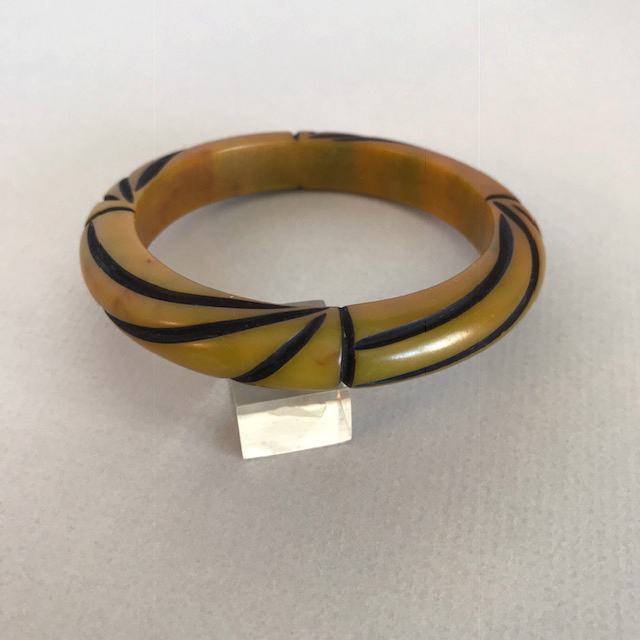 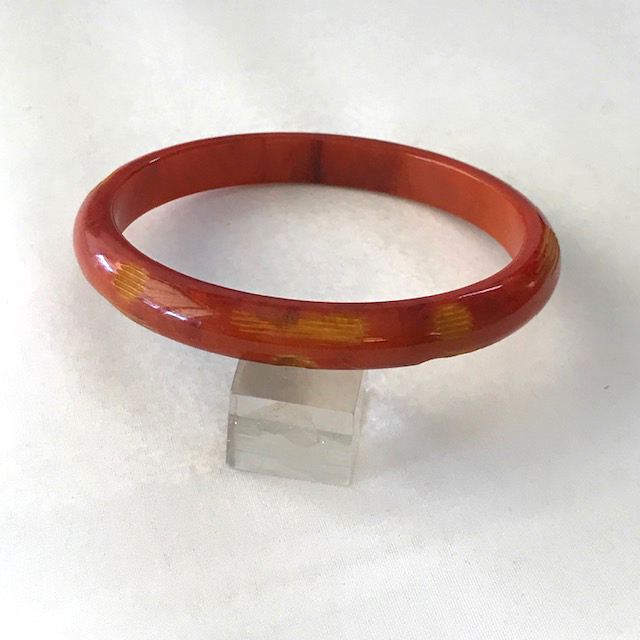 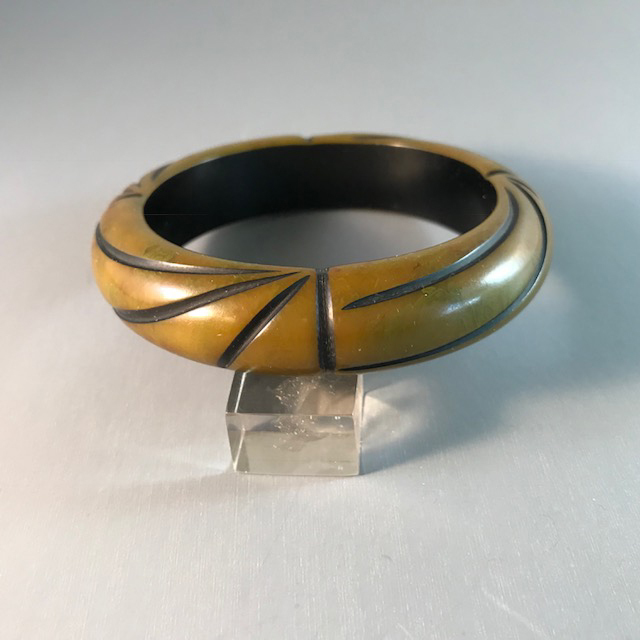 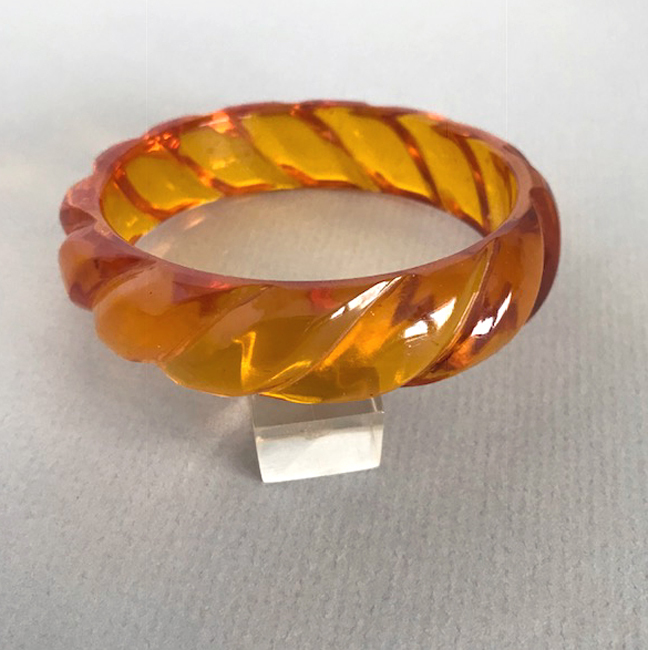 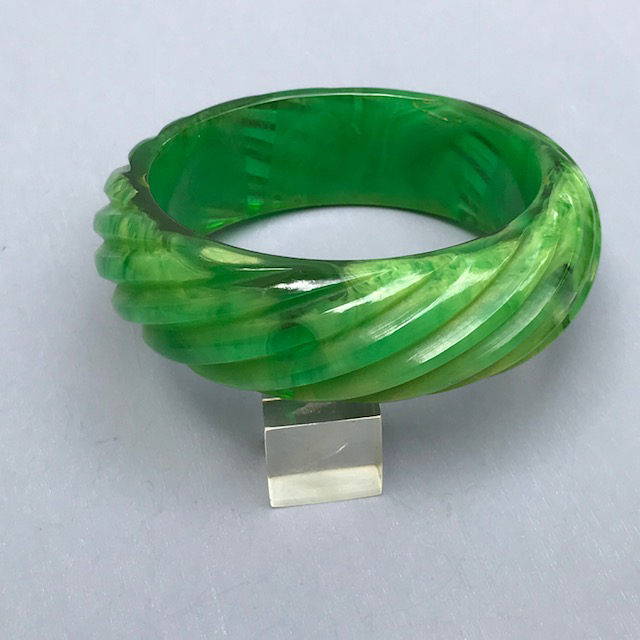 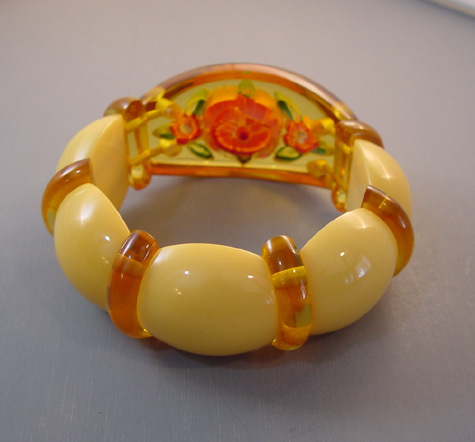 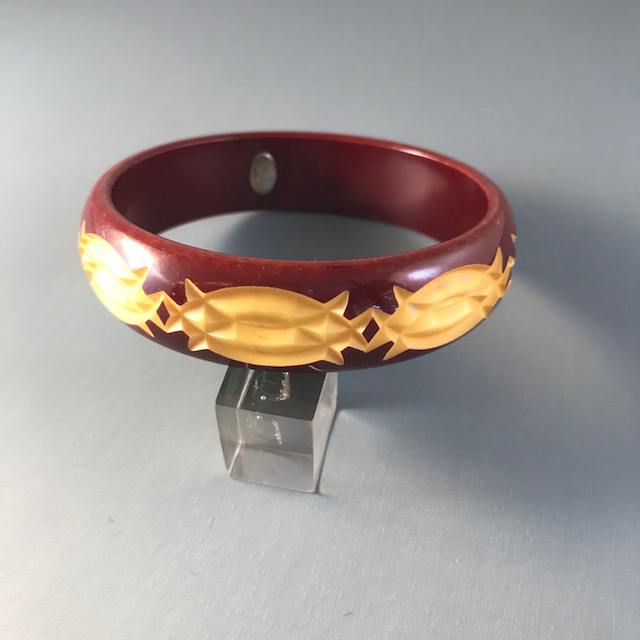 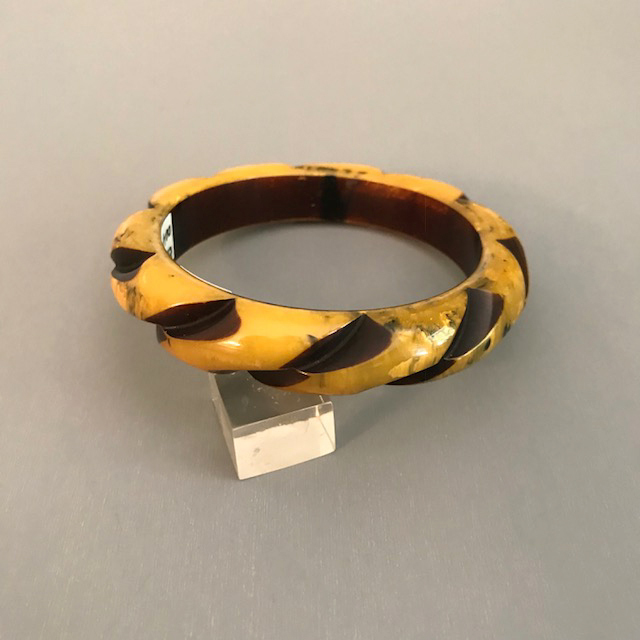 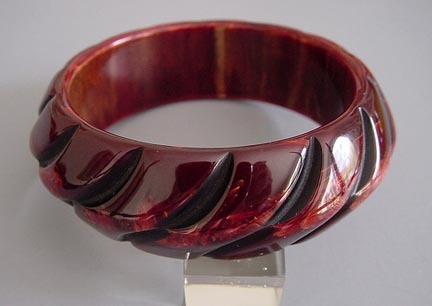 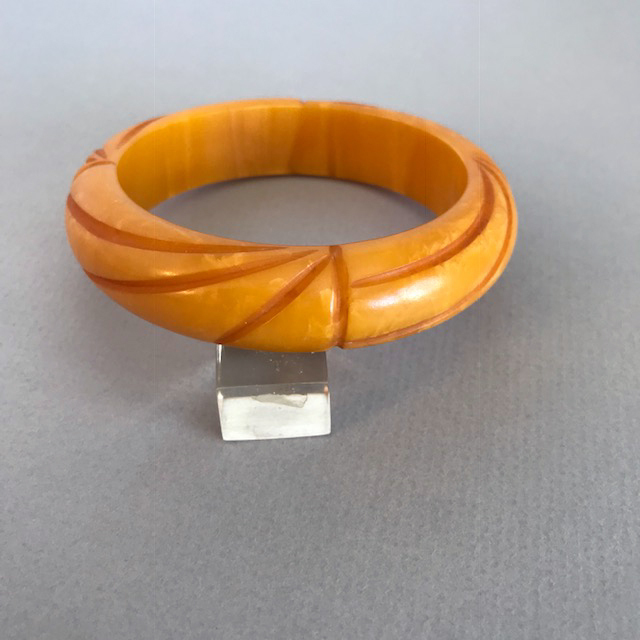 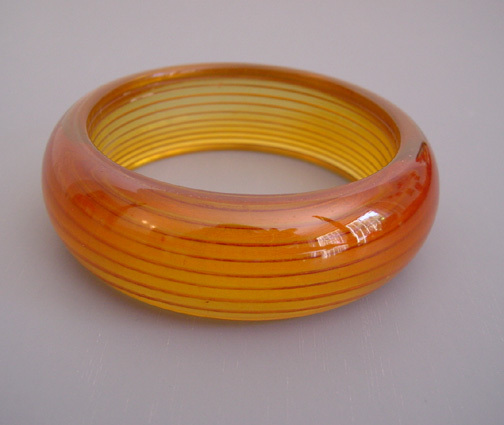 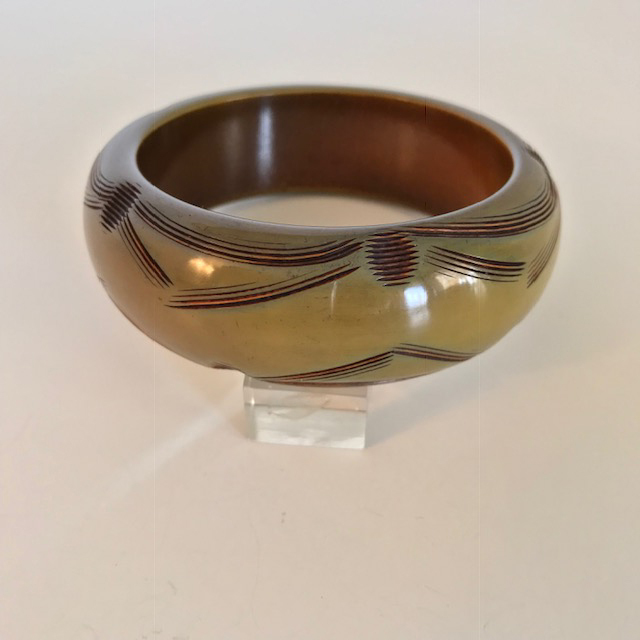 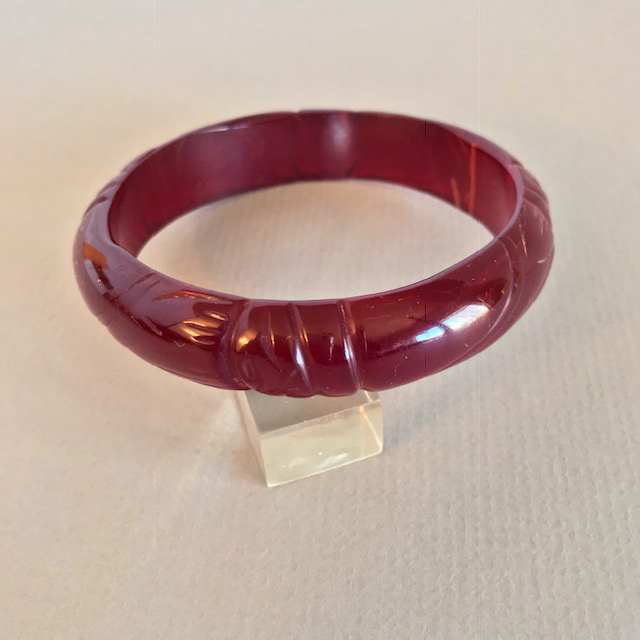 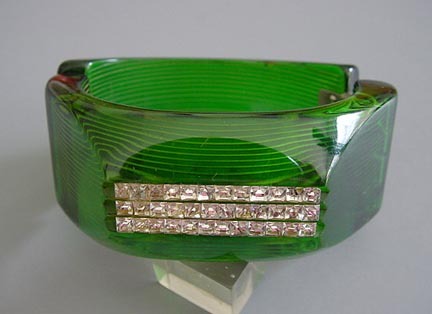 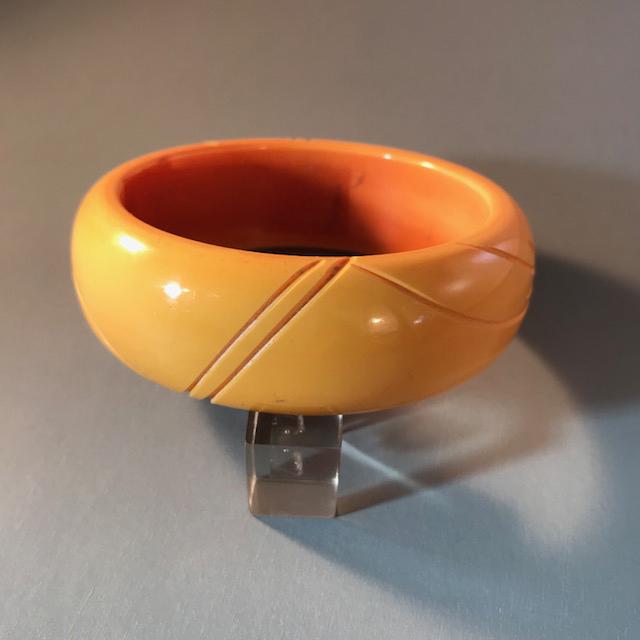 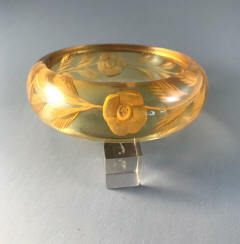 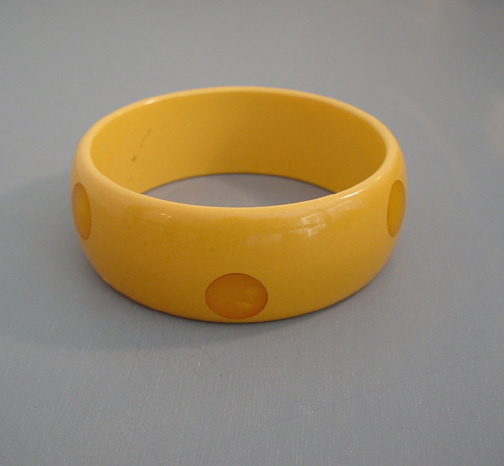 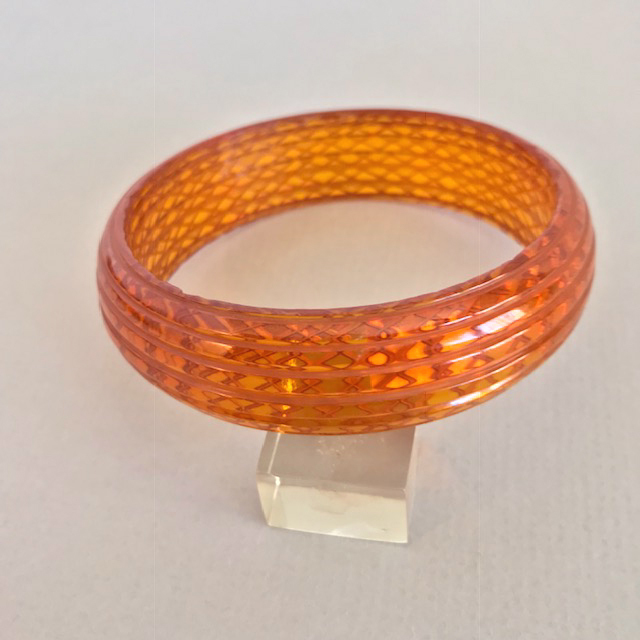 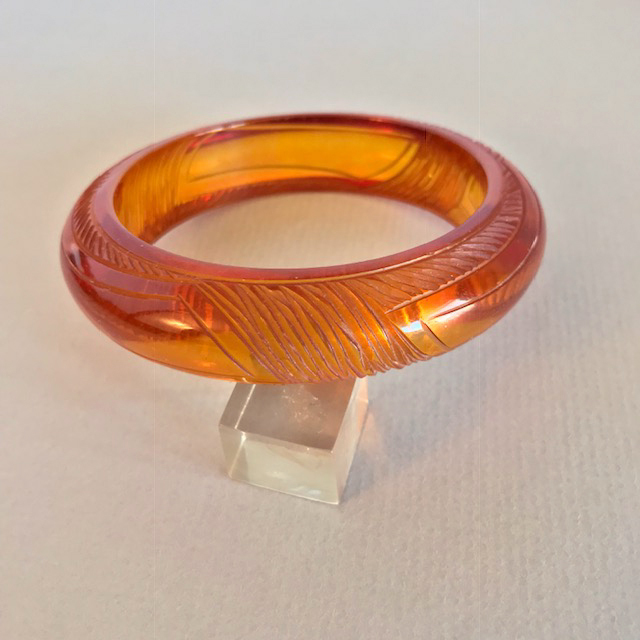 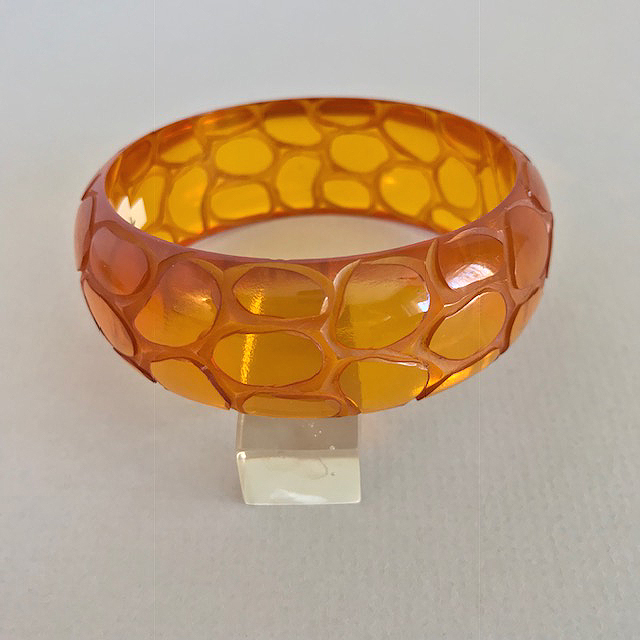 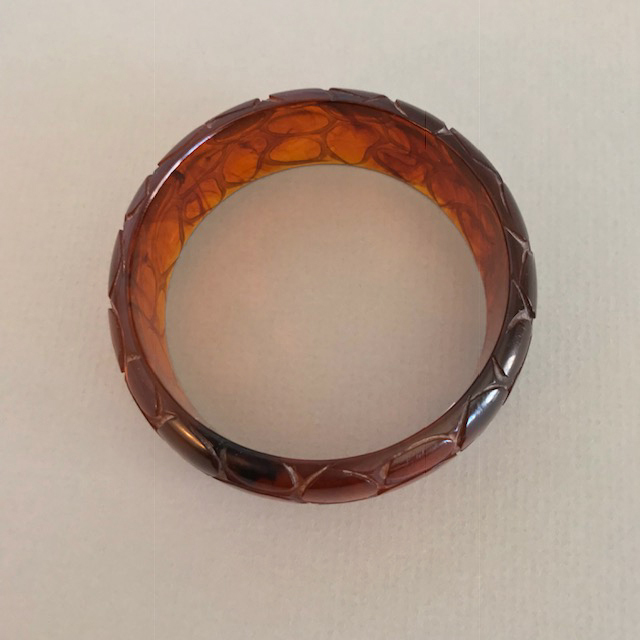 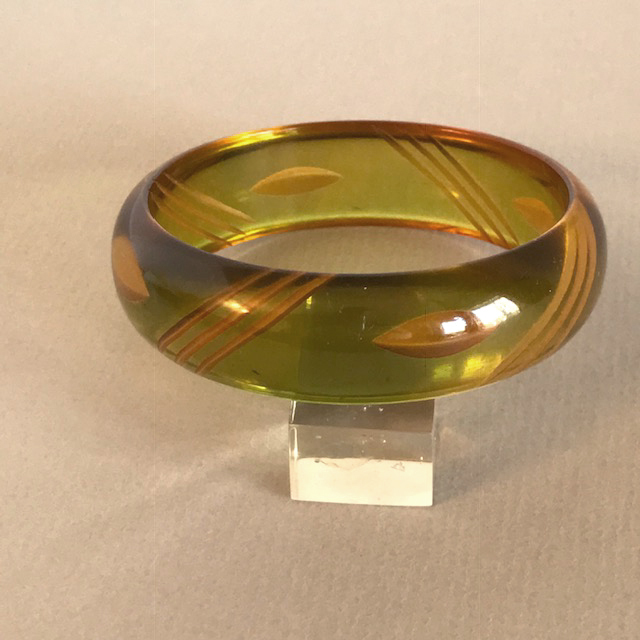 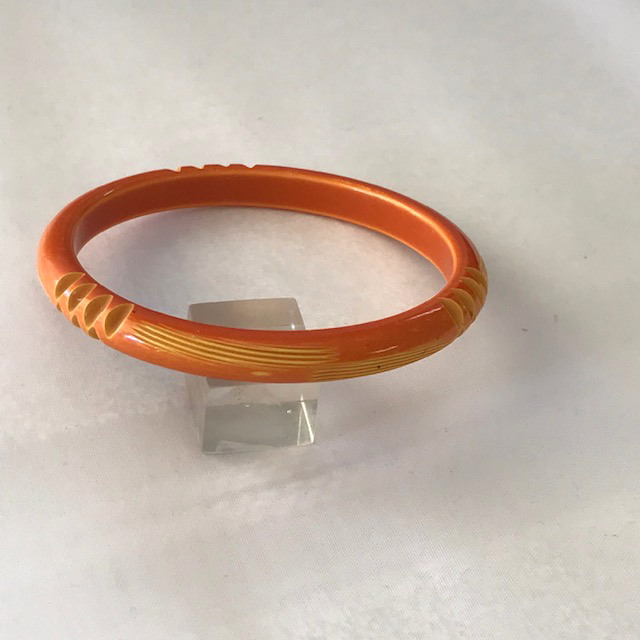 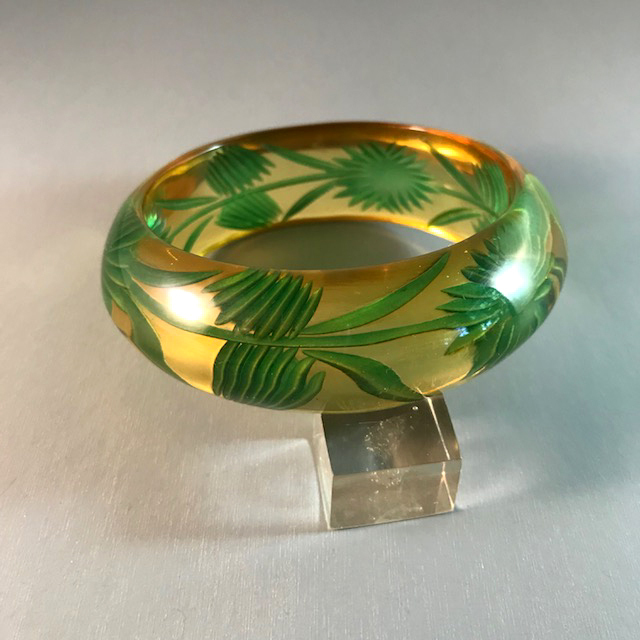 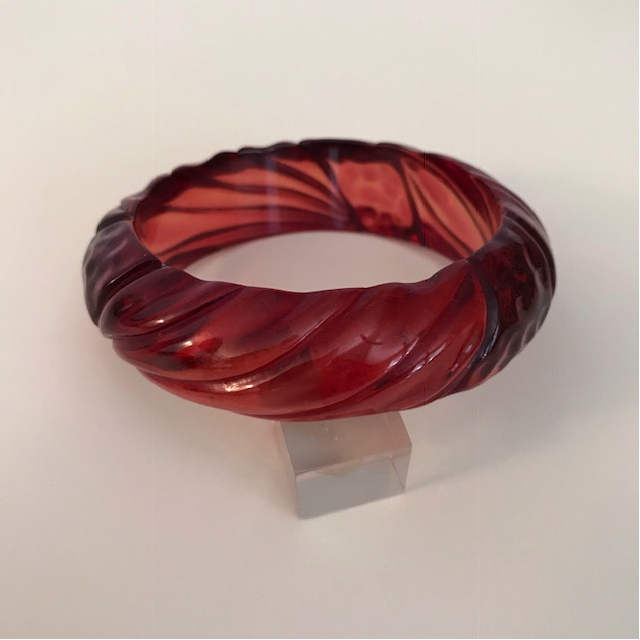 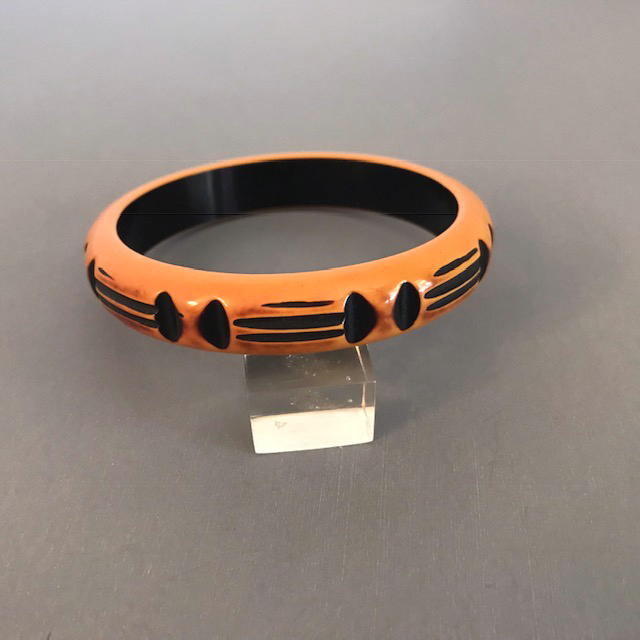 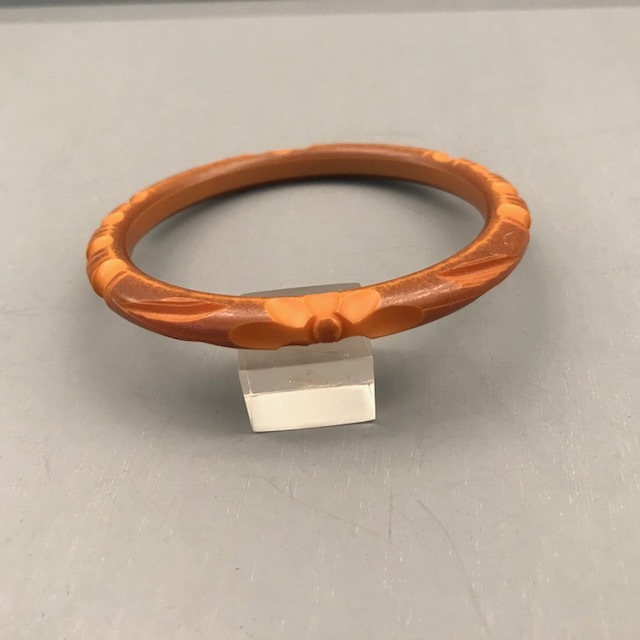 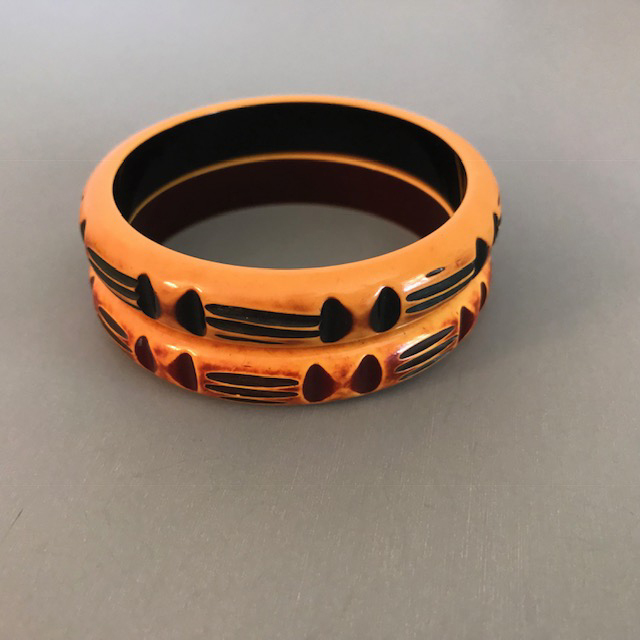 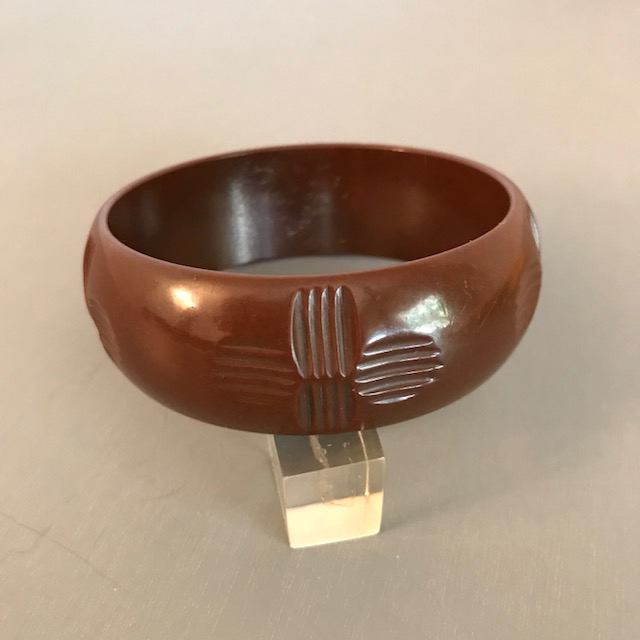 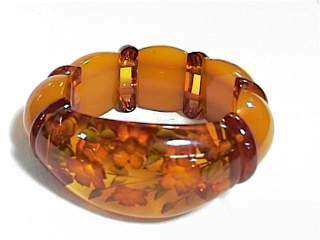 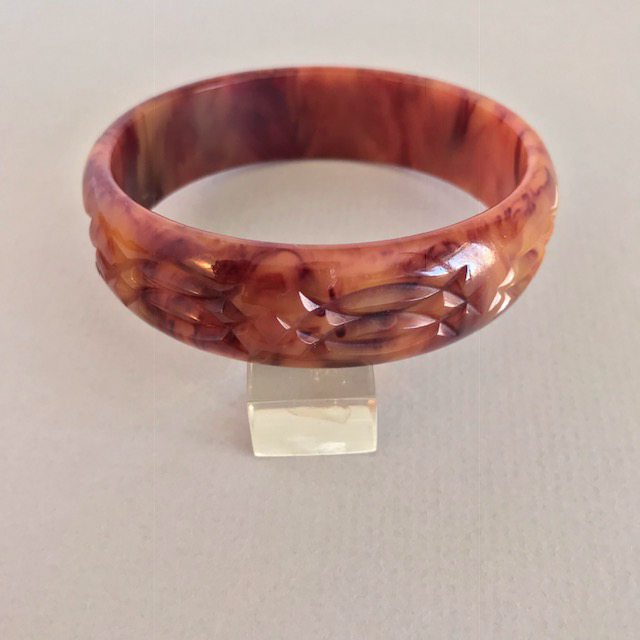 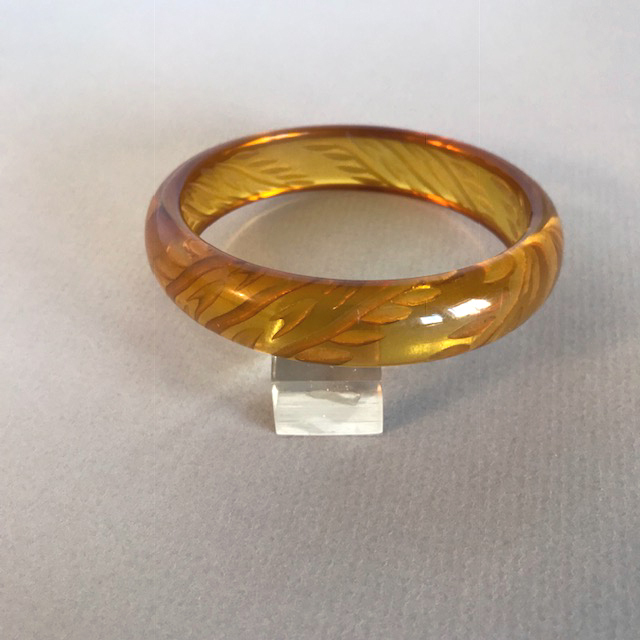 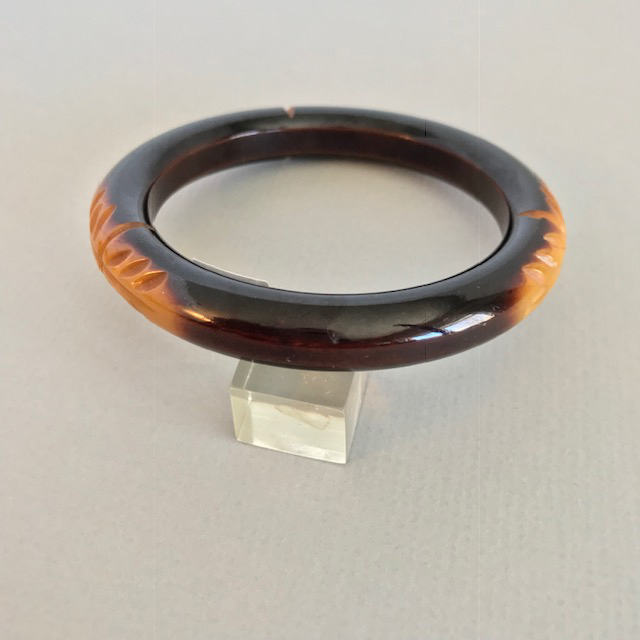 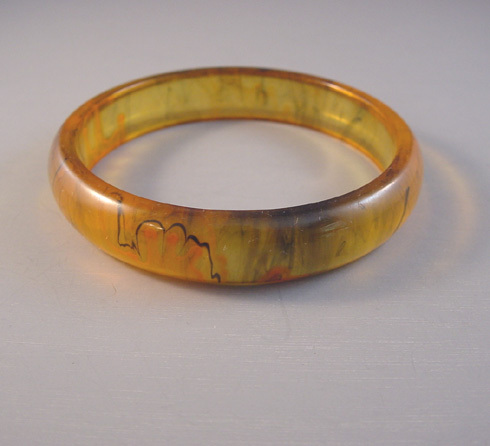 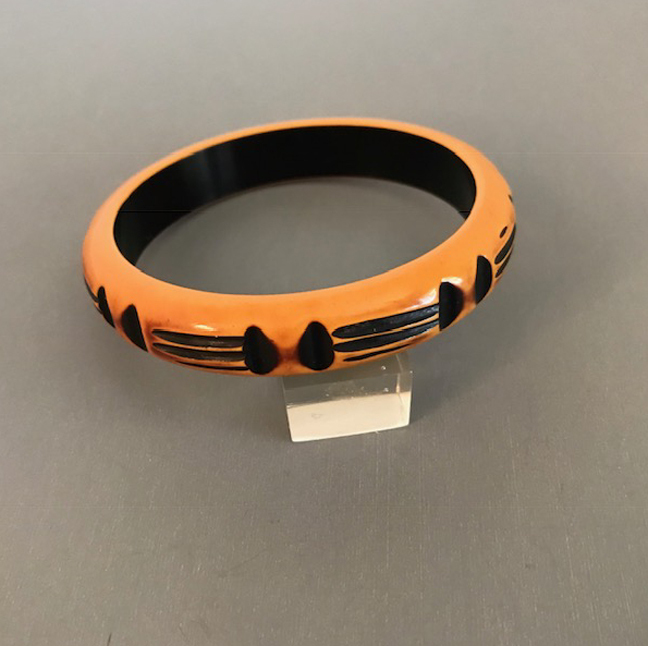 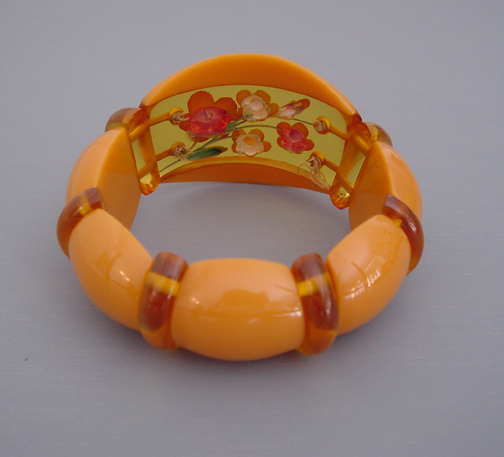 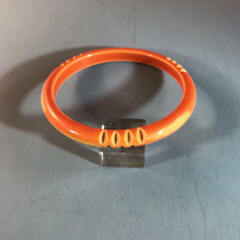 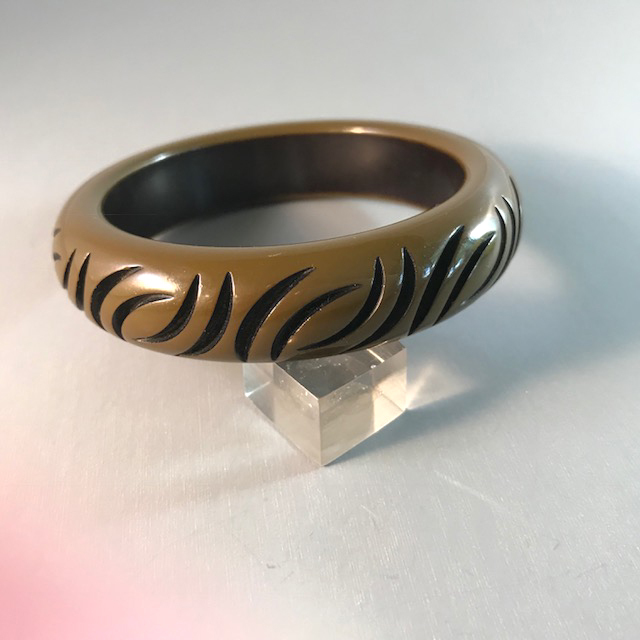 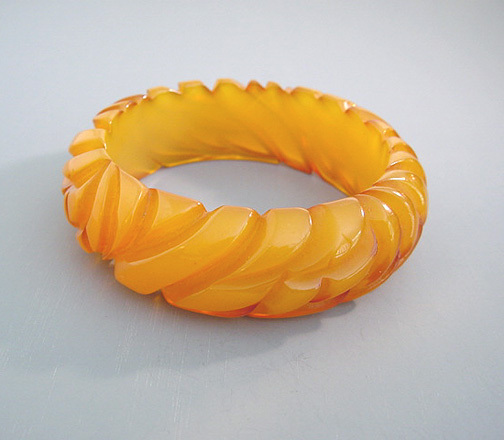 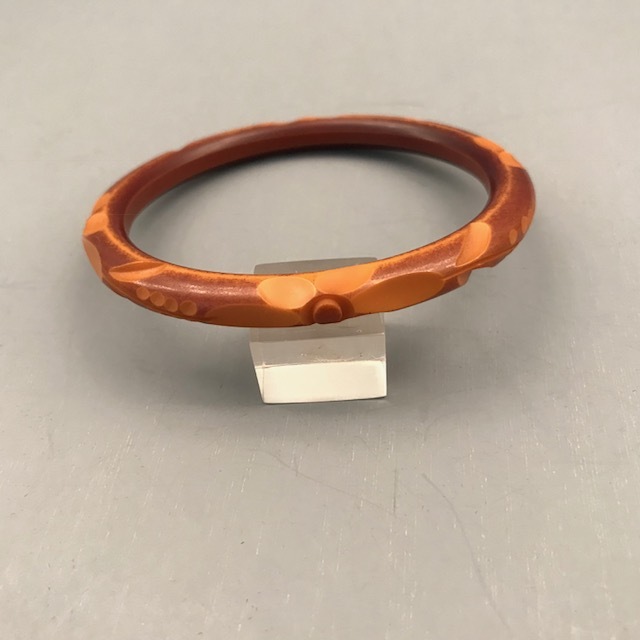 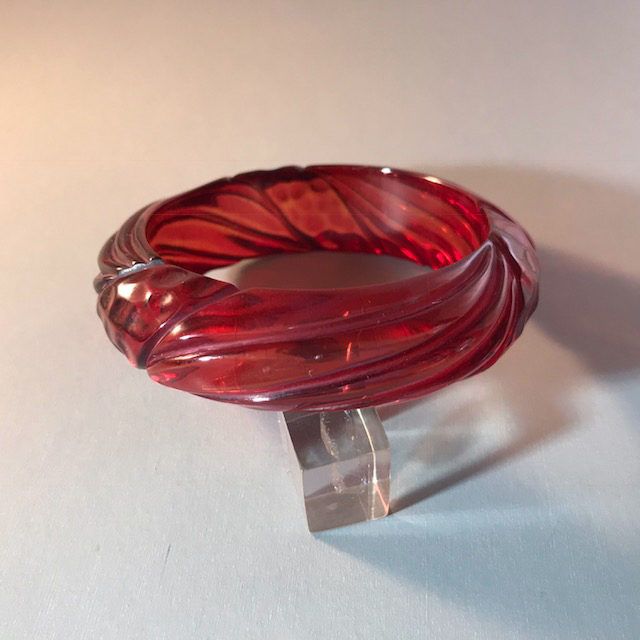 A re-polished bakelite bangle similar to this can be seen in the wonderful book by Matthew Burkholz, "The Bakelite Collection" on page 49, top right. 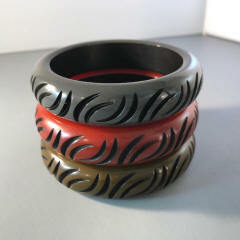 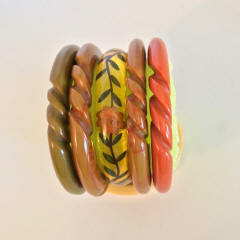 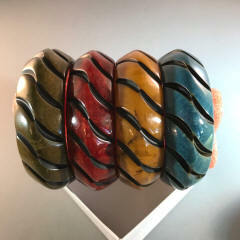 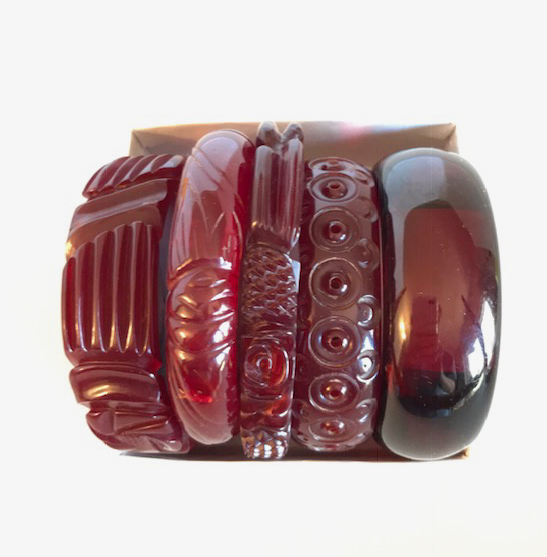 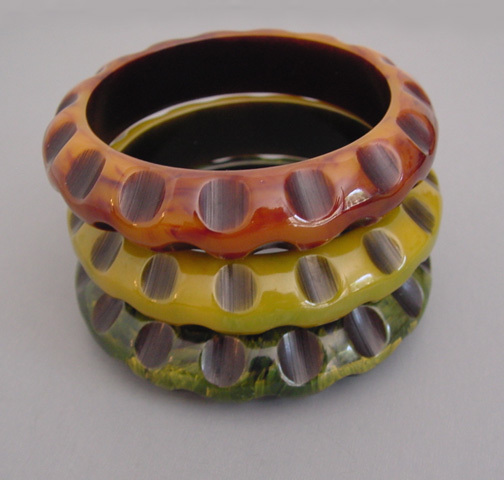 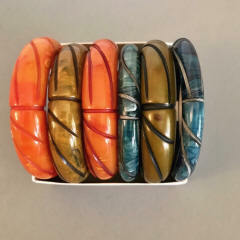 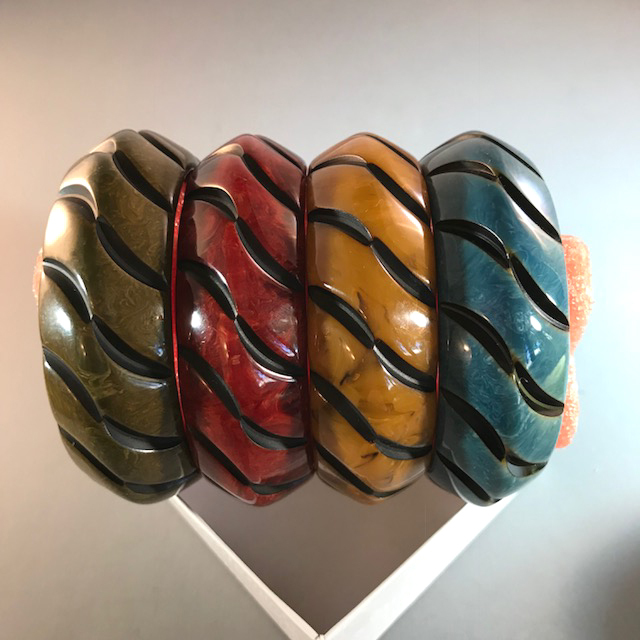 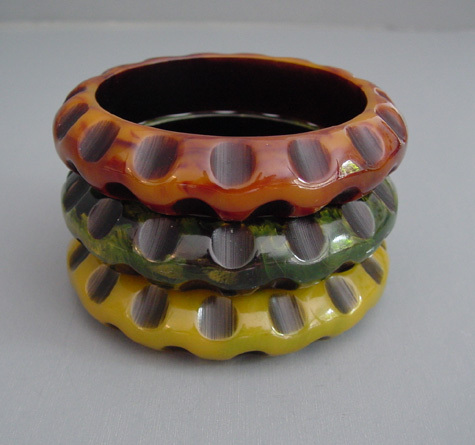 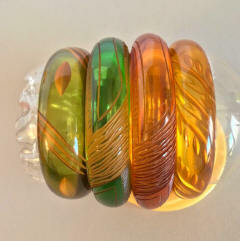 View #B37947 BAKELITE bangle stack showing four different colors. 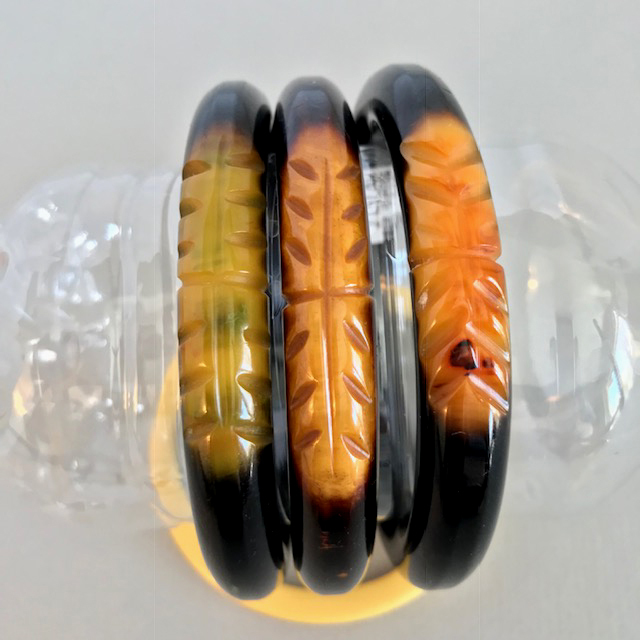 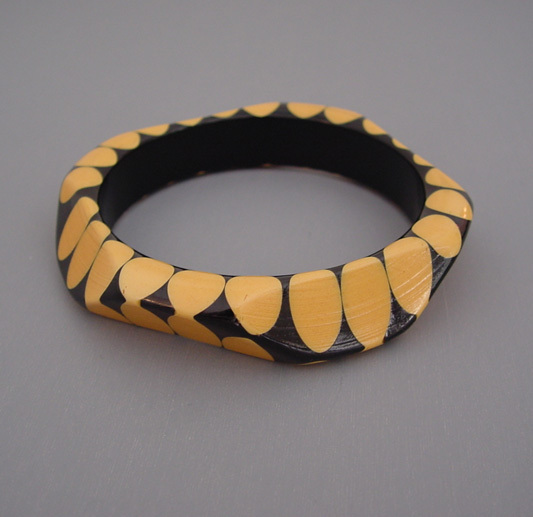 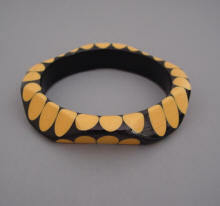 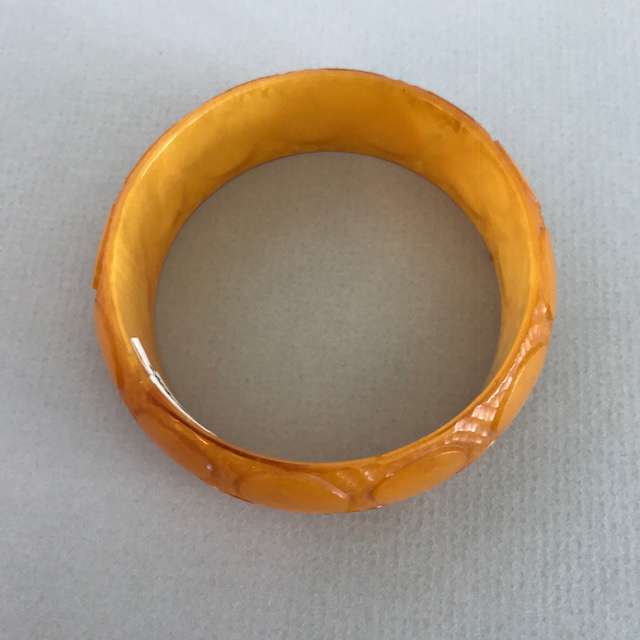 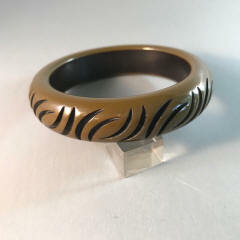 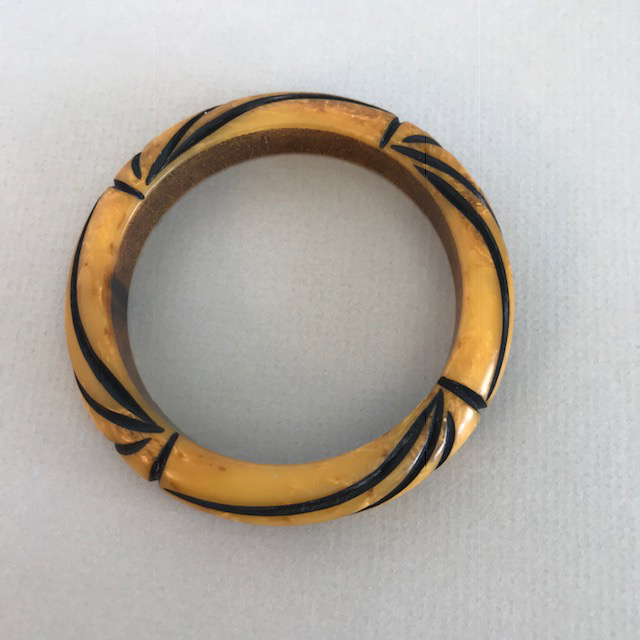 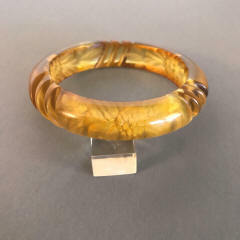 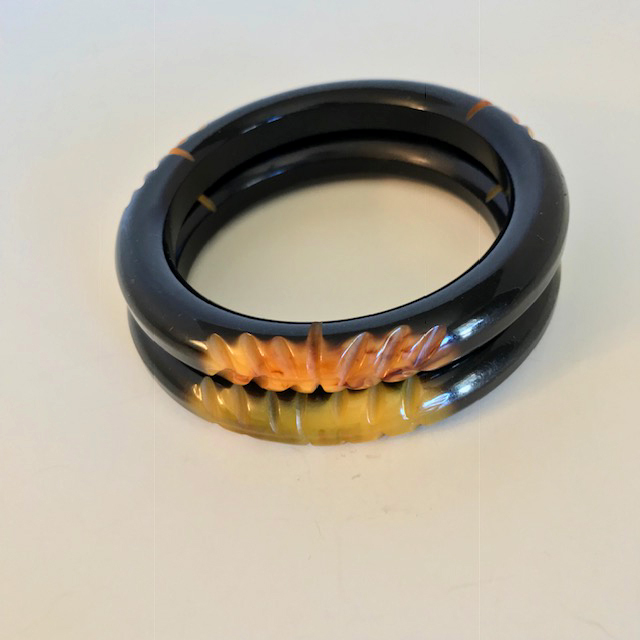 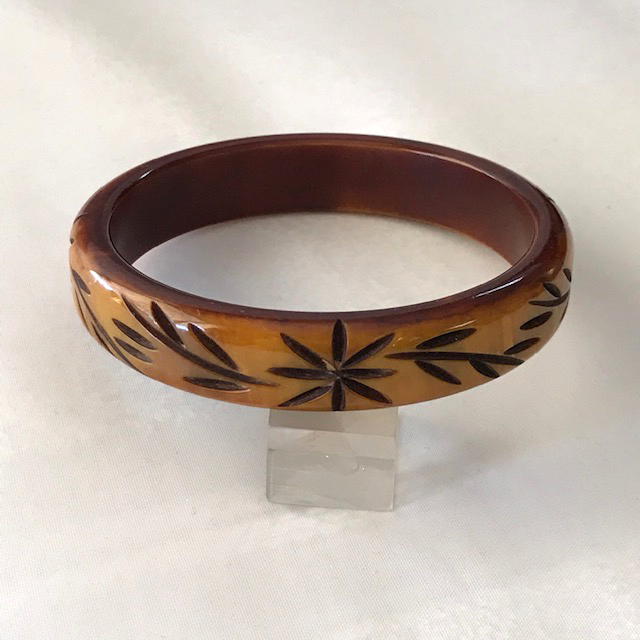 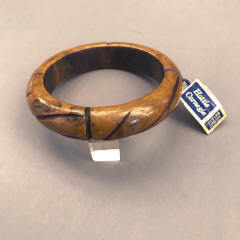 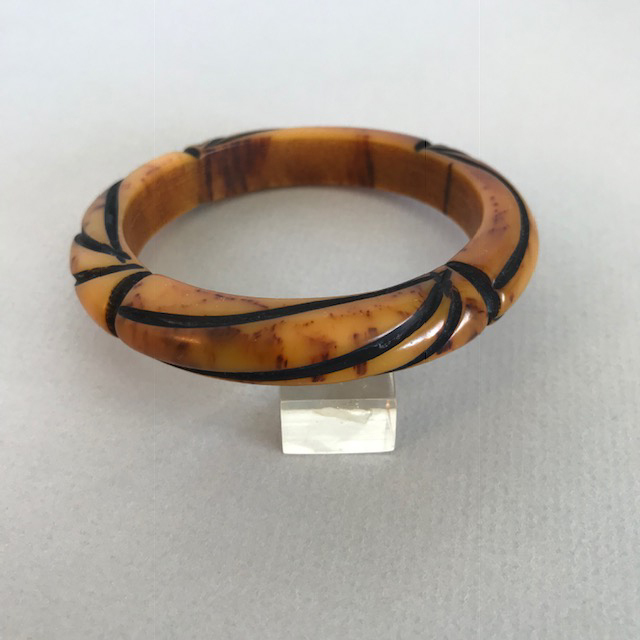 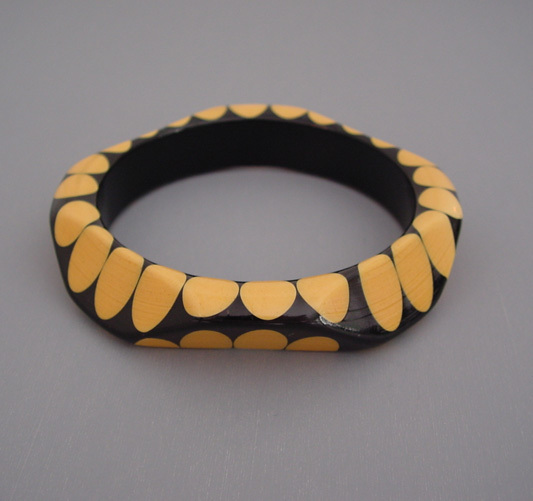 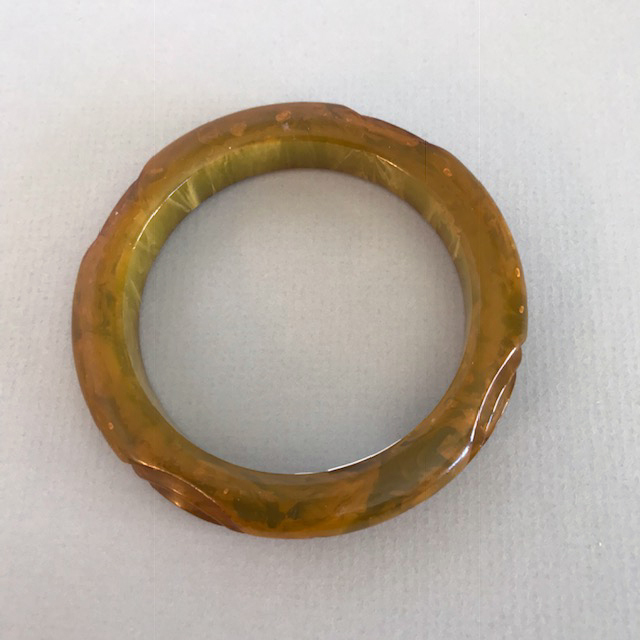 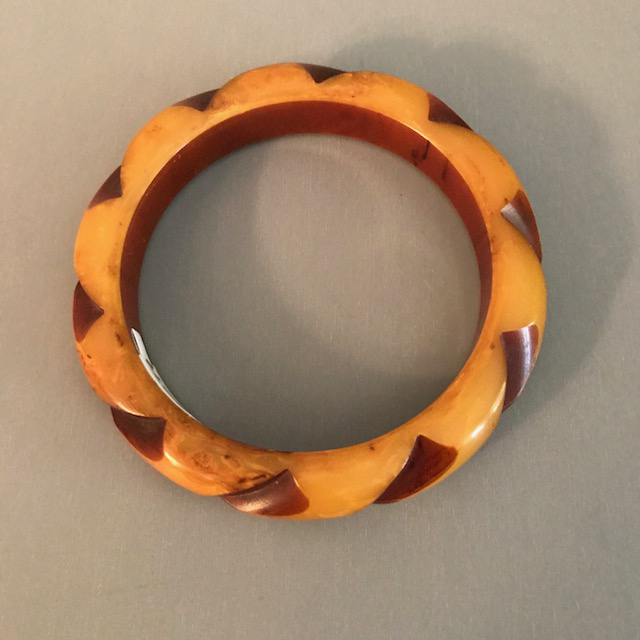 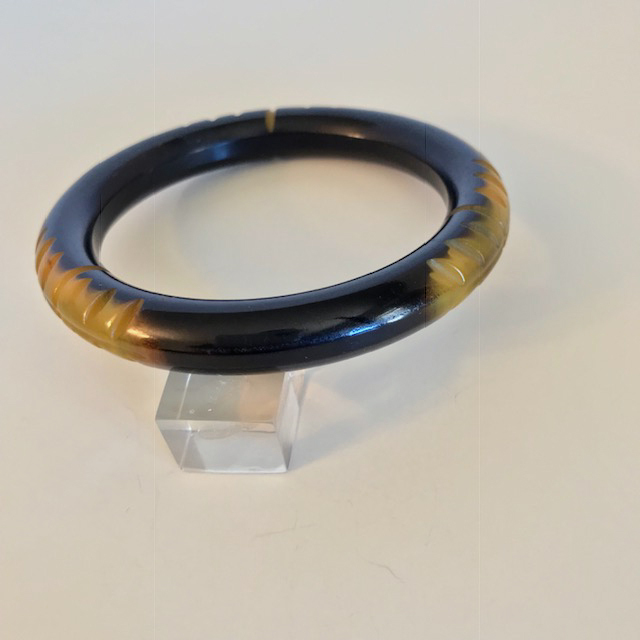 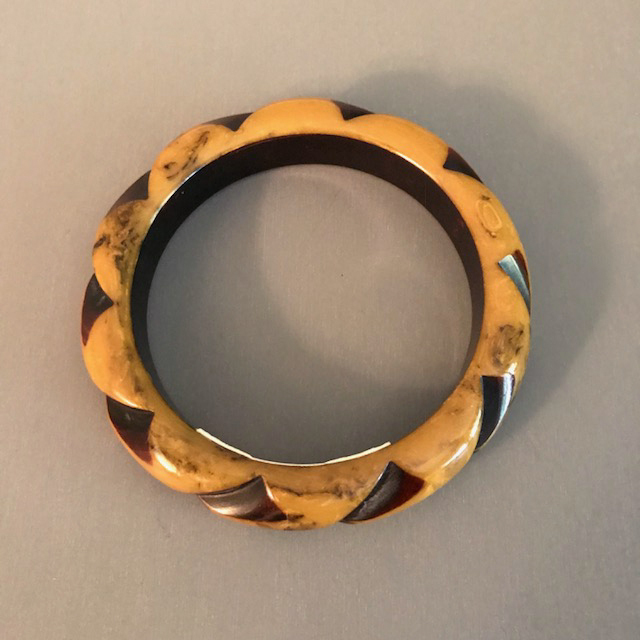 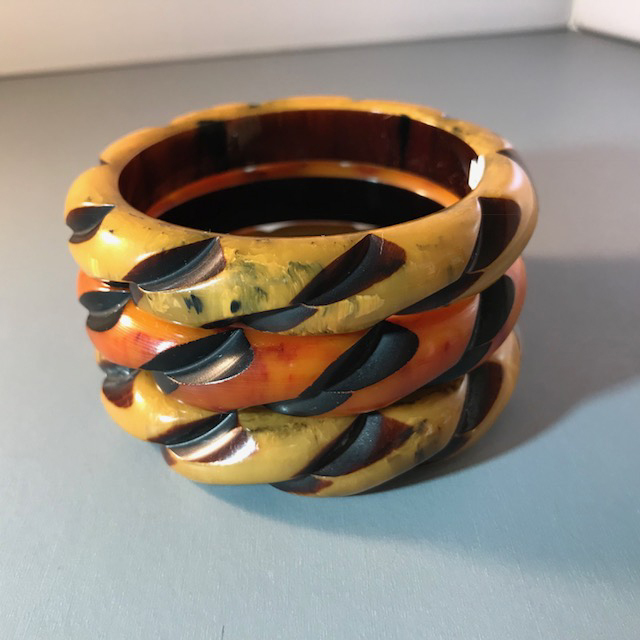 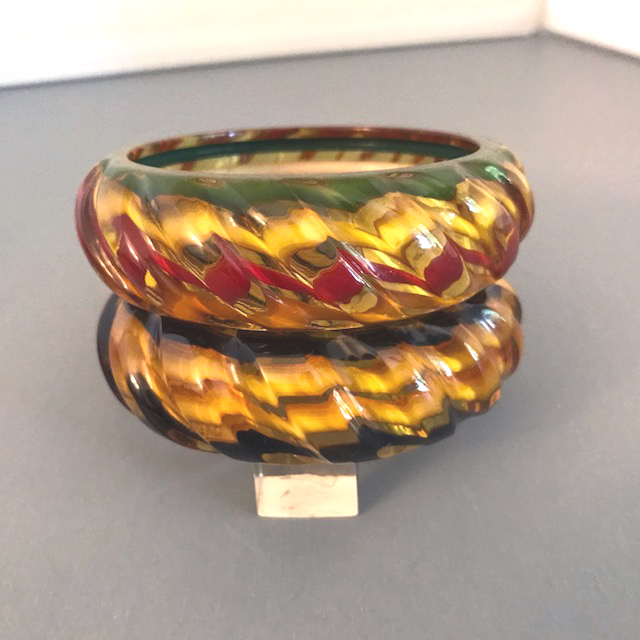 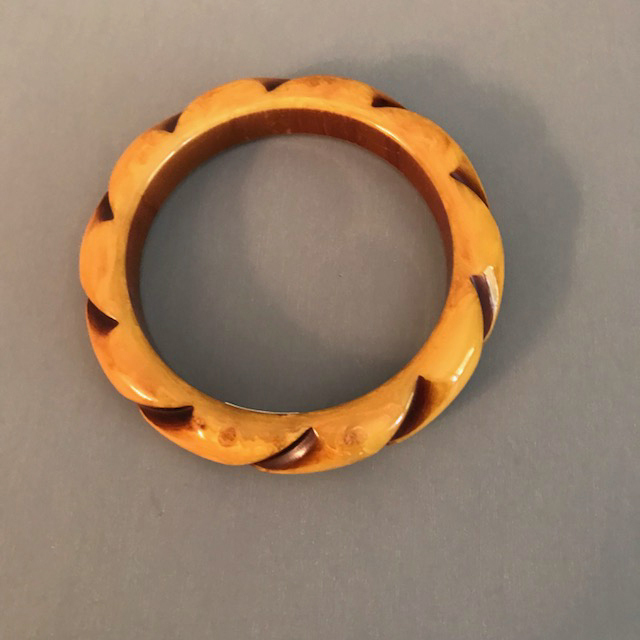 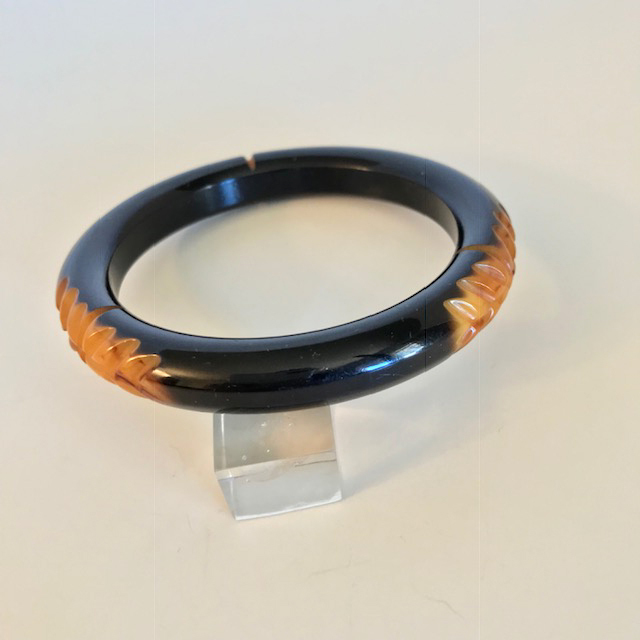 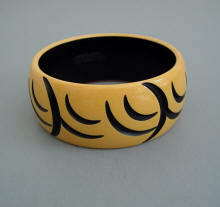 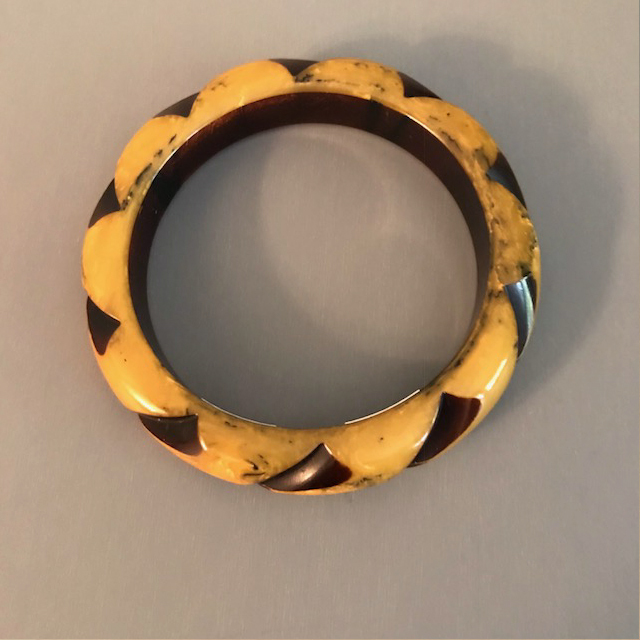 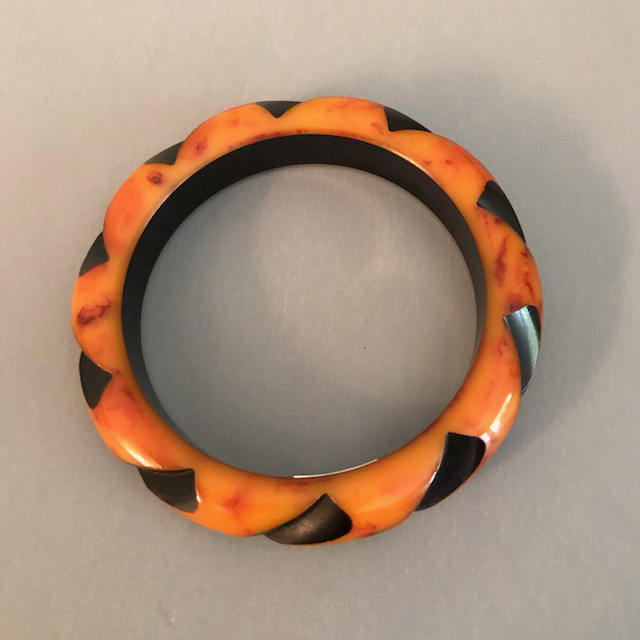 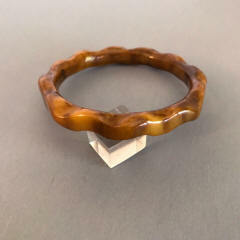 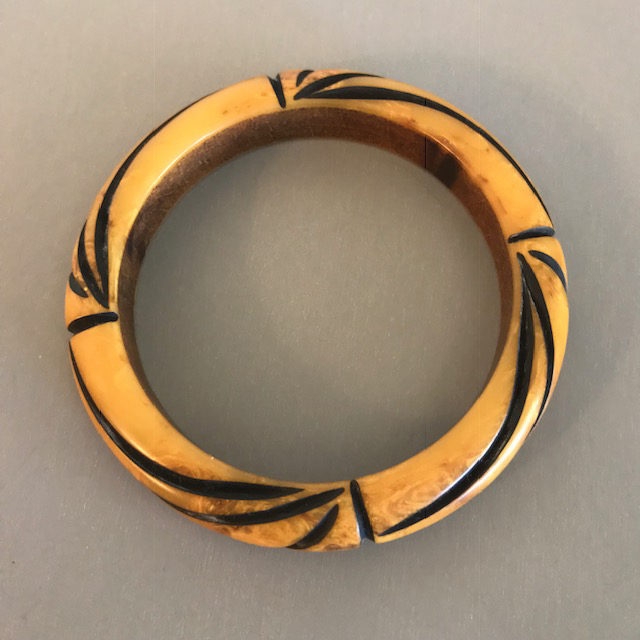 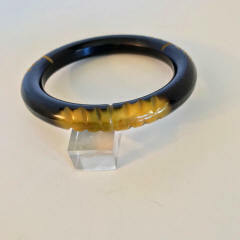 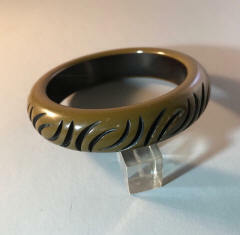 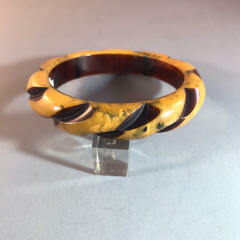 BAKELITE butterscotch and black resin washed carved bangle, 2-1/2" by 1/2" by 1/3" #B35360 BAKELITE carved and resin washed stack of bangles. 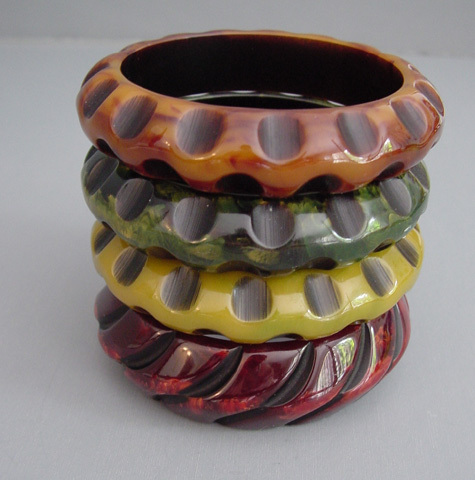 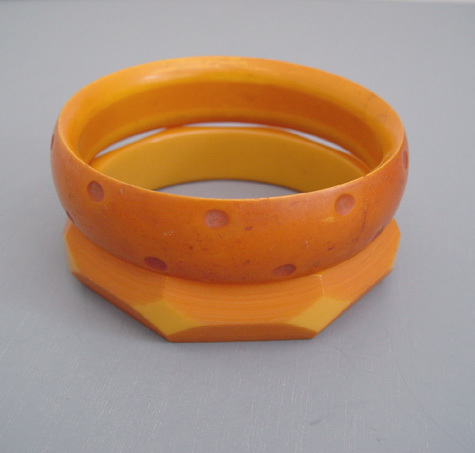 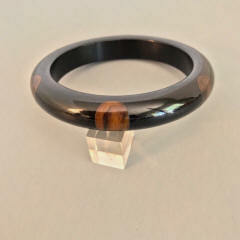 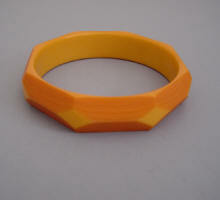 #B35360 BAKELITE bangle stack. 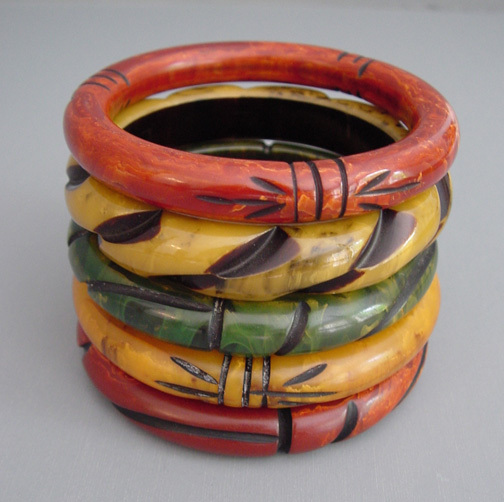 BAKELITE rope carved and resin washed or overdyed bangle stack. 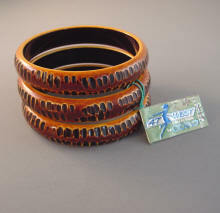 BAKELITE rope carved overdyed bangle in a swamp color, 2-1/2" by 1/2" by 1/3". 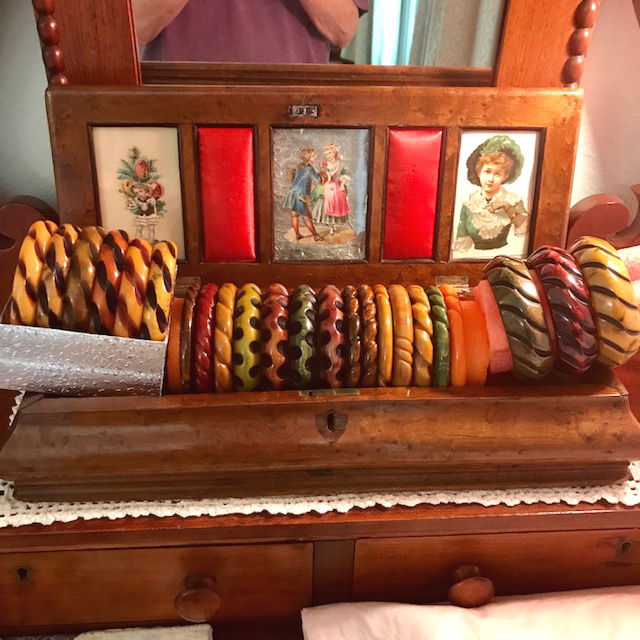 Circa 1940 and in excellent vintage condition. 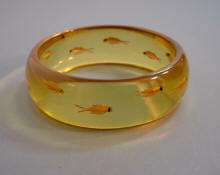 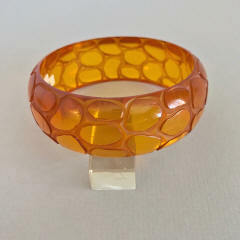 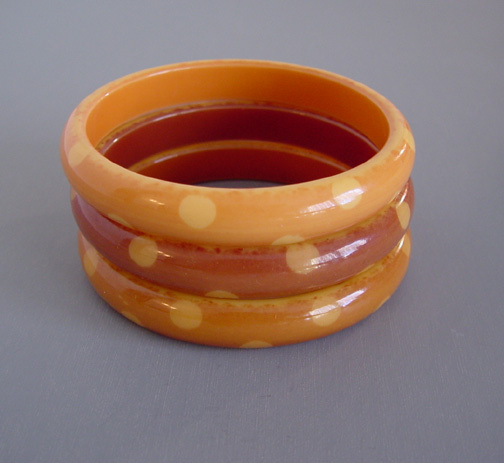 View View #B40314 BAKELITE over dyed or resin washed bangle stack. 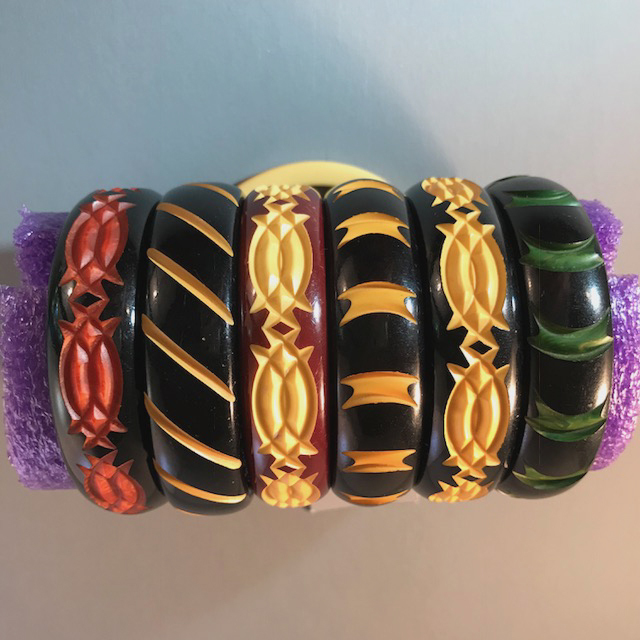 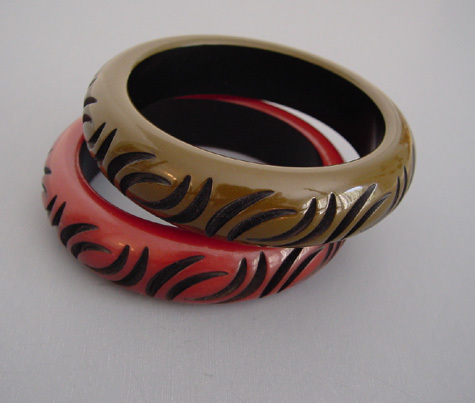 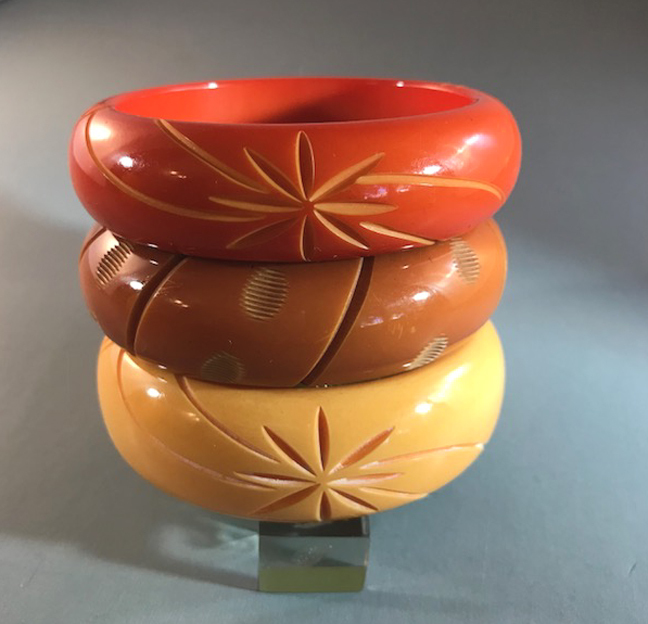 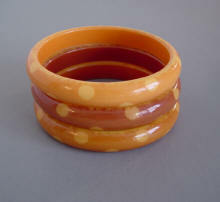 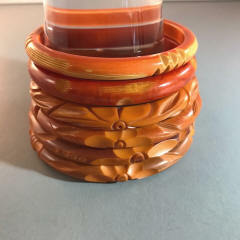 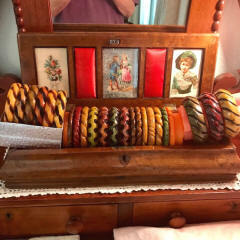 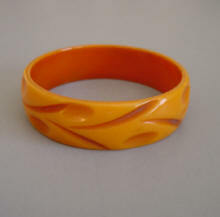 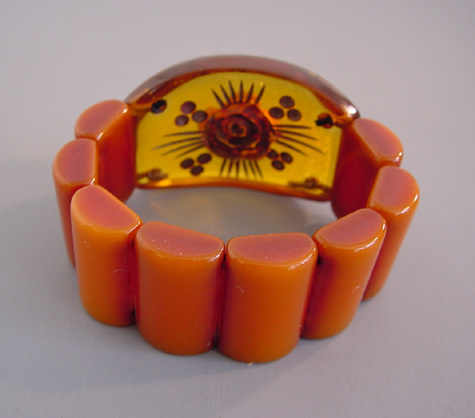 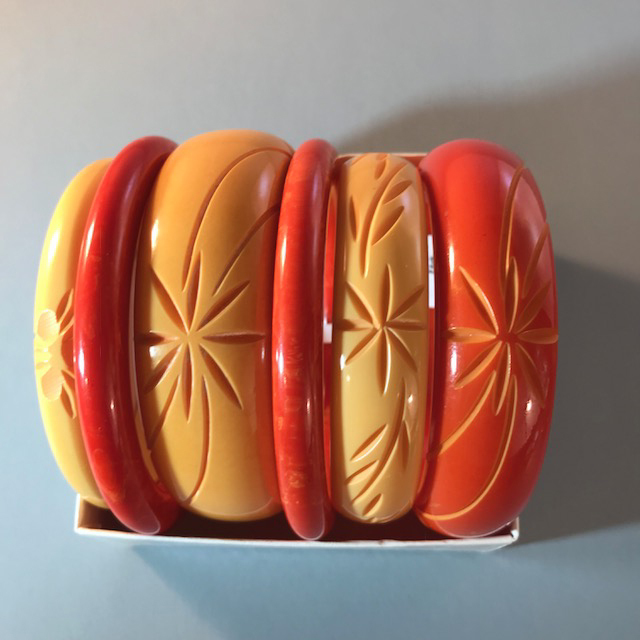 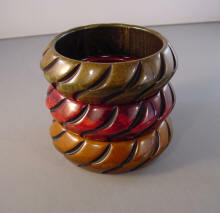 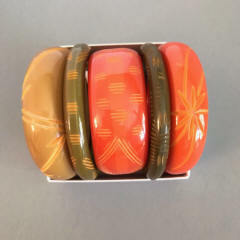 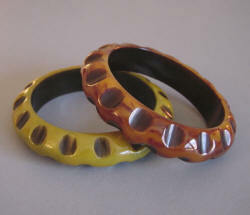 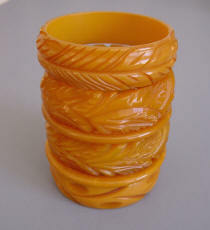 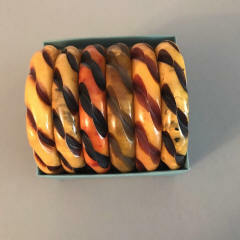 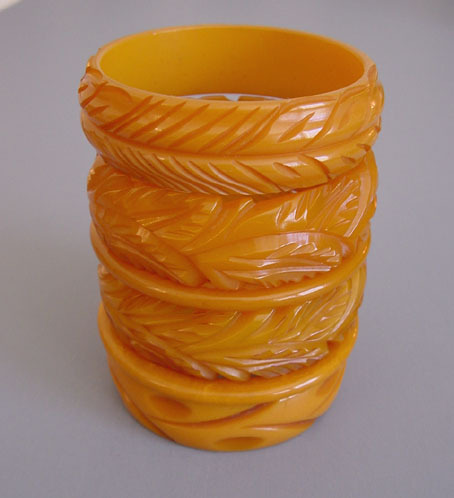 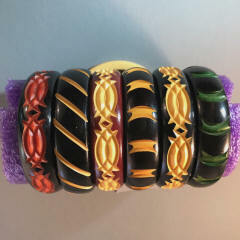 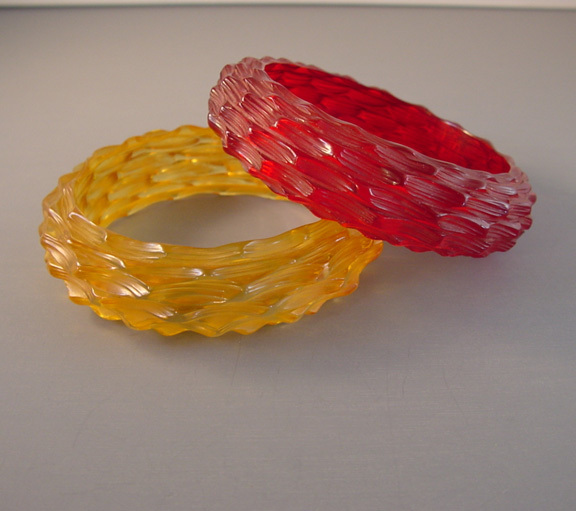 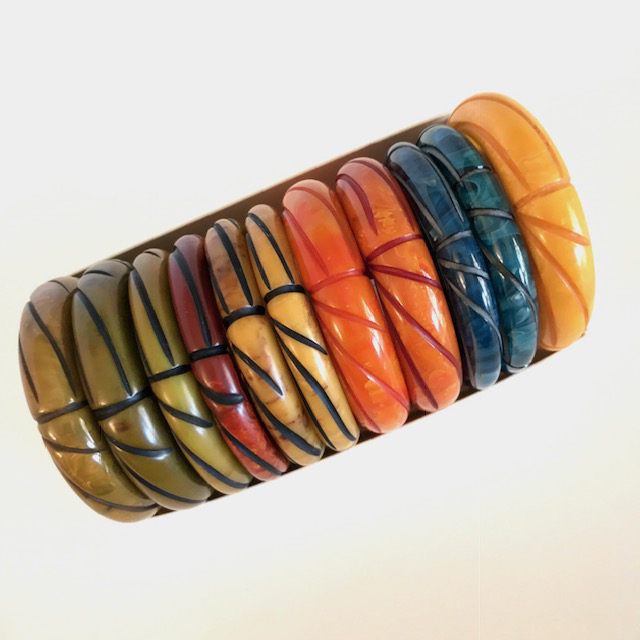 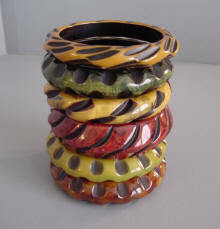 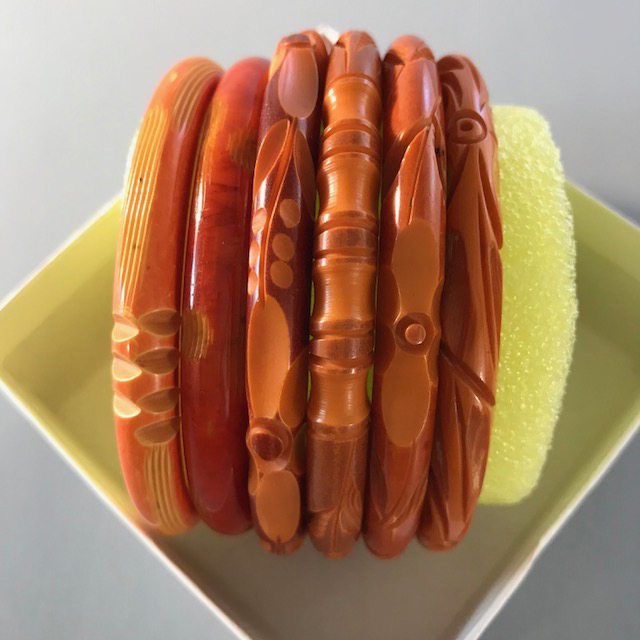 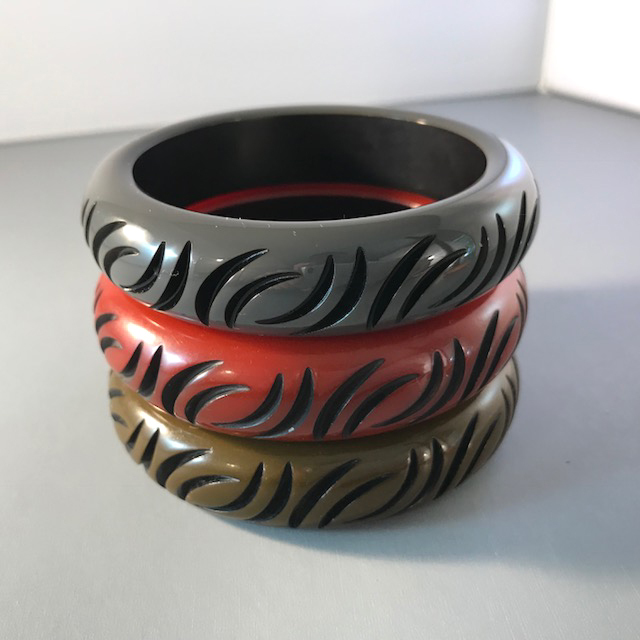 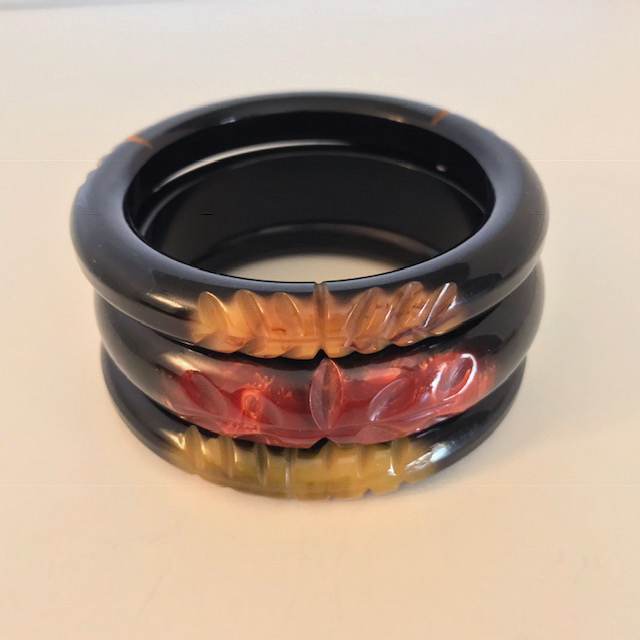 BAKELITE stack of over-dyed carved bangles. The blue one 4th from the left has been re-polished back to it's original 1940 era color. 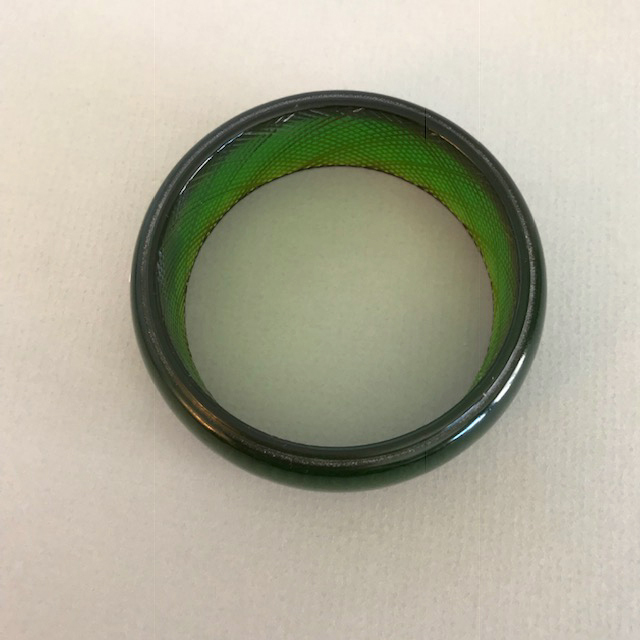 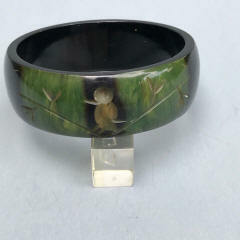 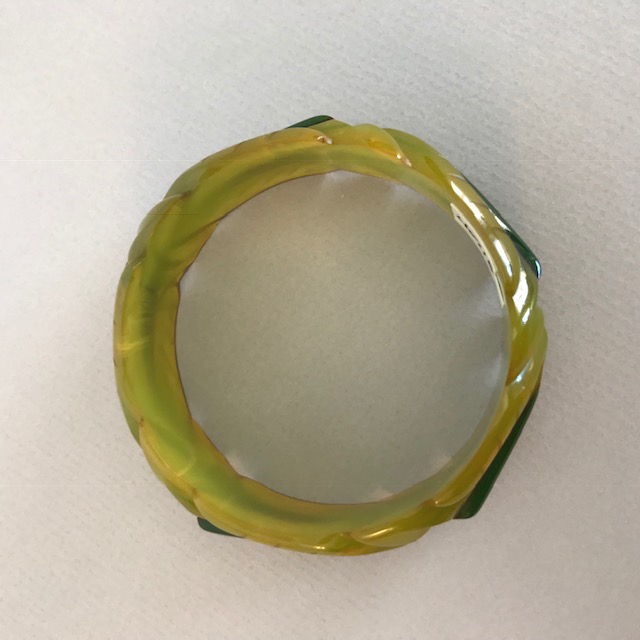 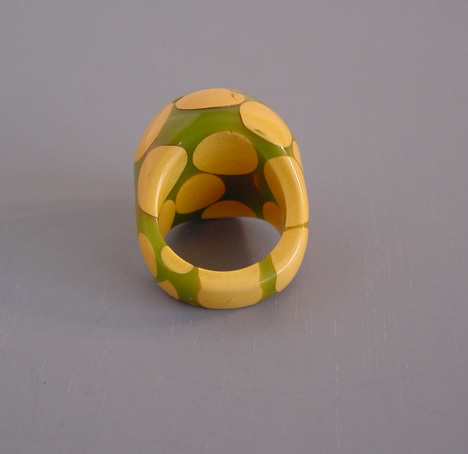 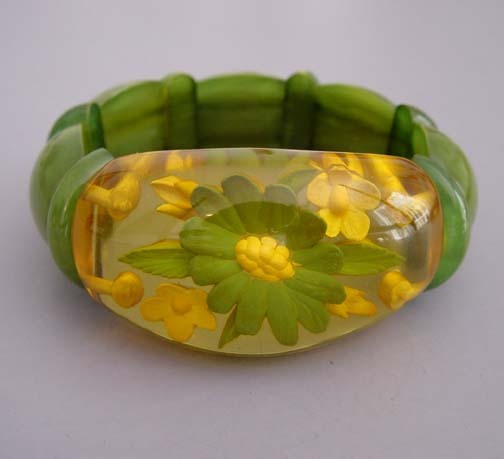 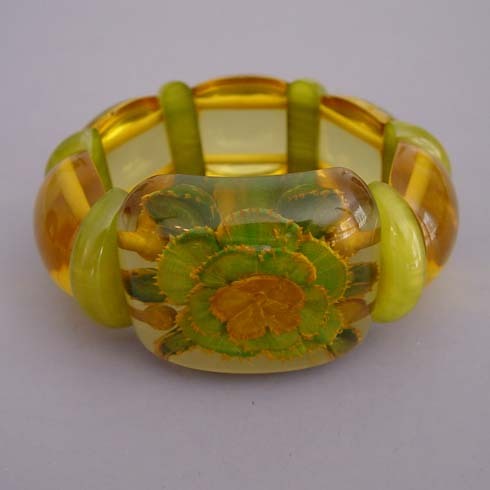 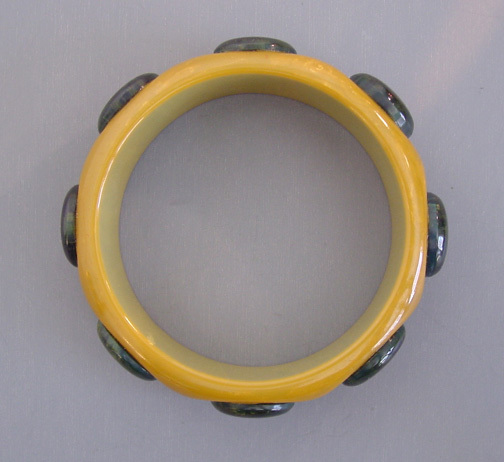 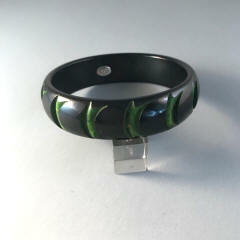 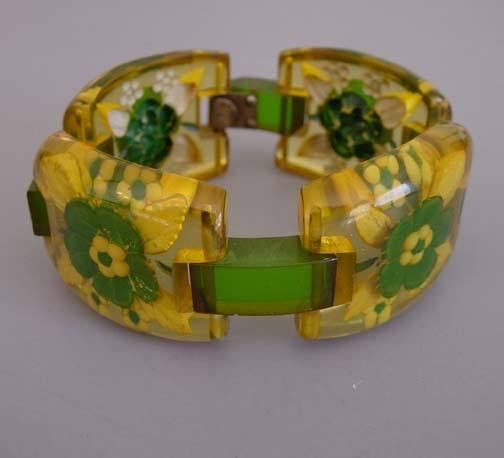 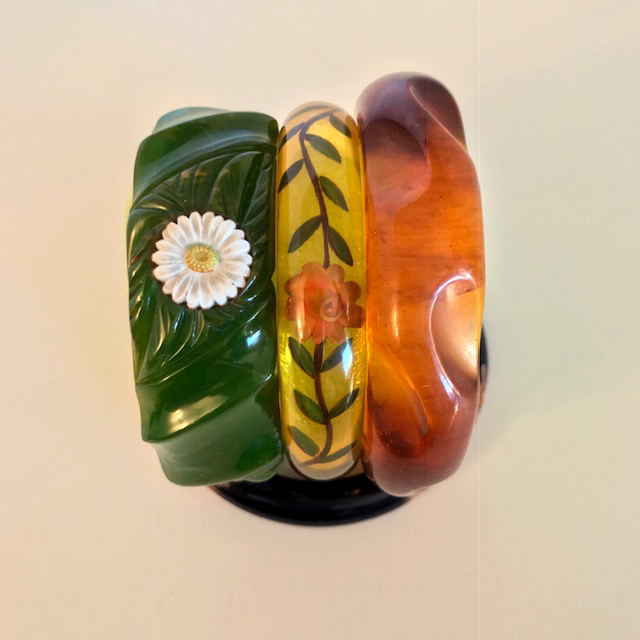 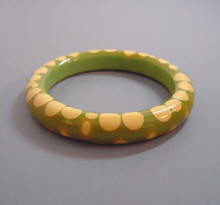 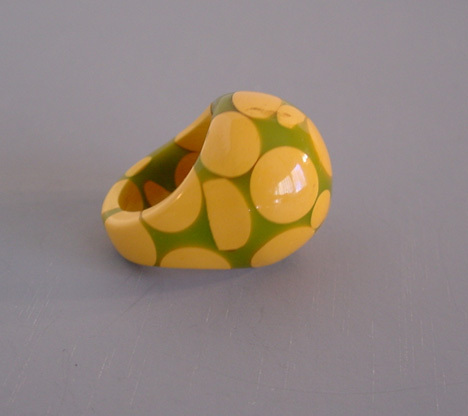 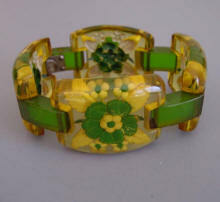 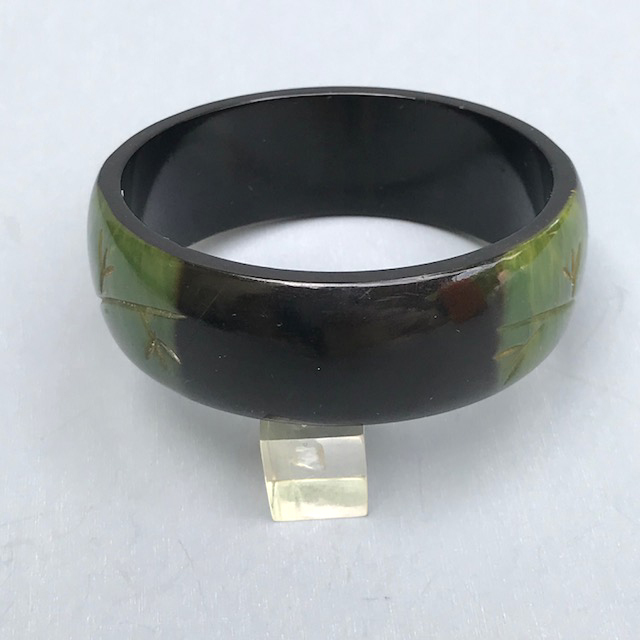 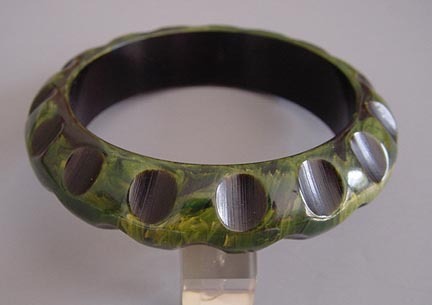 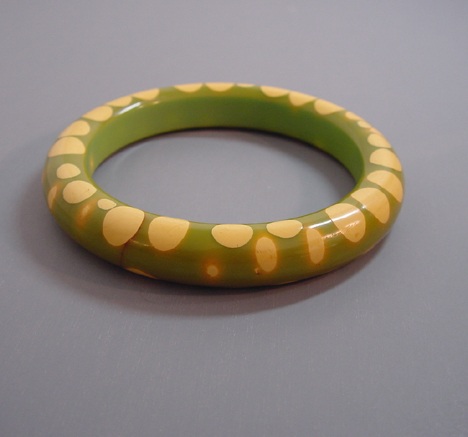 BAKELITE black overdyed bangle with three windows of carved marbled lime and yellow green ovals, 2-1/2" by 1/2" with 1/3" walls. View View View #B40519 BAKELITE stack. So many fun ways to wear the same bangles! 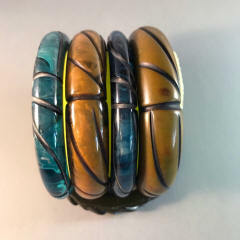 BAKELITE stack. 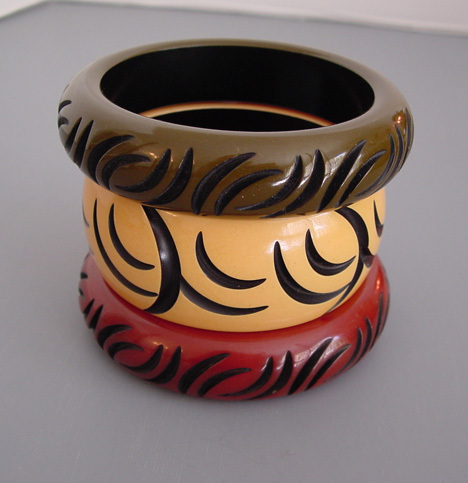 BAKELITE bangle stack. 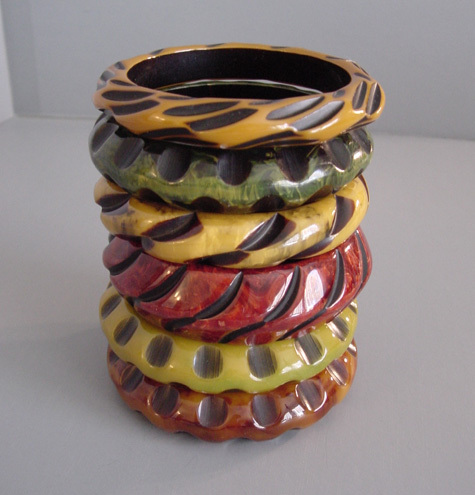 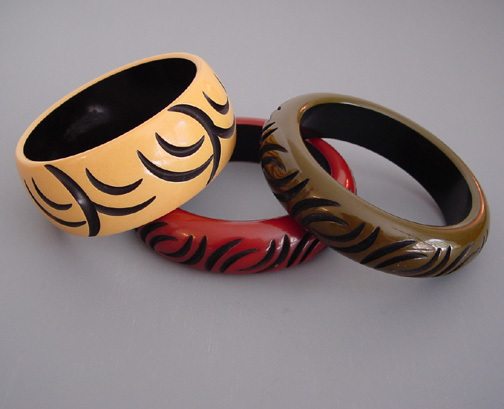 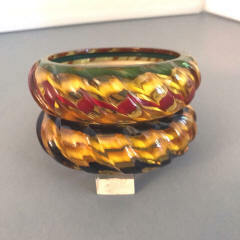 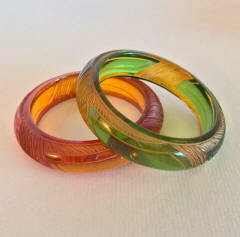 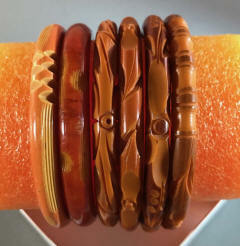 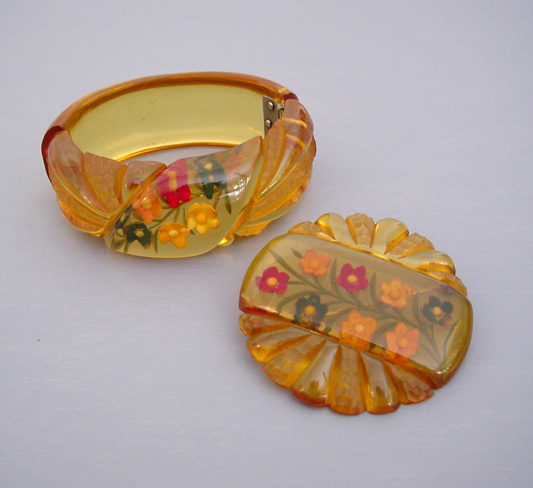 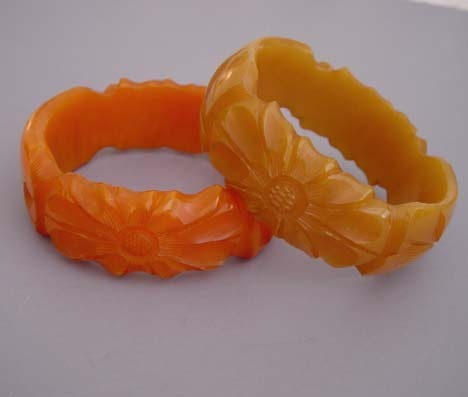 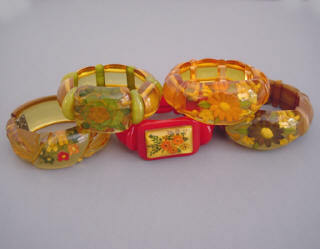 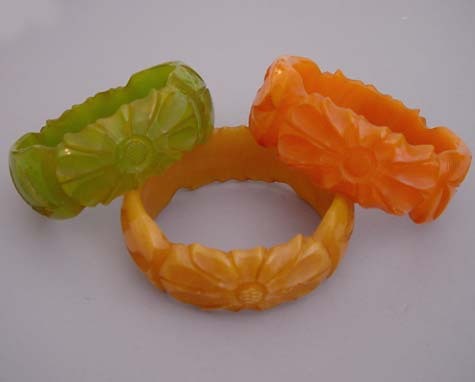 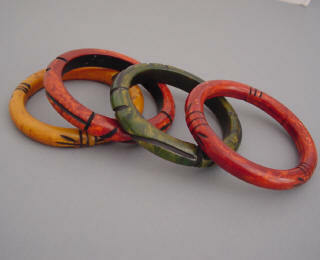 BAKELITE carved thumbprints bangle stacks.